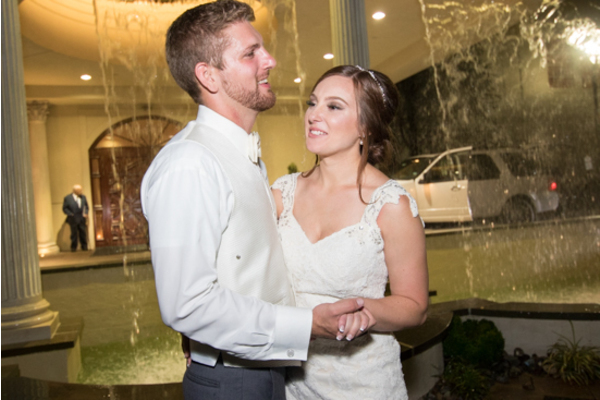 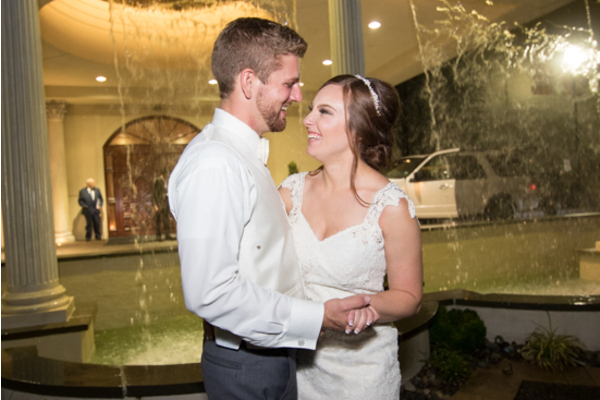 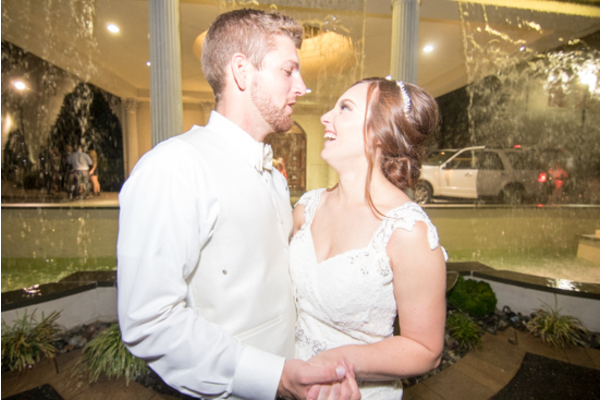 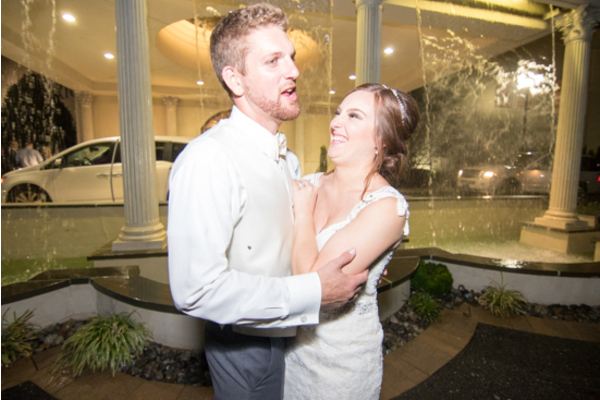 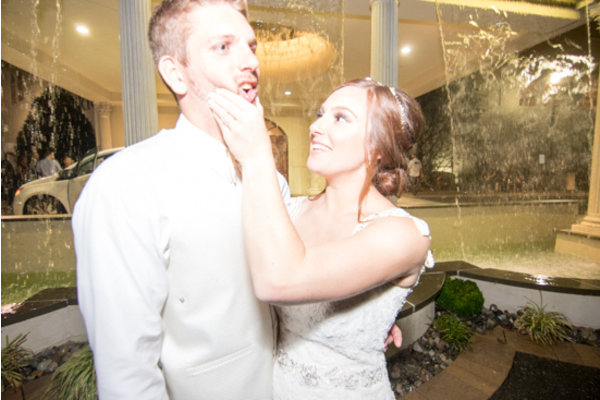 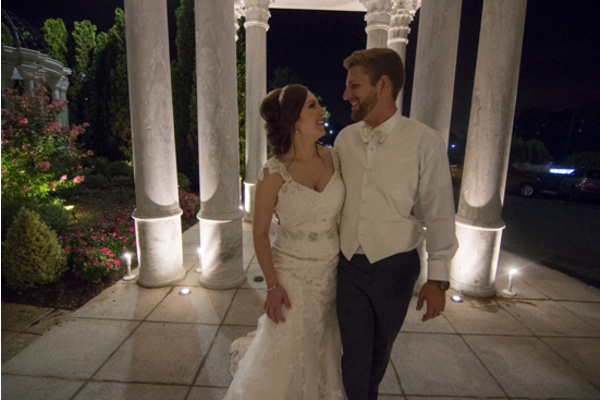 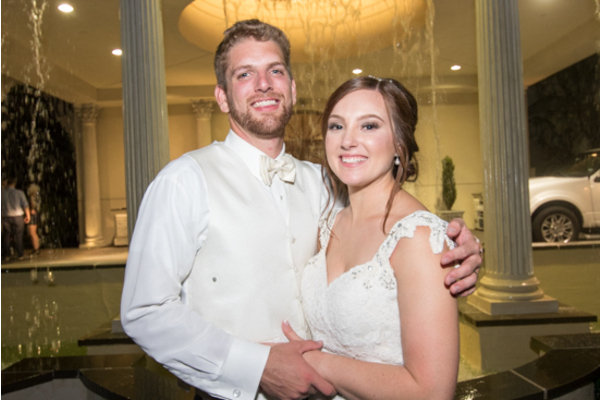 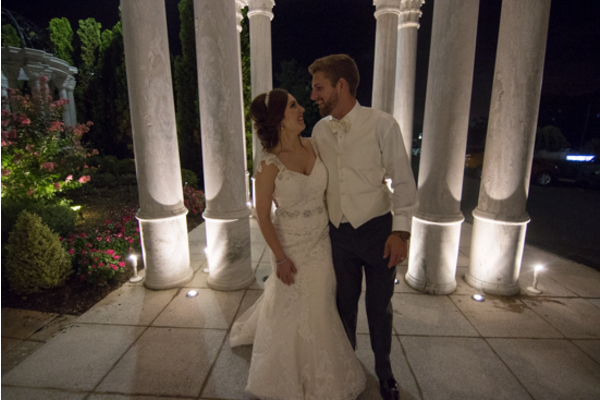 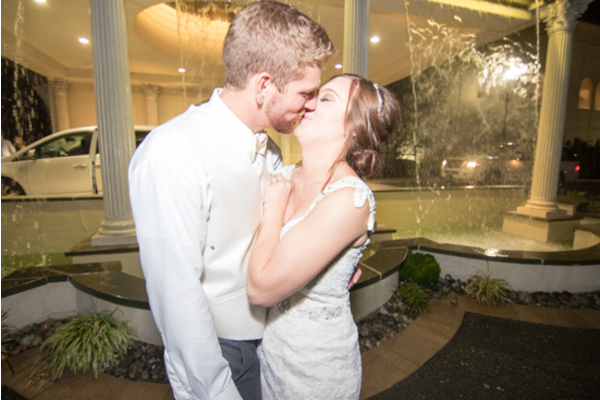 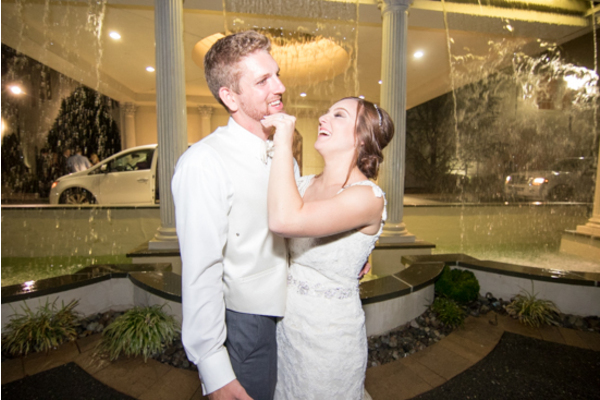 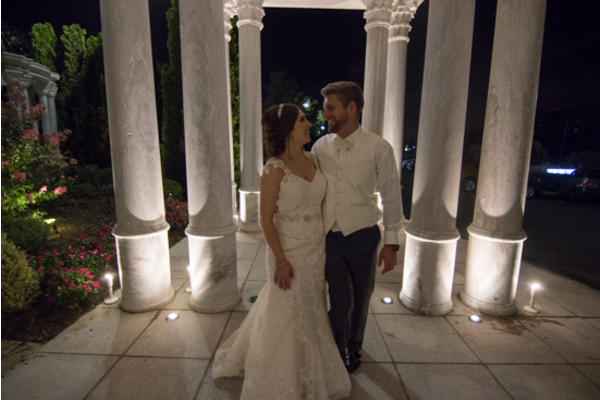 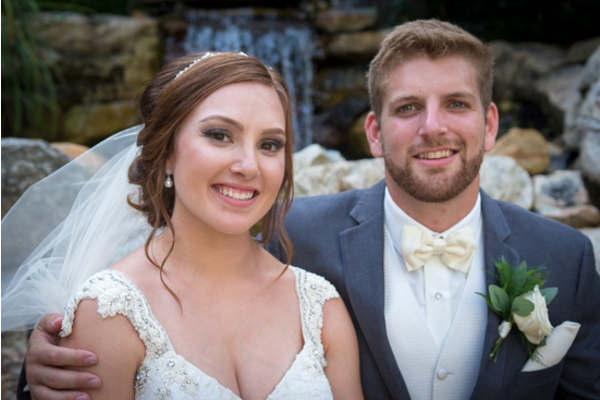 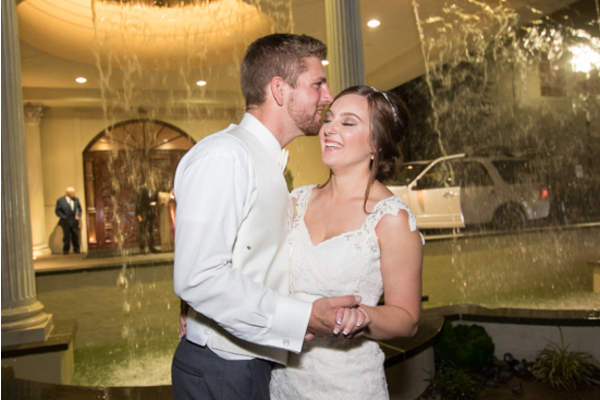 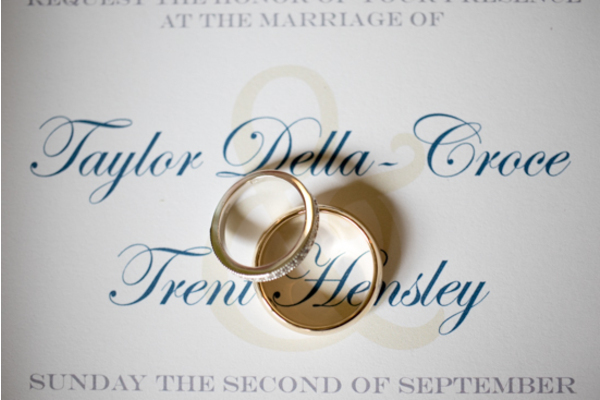 Congratulations to Taylor and Trent on their recent wedding! 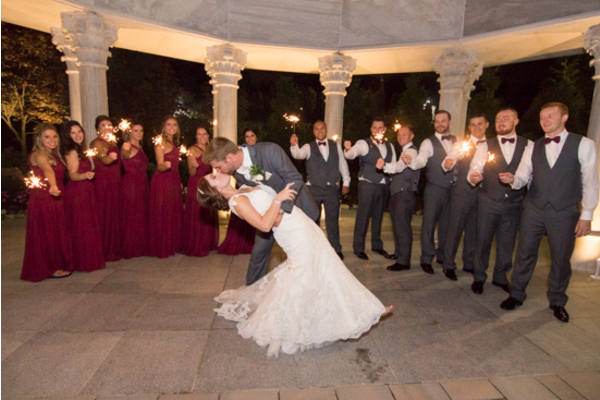 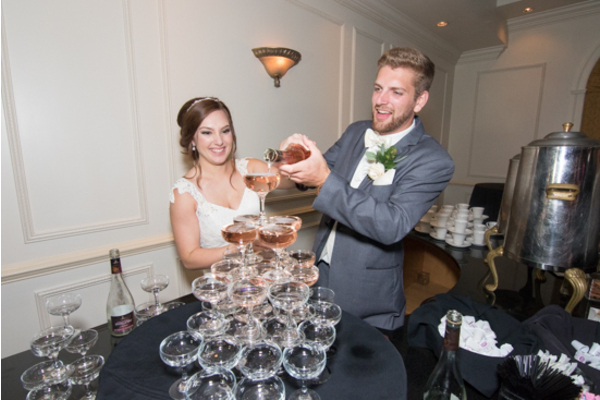 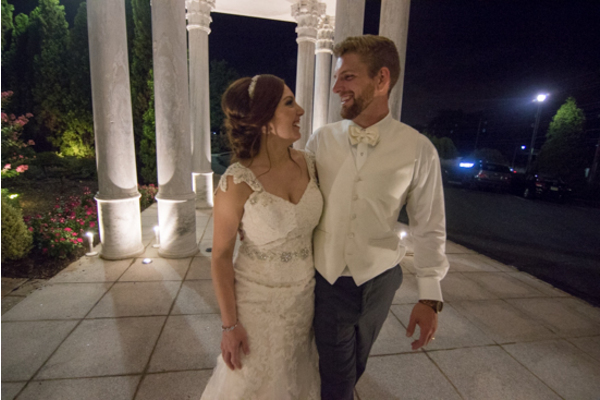 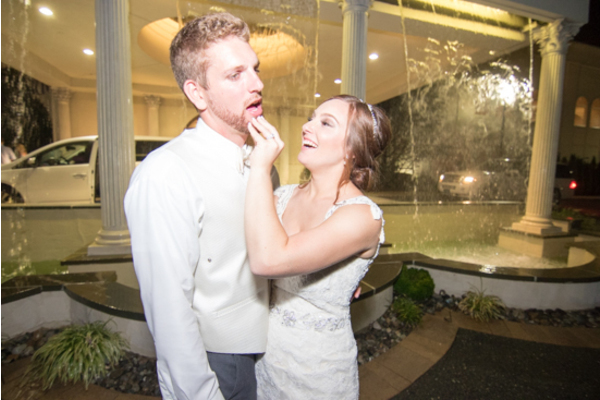 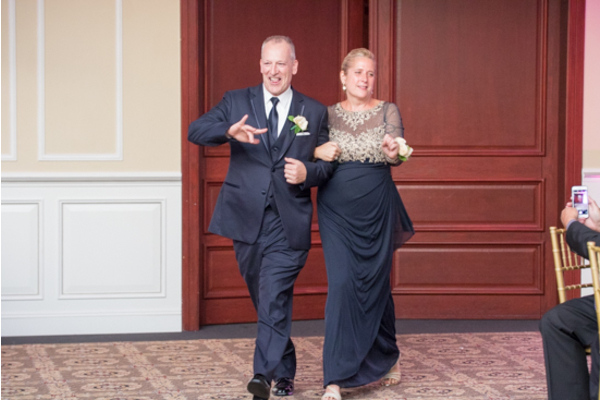 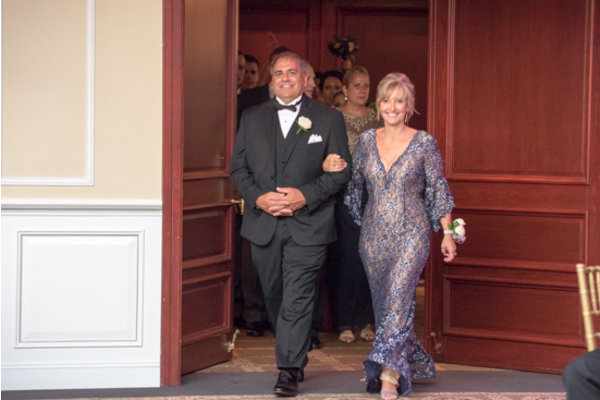 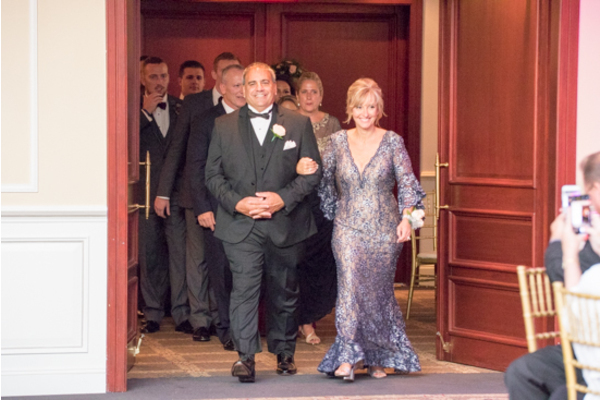 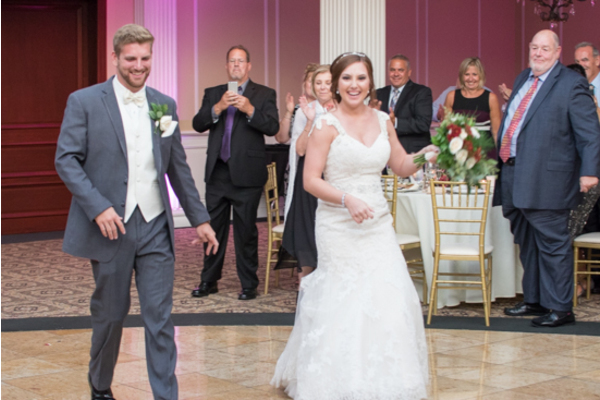 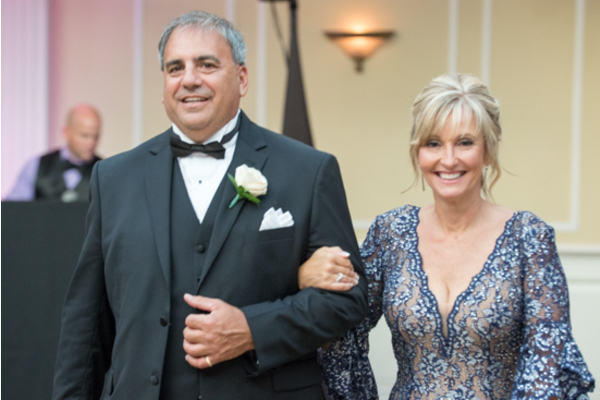 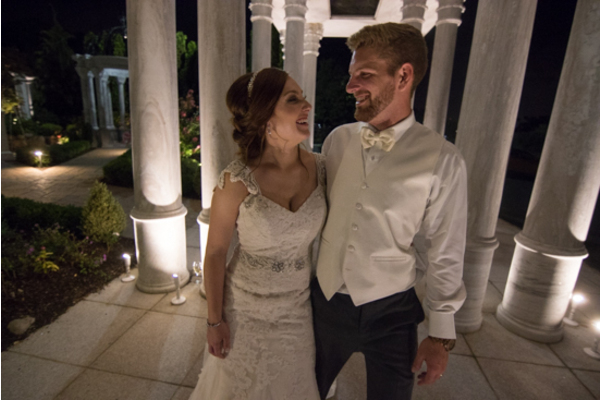 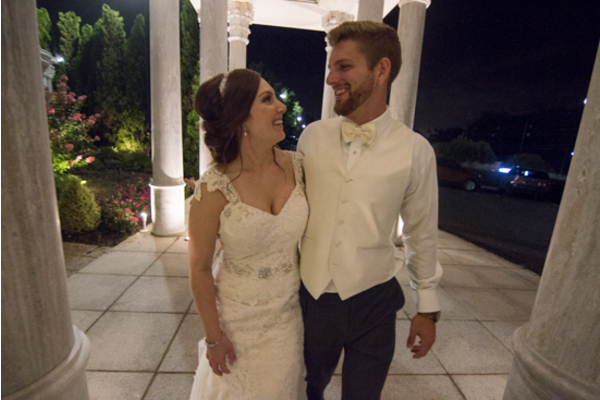 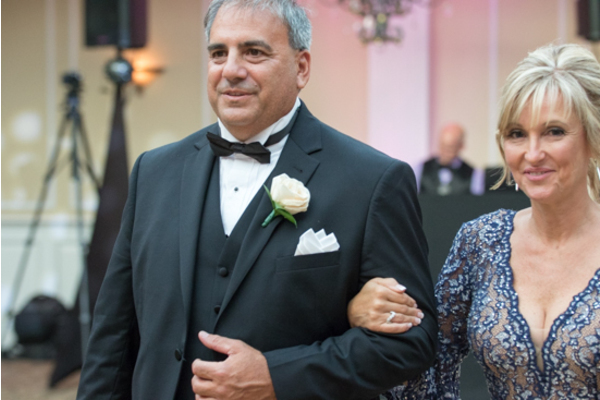 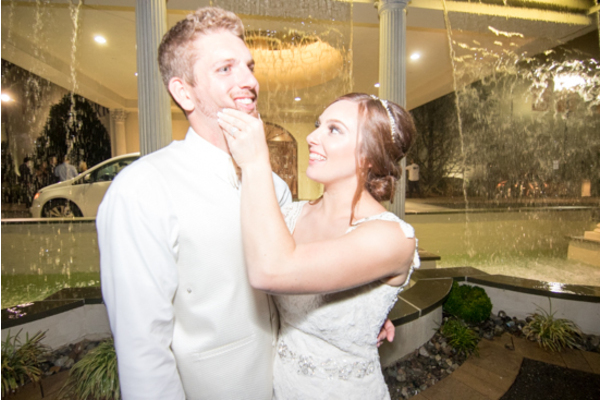 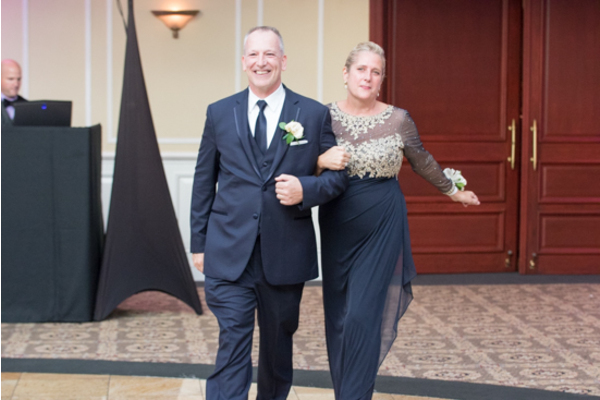 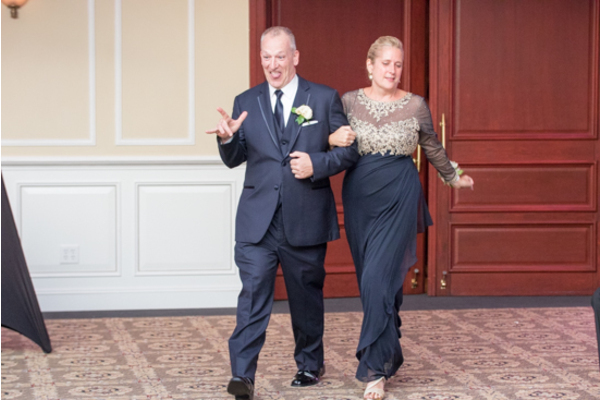 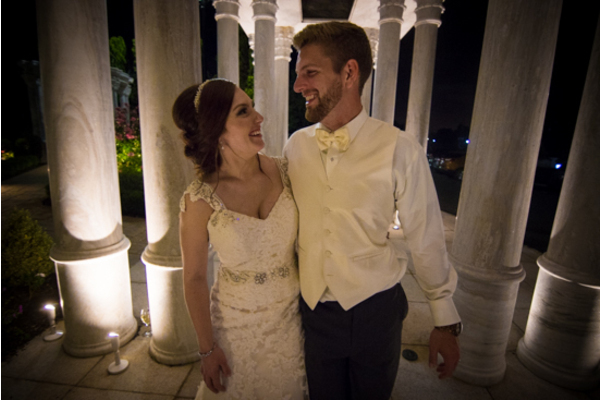 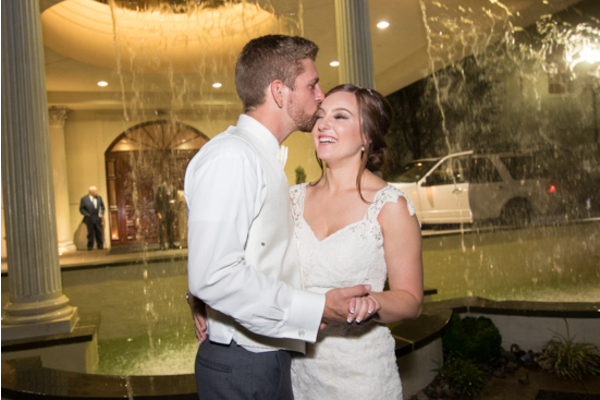 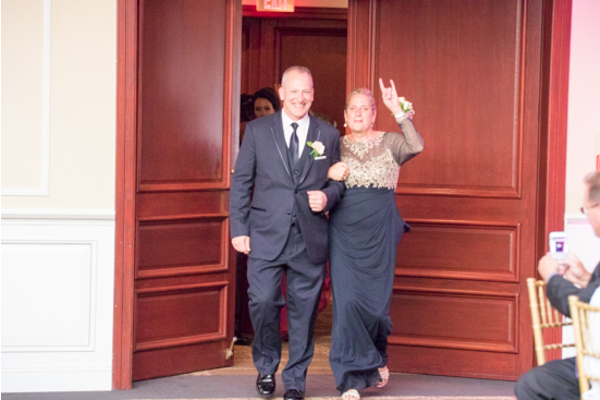 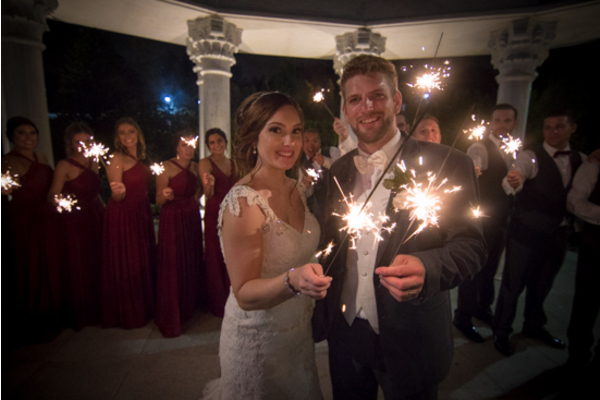 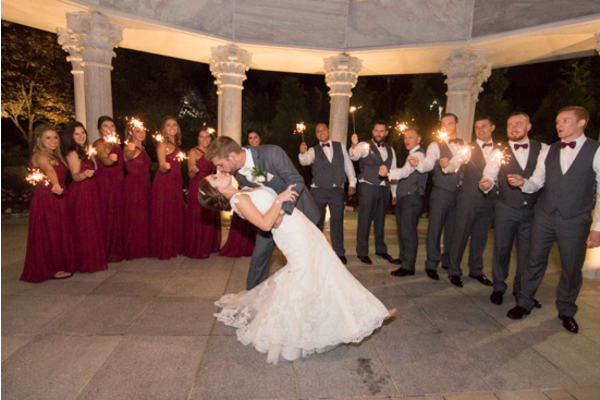 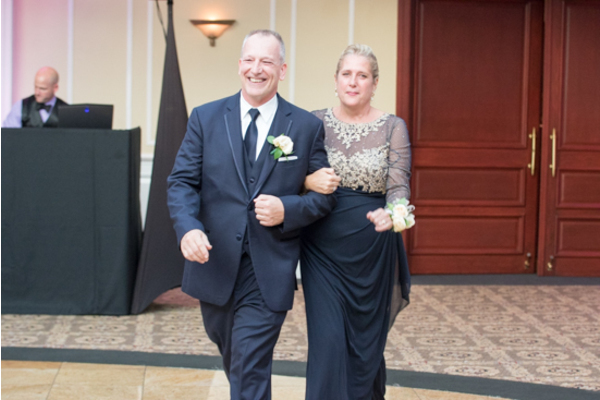 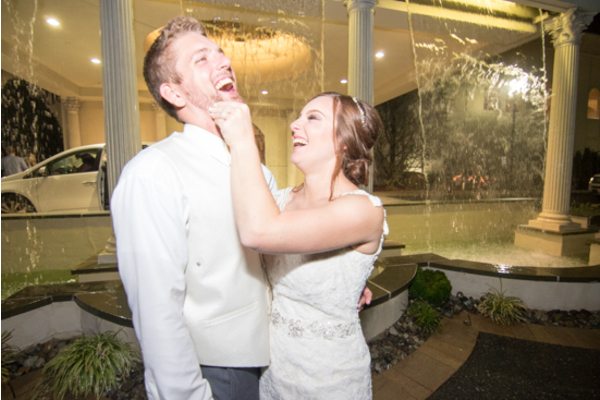 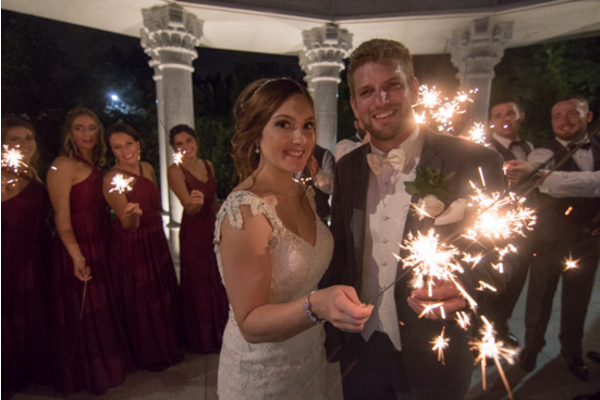 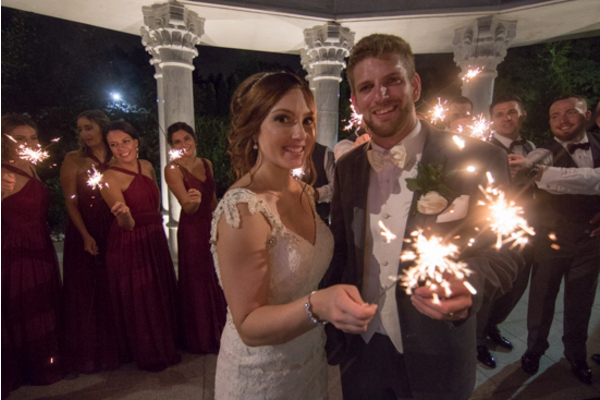 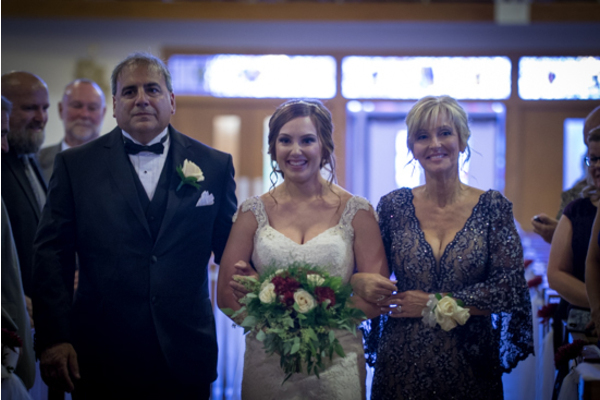 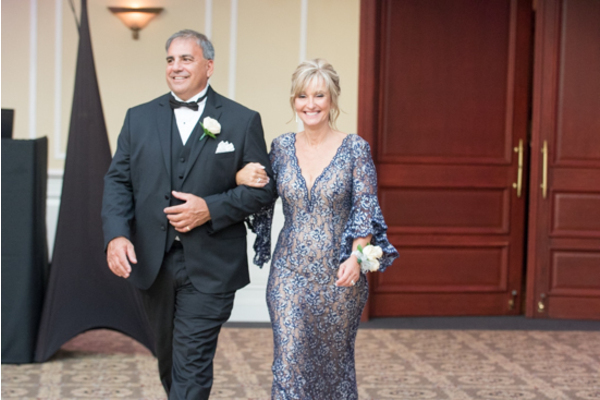 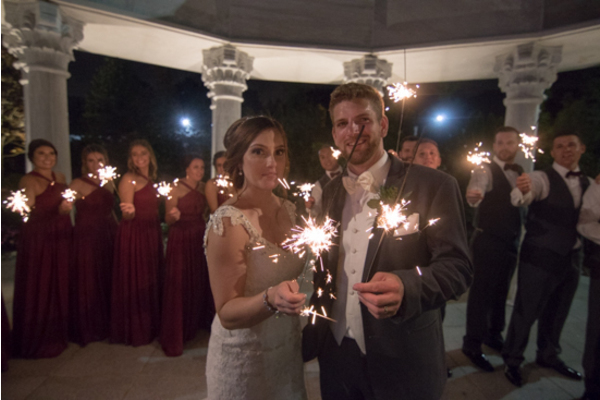 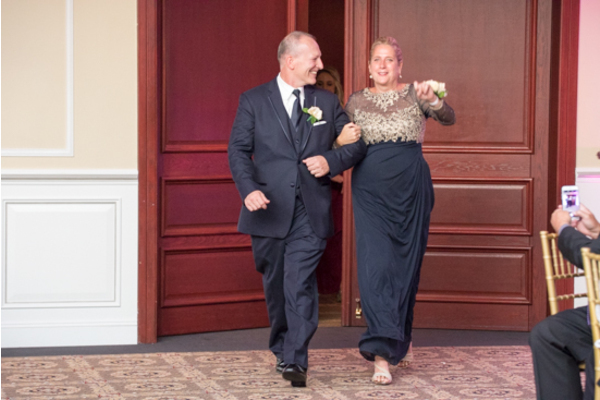 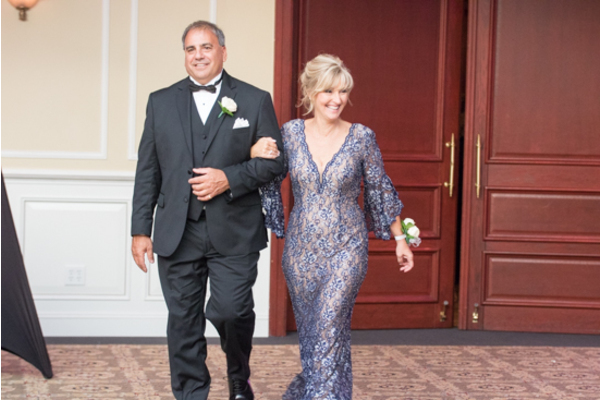 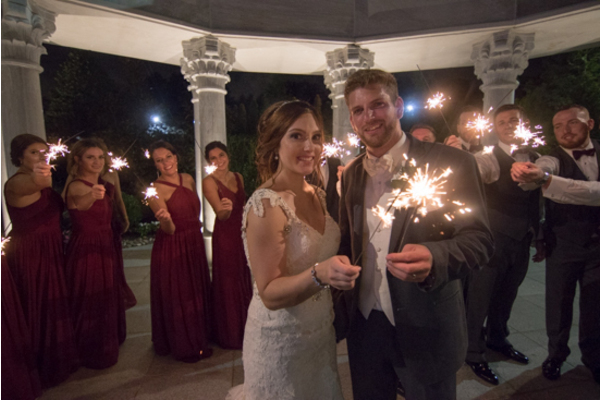 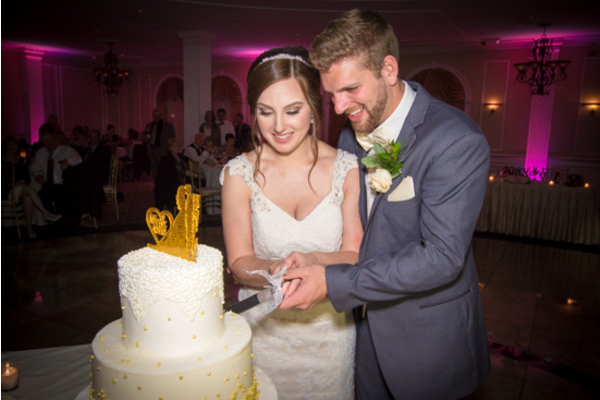 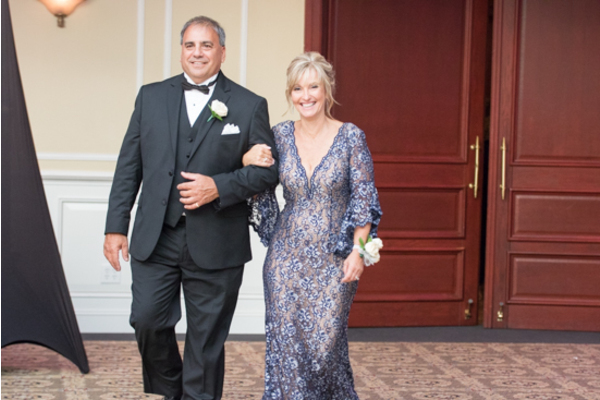 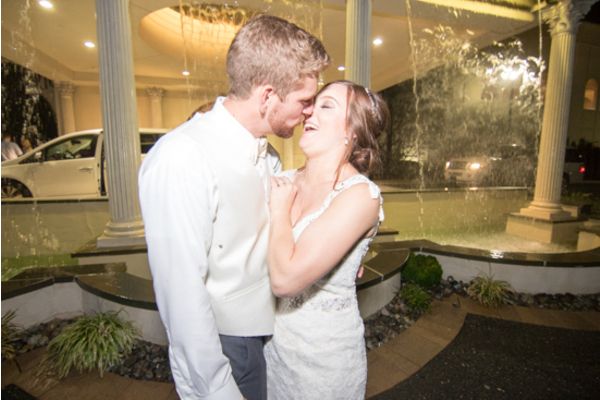 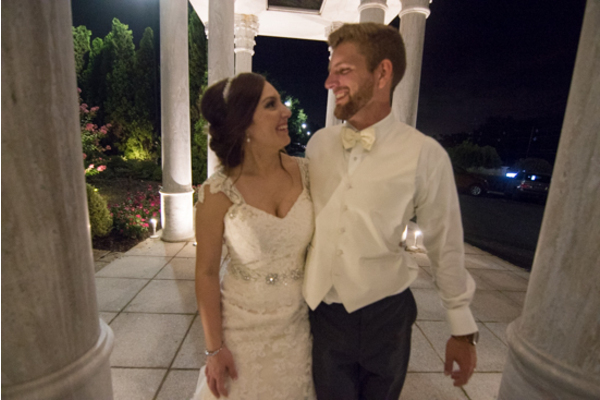 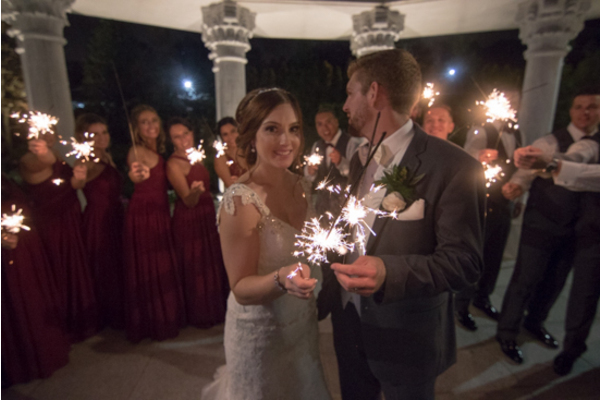 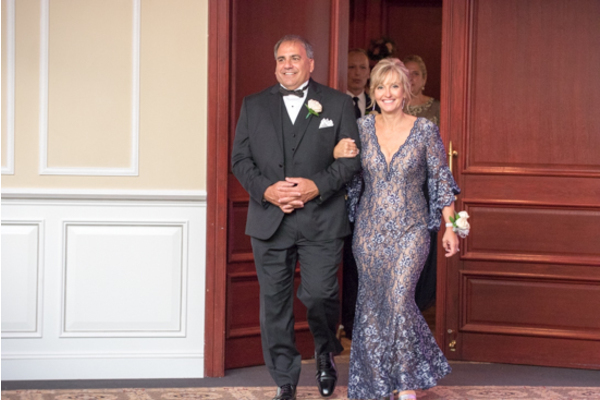 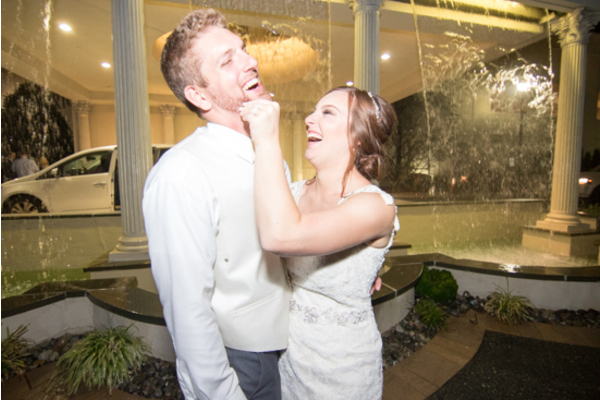 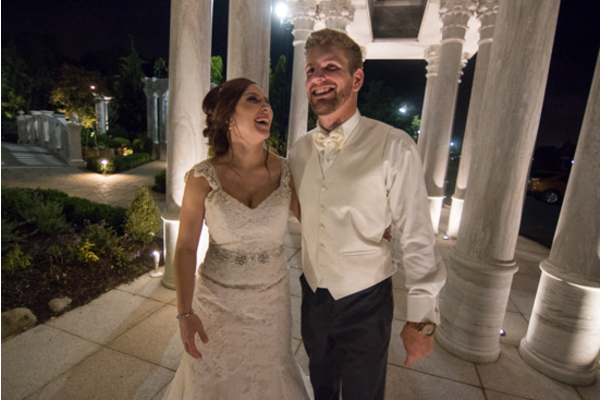 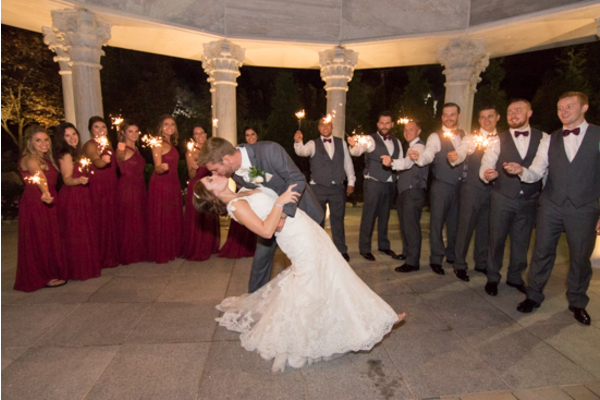 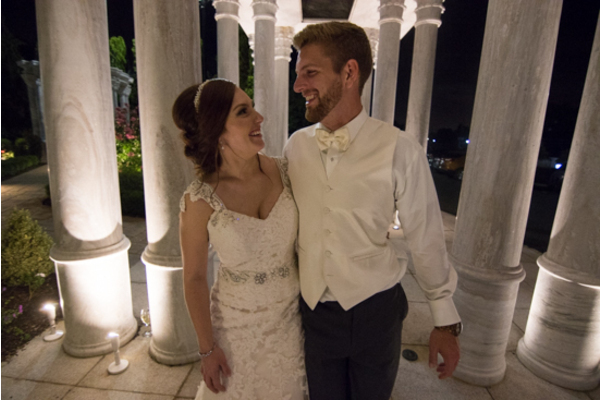 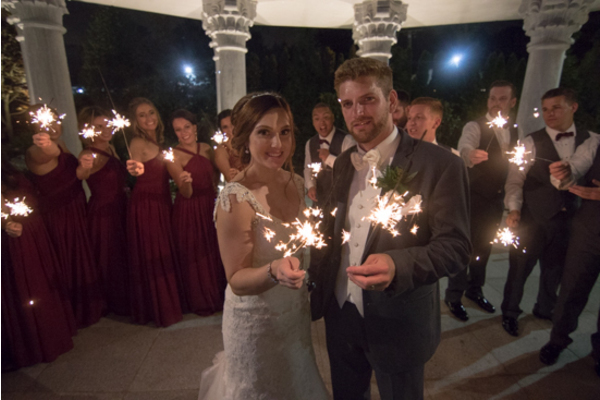 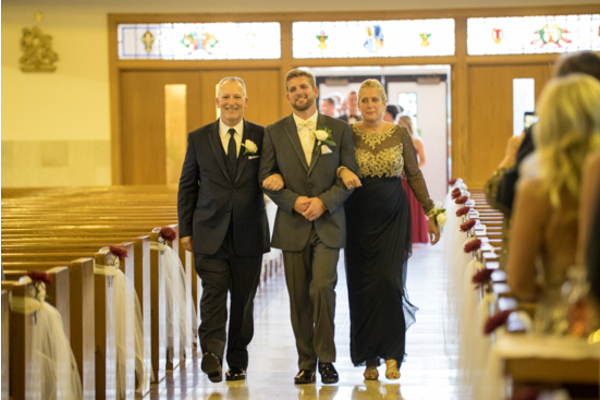 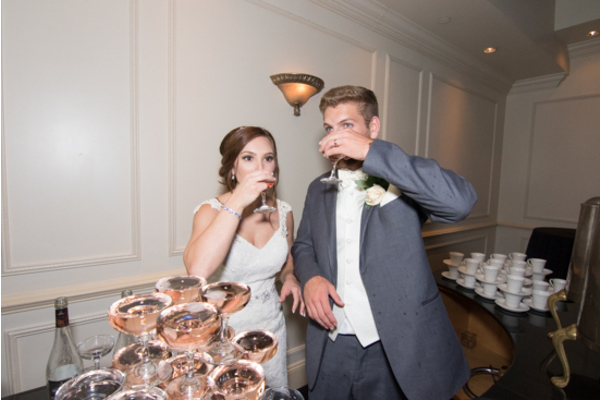 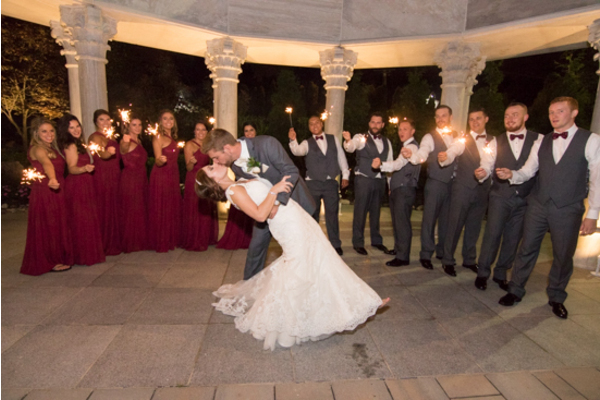 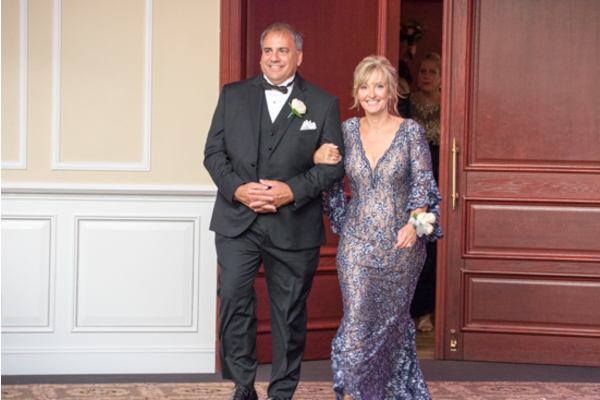 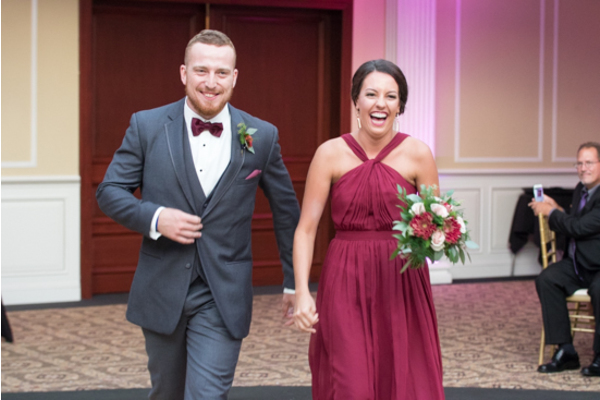 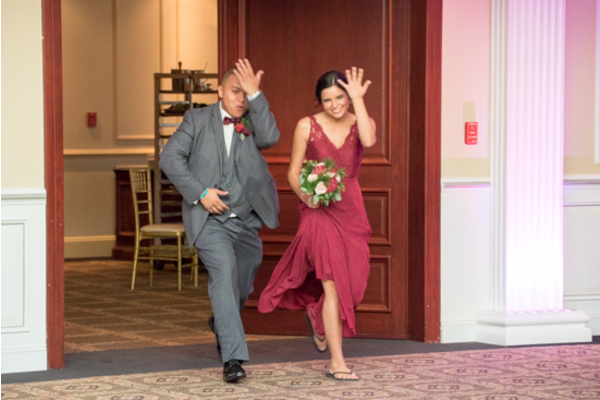 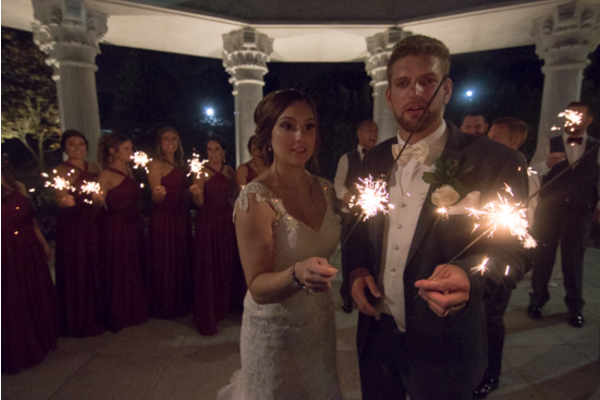 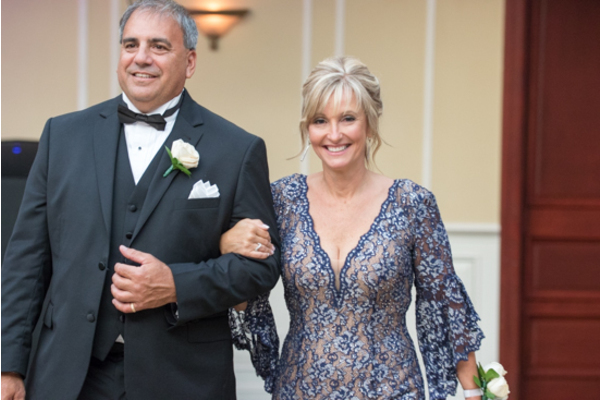 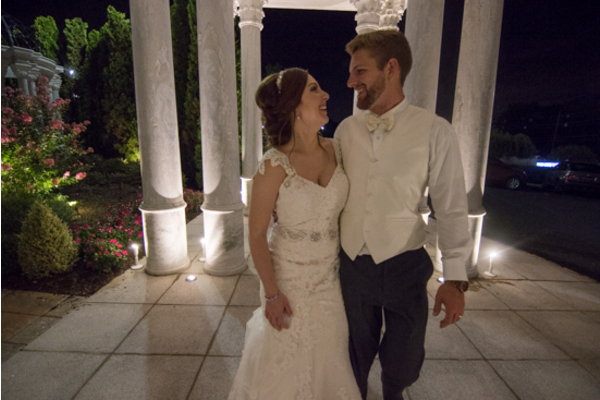 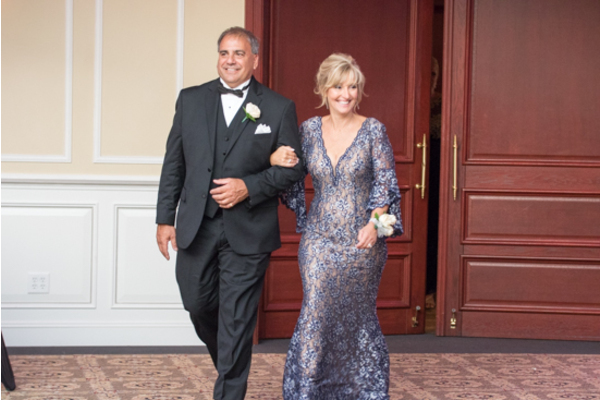 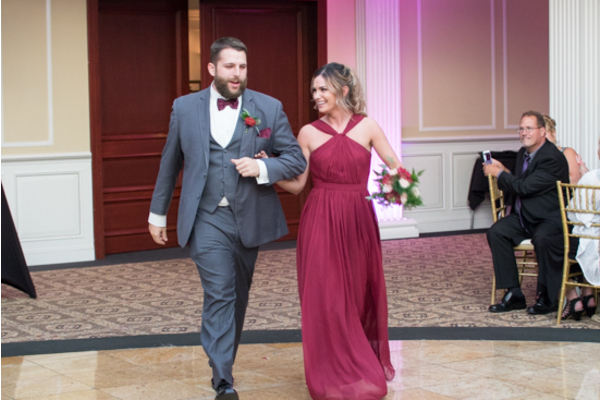 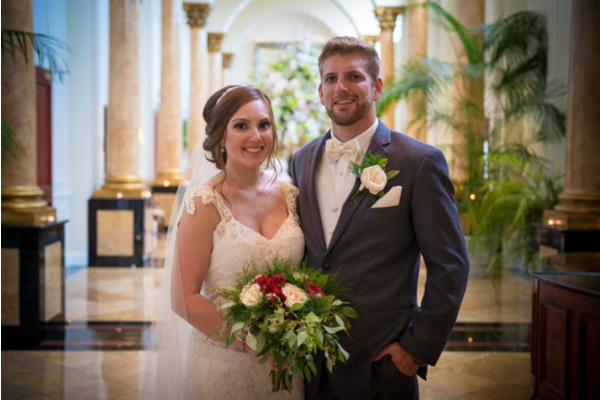 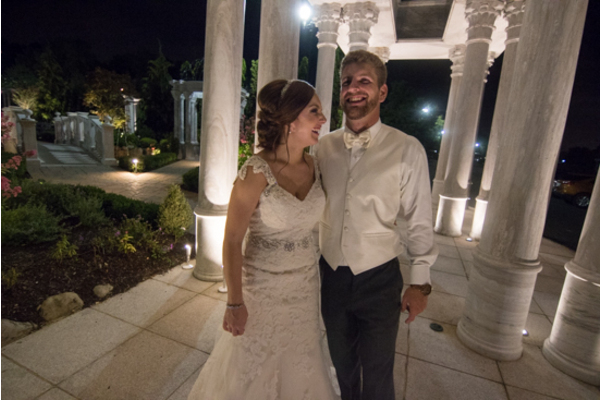 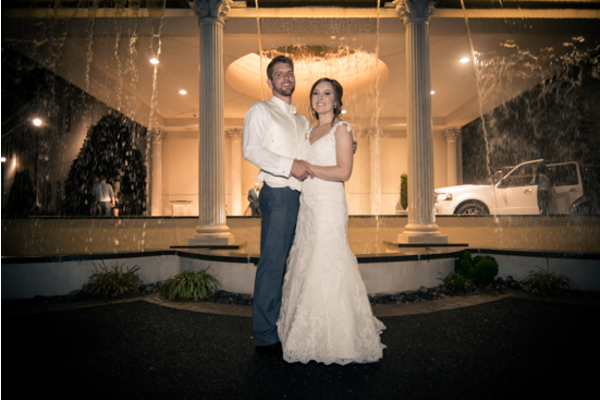 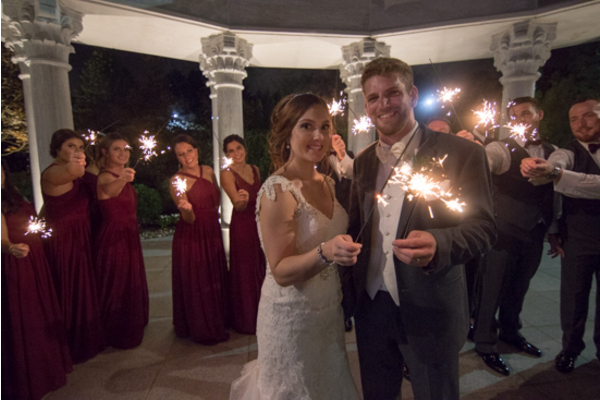 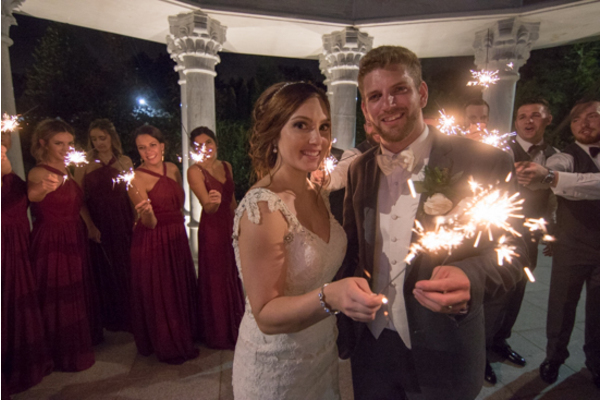 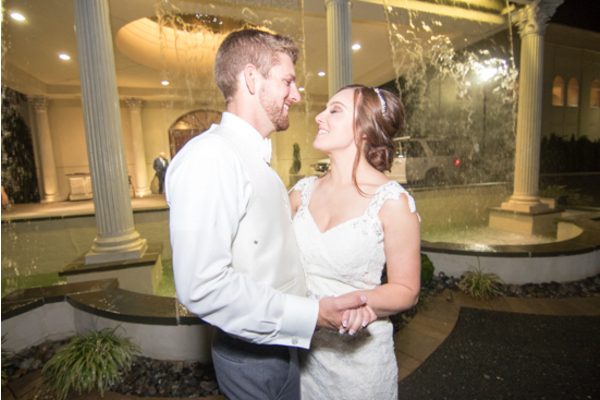 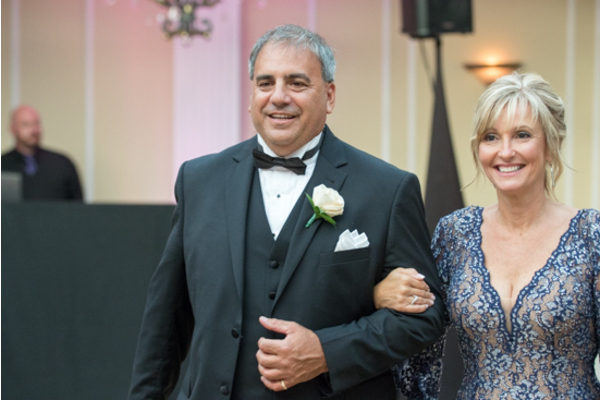 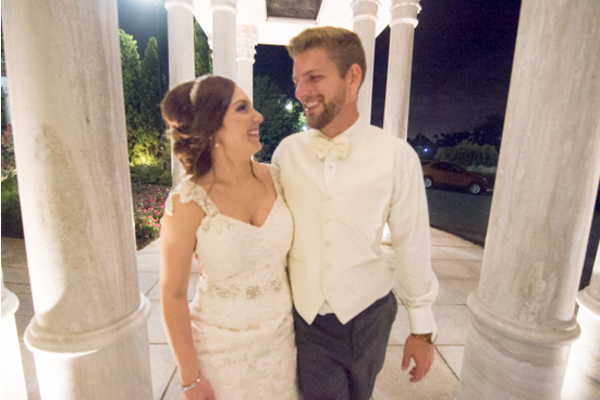 On September 2nd, 2018 this lovely couple tied the knot at The Merion in Cinnaminson, NJ. 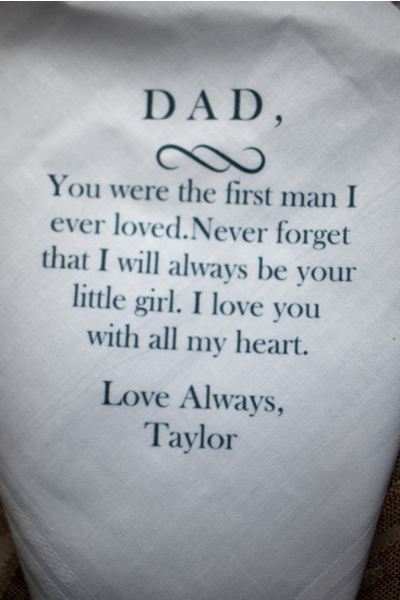 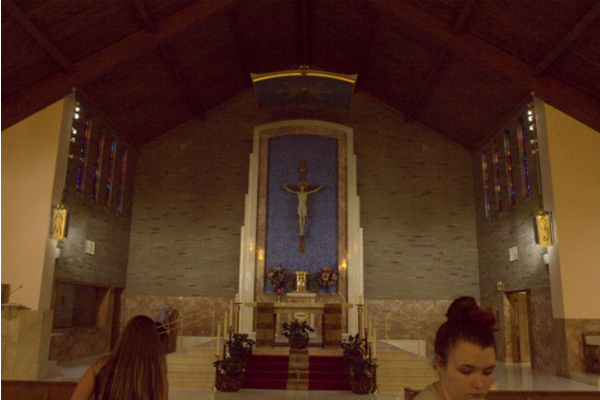 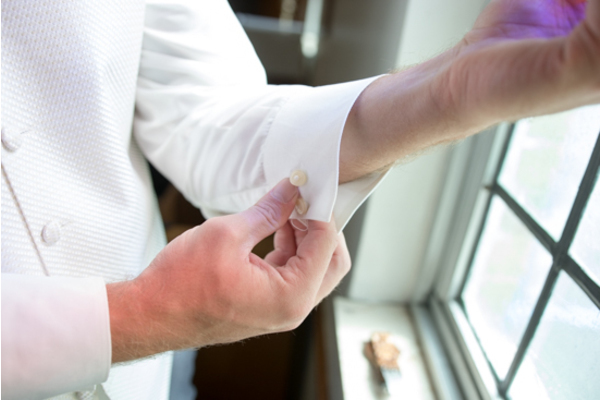 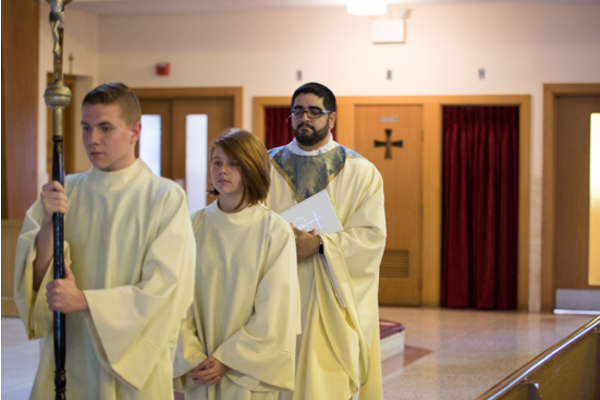 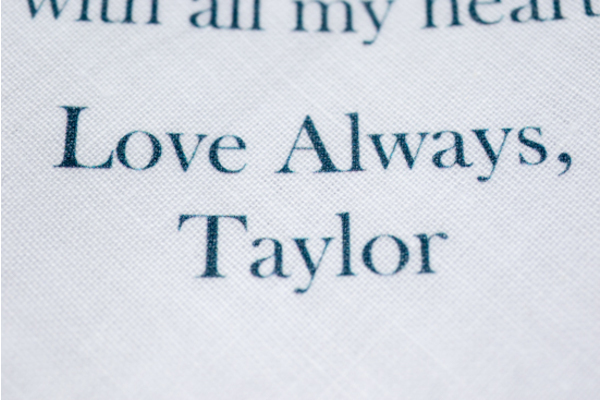 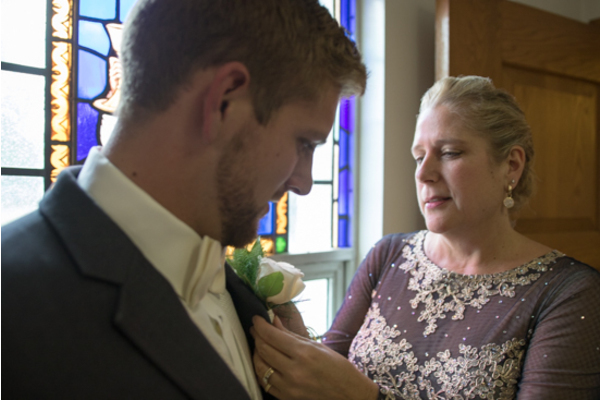 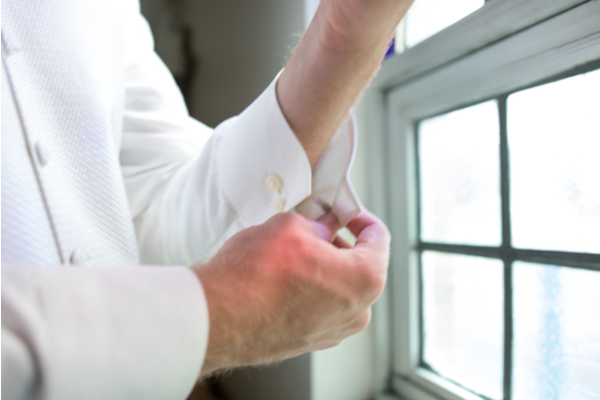 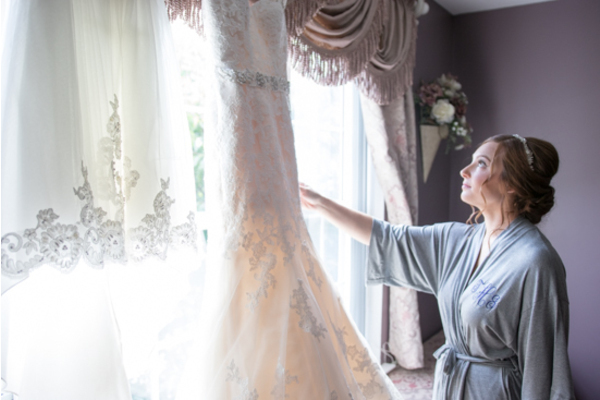 During the morning hours, Taylor got ready with the help of her family and friends. 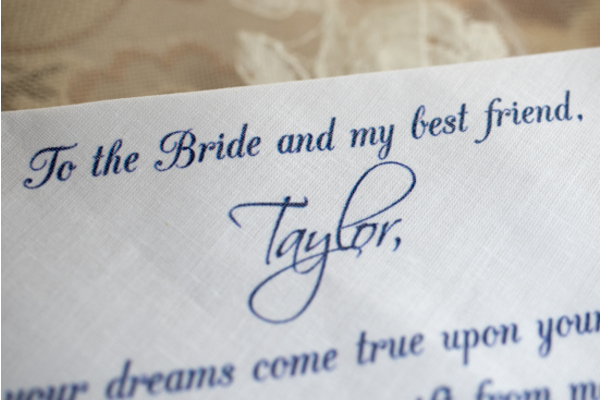 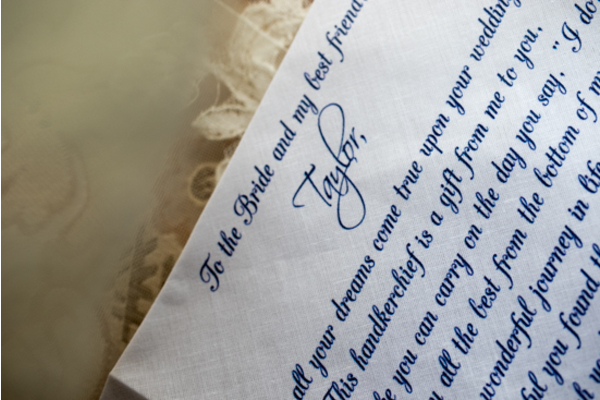 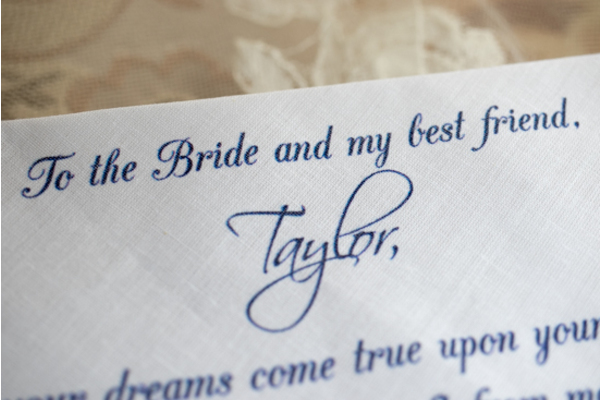 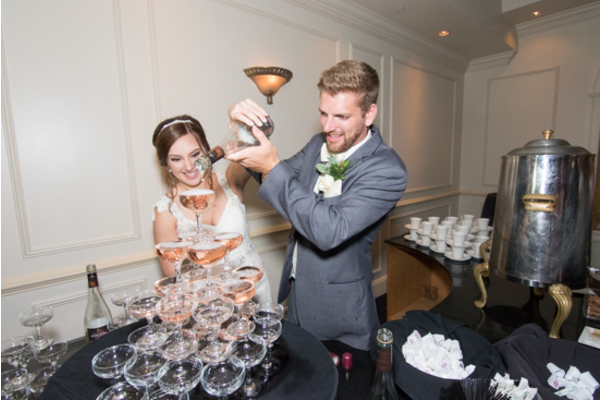 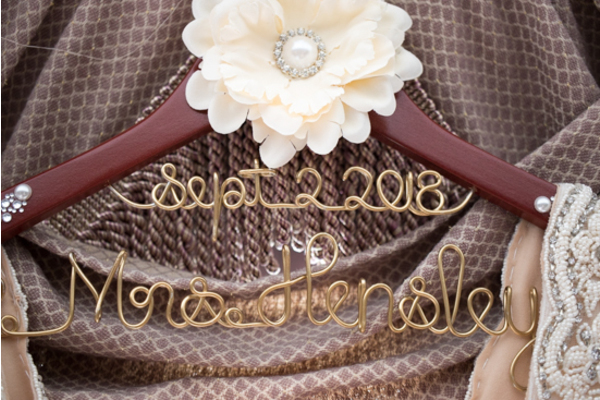 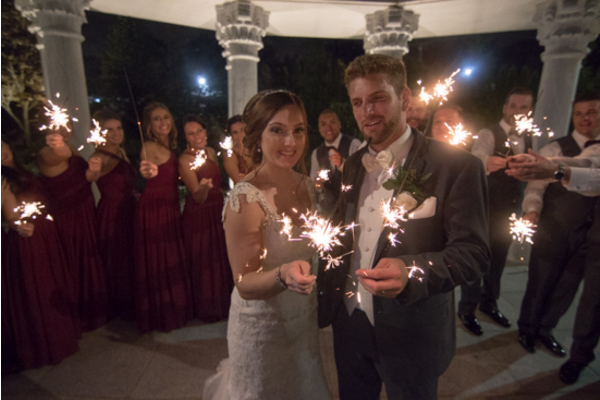 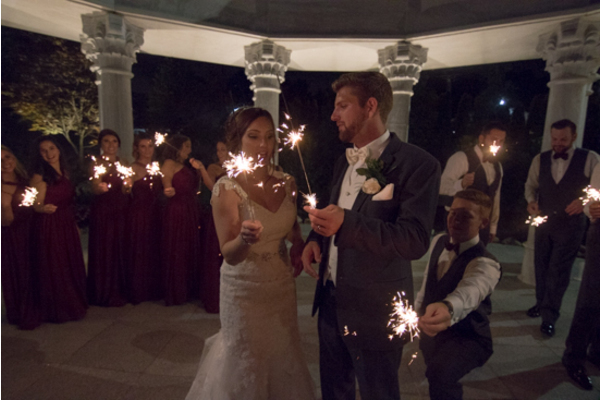 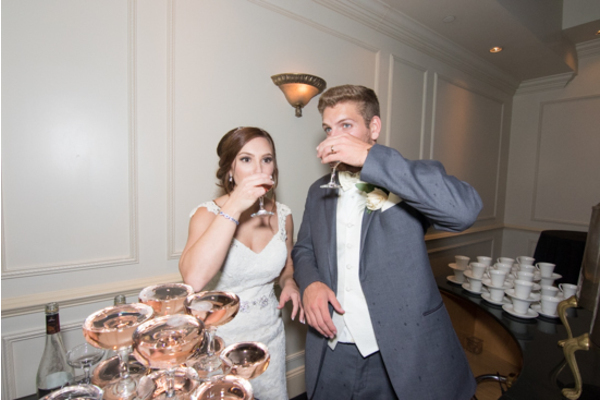 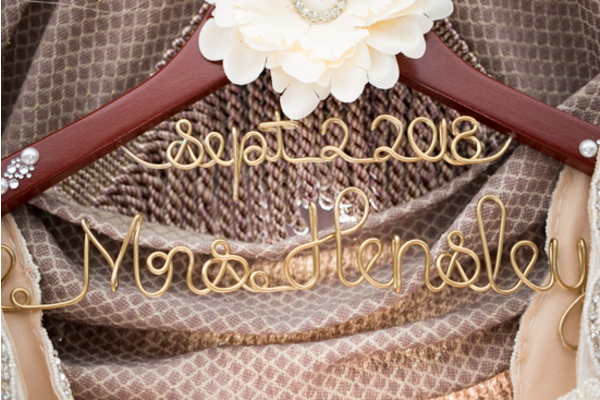 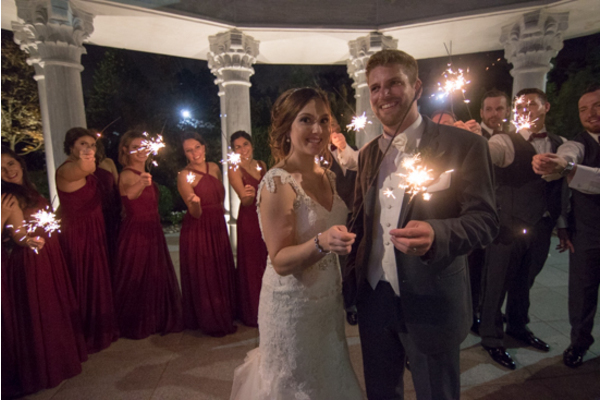 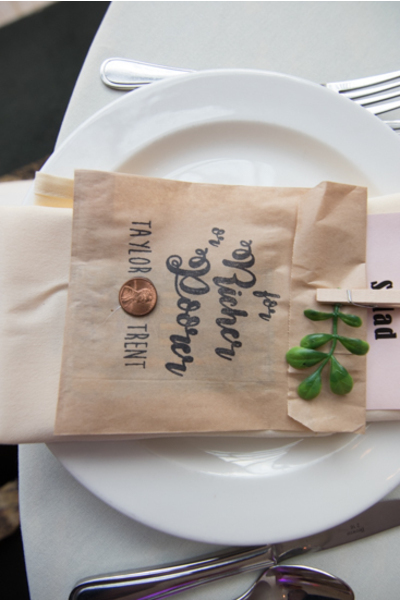 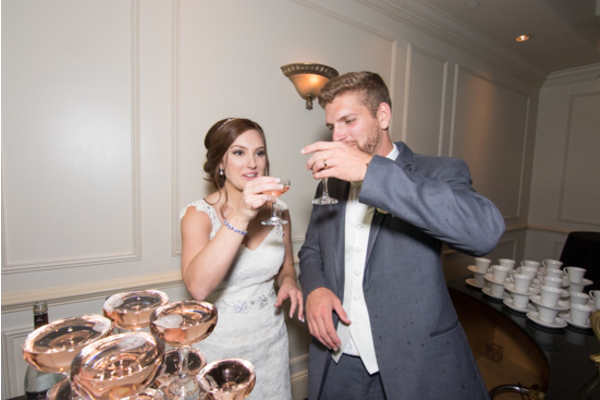 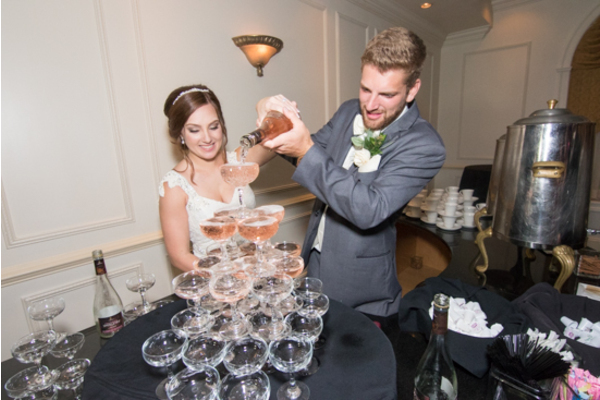 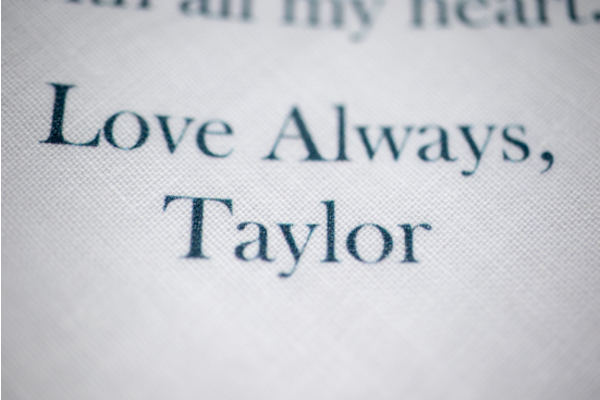 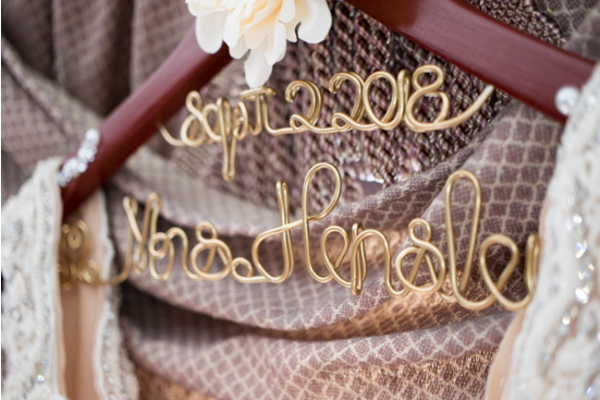 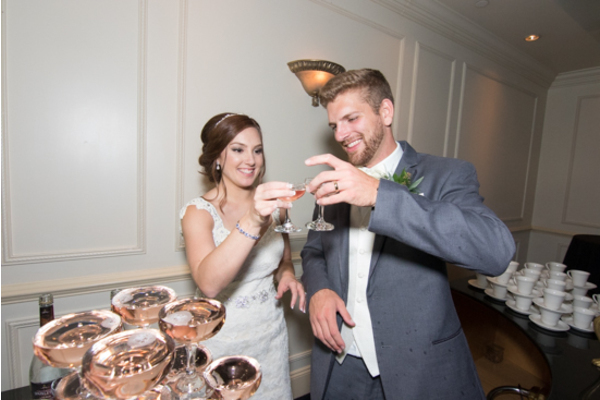 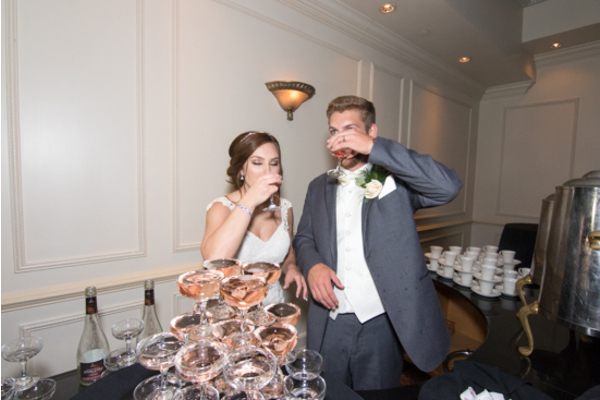 The bridal party wore stunning matching monogrammed robes and toasted champagne while adding the finishing touches for Taylor! 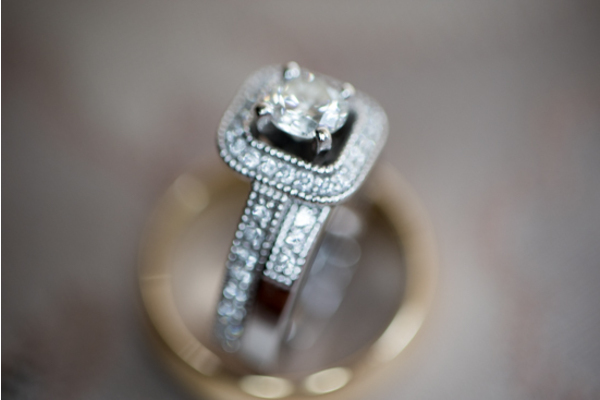 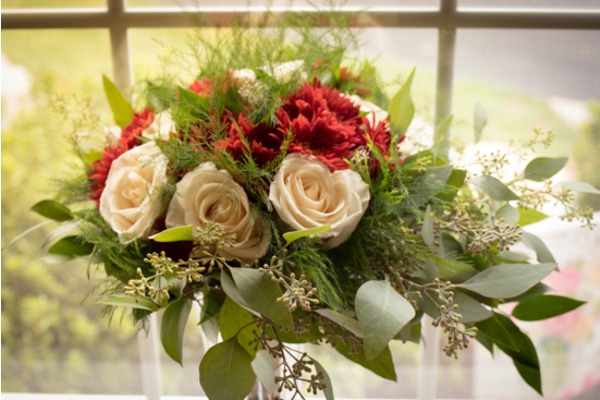 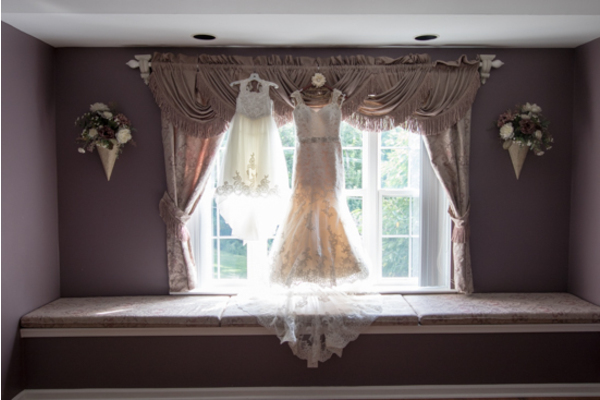 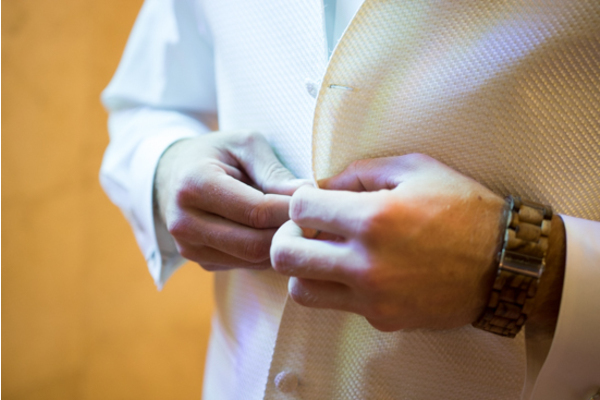 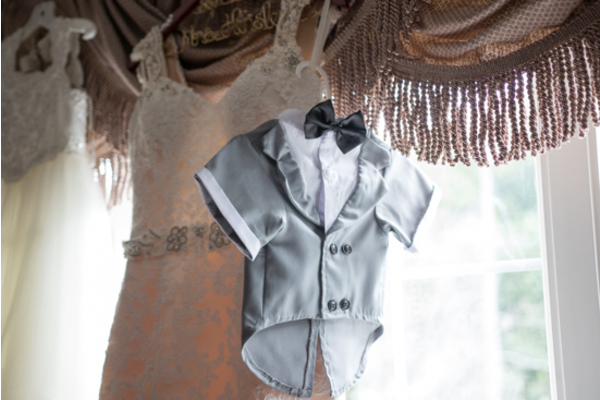 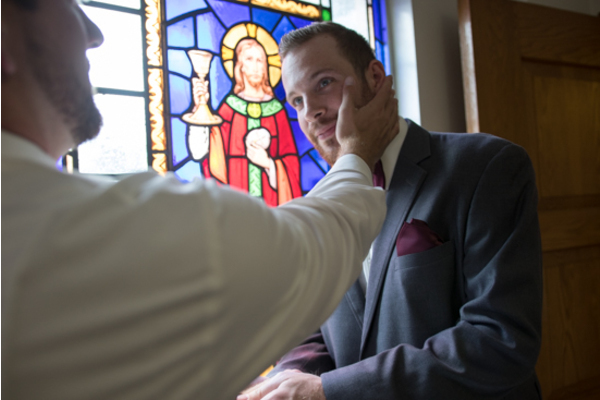 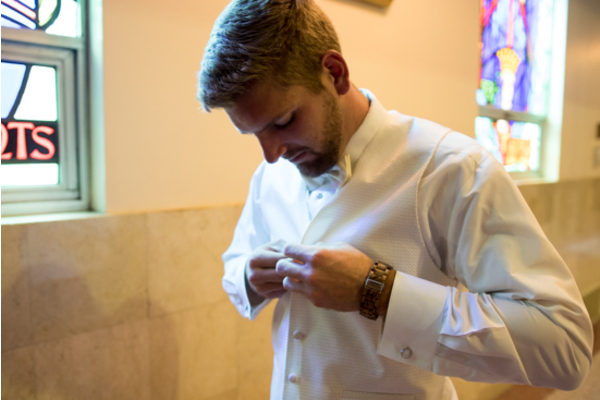 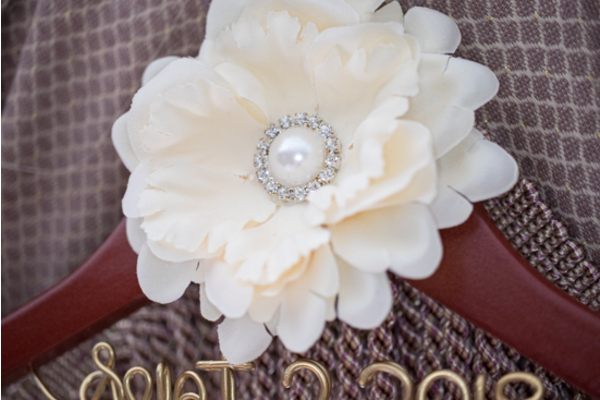 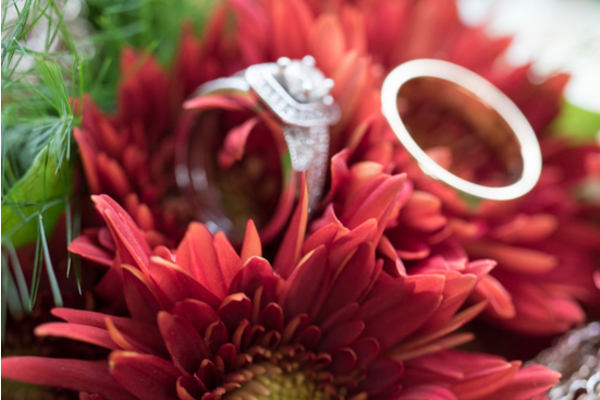 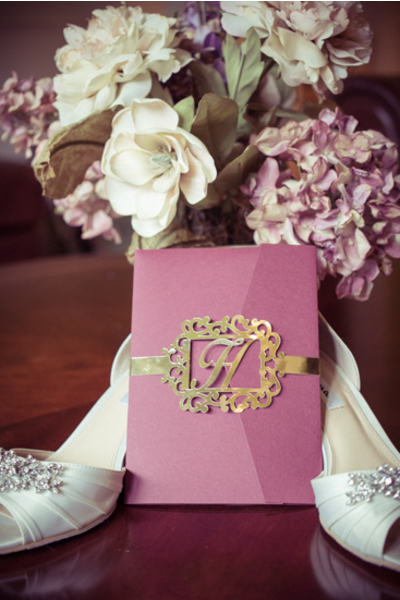 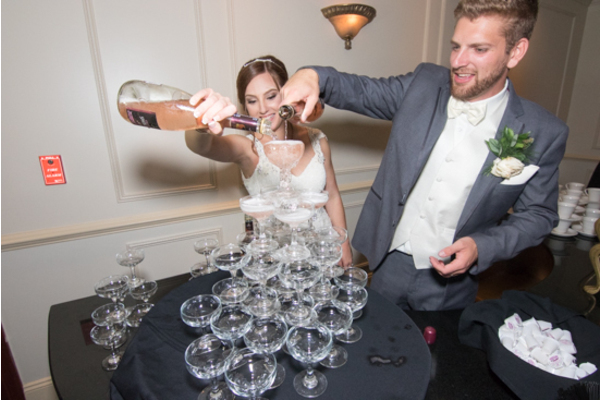 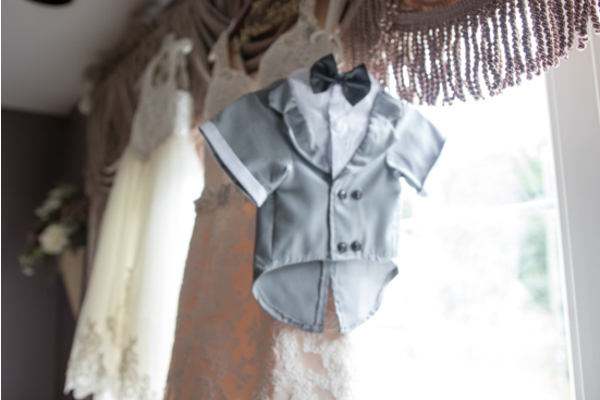 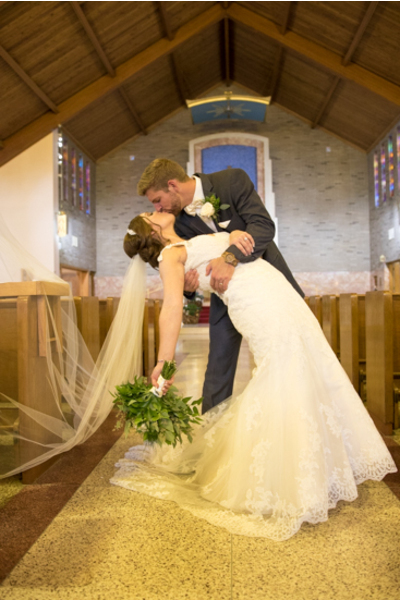 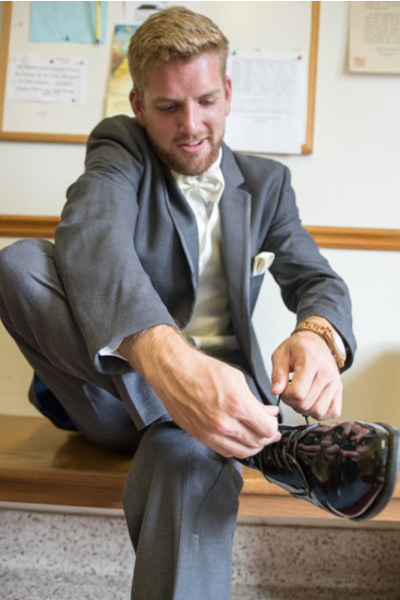 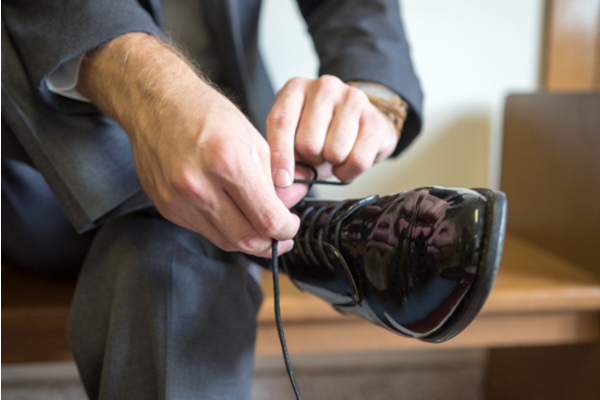 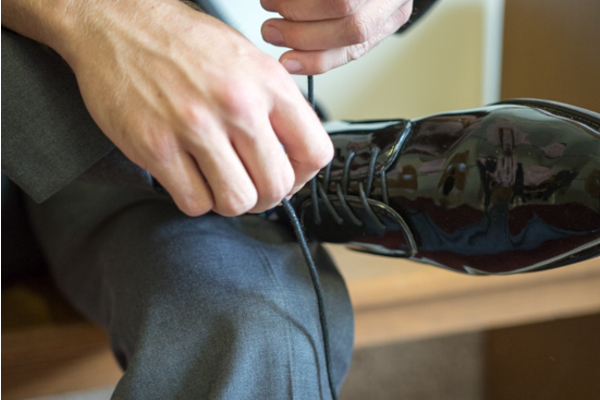 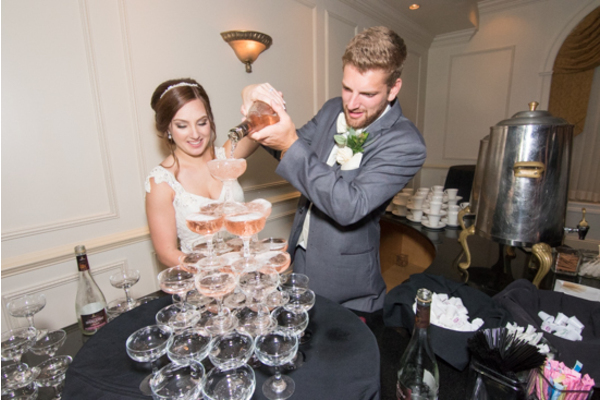 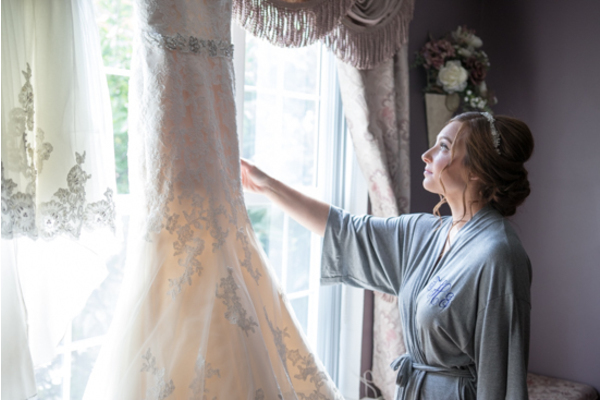 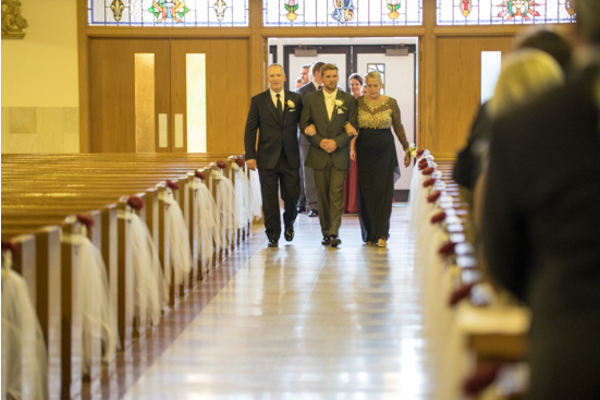 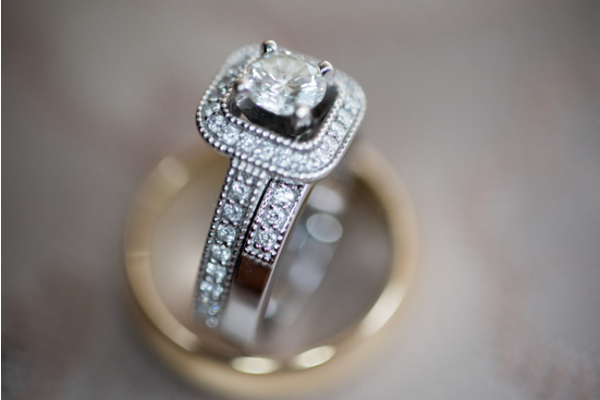 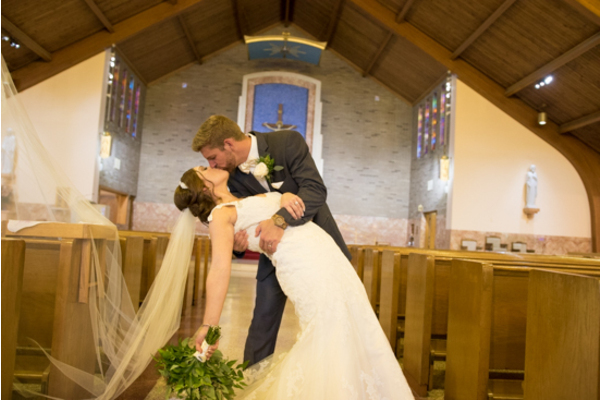 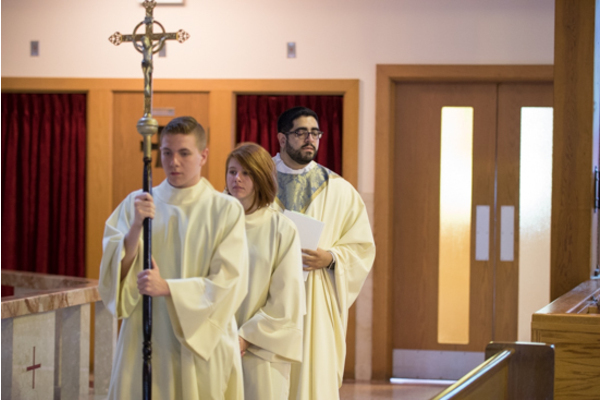 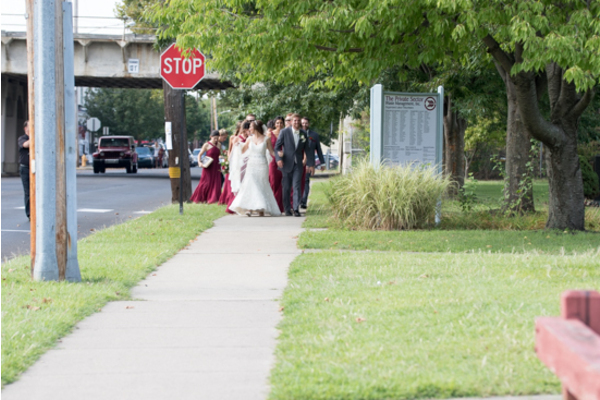 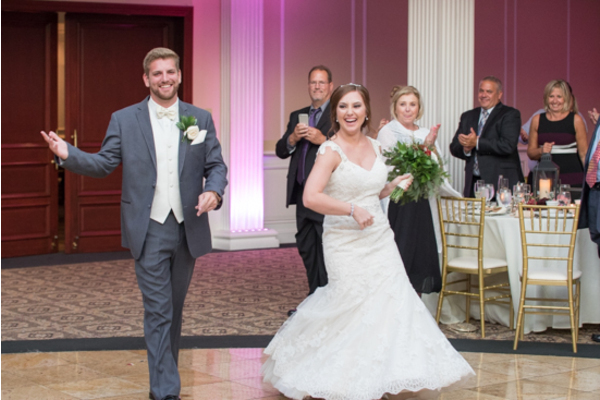 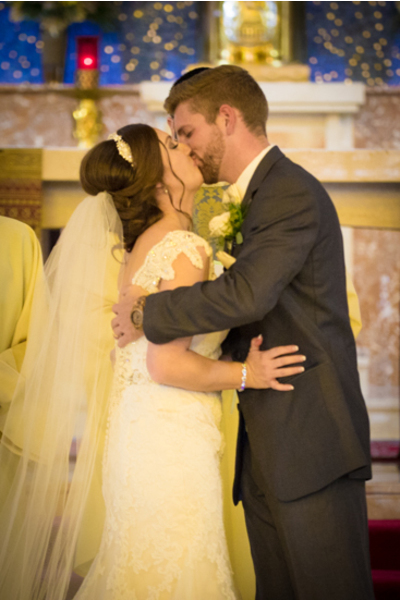 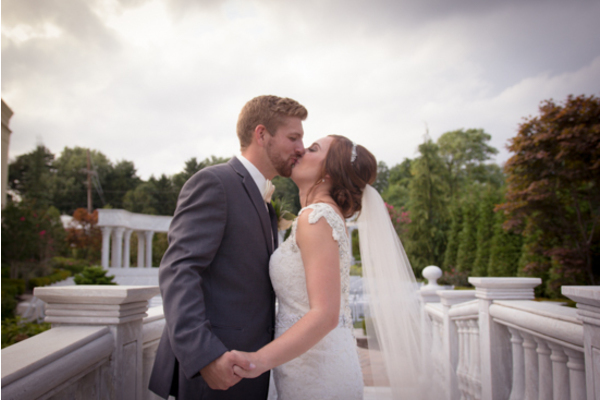 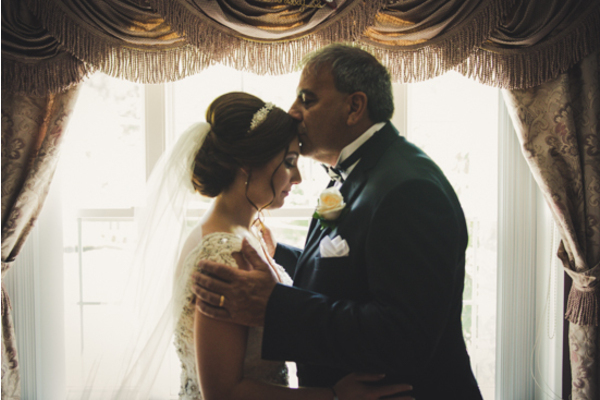 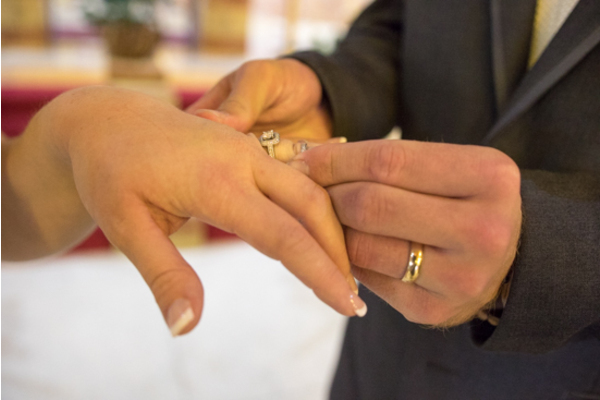 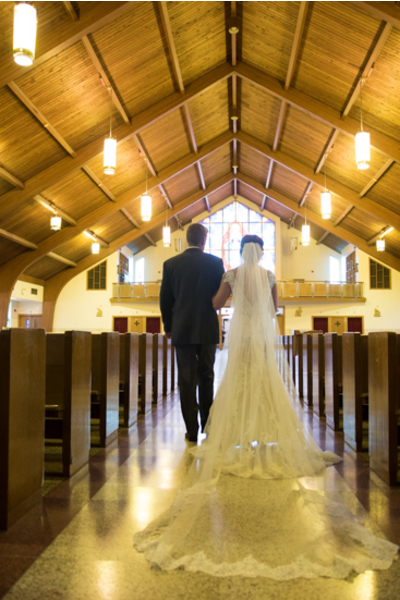 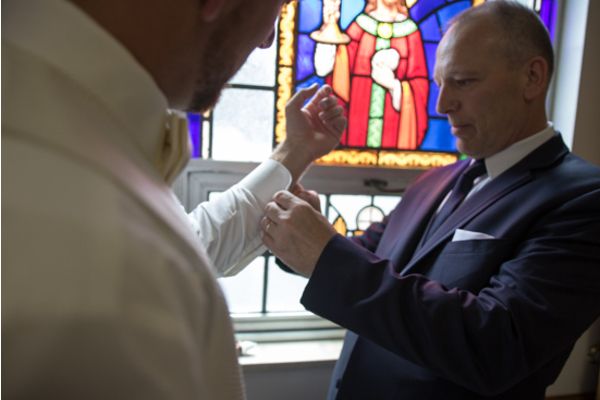 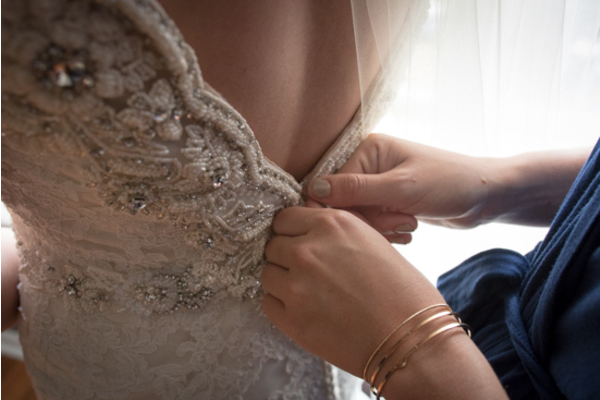 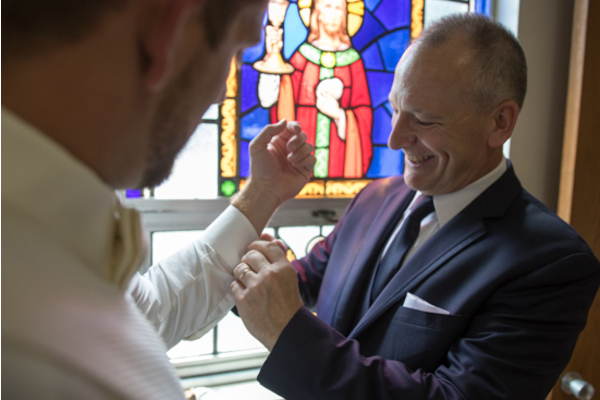 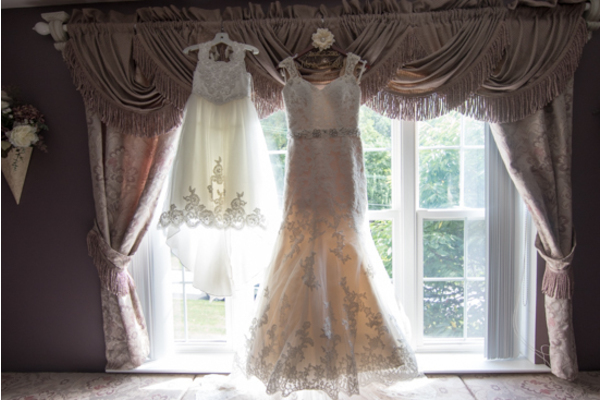 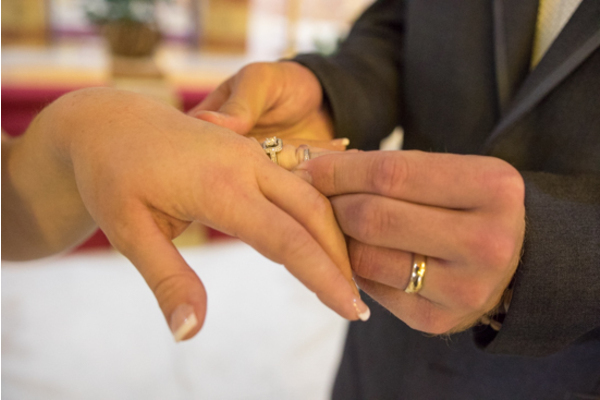 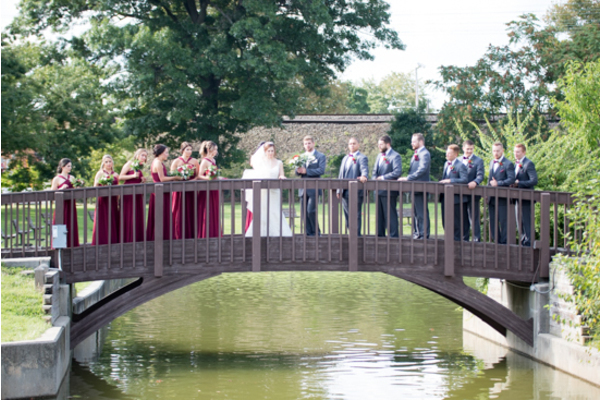 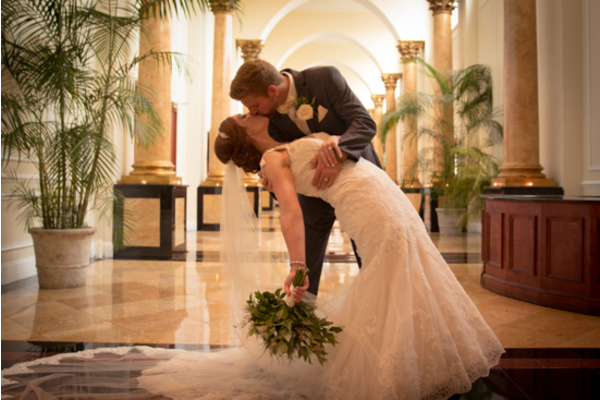 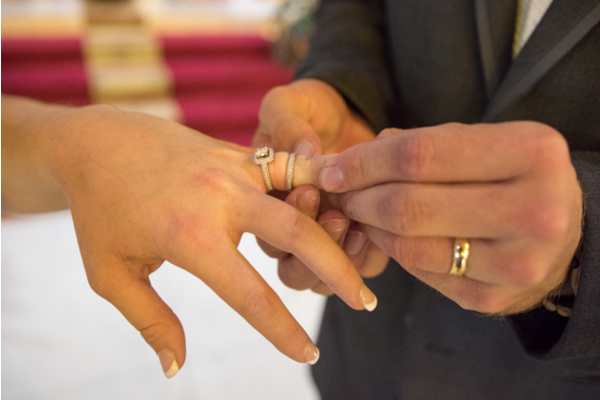 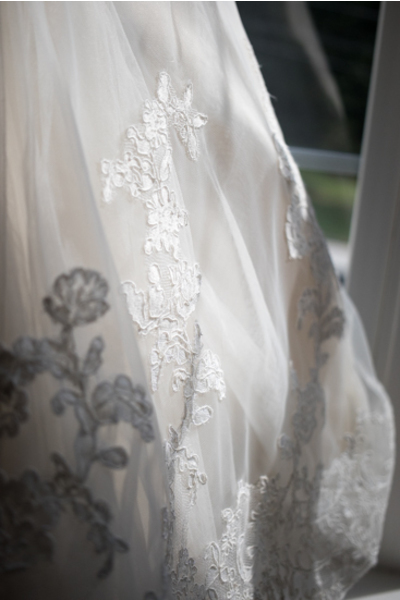 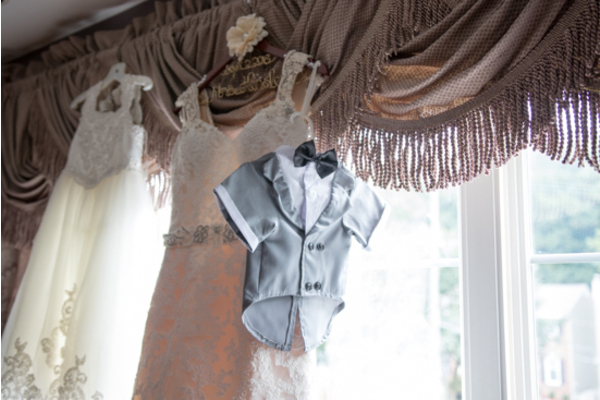 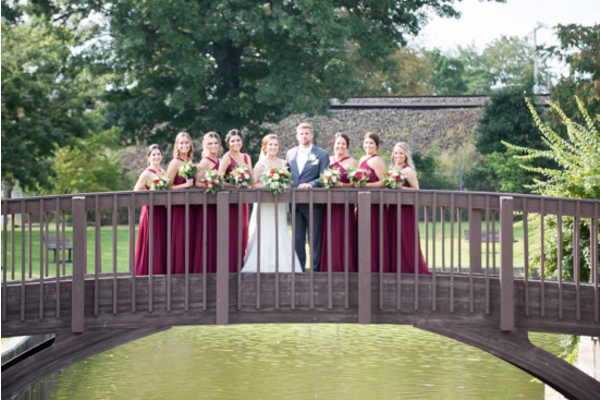 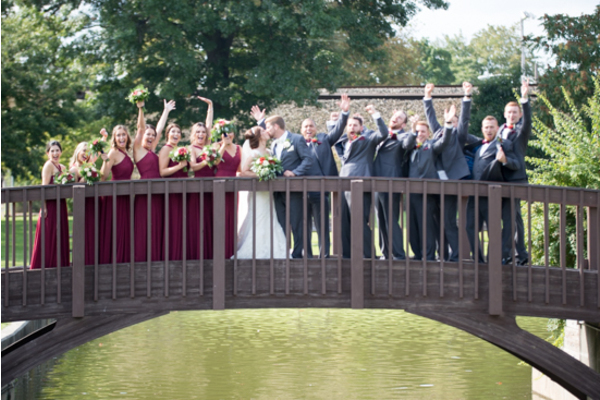 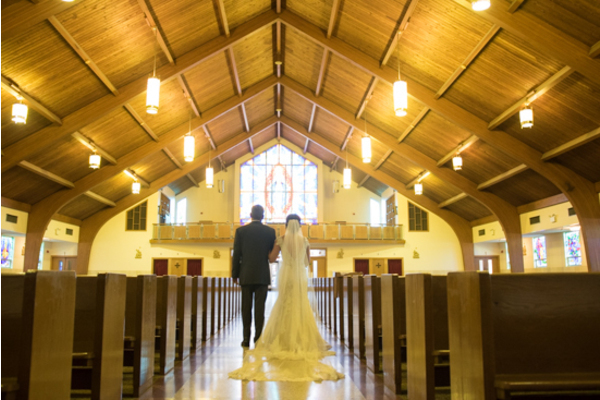 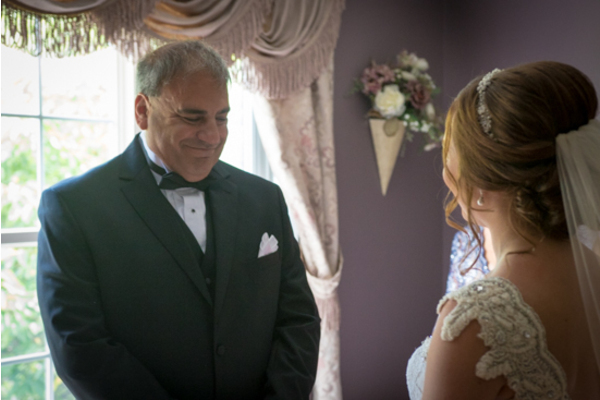 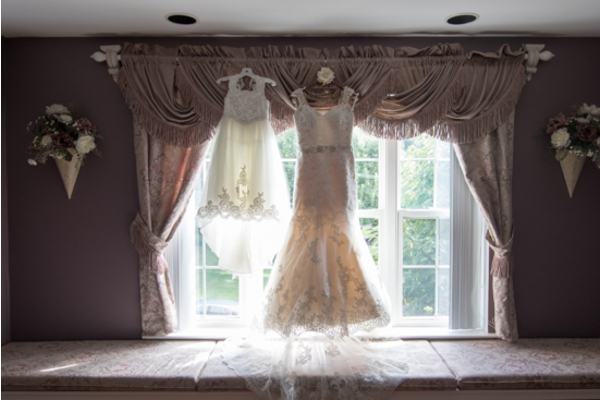 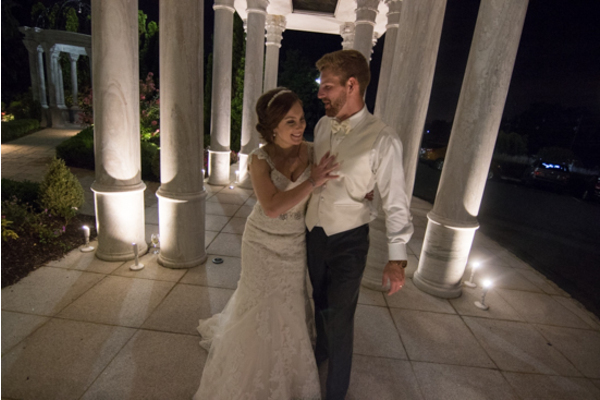 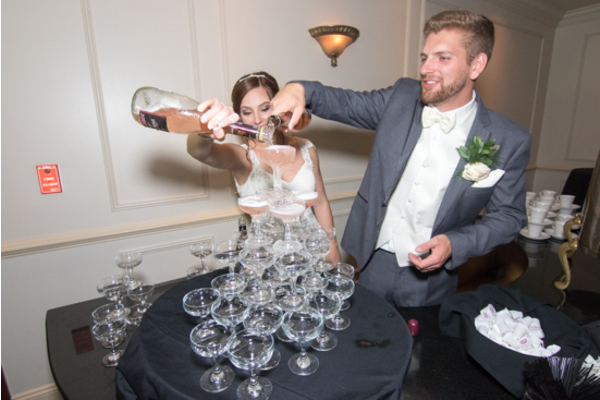 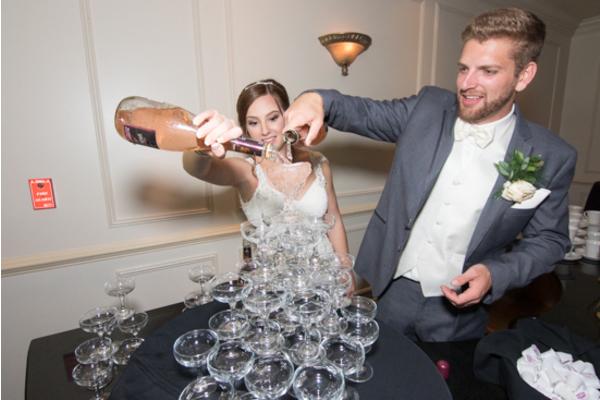 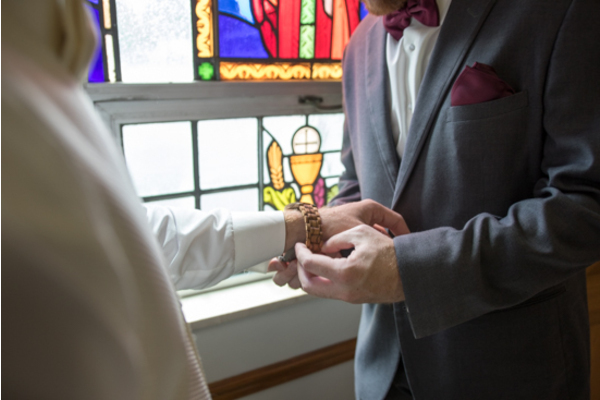 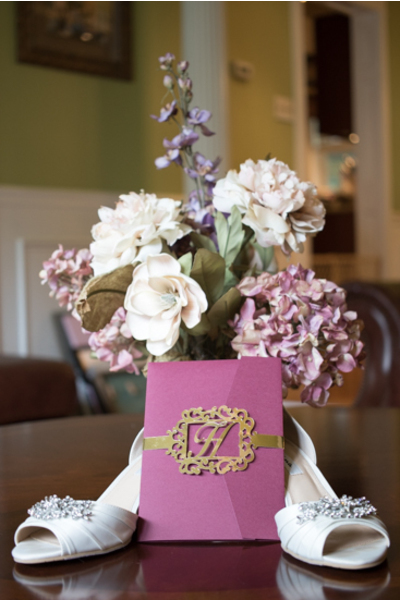 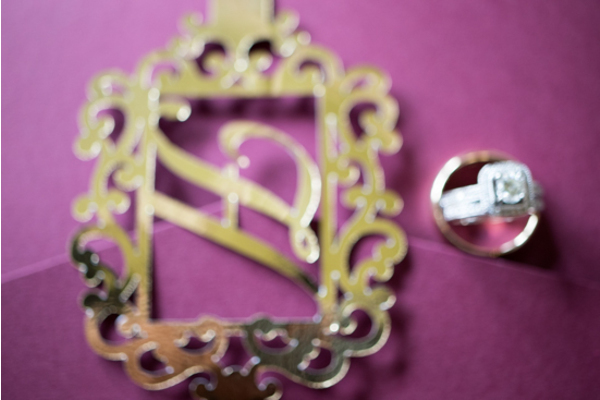 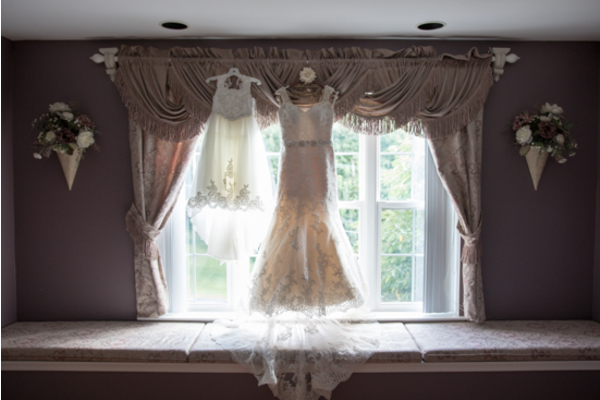 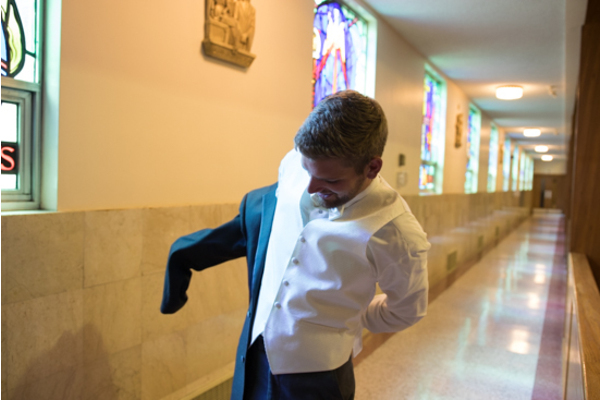 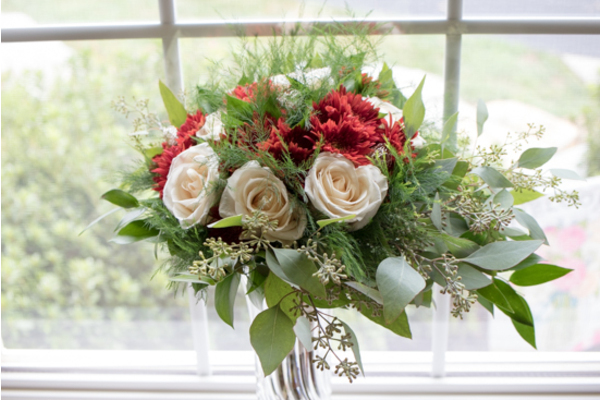 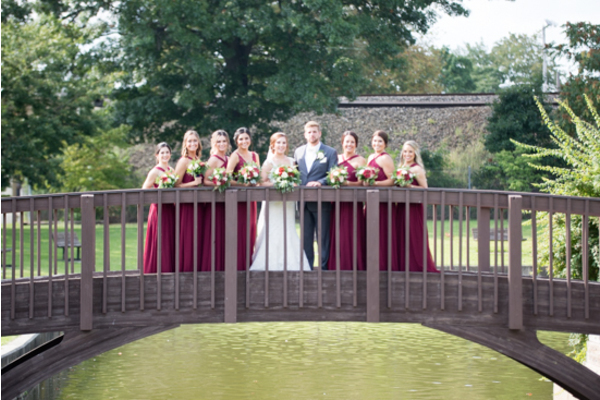 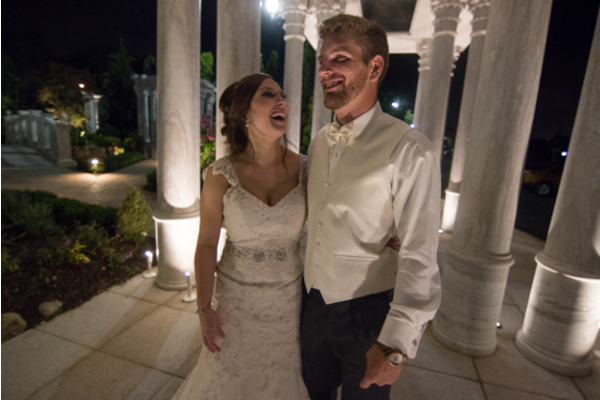 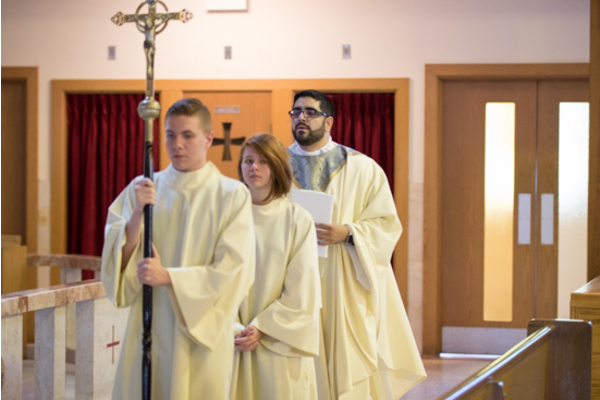 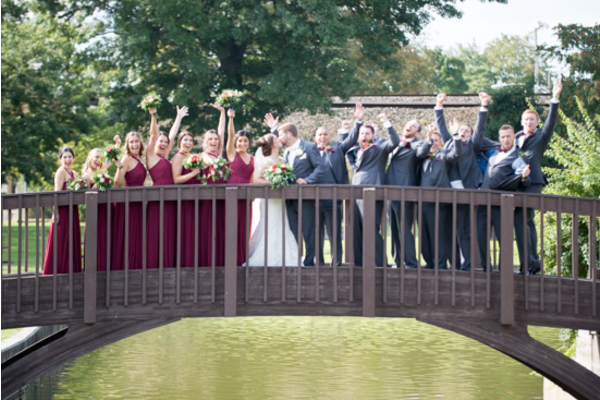 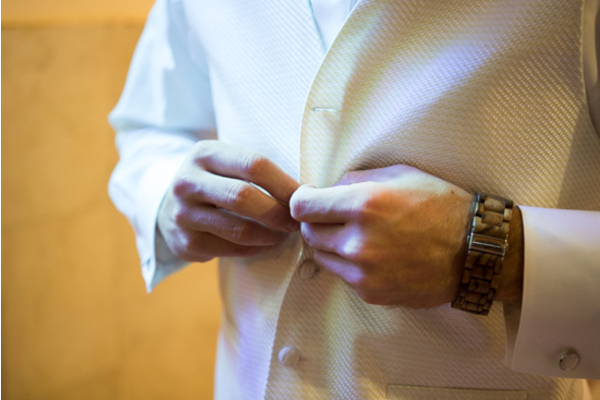 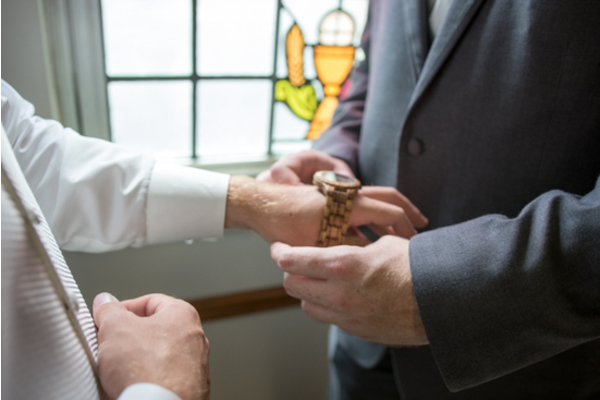 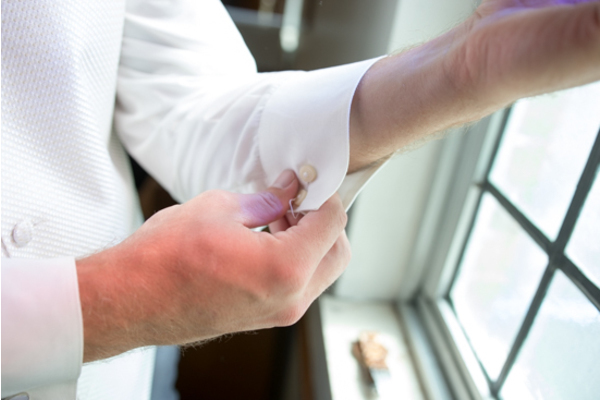 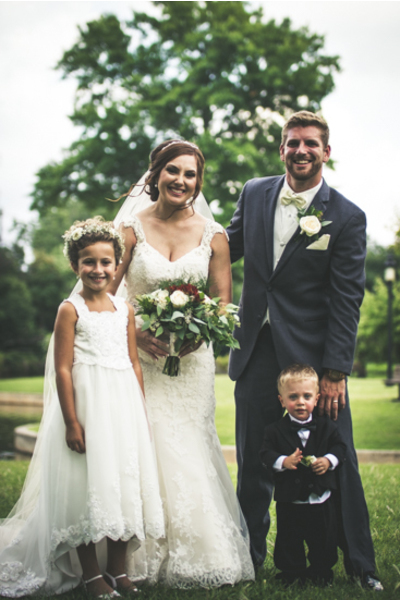 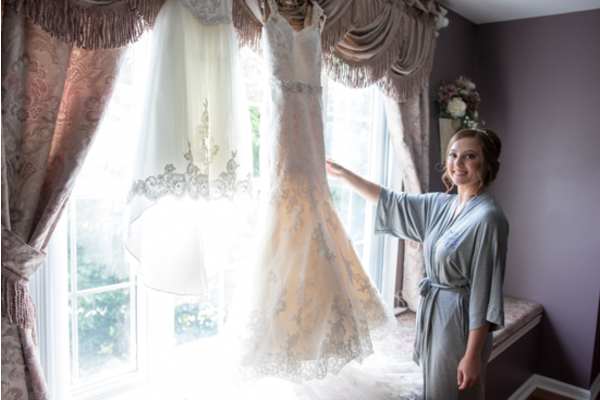 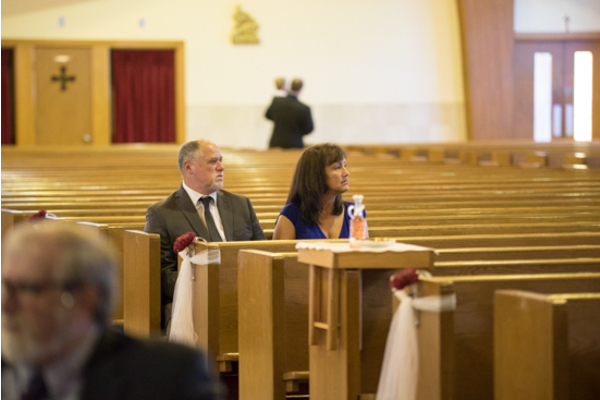 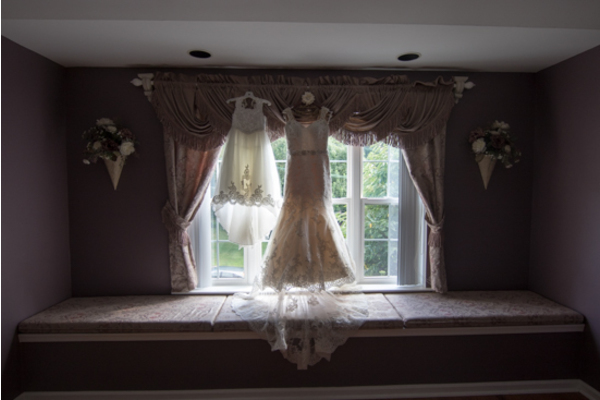 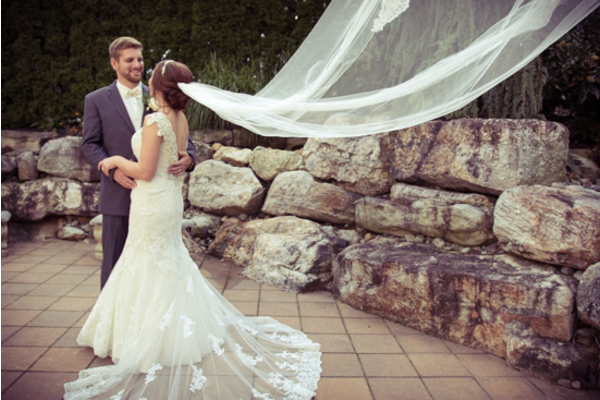 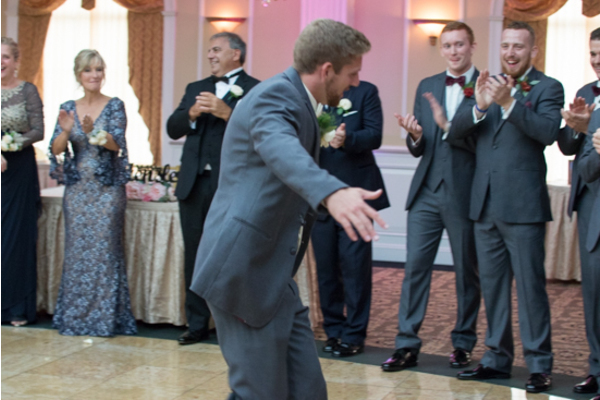 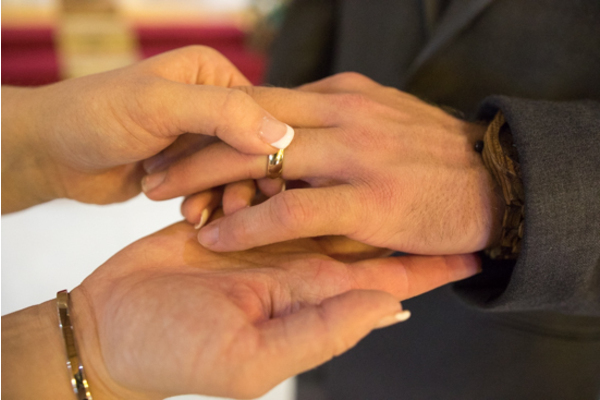 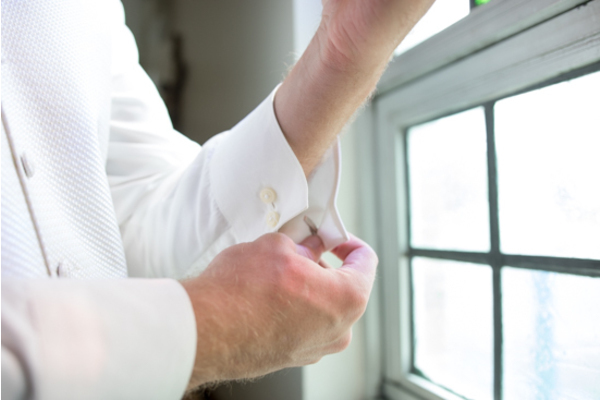 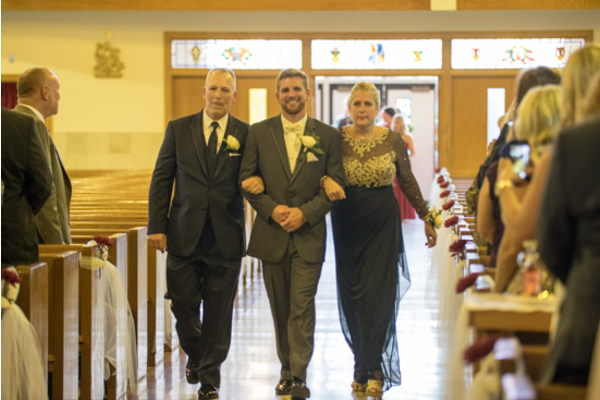 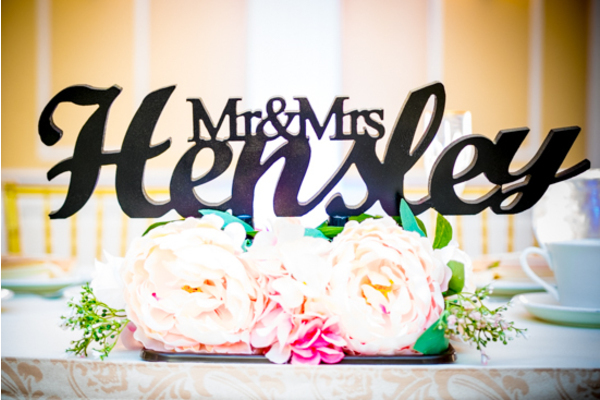 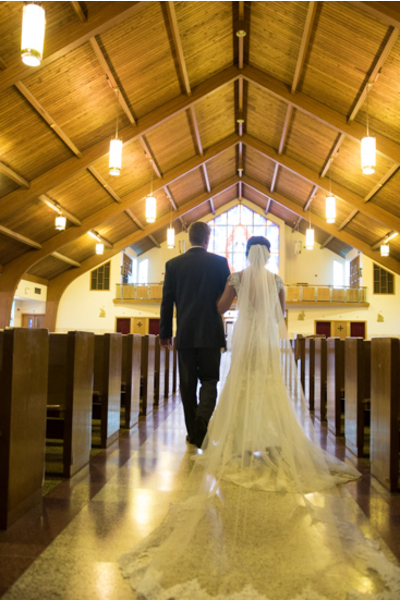 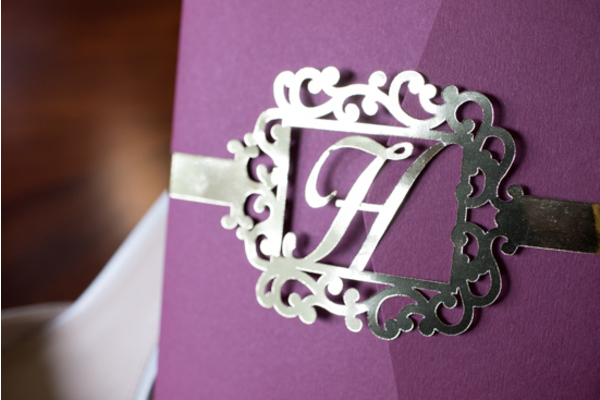 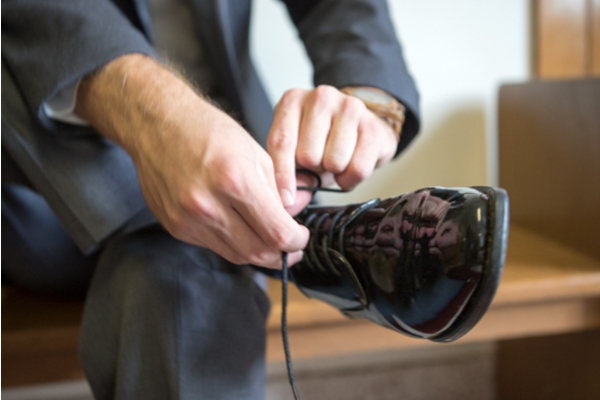 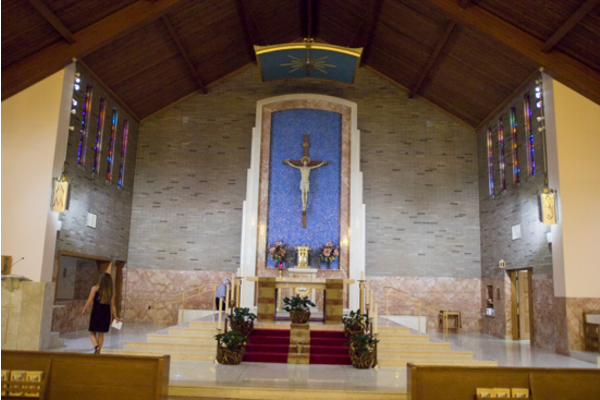 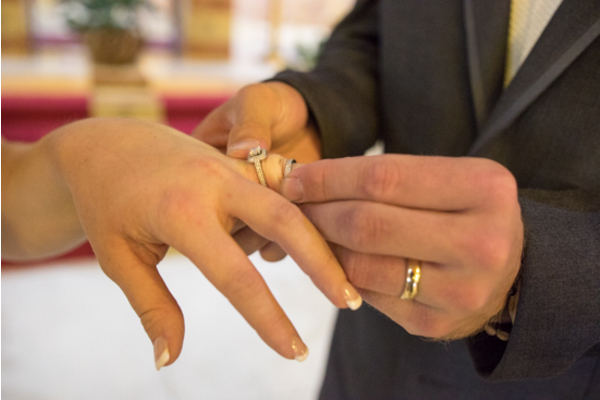 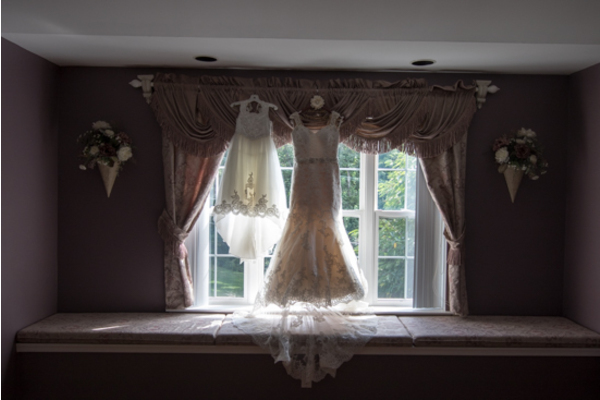 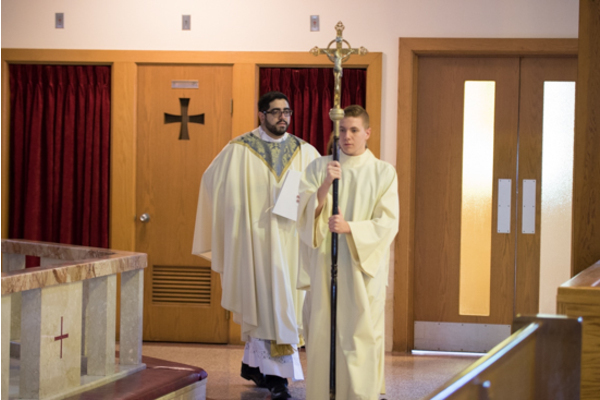 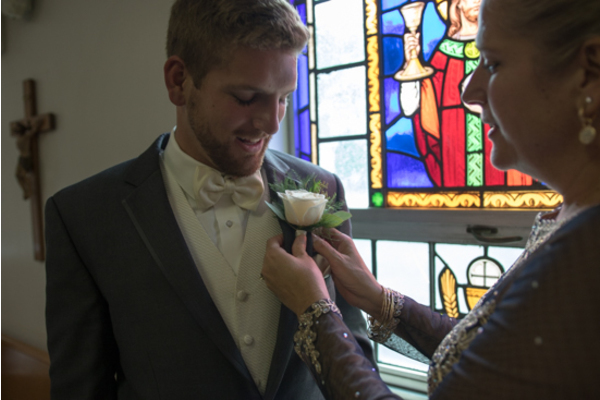 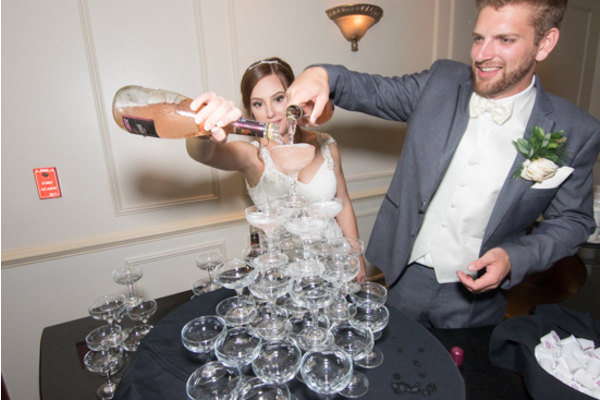 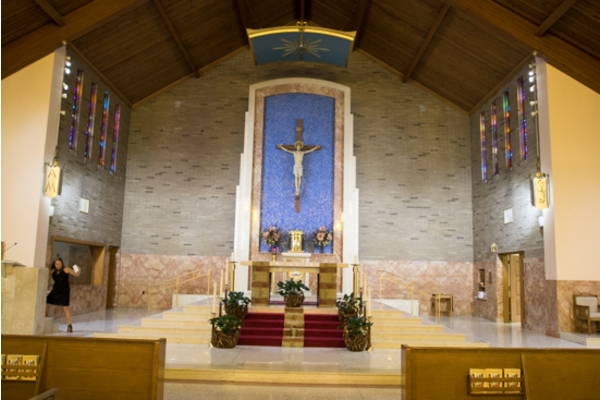 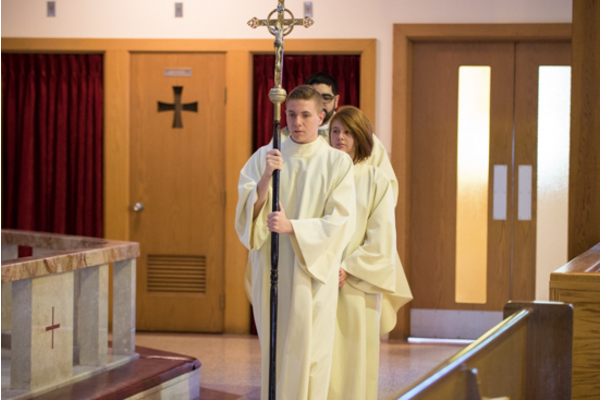 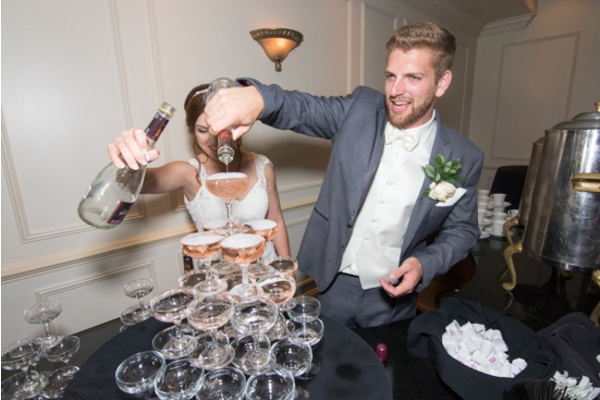 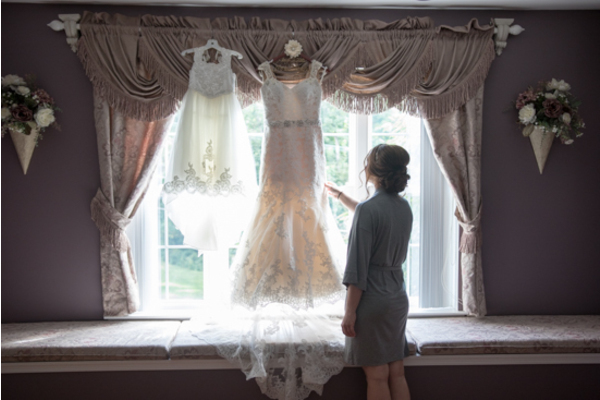 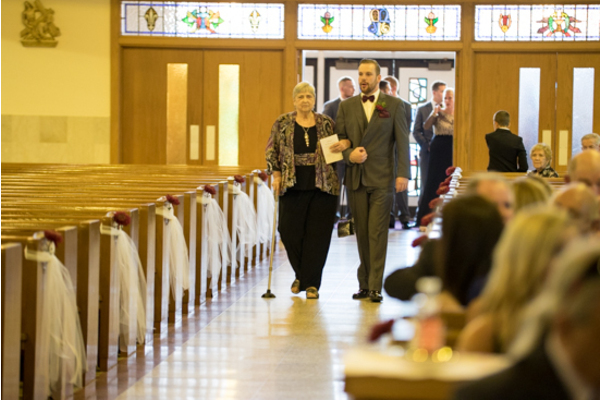 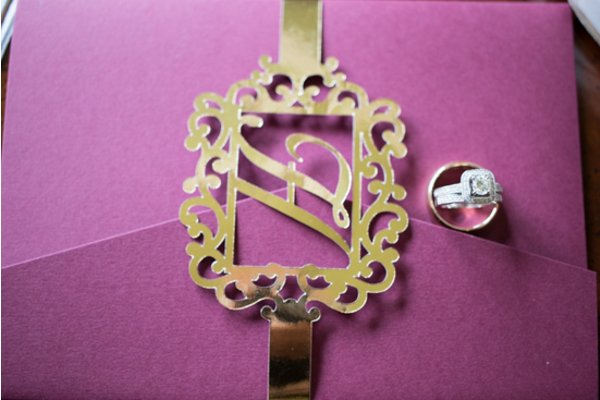 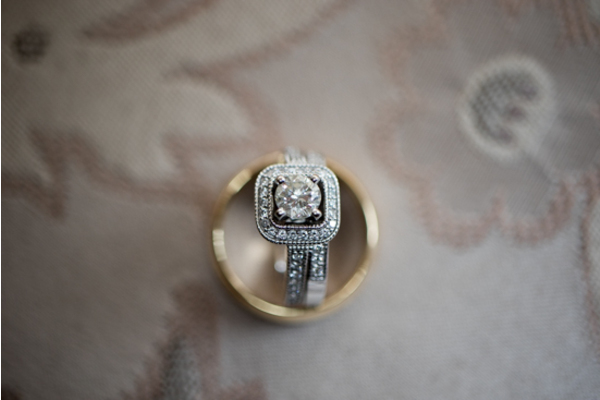 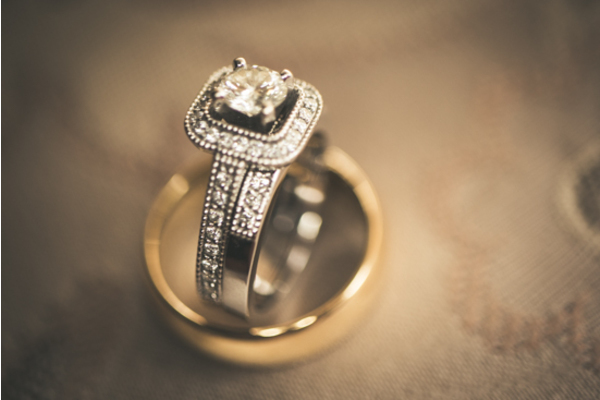 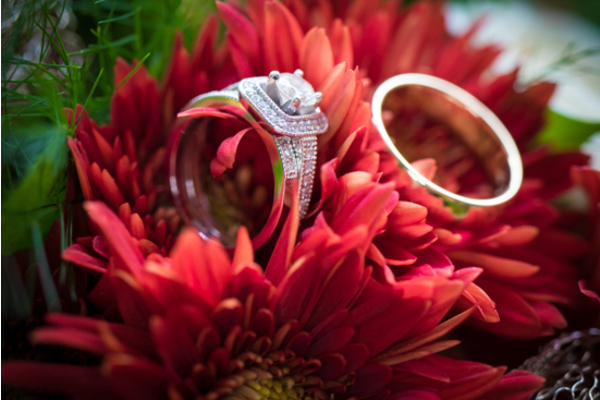 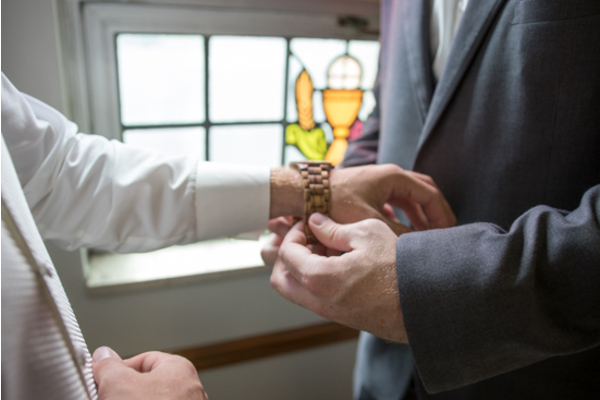 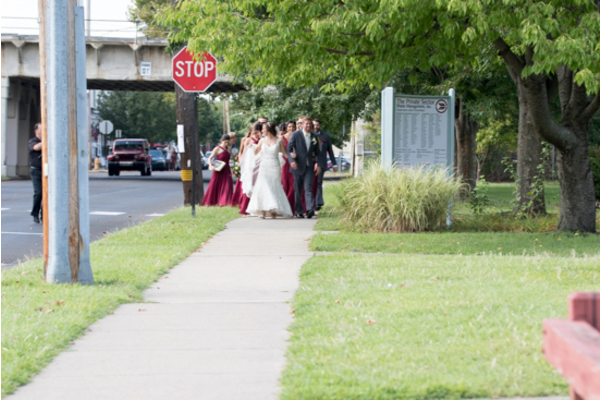 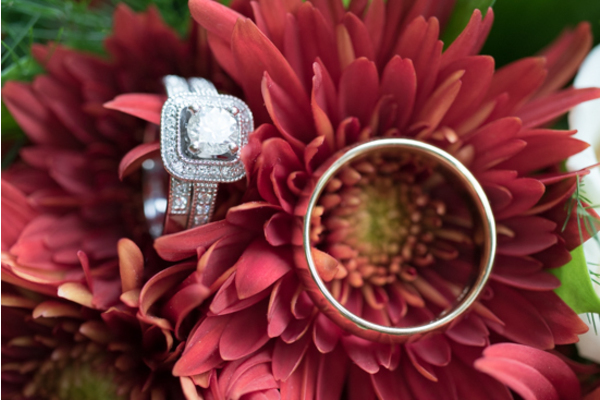 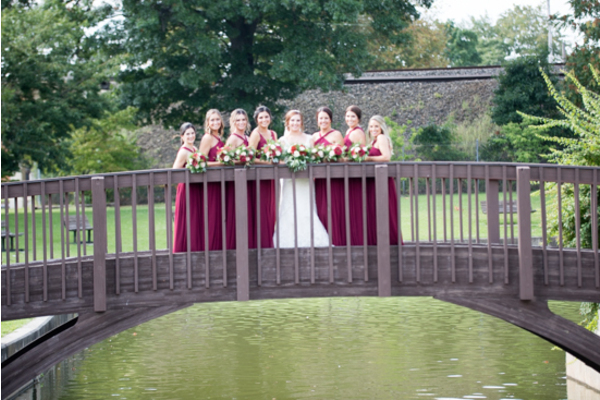 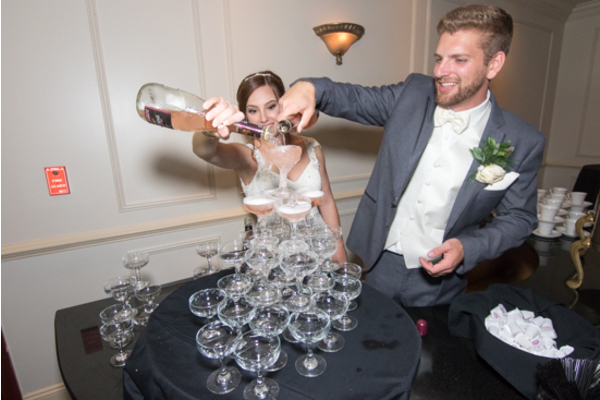 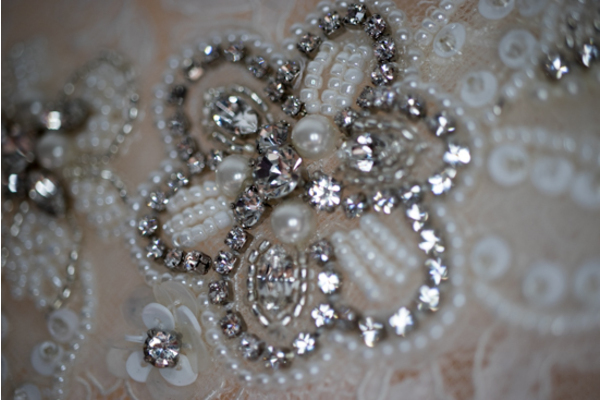 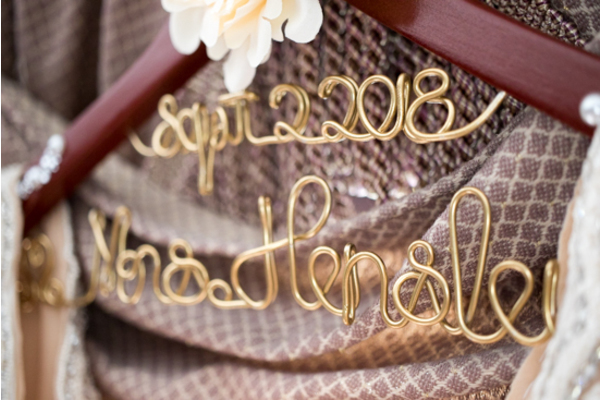 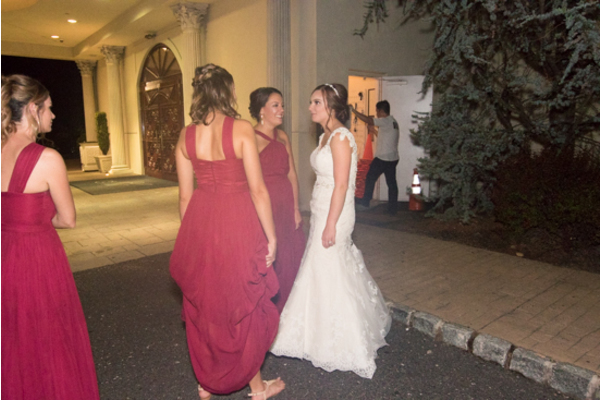 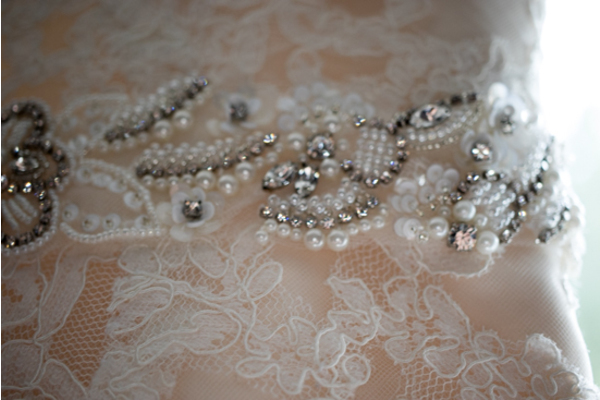 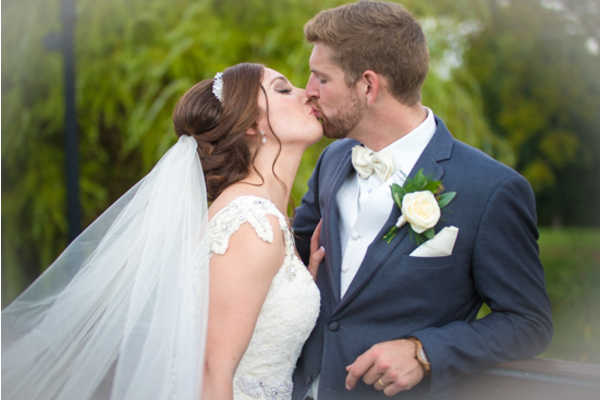 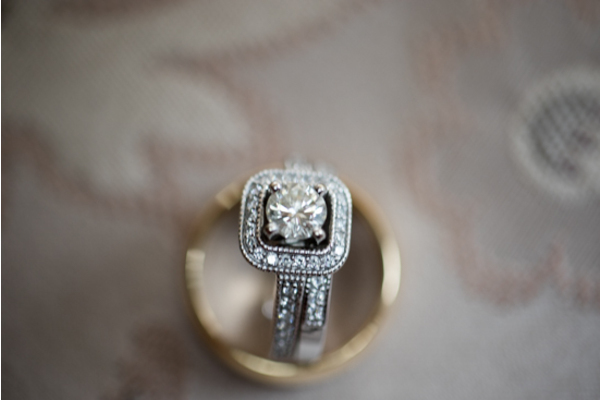 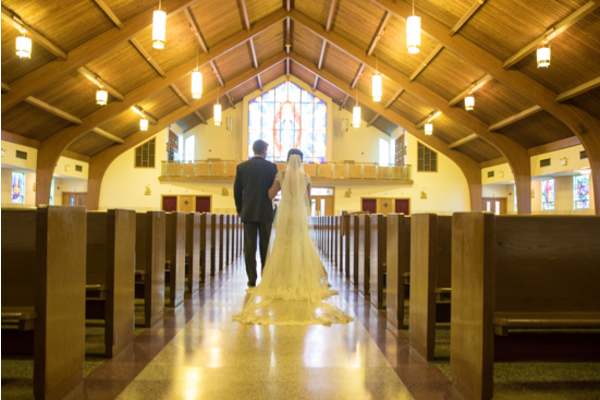 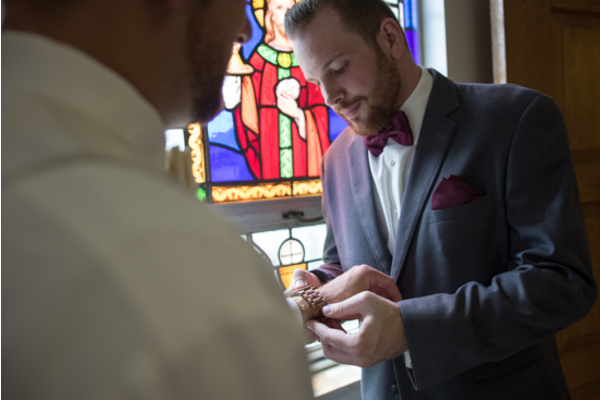 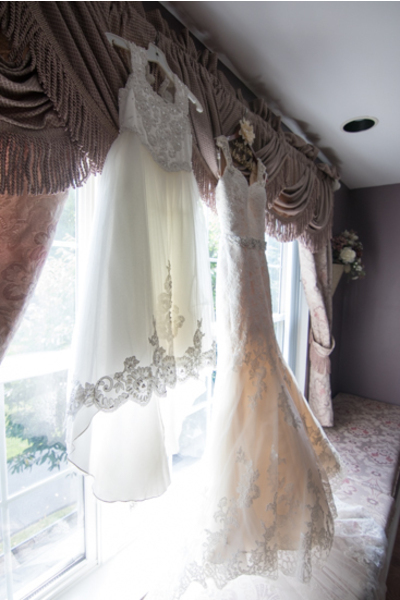 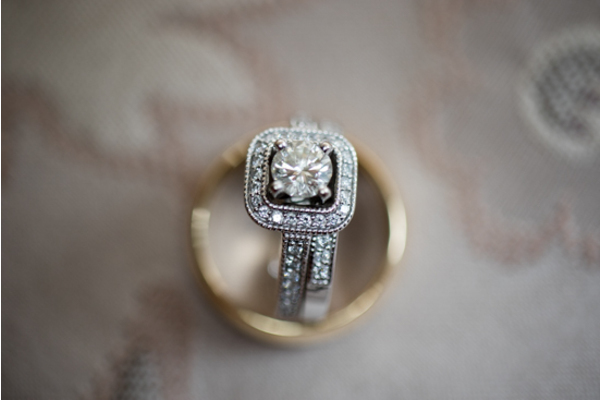 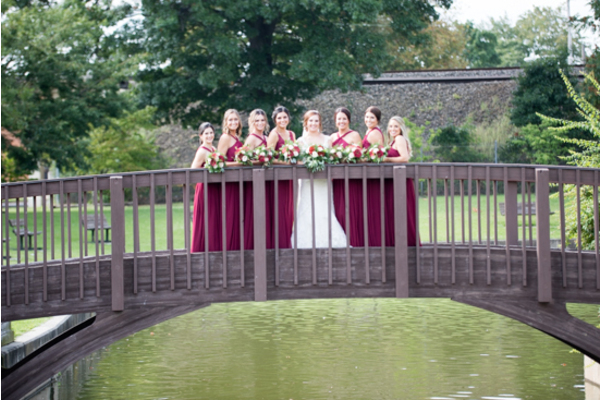 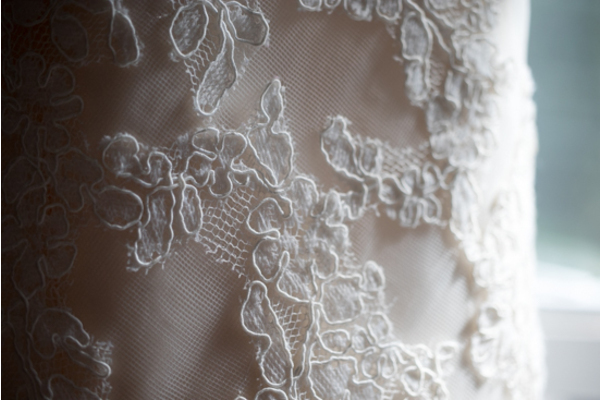 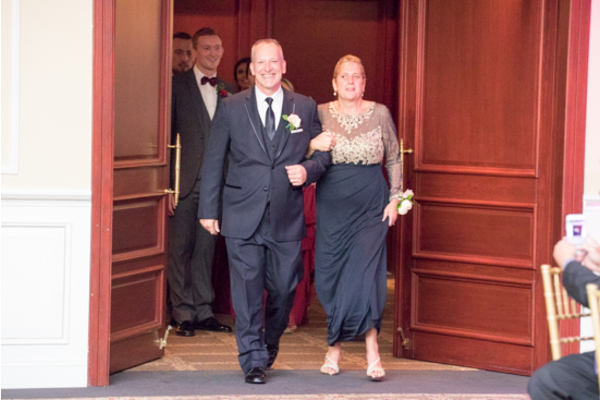 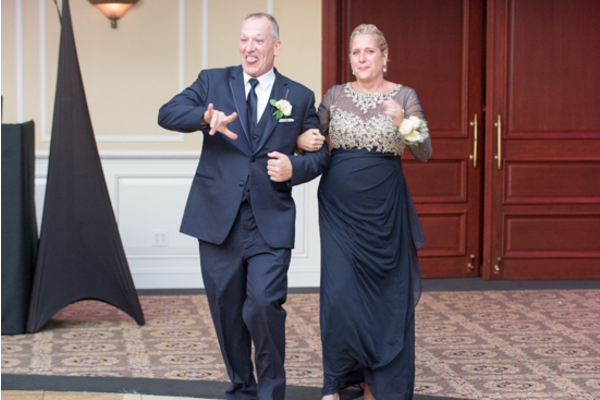 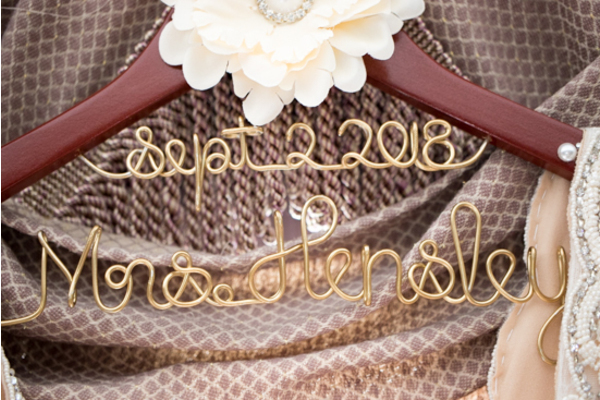 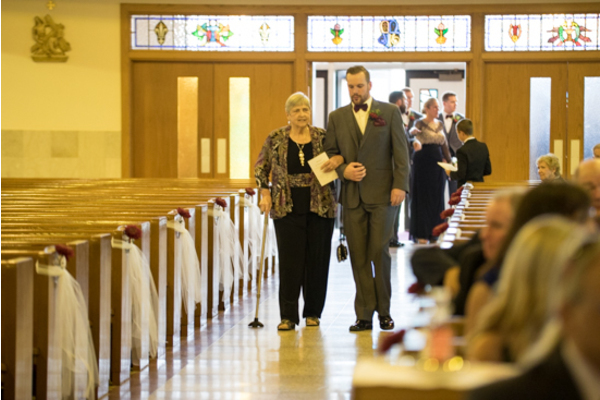 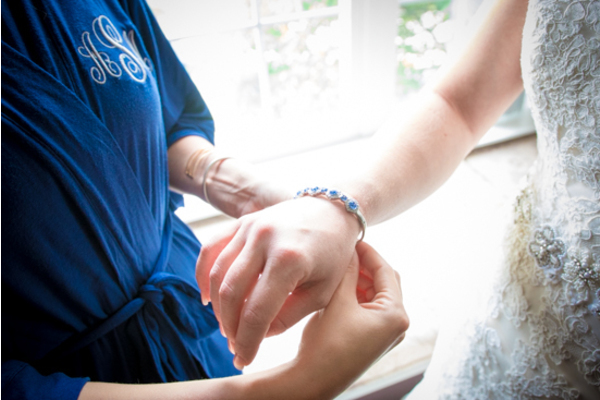 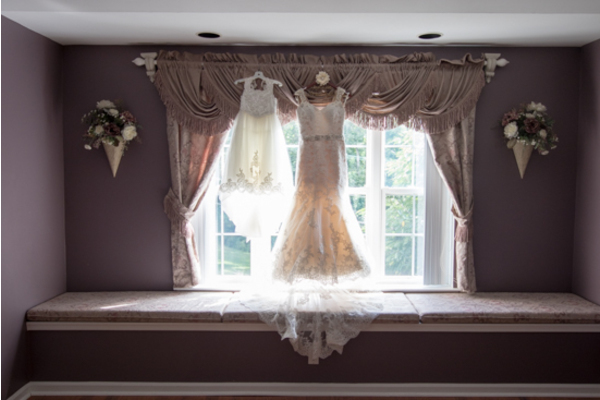 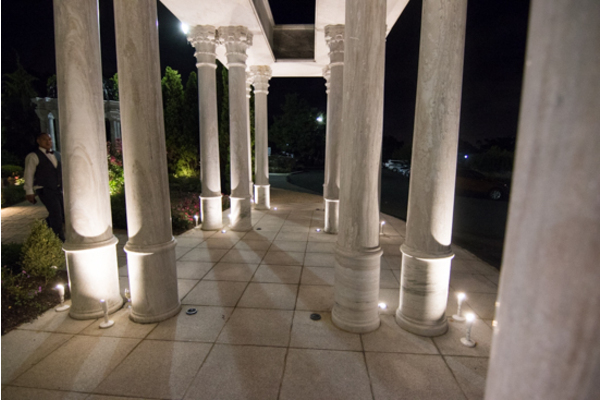 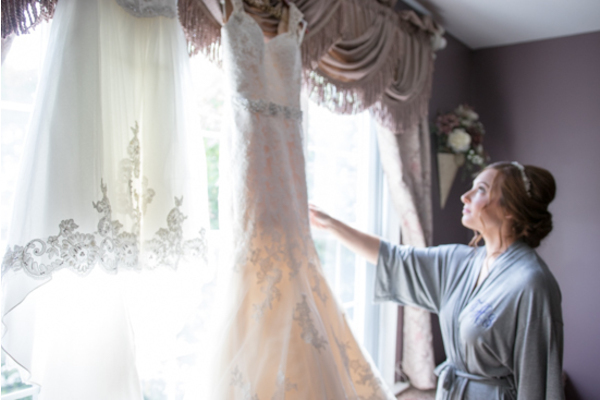 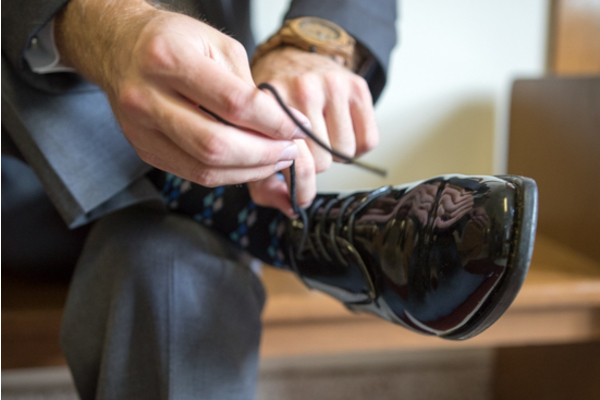 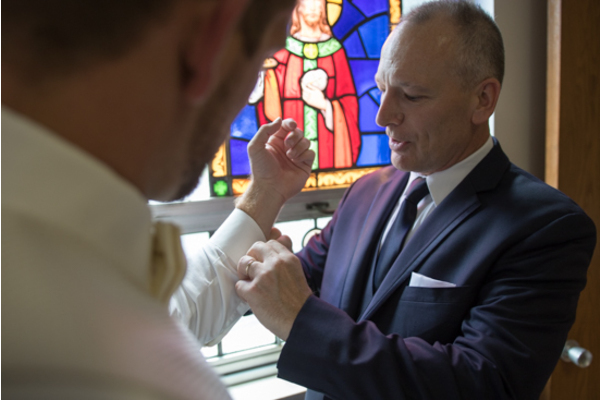 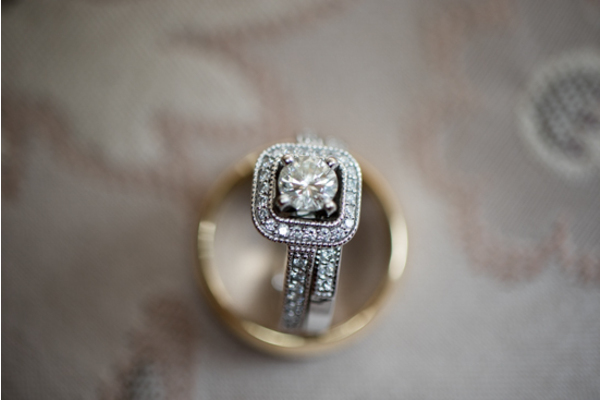 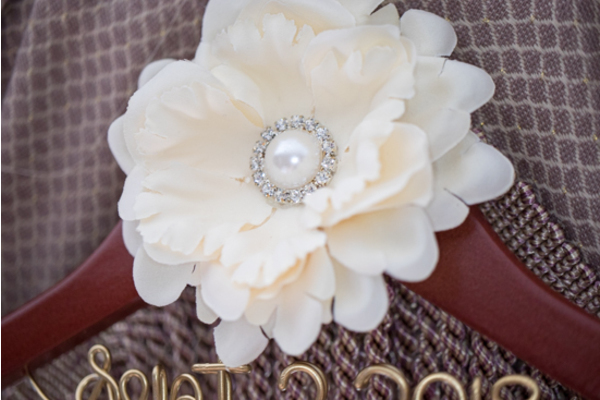 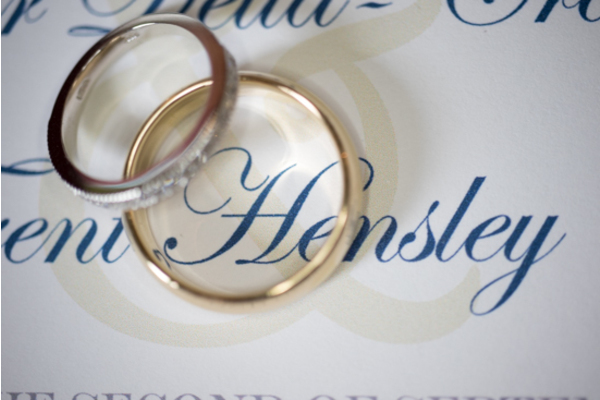 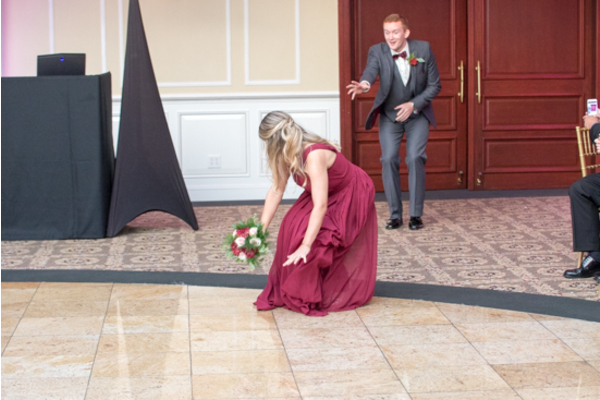 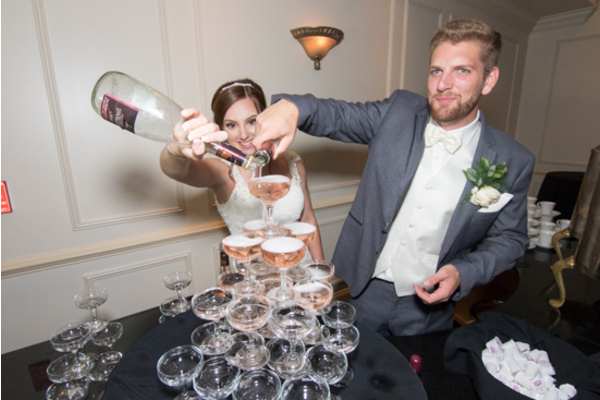 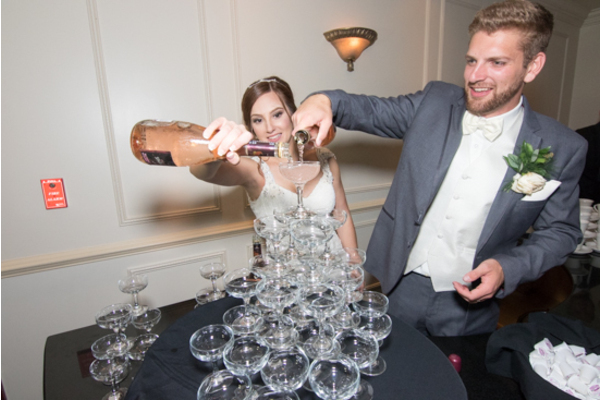 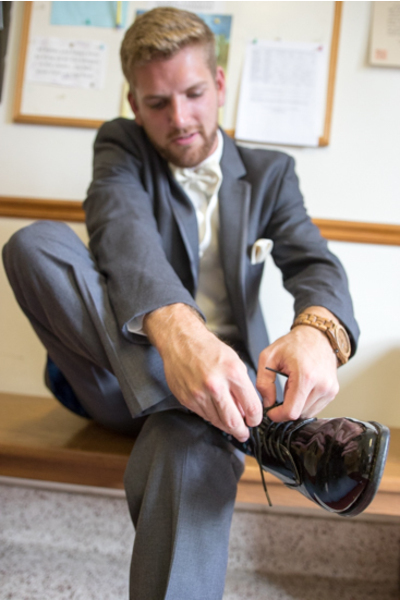 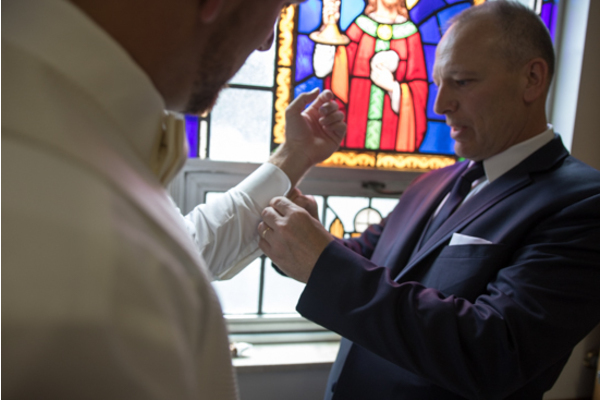 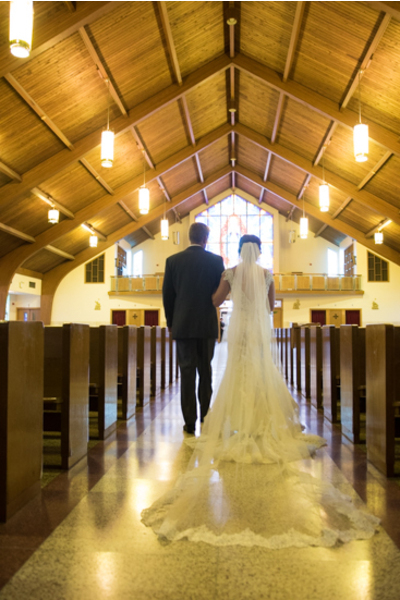 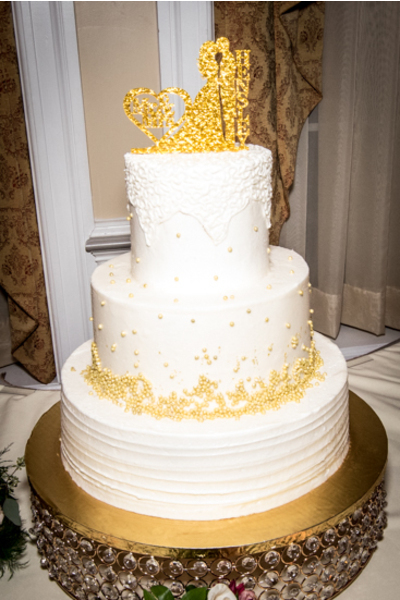 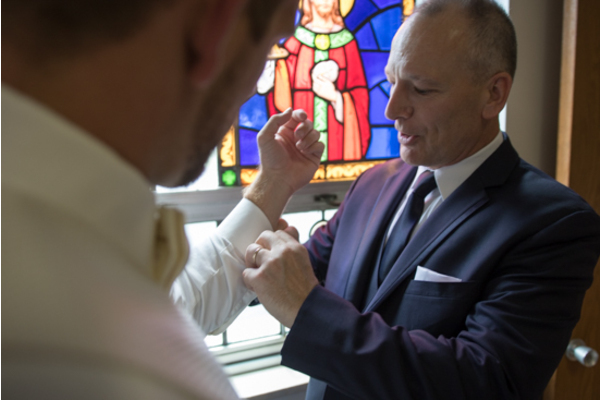 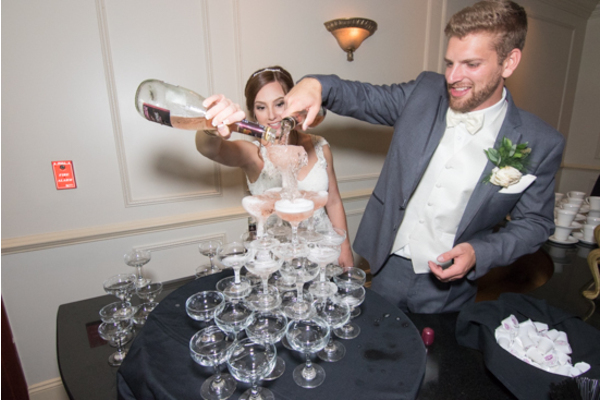 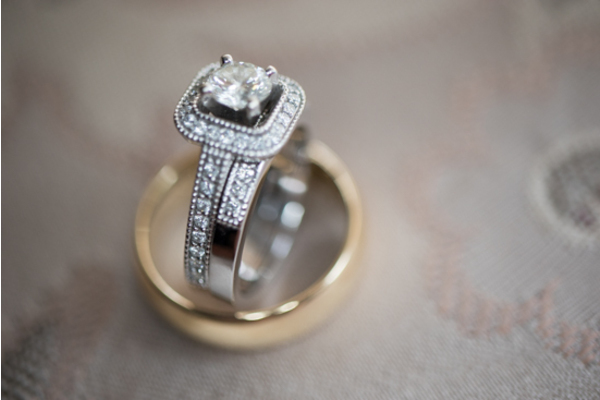 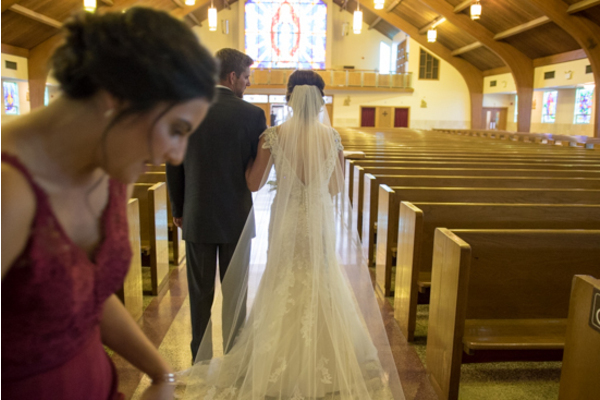 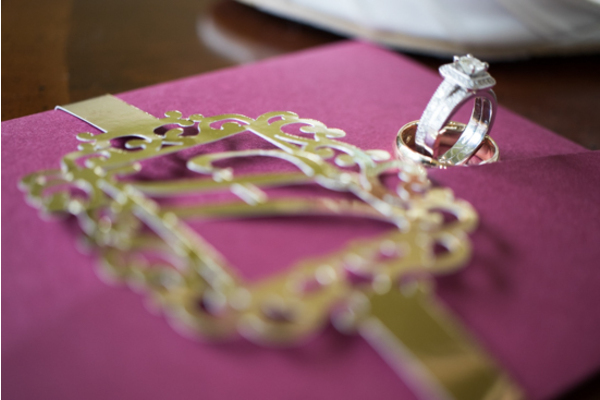 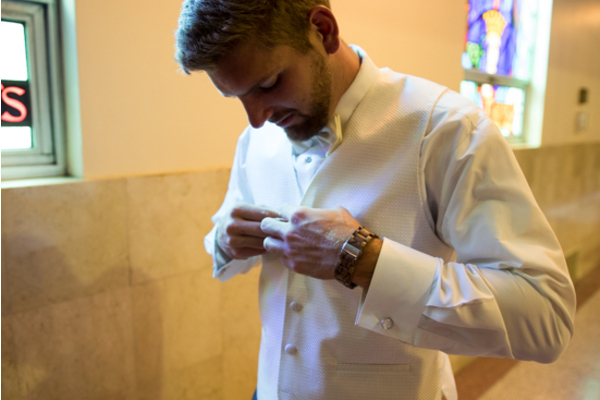 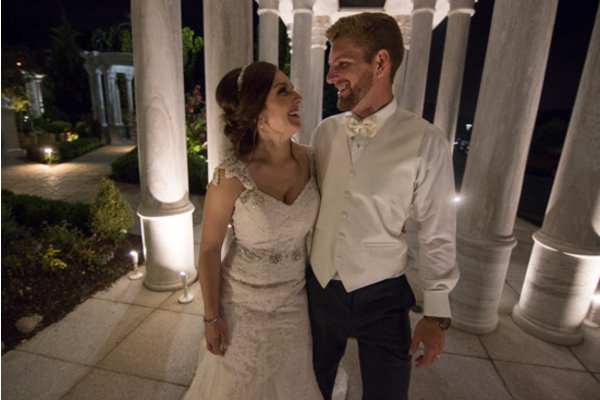 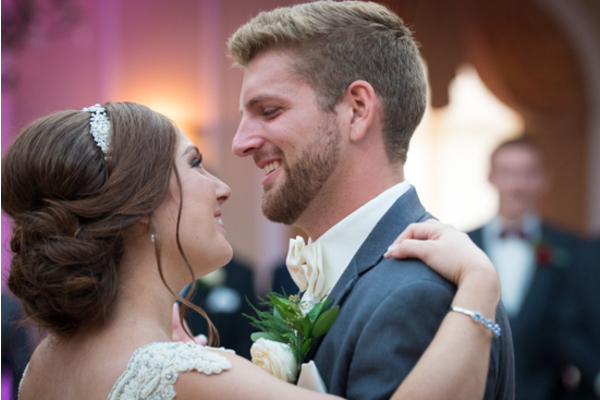 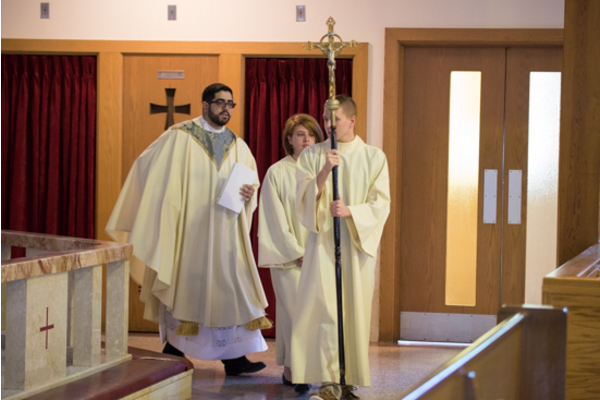 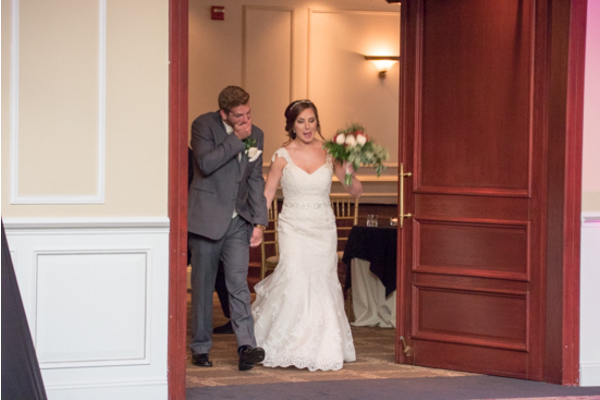 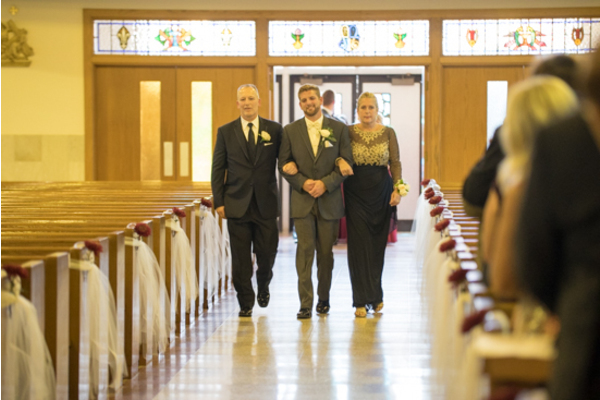 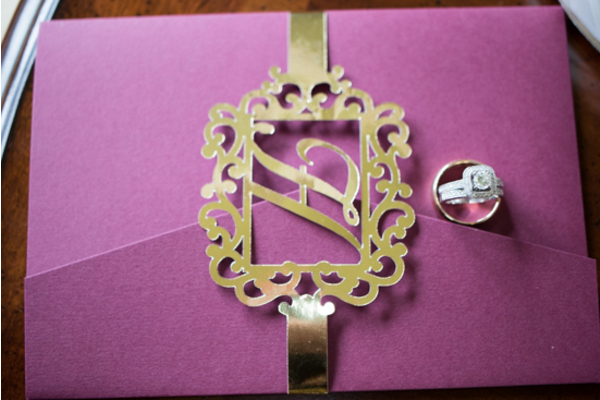 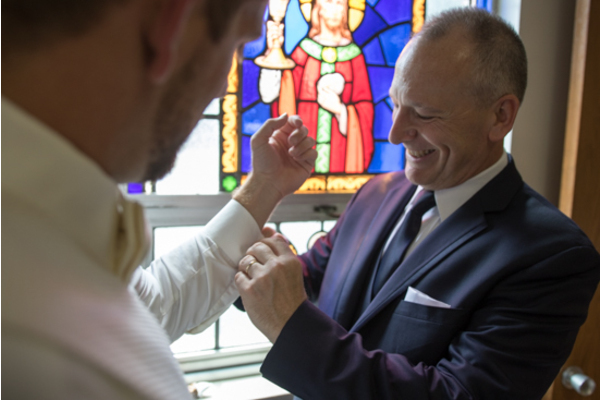 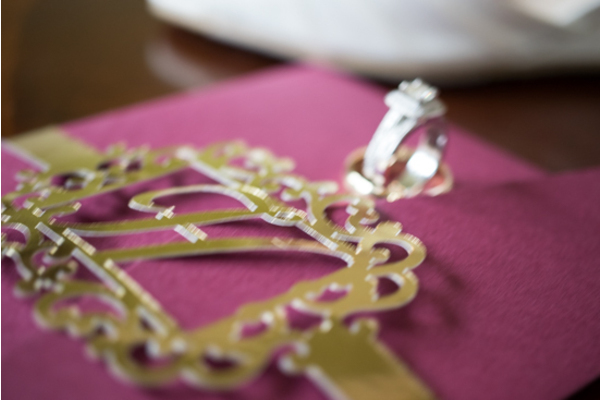 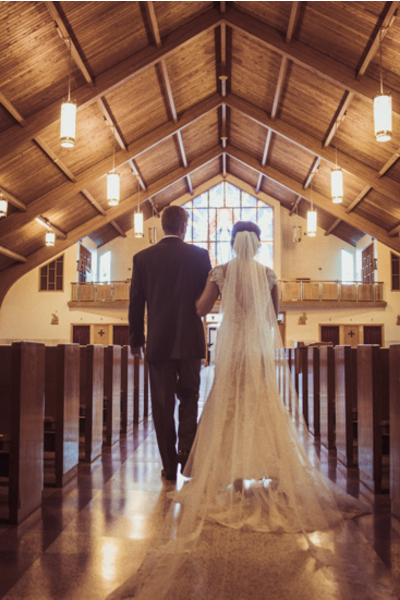 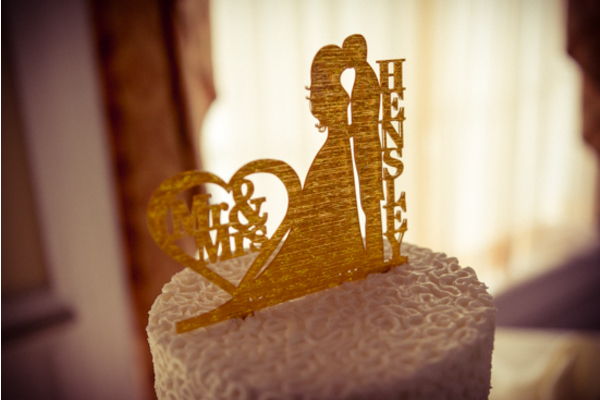 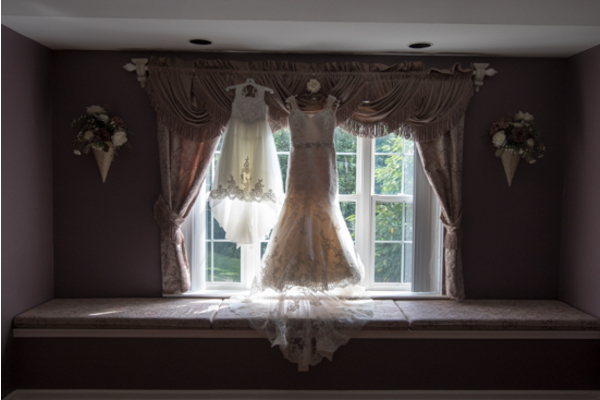 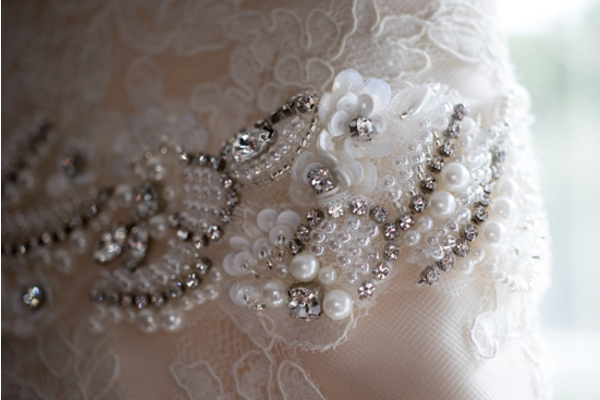 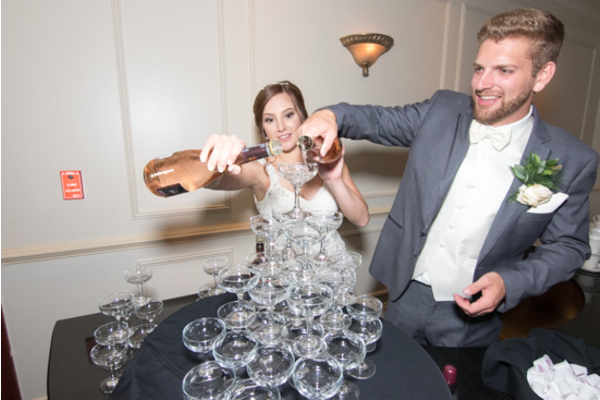 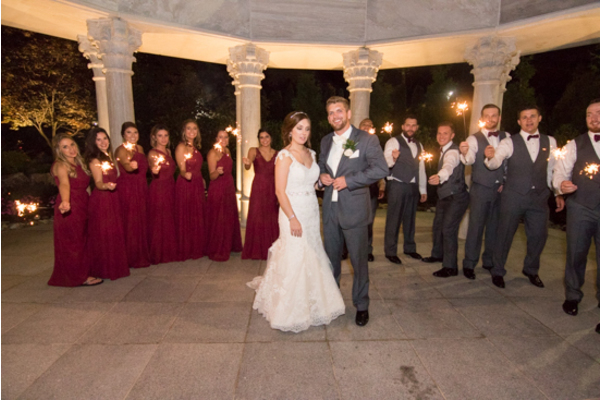 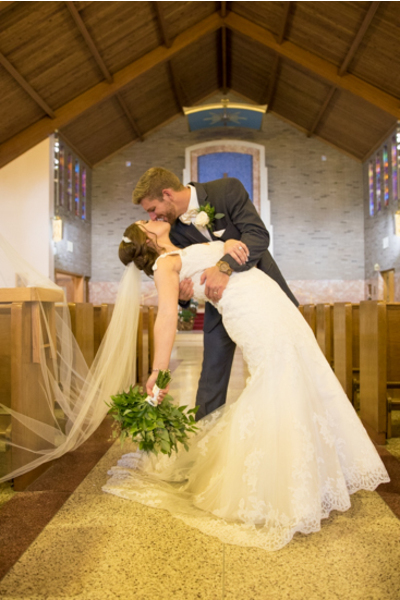 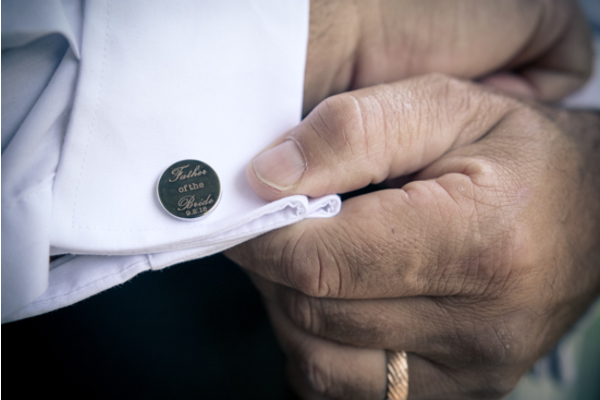 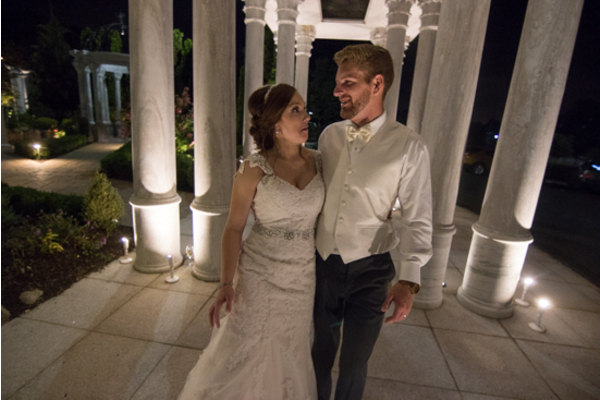 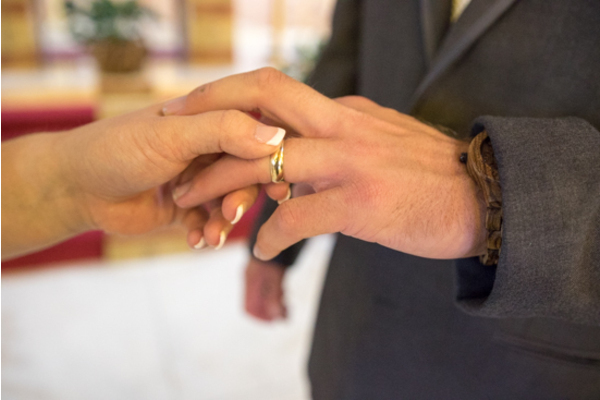 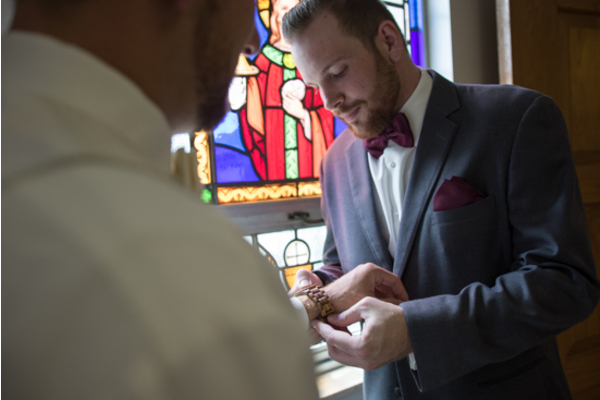 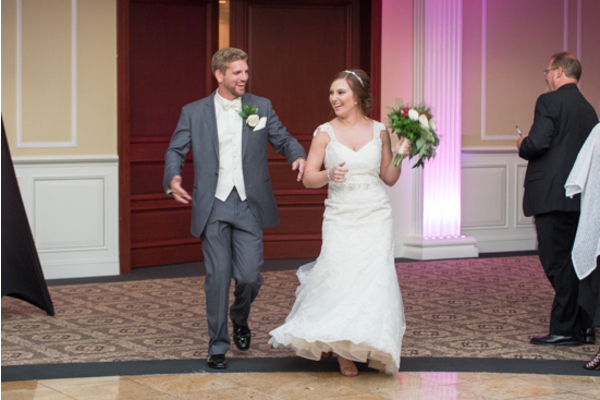 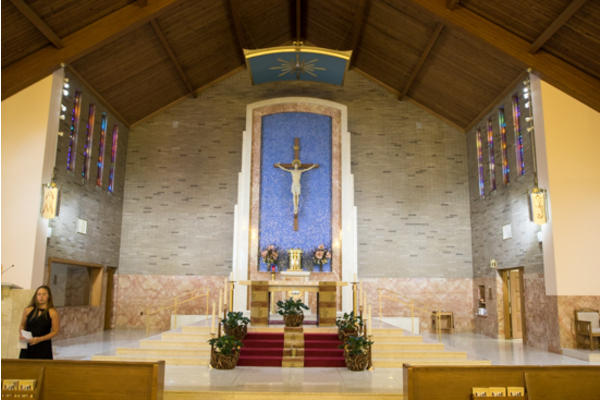 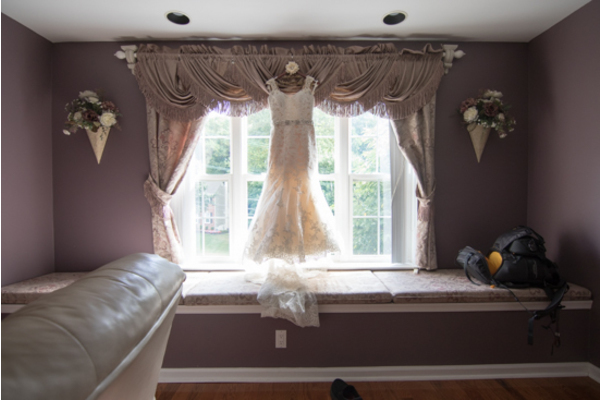 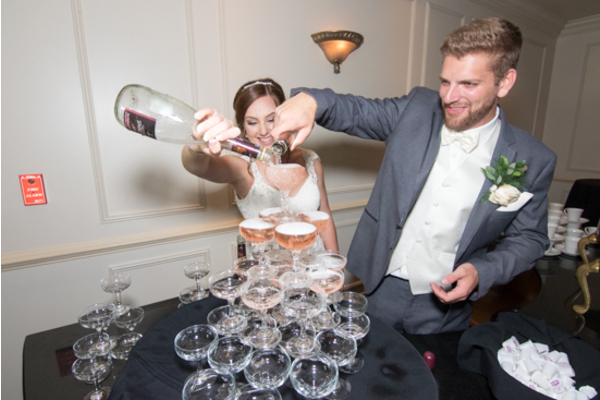 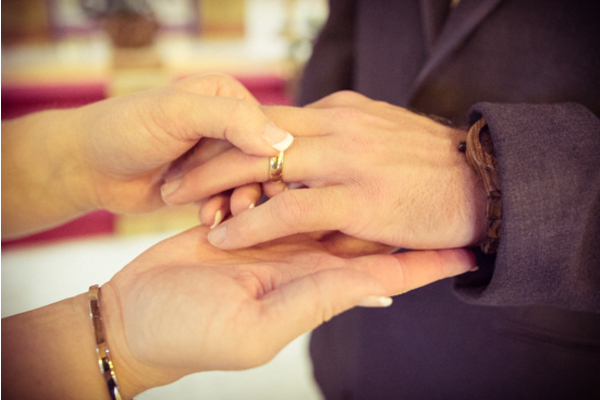 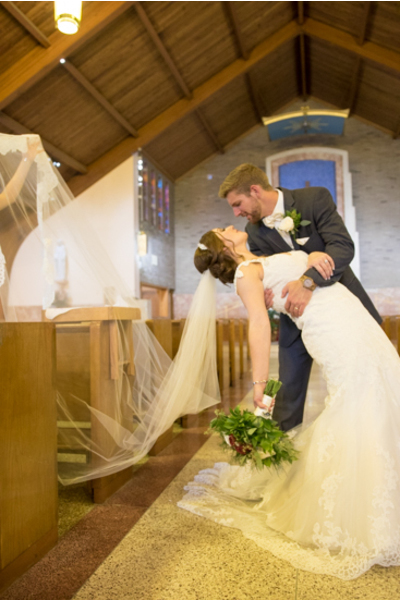 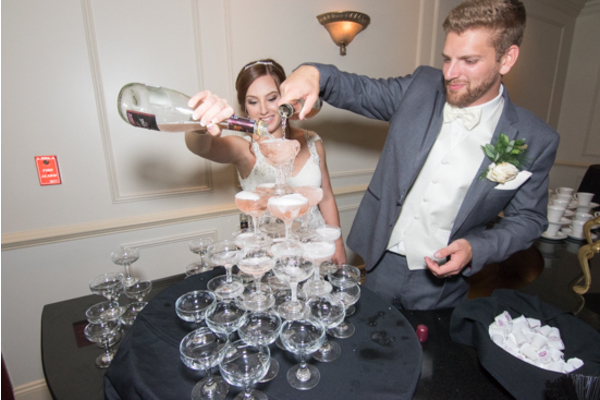 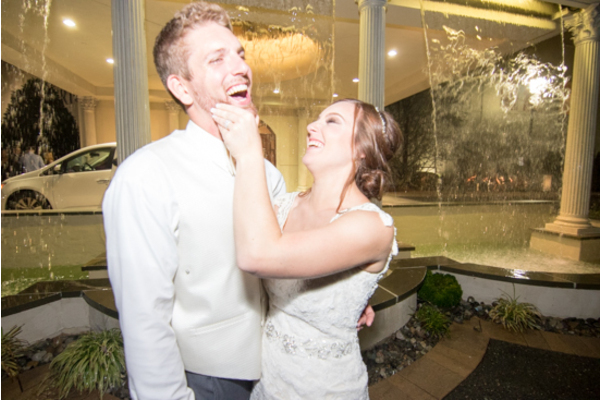 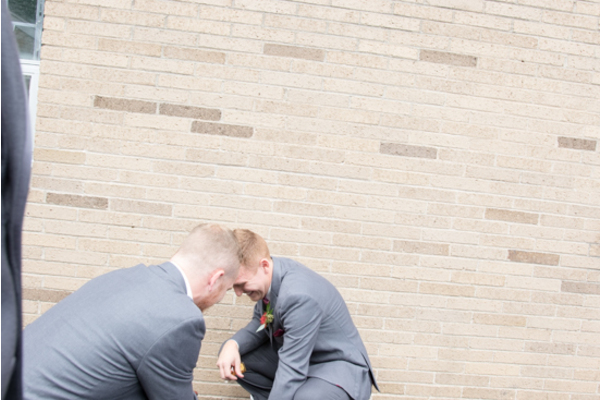 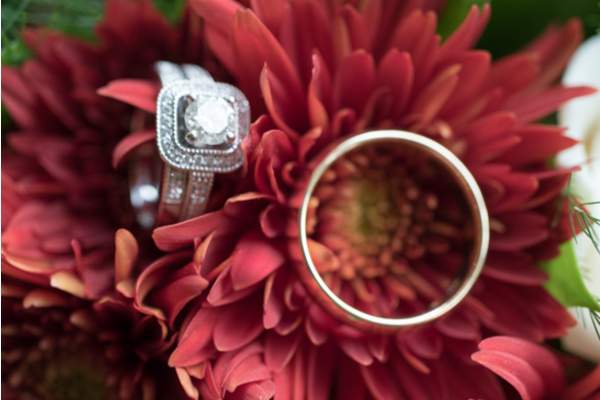 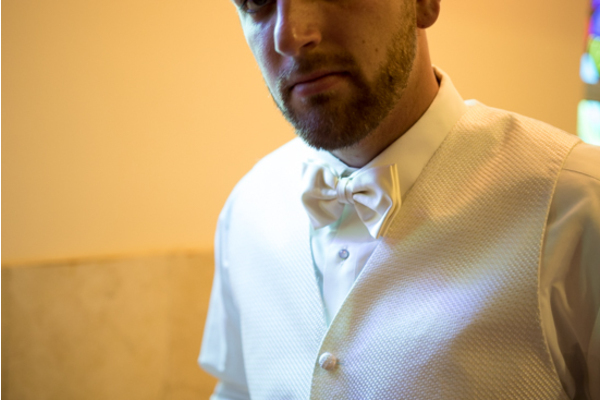 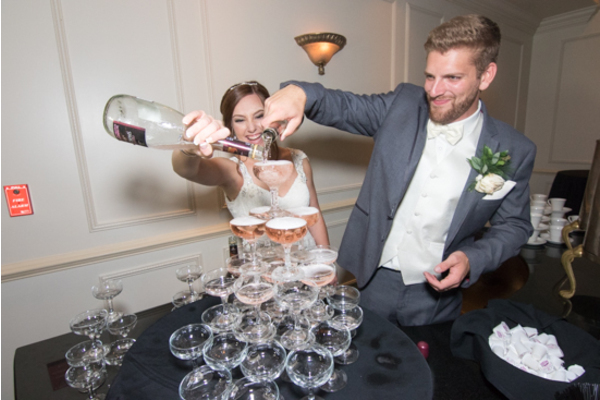 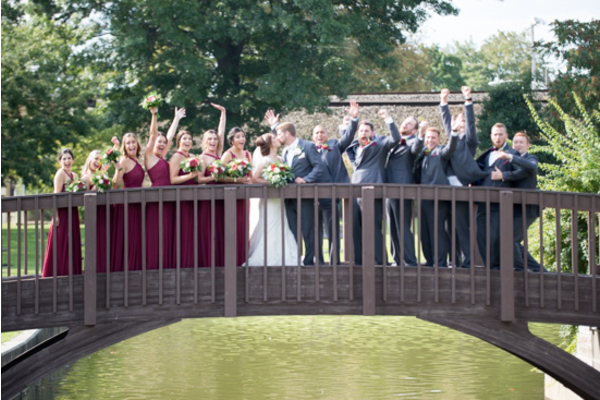 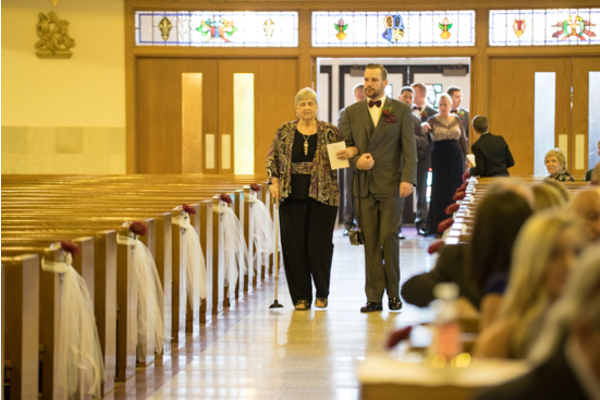 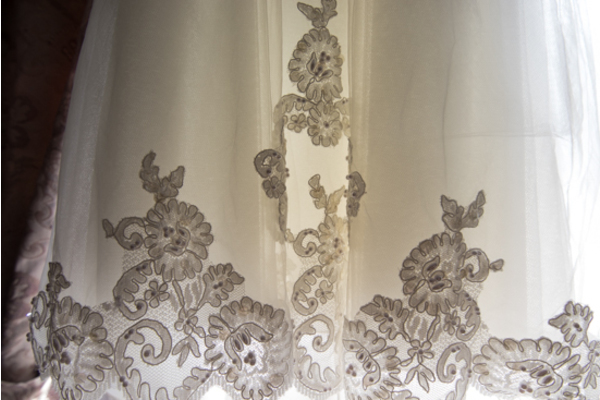 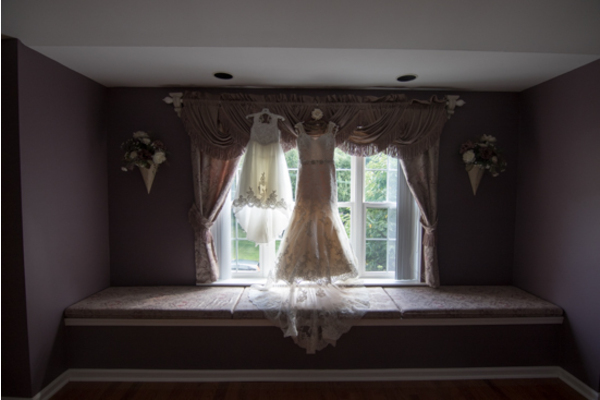 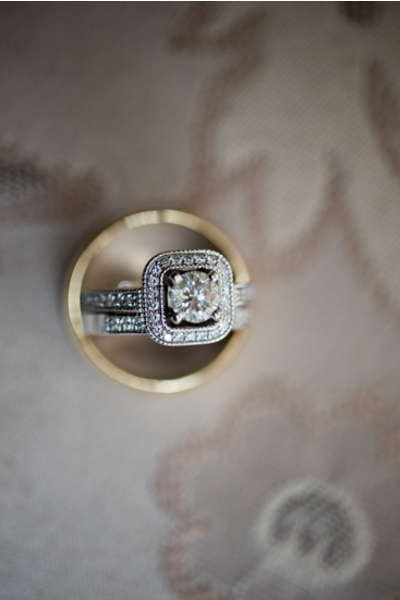 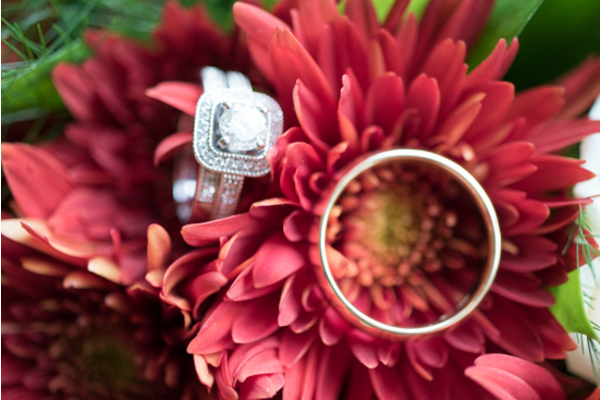 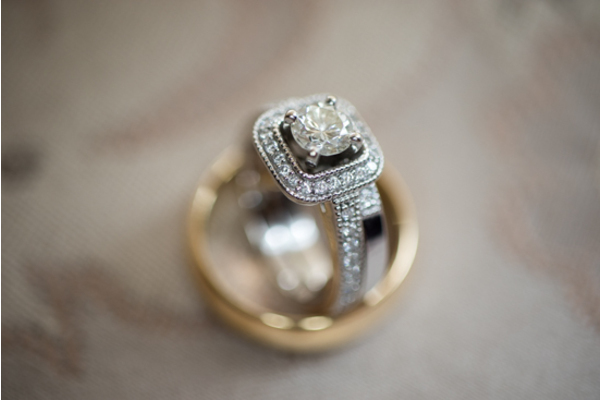 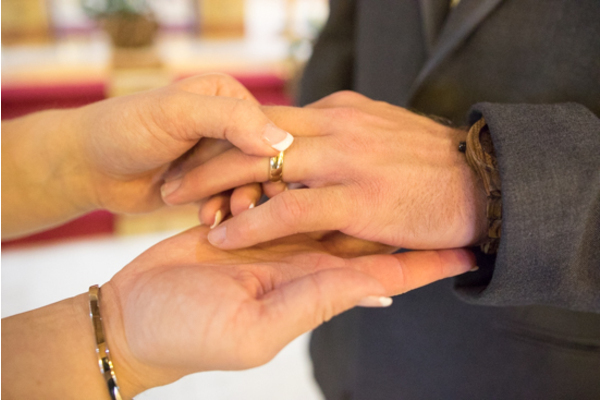 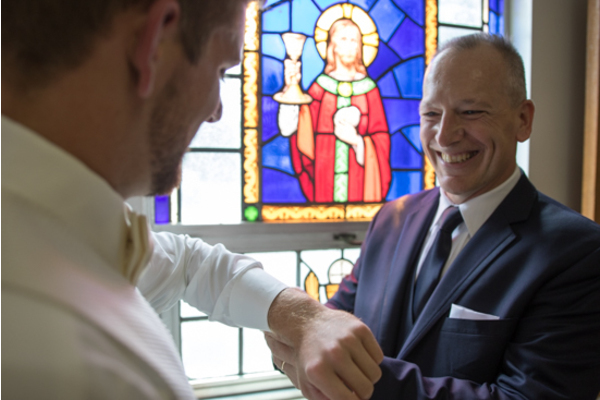 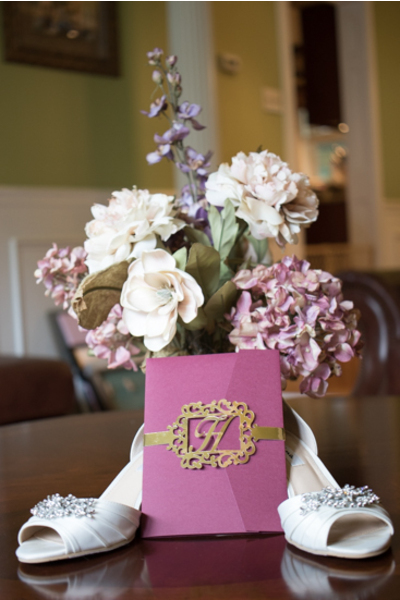 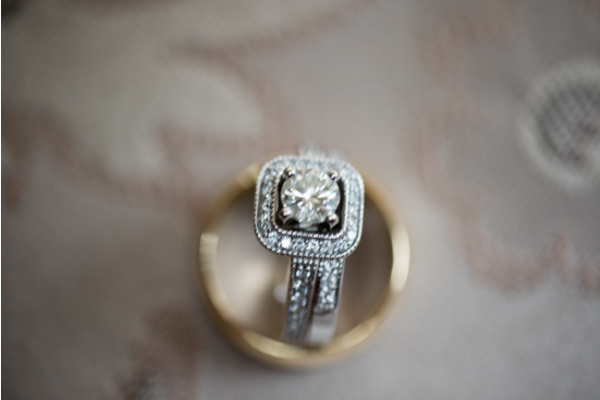 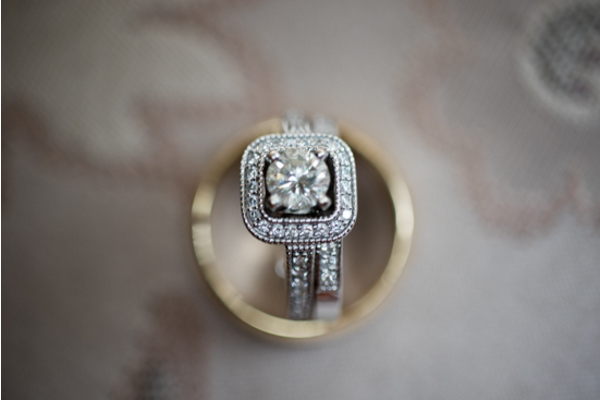 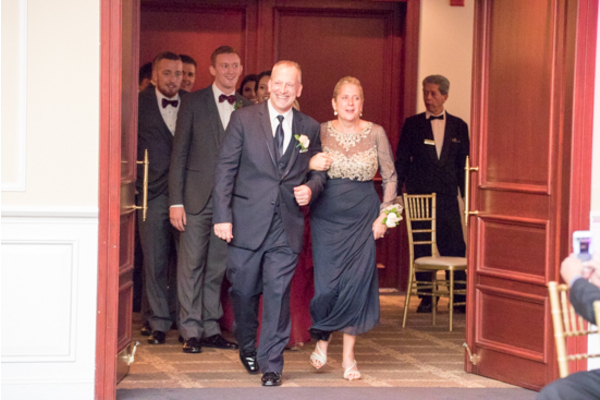 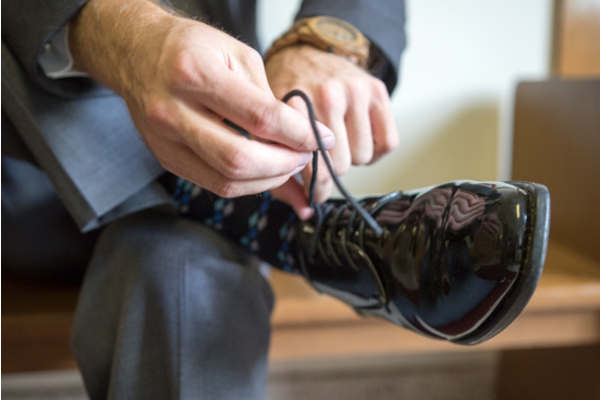 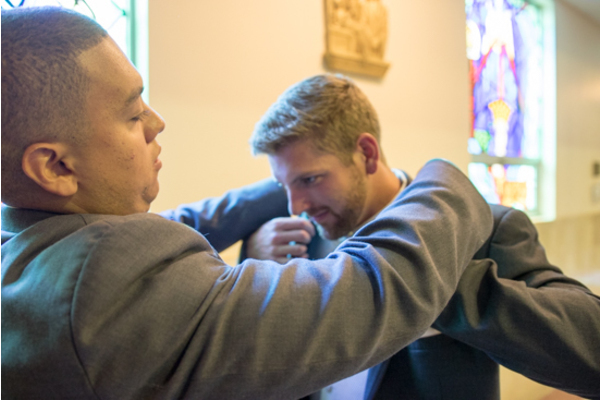 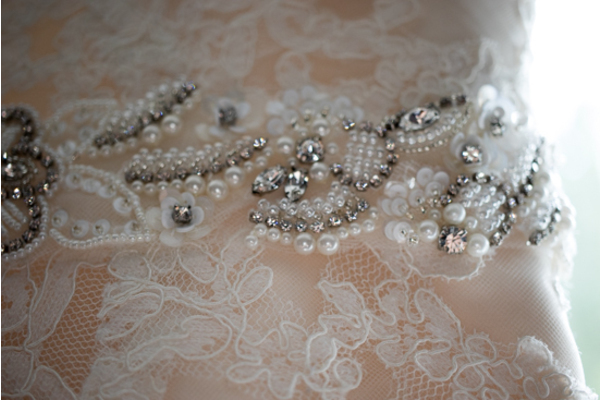 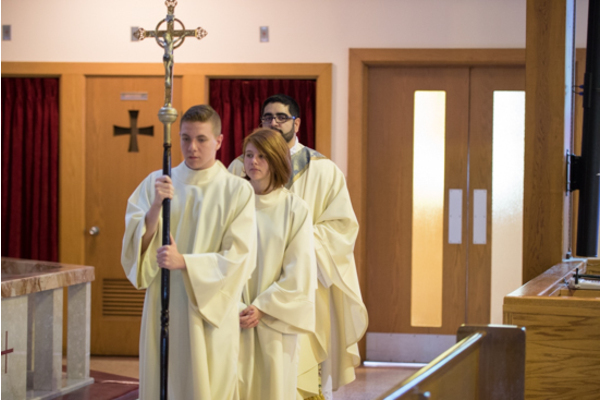 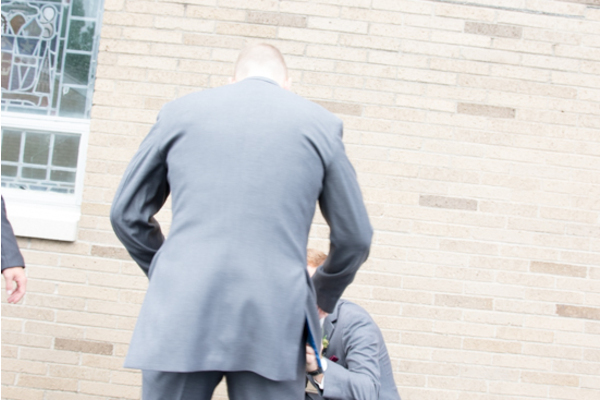 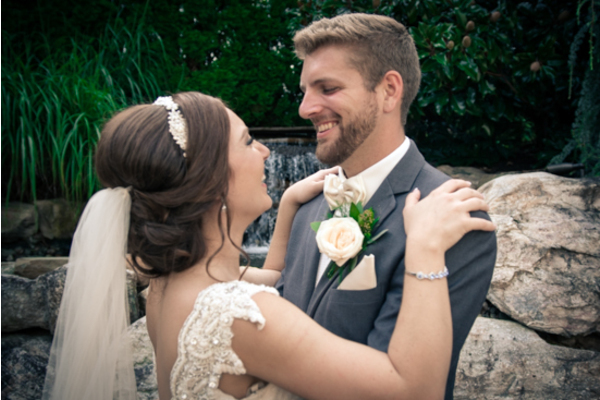 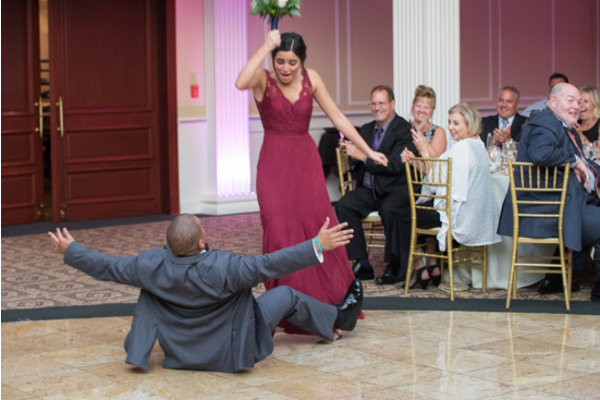 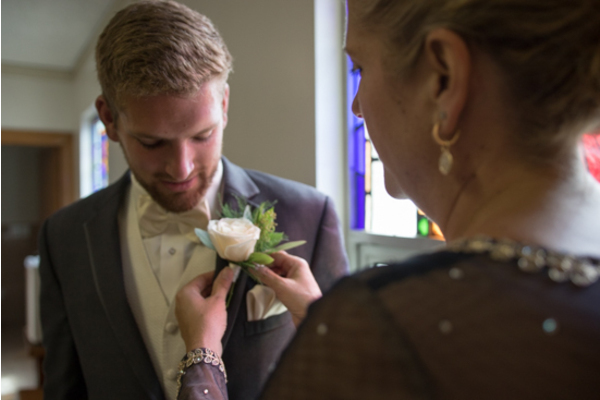 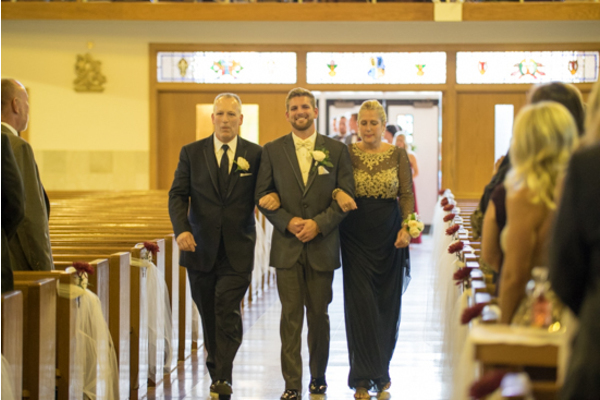 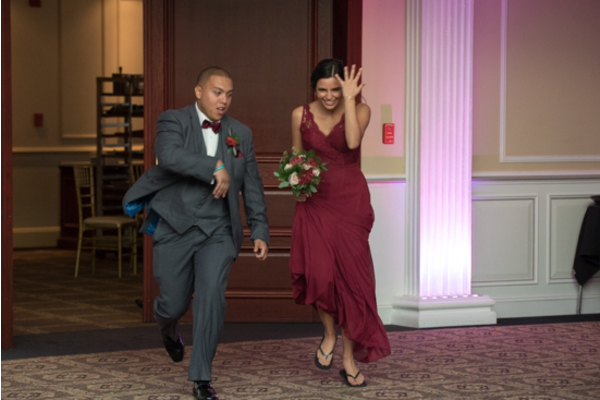 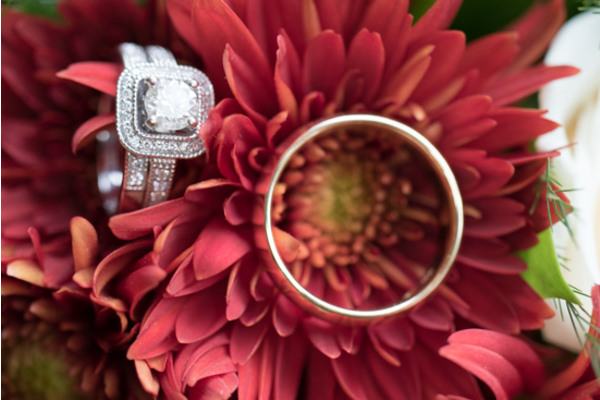 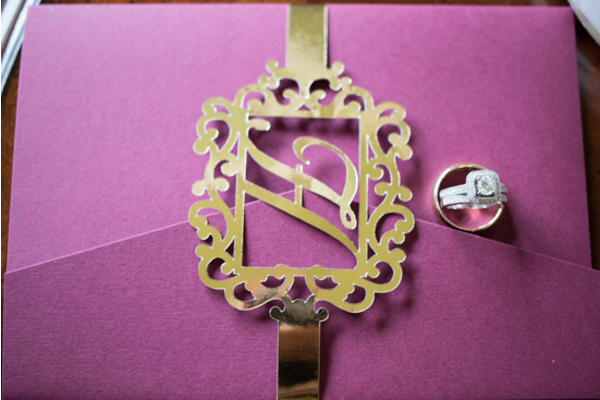 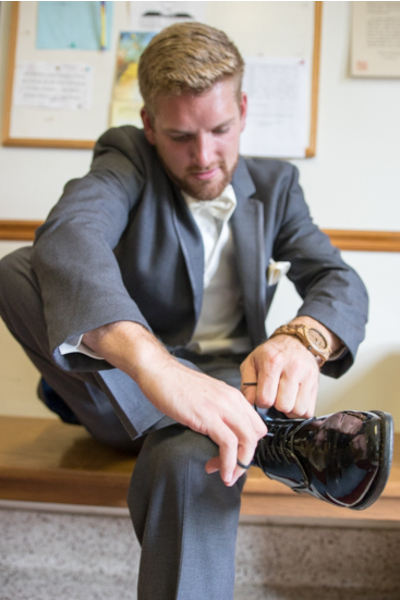 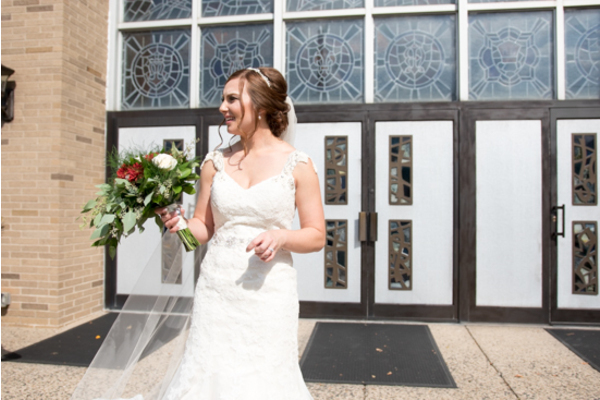 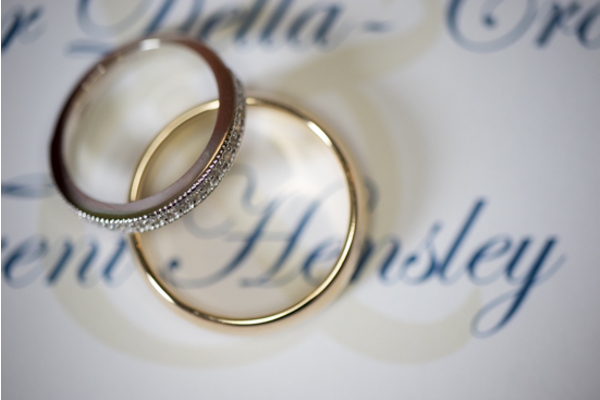 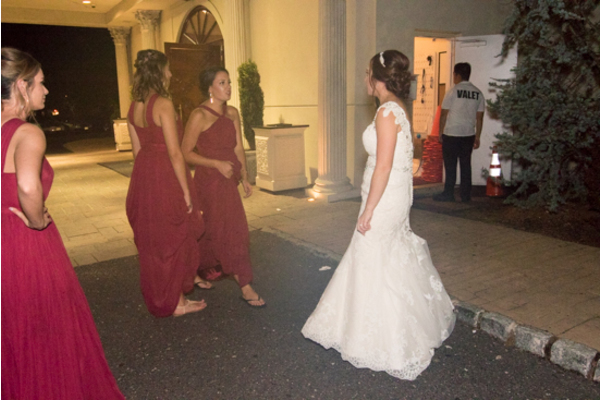 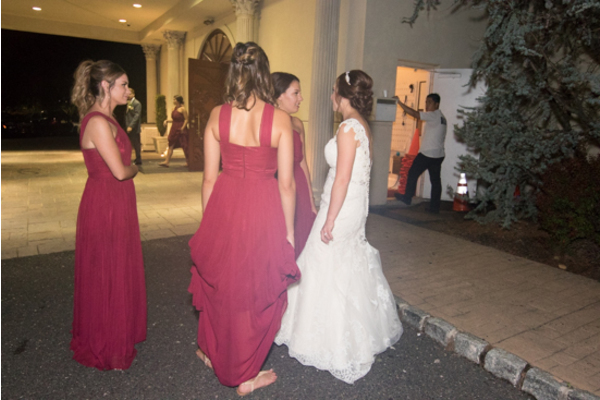 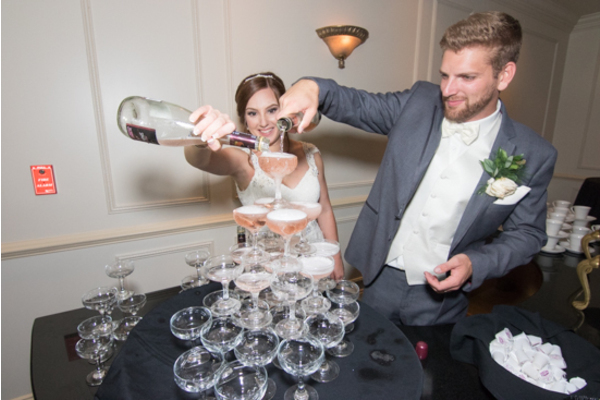 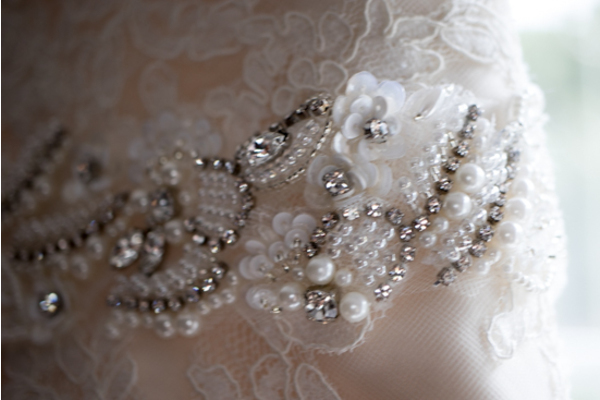 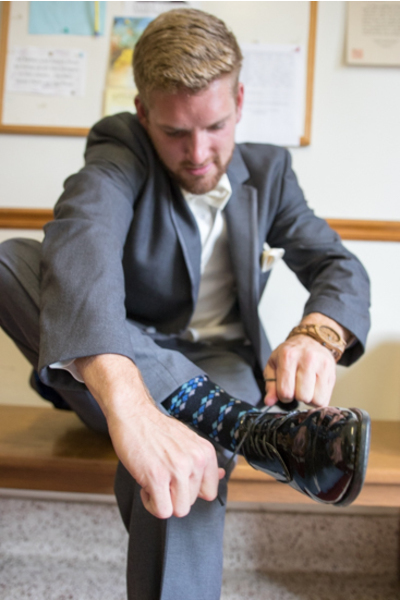 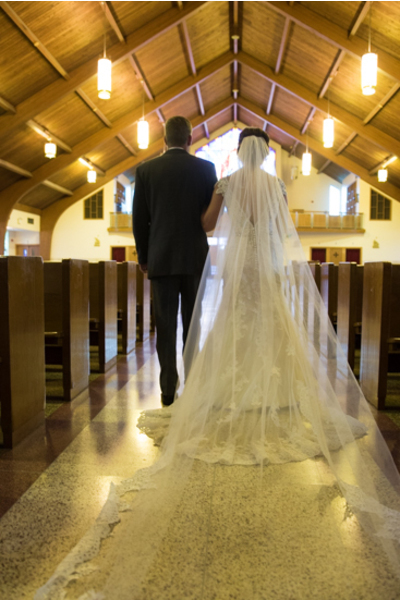 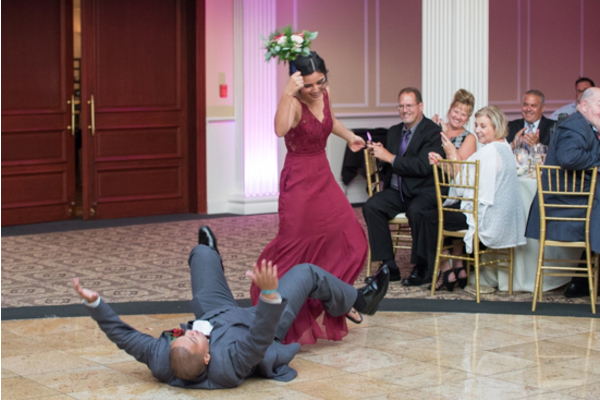 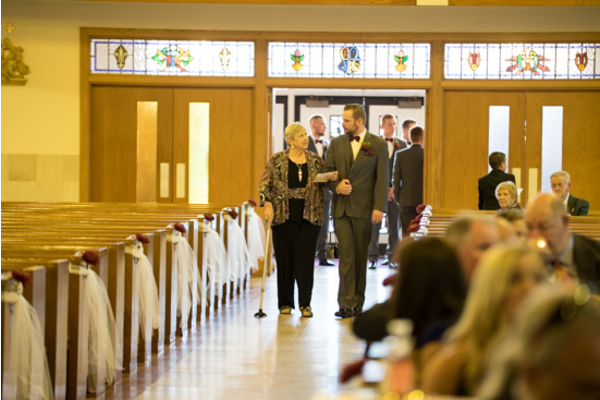 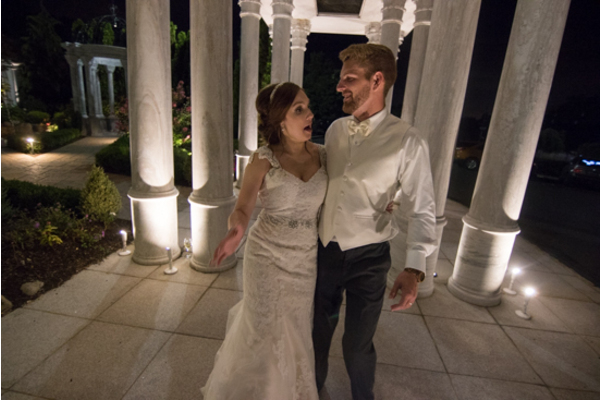 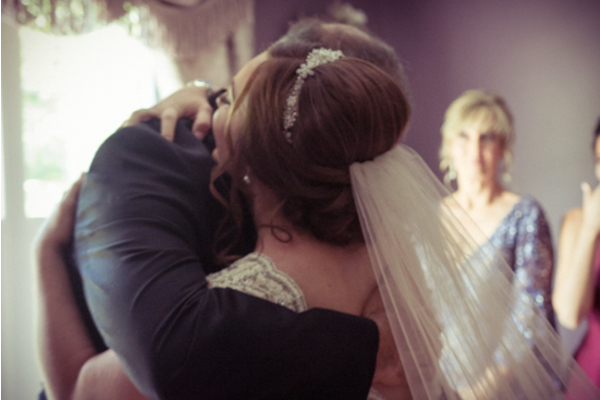 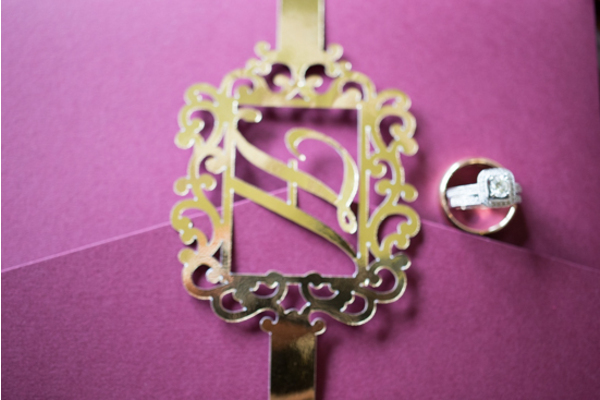 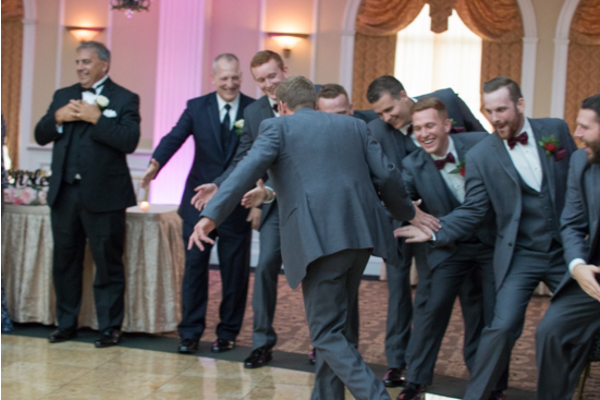 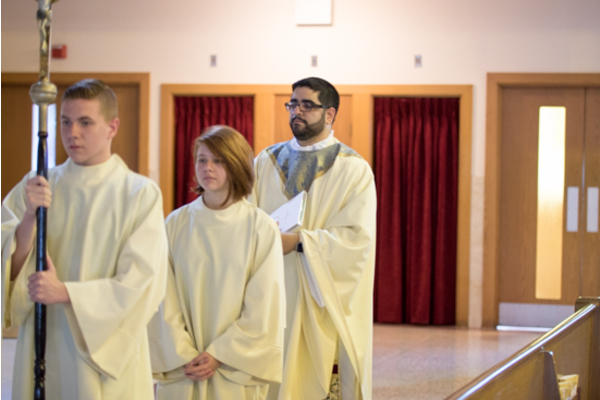 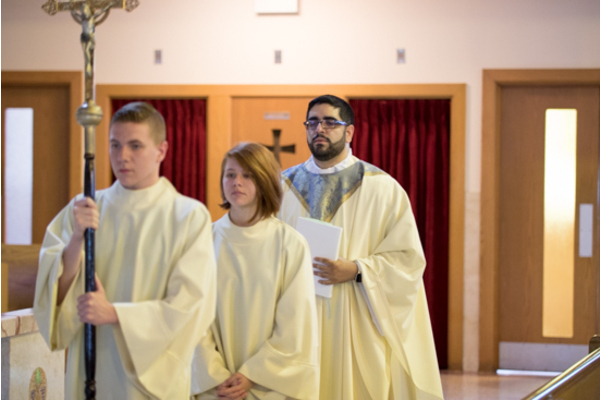 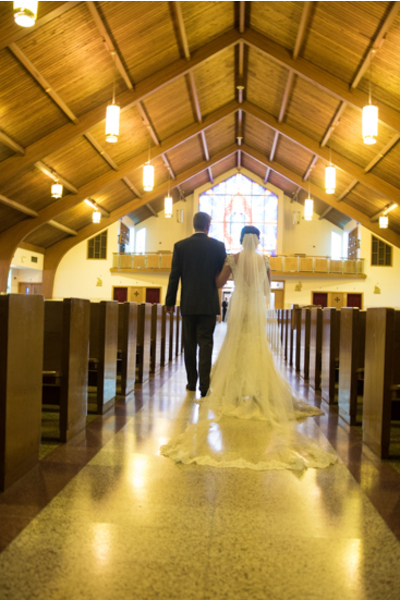 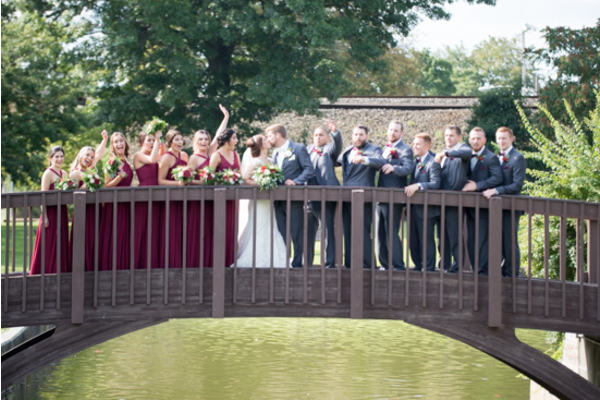 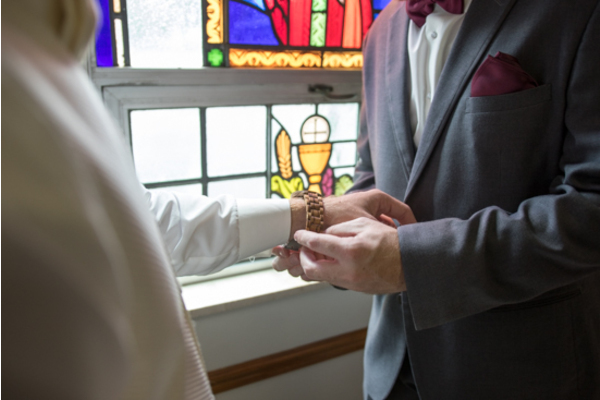 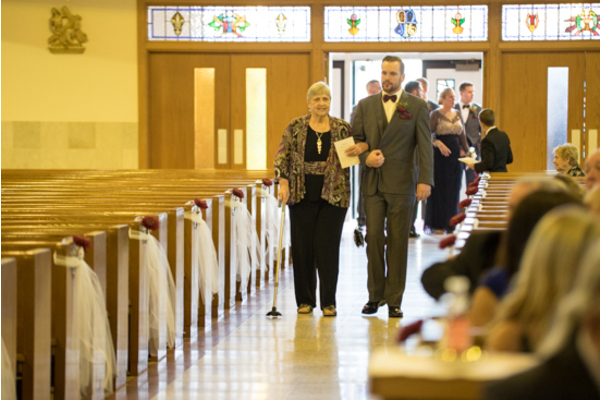 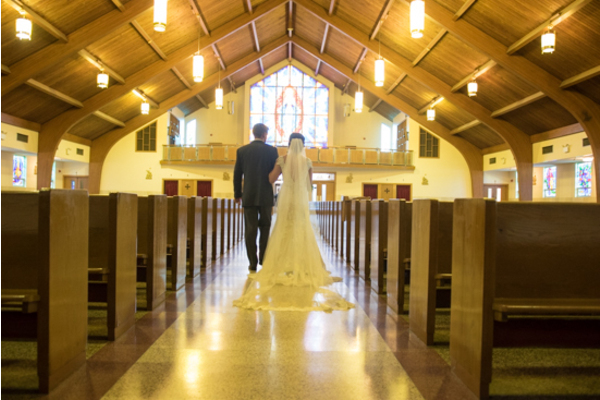 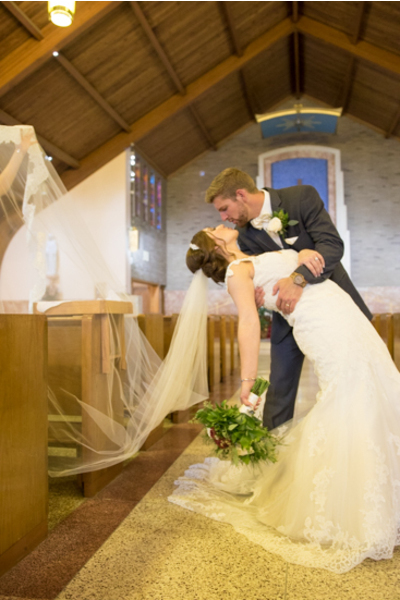 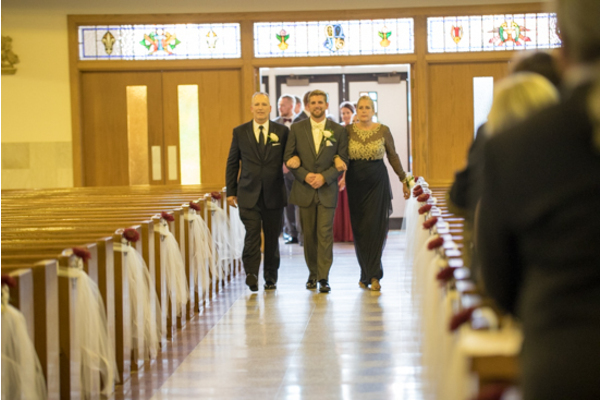 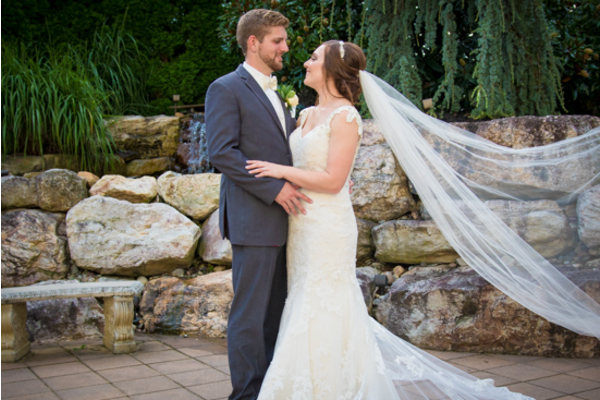 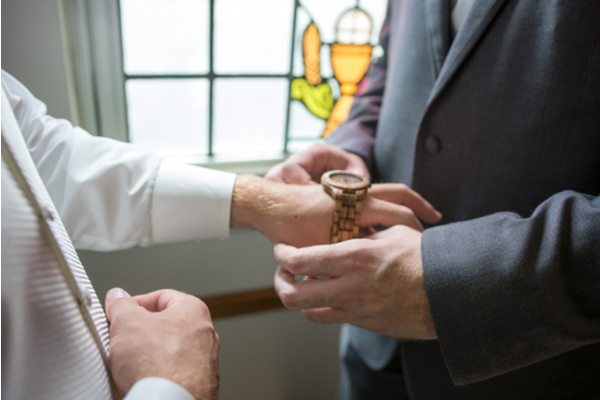 As they got ready for this memorable day, our NJ Wedding Photographer captured these moments. 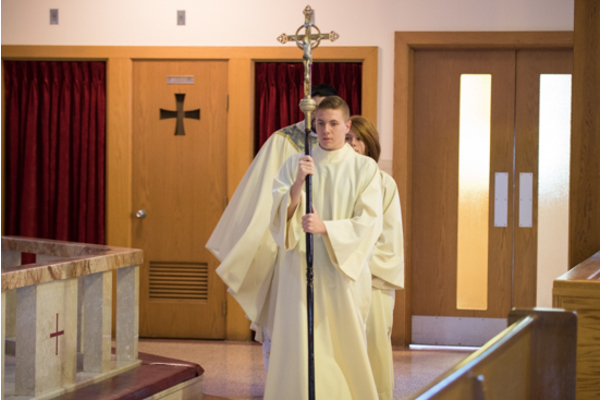 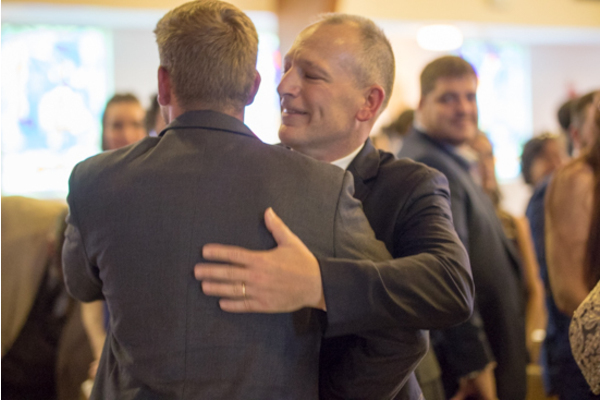 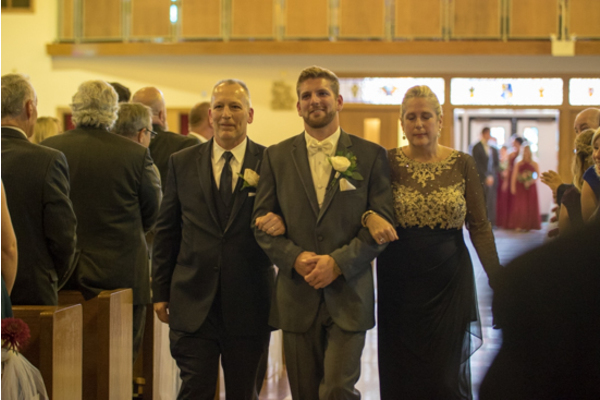 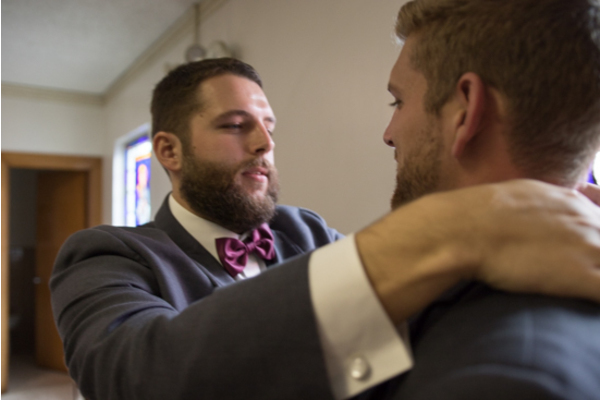 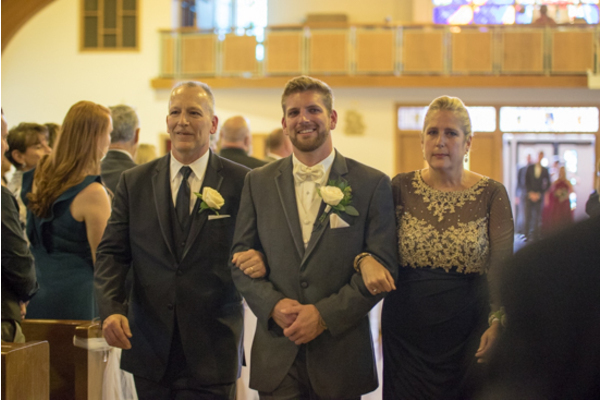 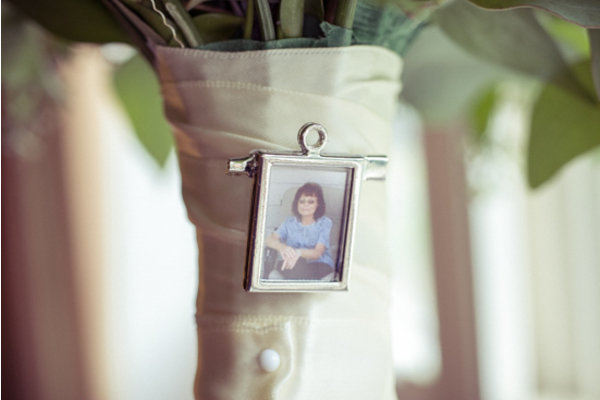 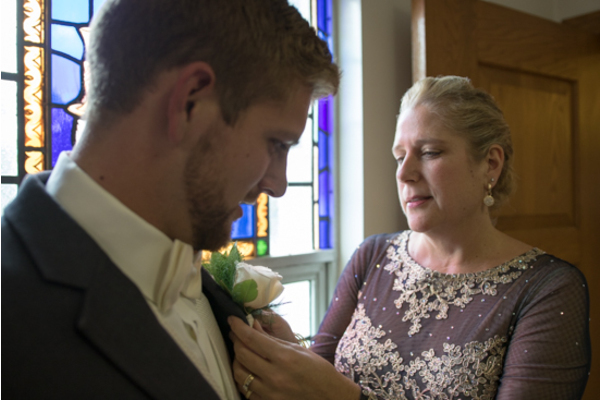 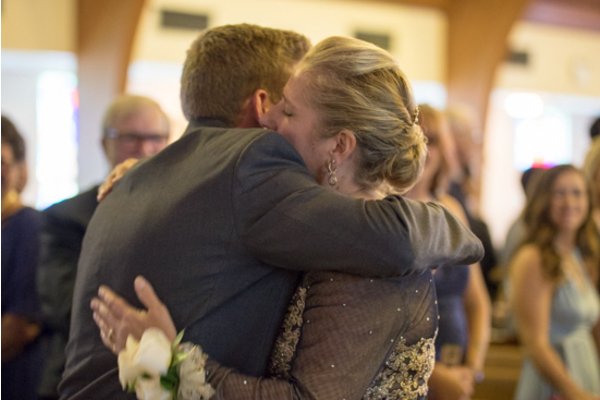 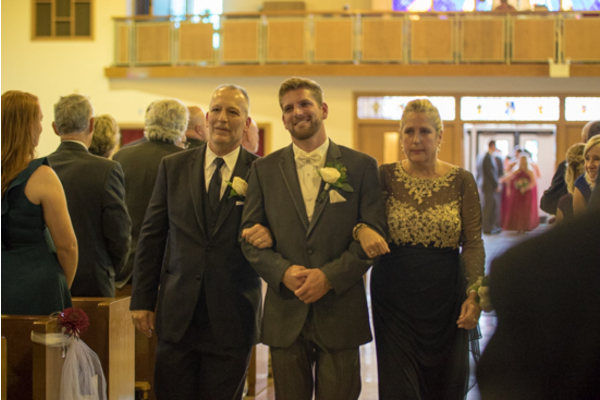 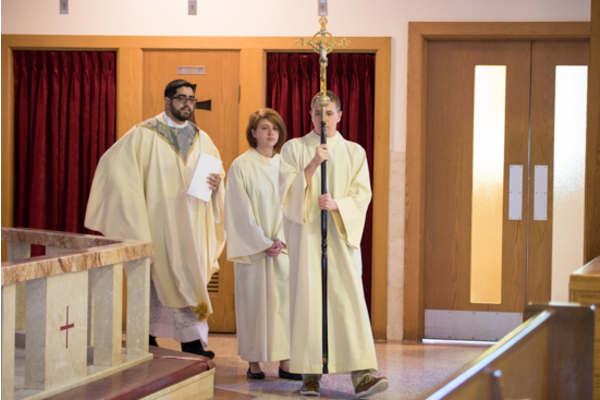 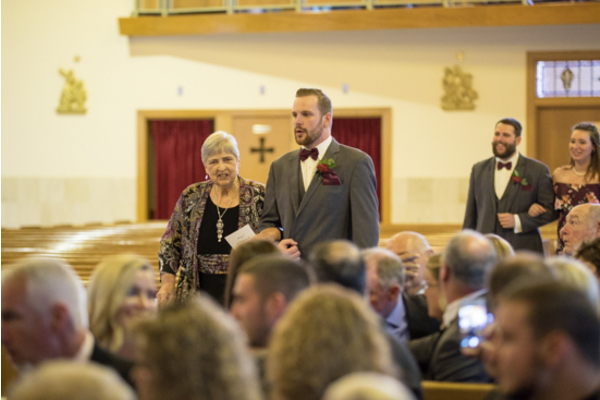 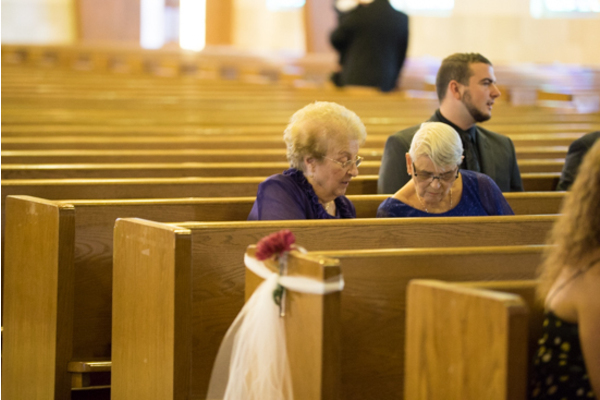 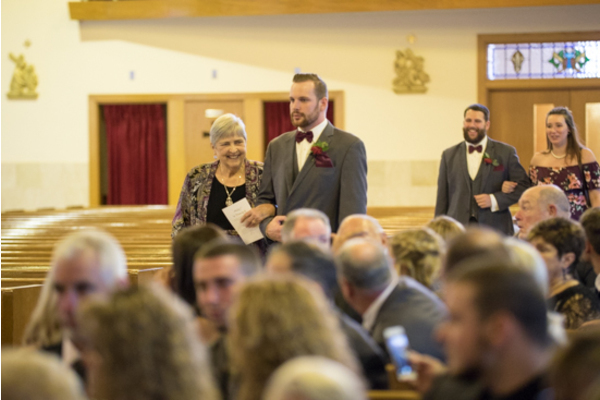 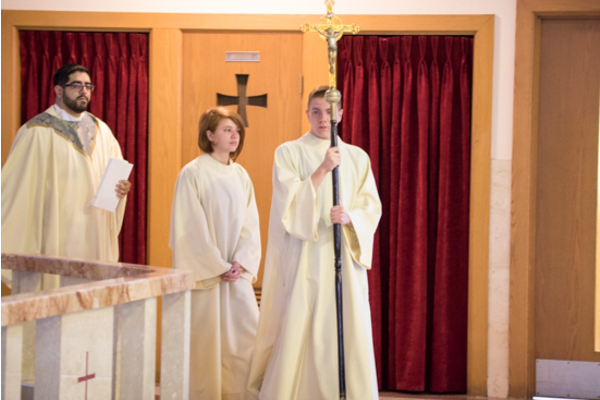 Next, she joined Trent, as family and friends gathered at the ceremony. 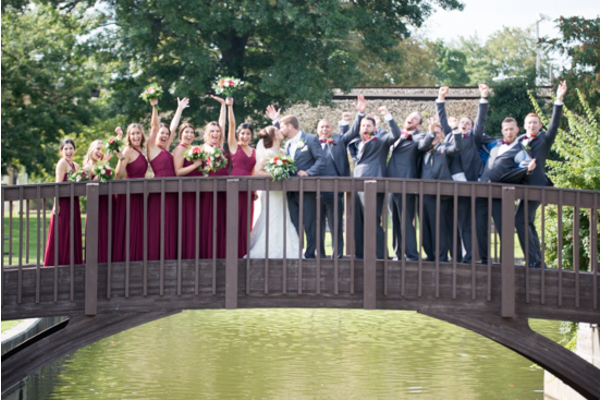 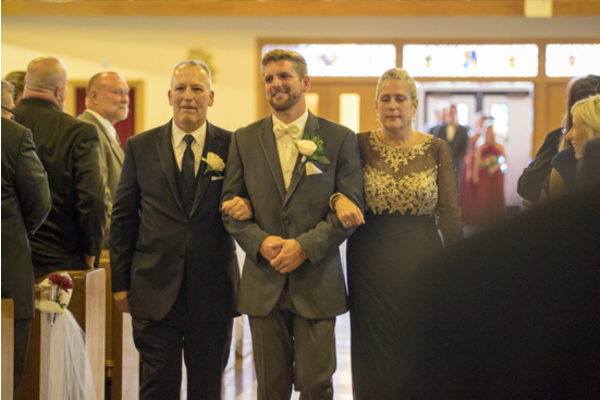 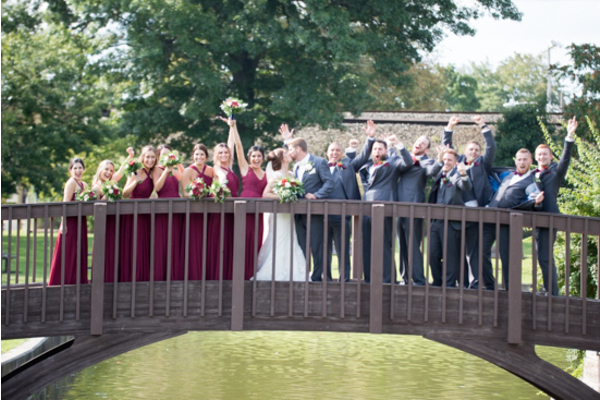 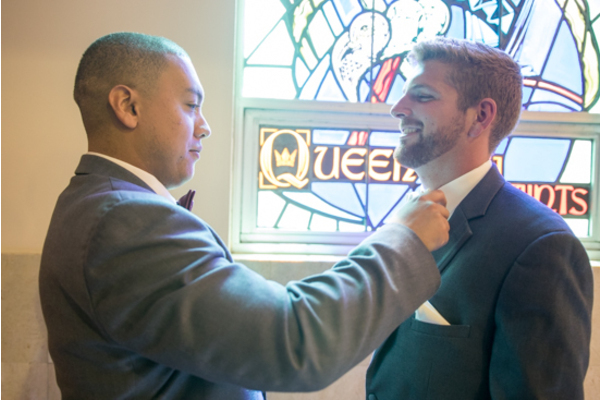 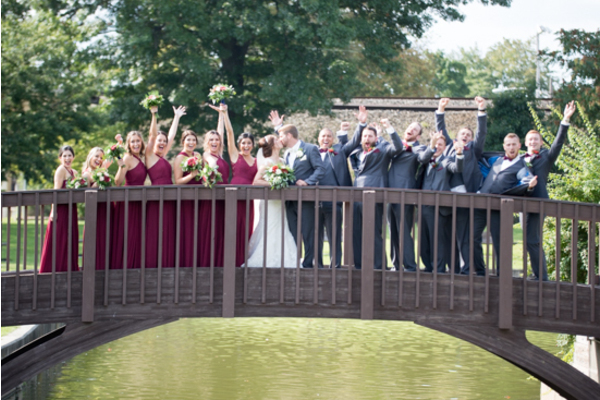 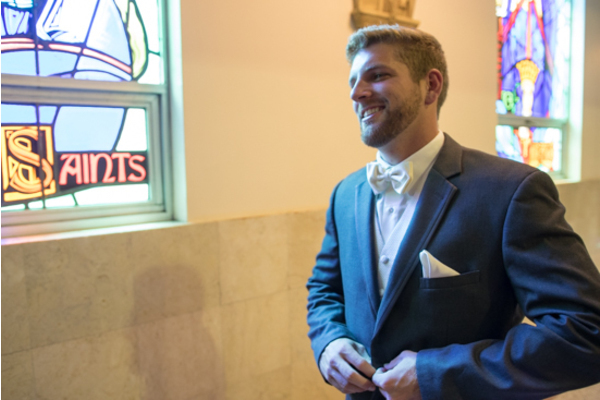 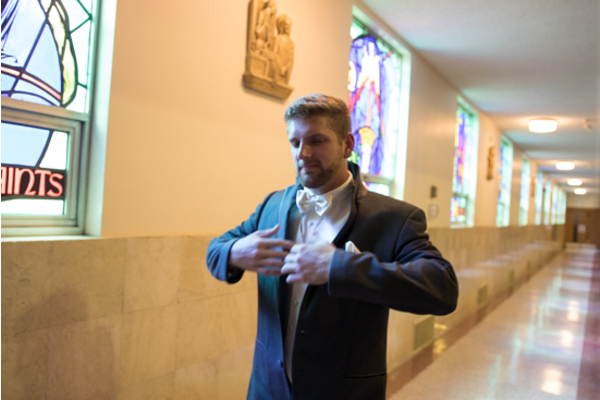 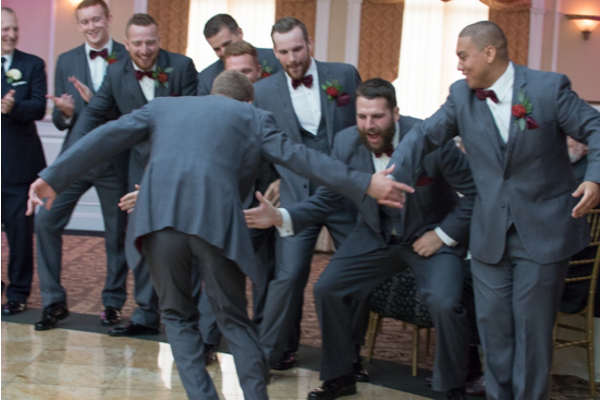 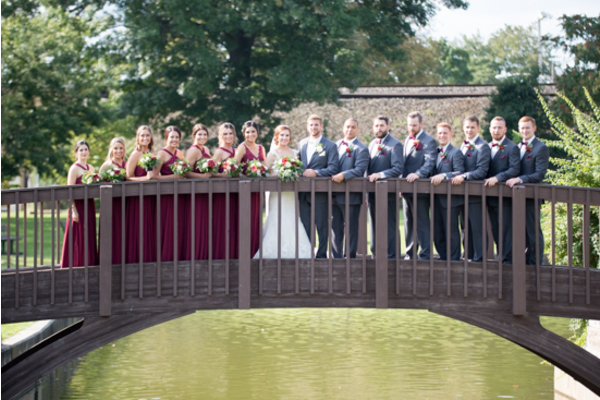 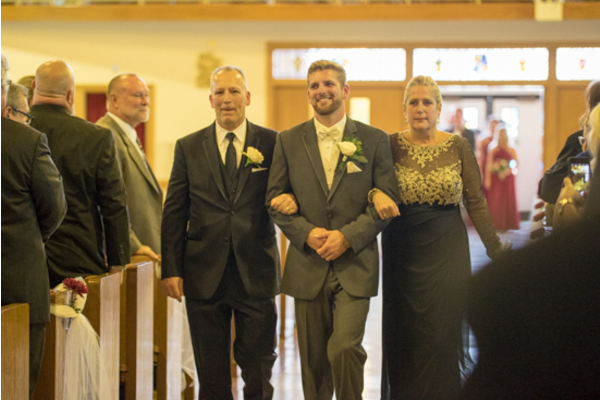 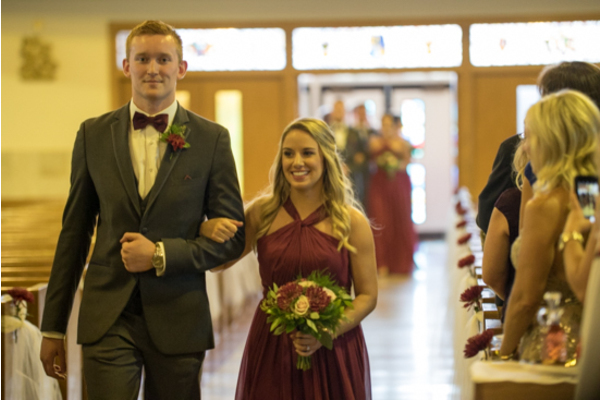 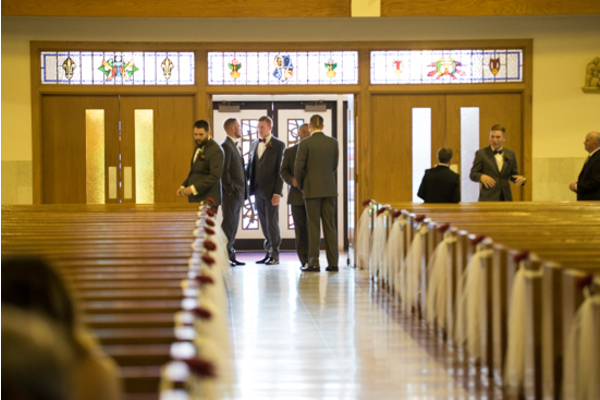 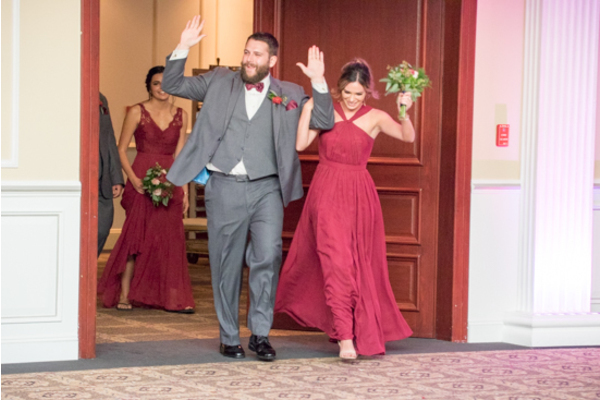 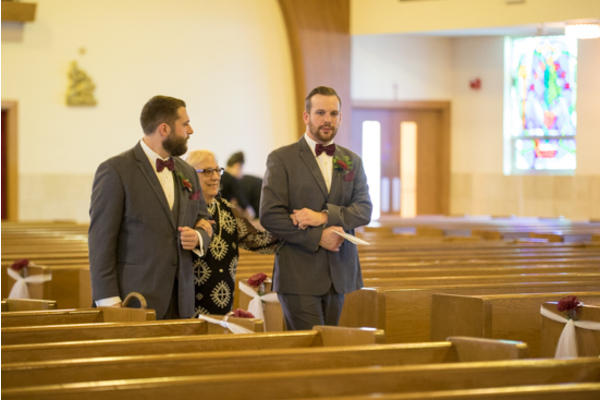 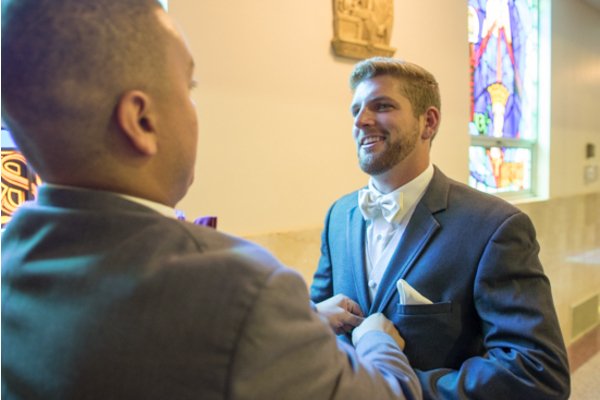 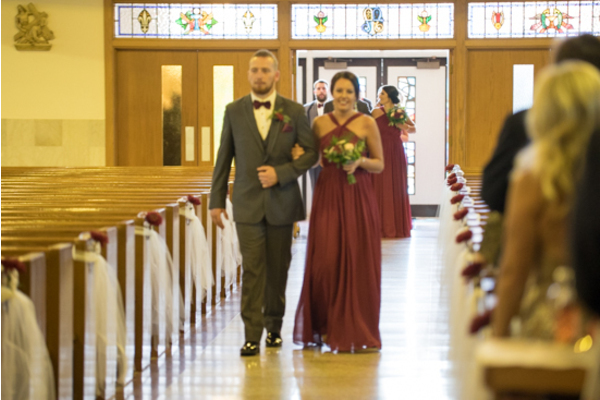 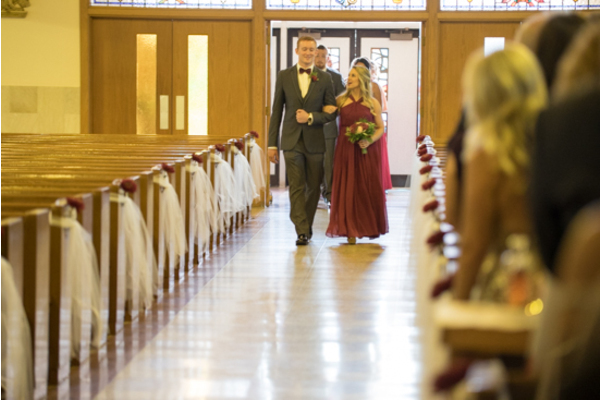 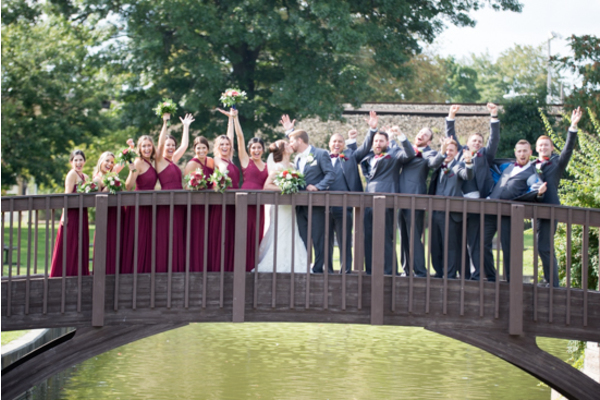 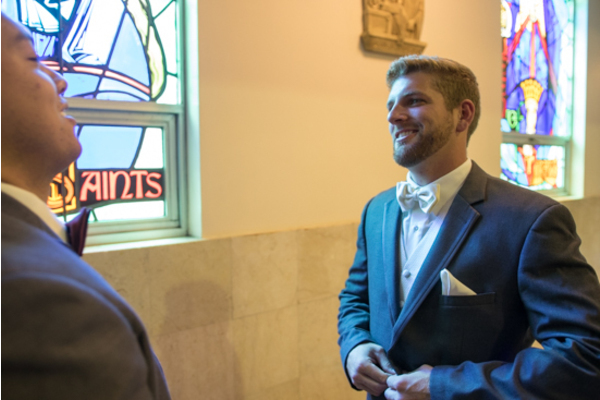 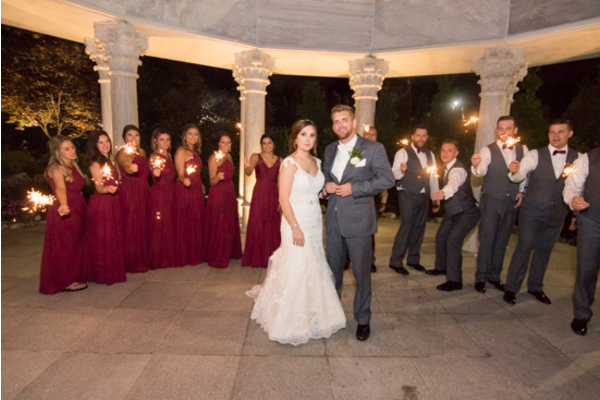 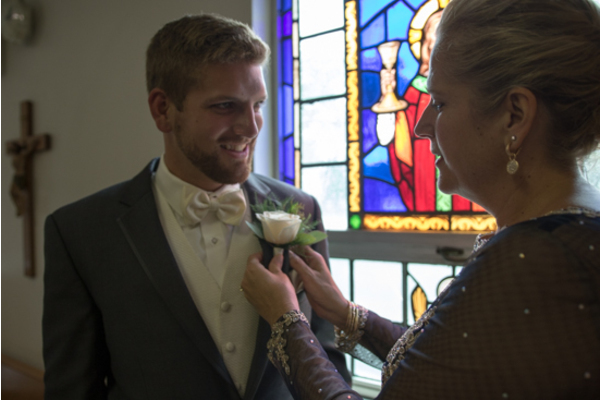 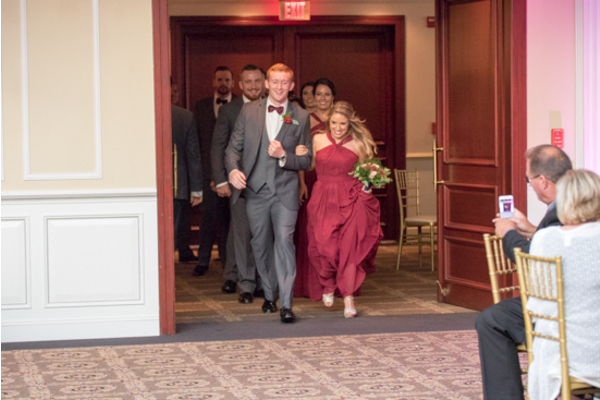 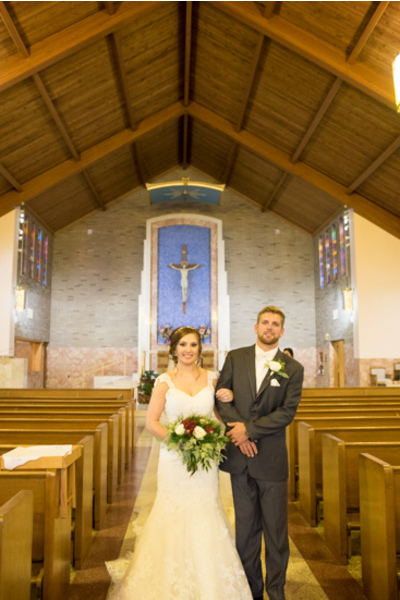 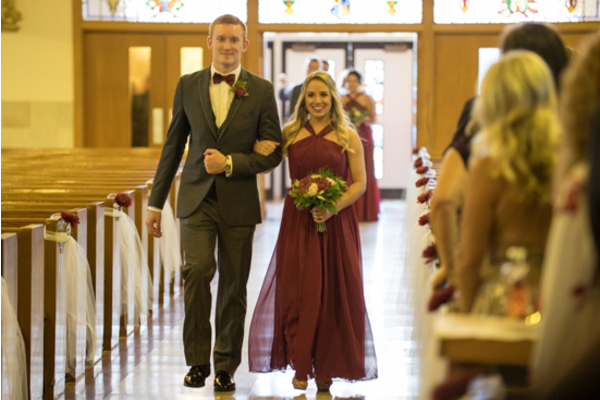 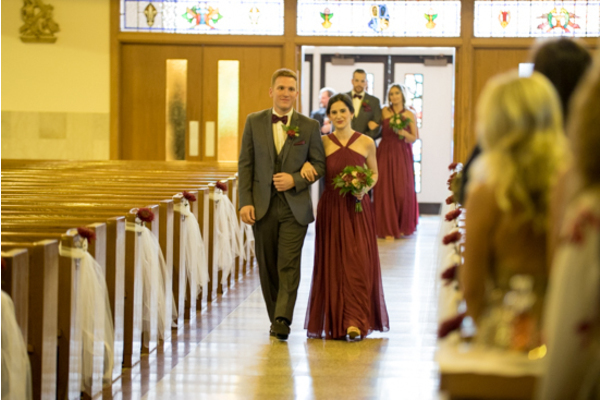 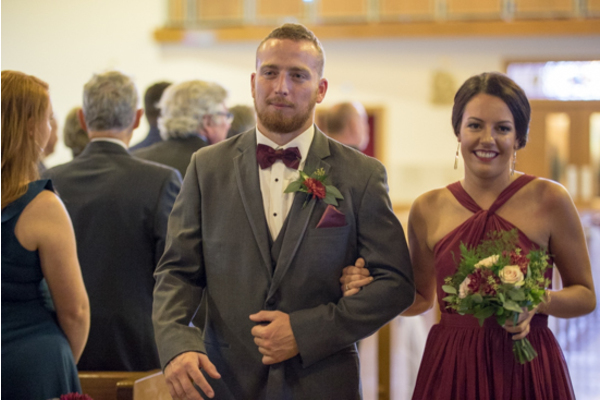 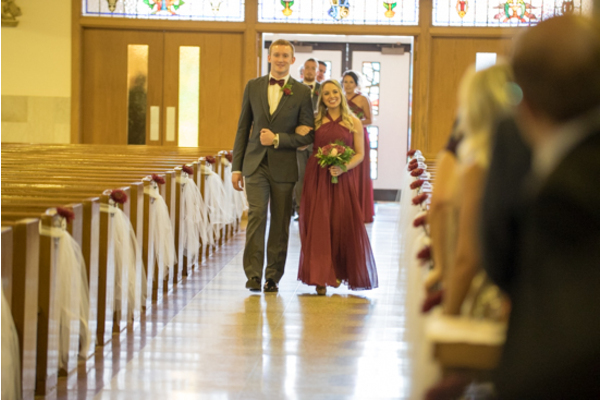 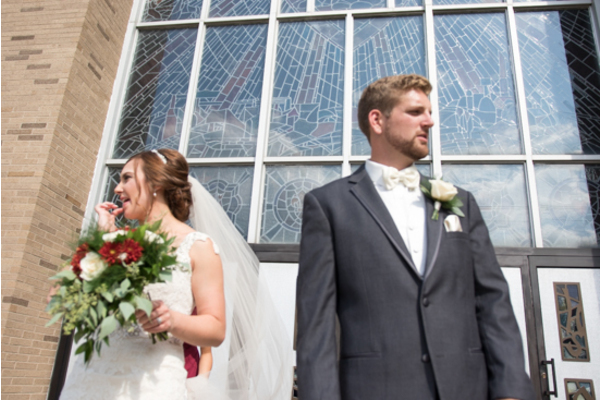 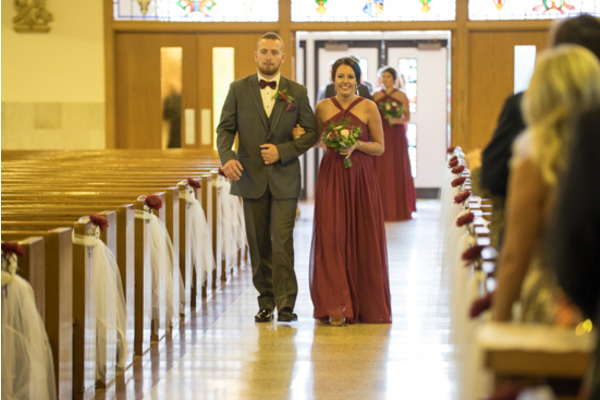 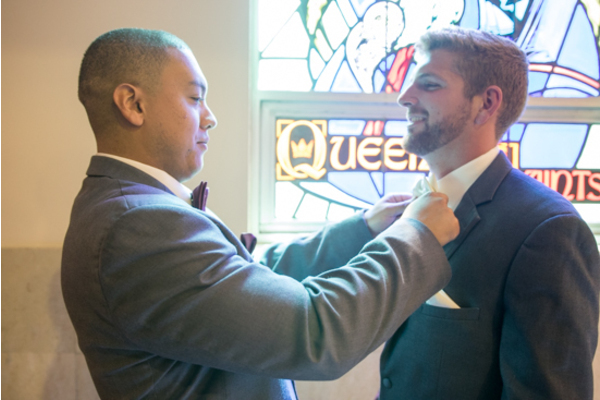 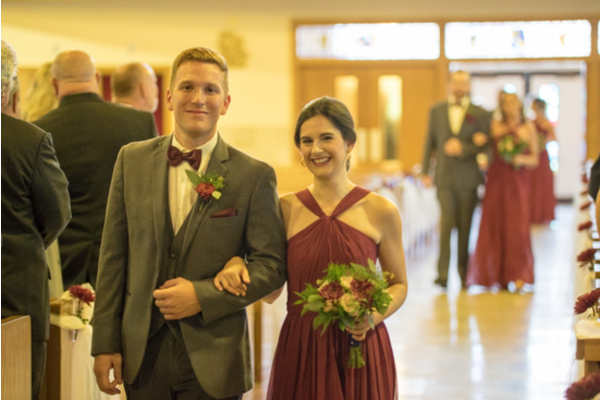 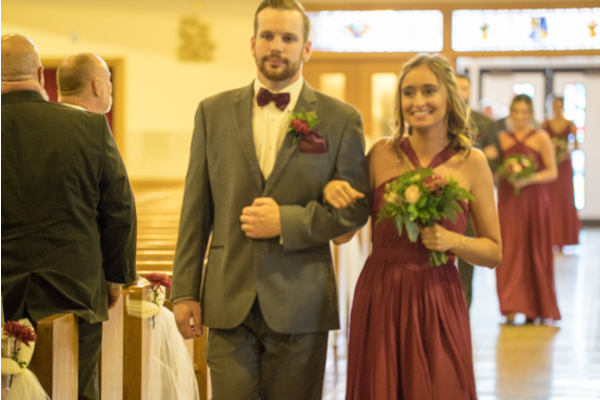 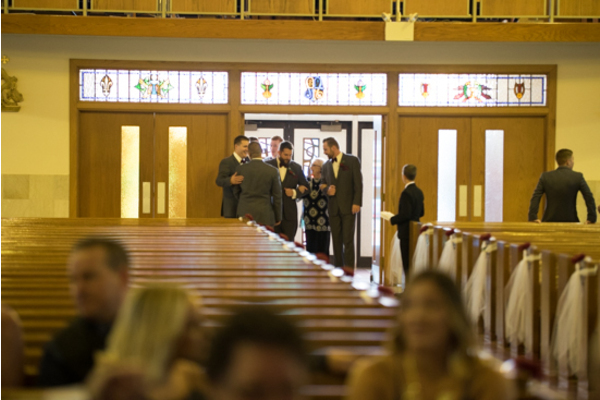 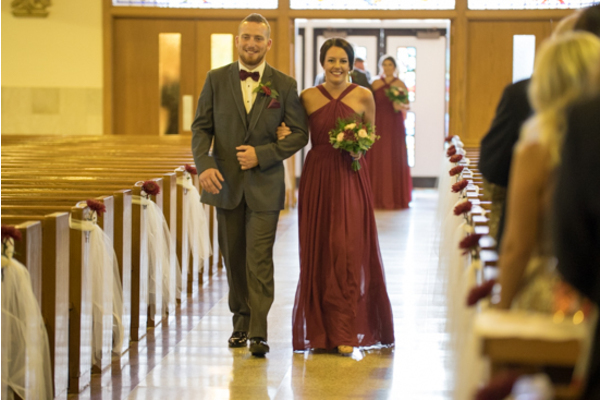 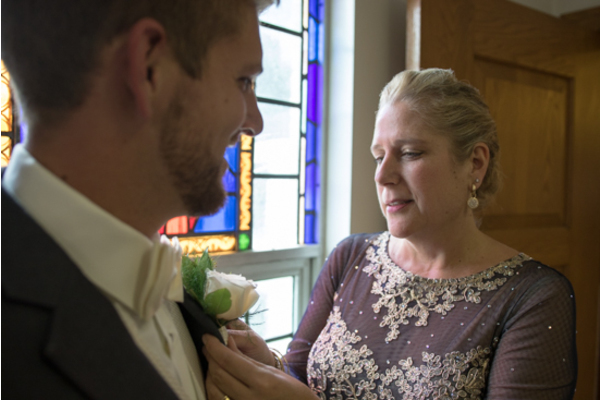 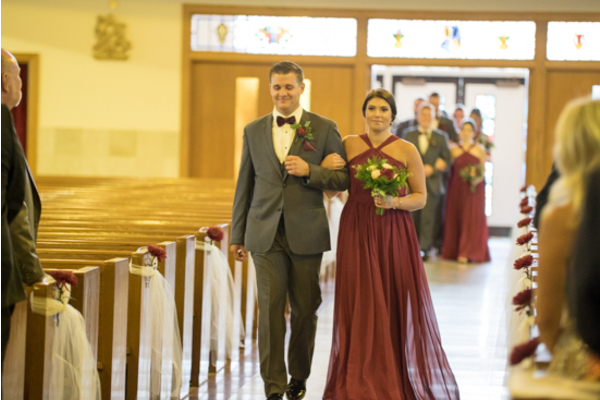 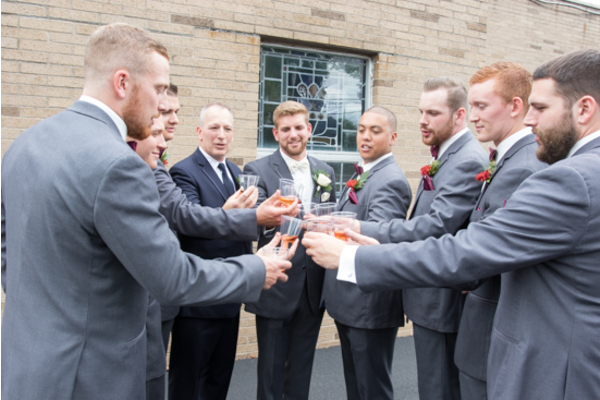 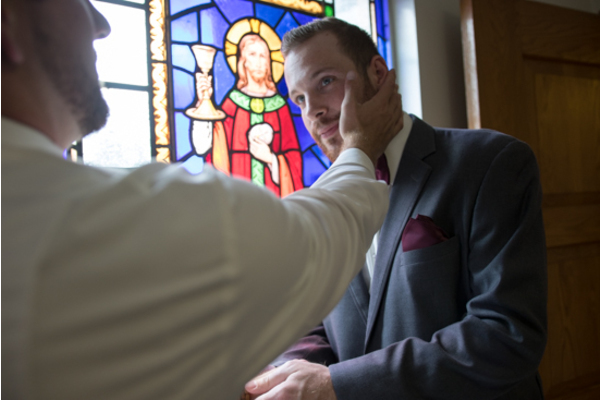 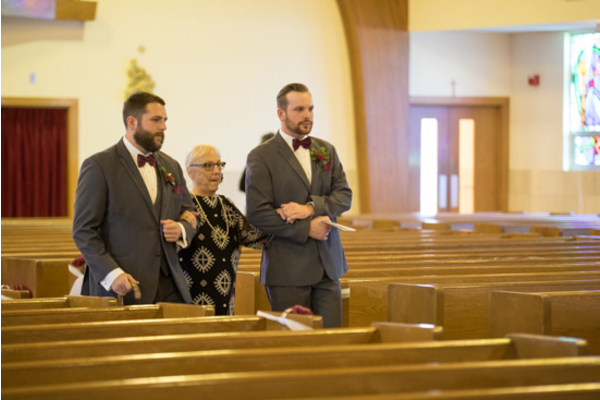 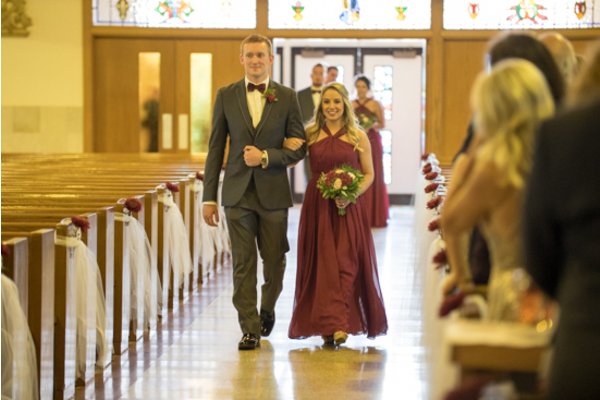 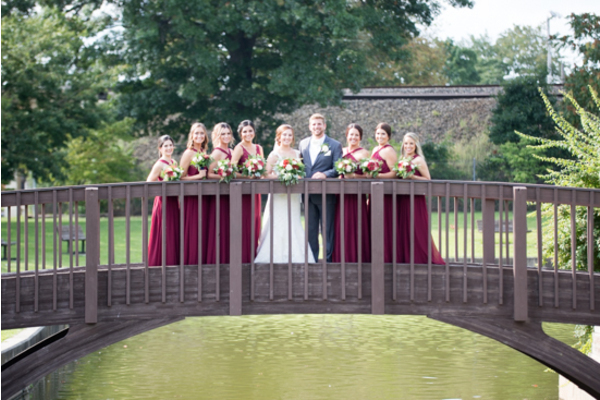 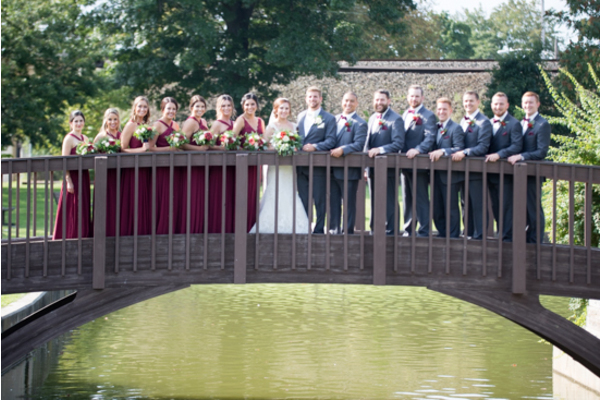 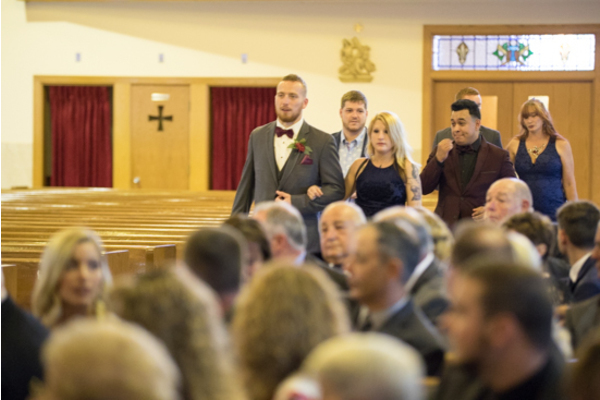 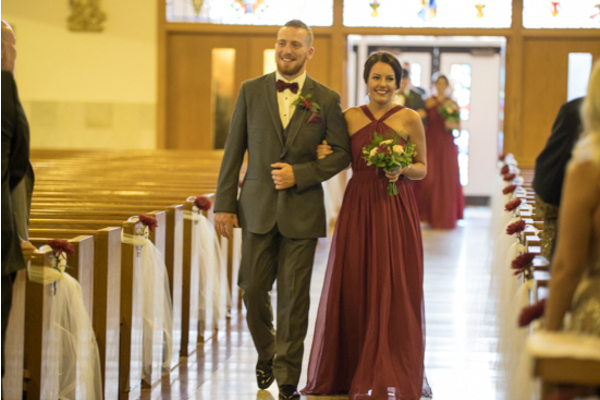 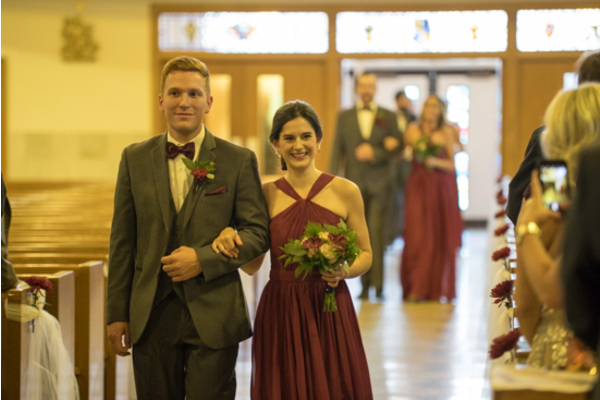 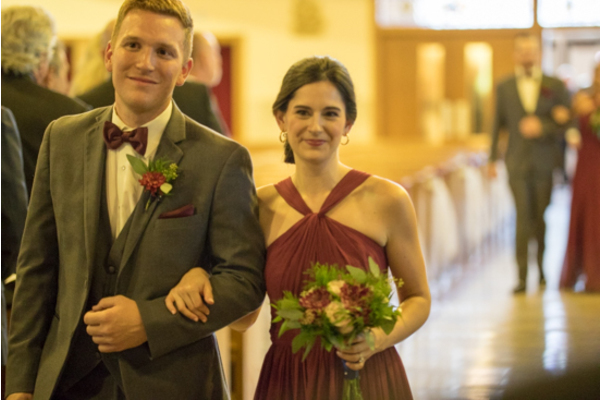 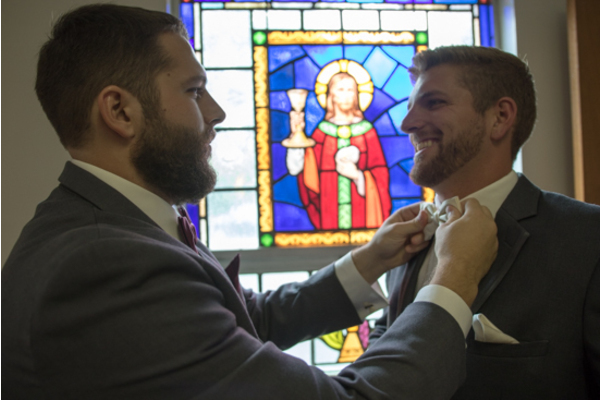 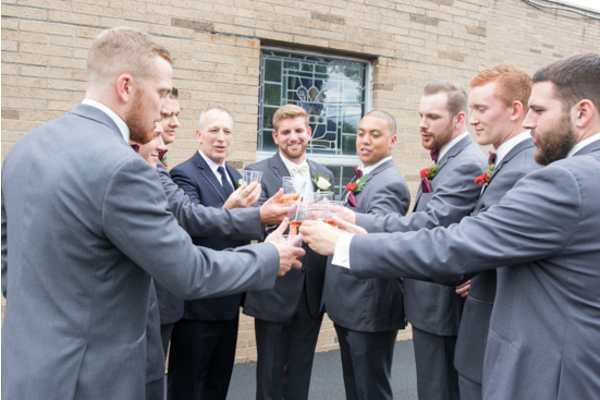 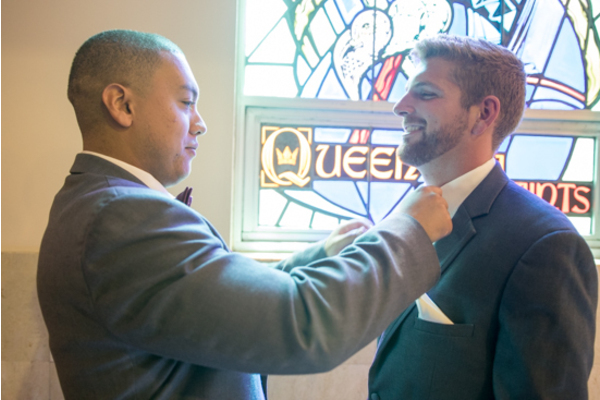 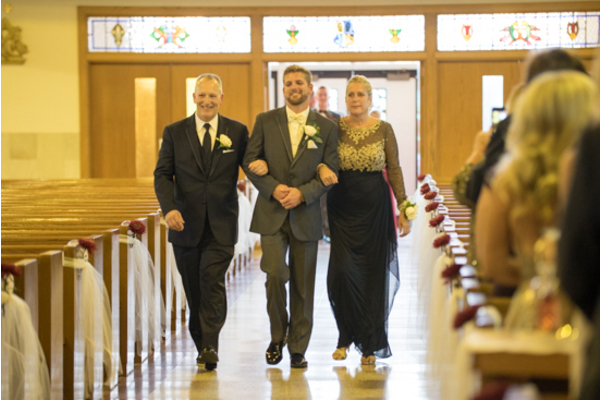 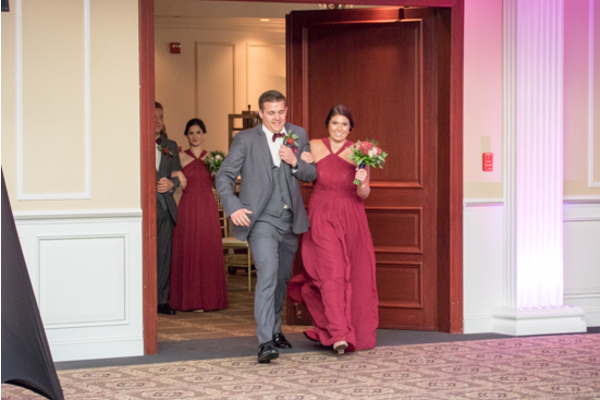 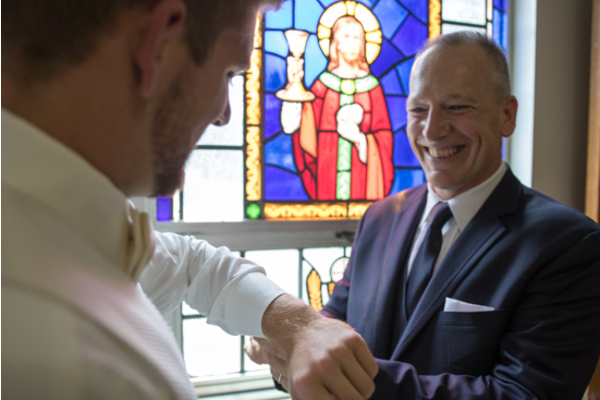 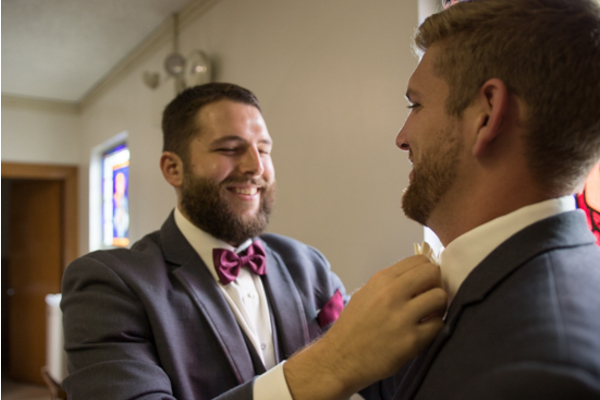 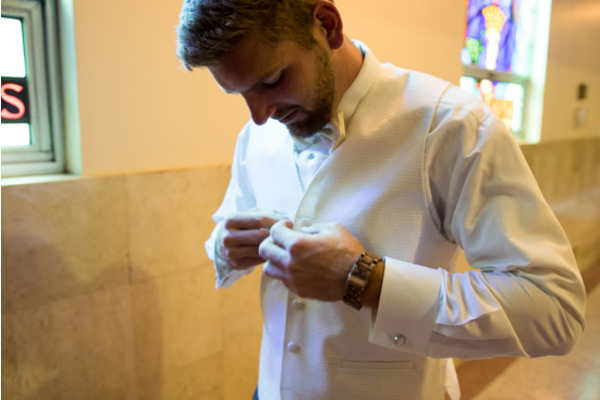 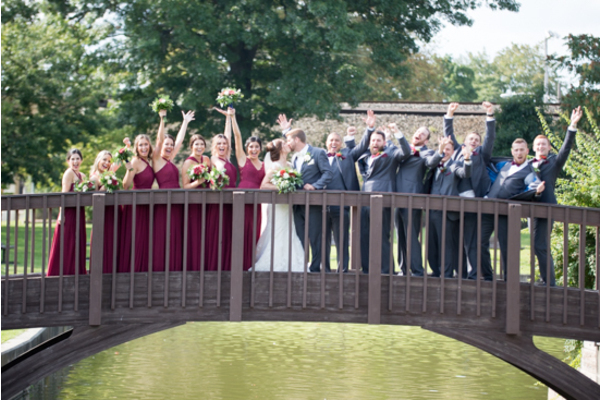 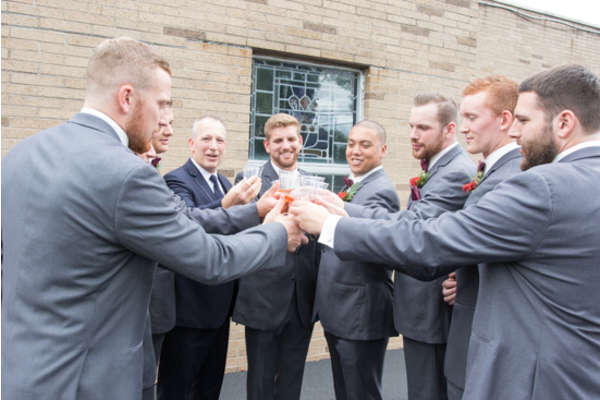 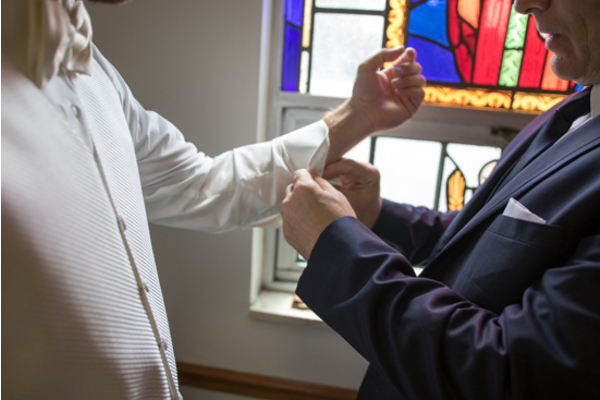 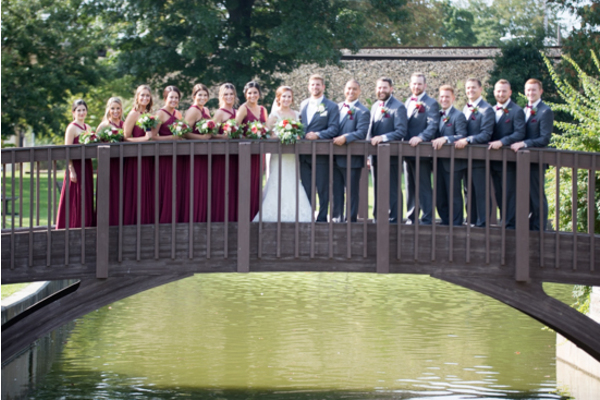 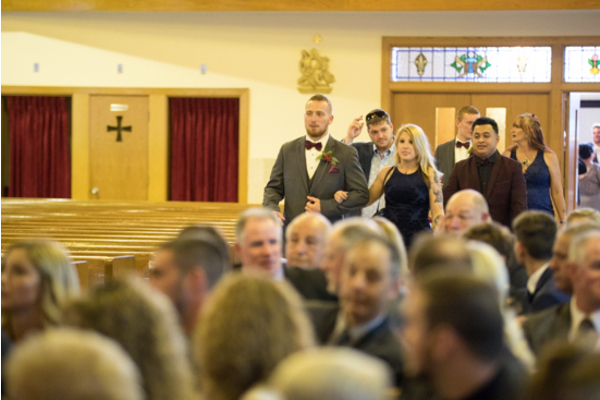 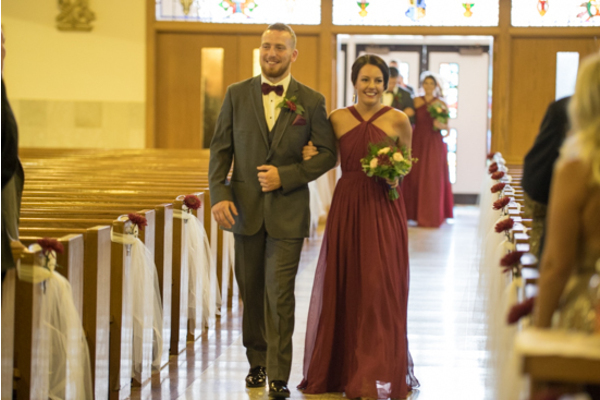 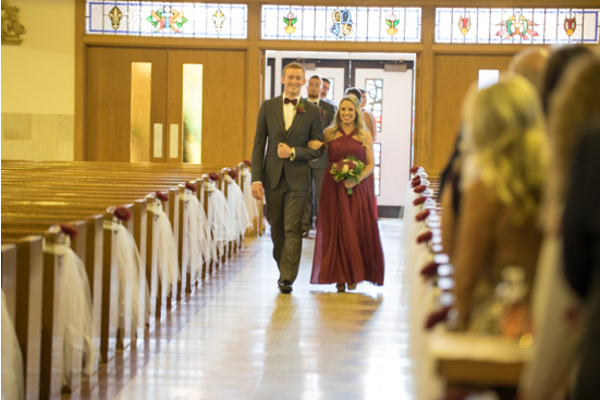 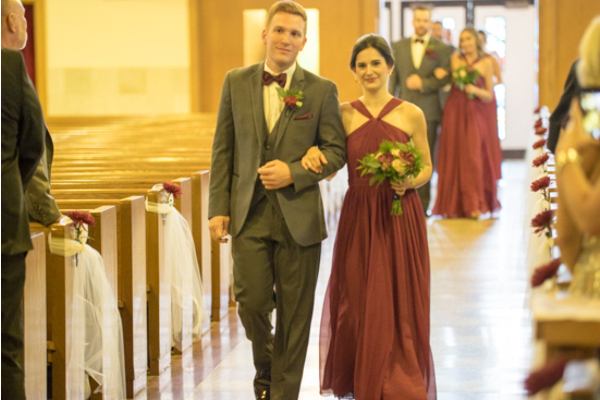 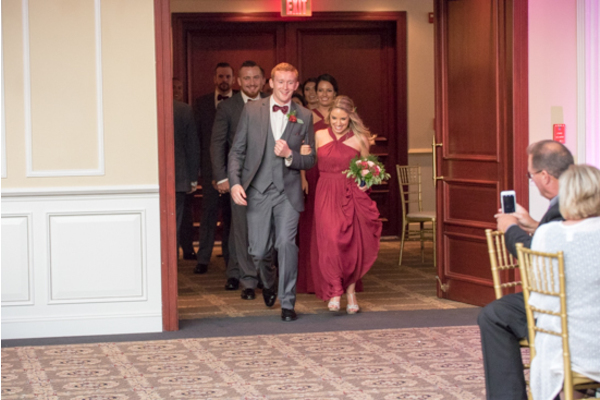 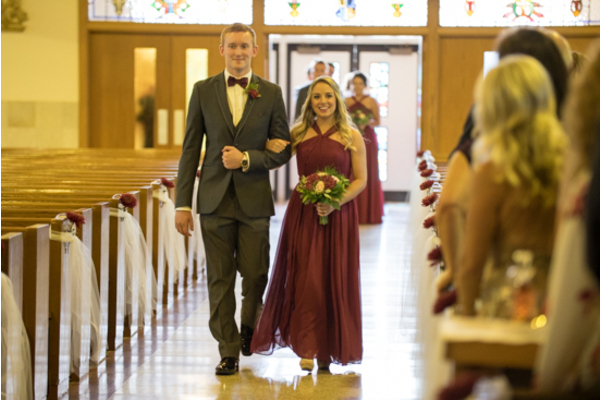 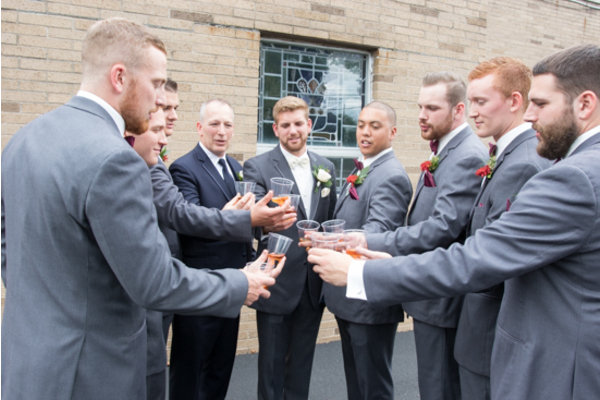 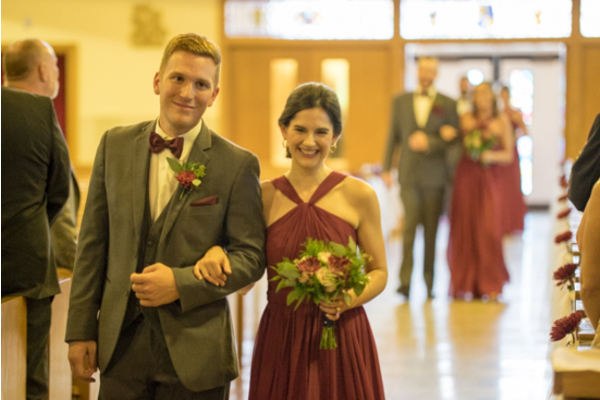 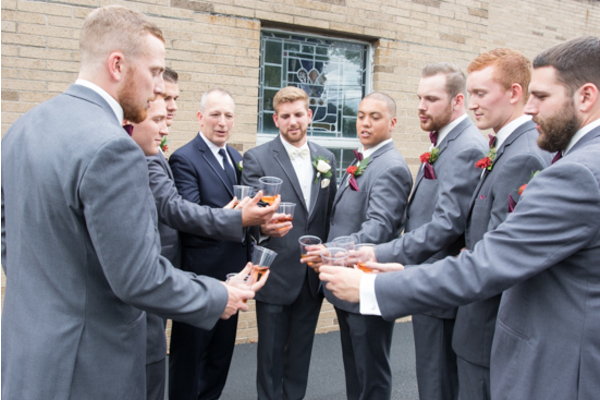 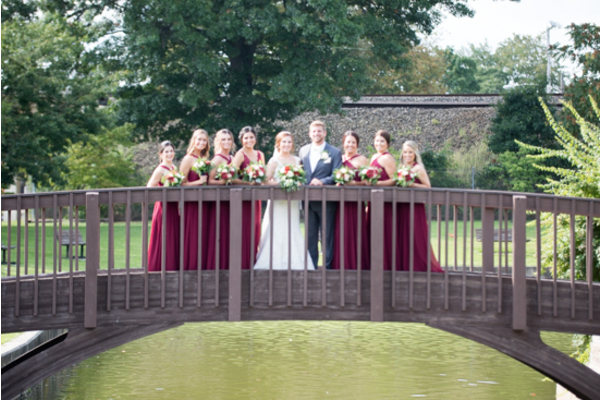 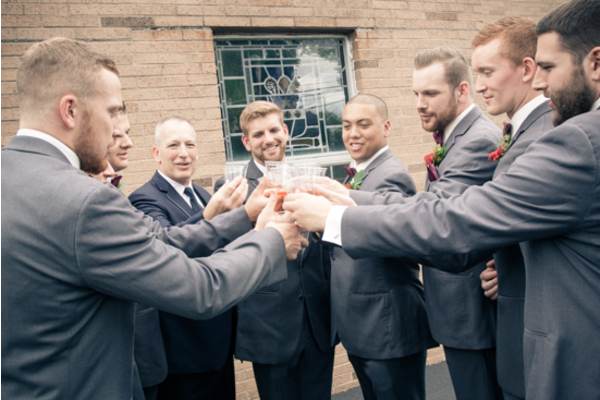 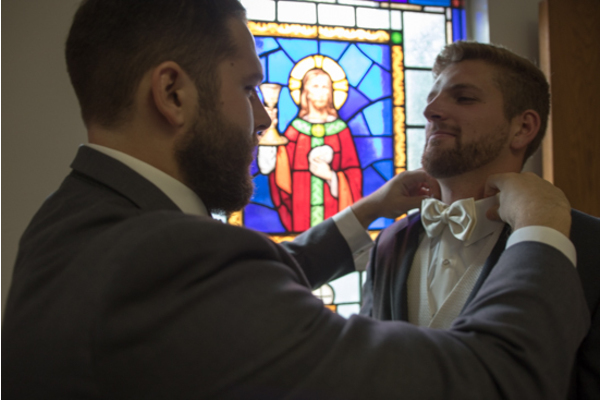 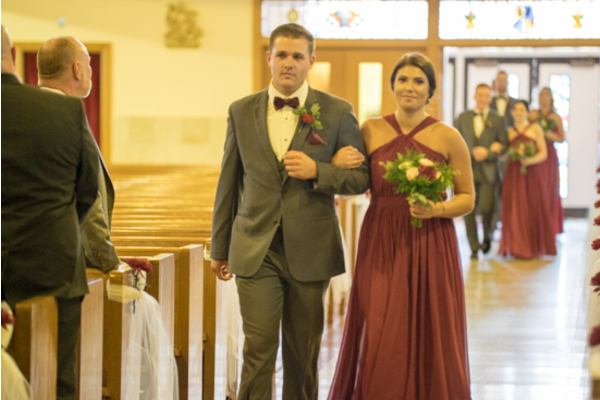 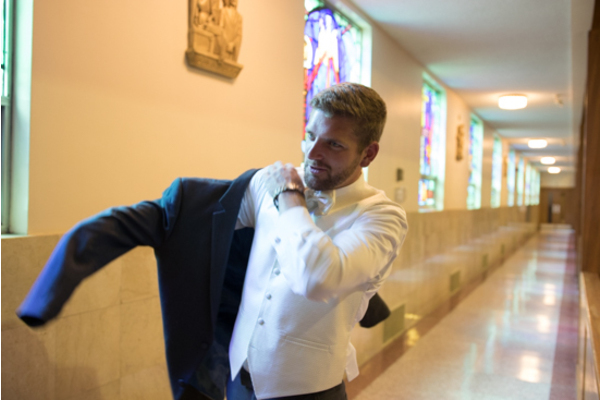 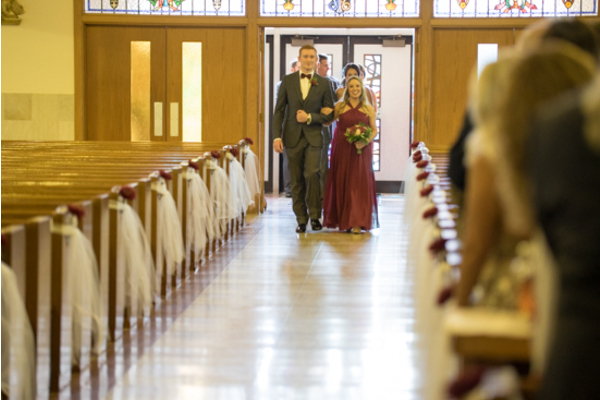 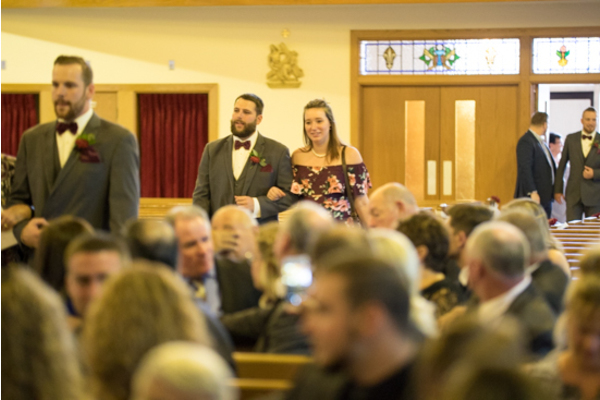 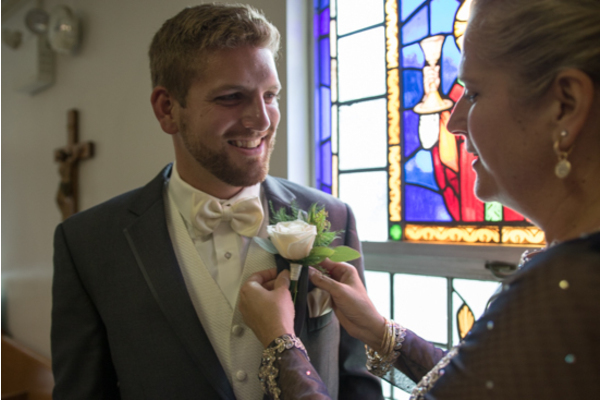 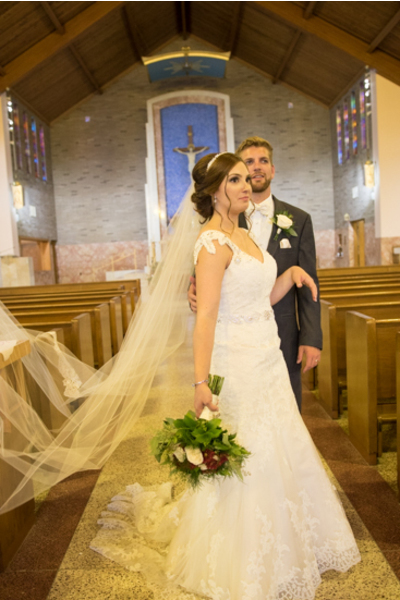 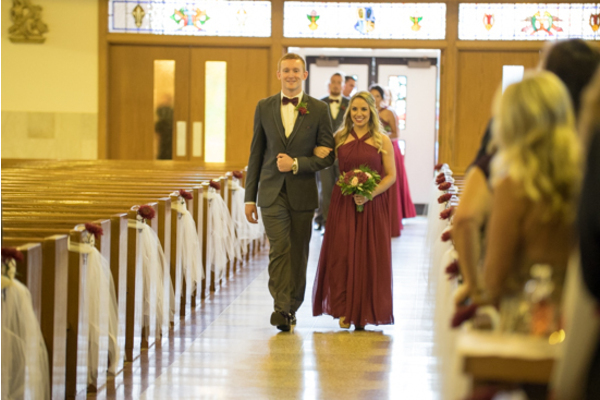 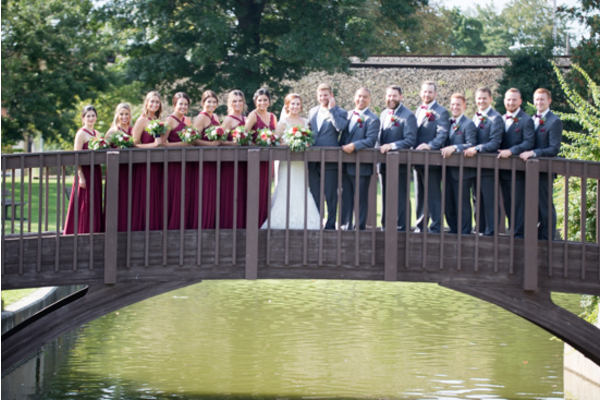 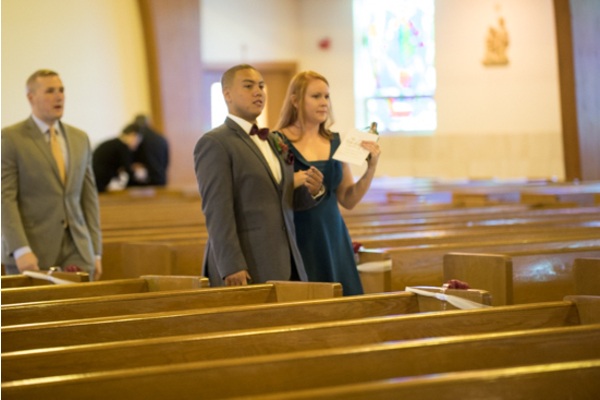 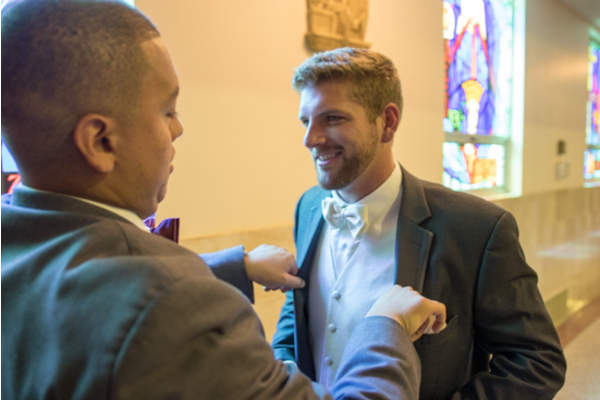 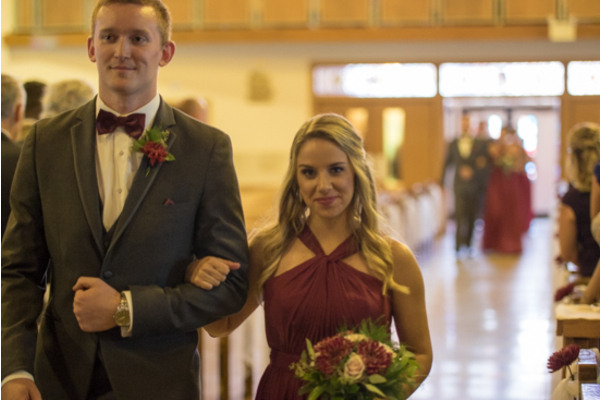 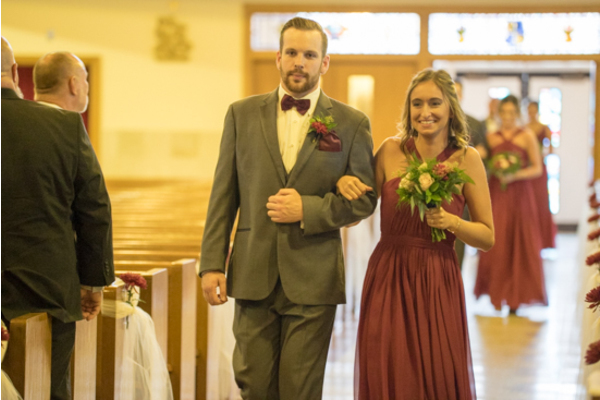 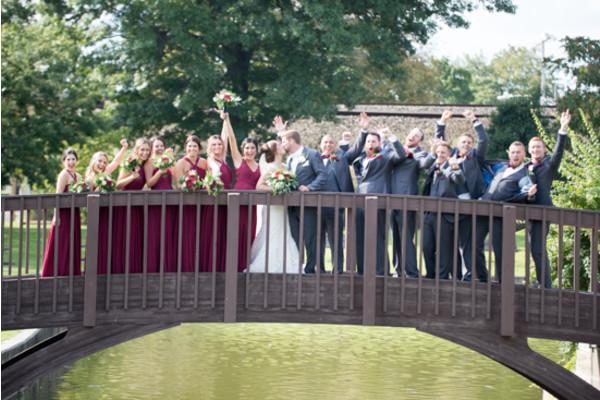 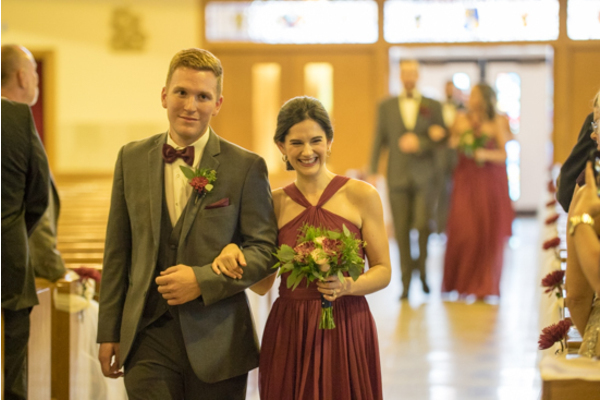 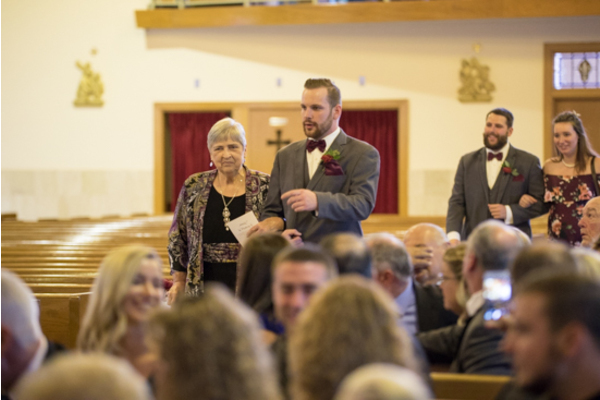 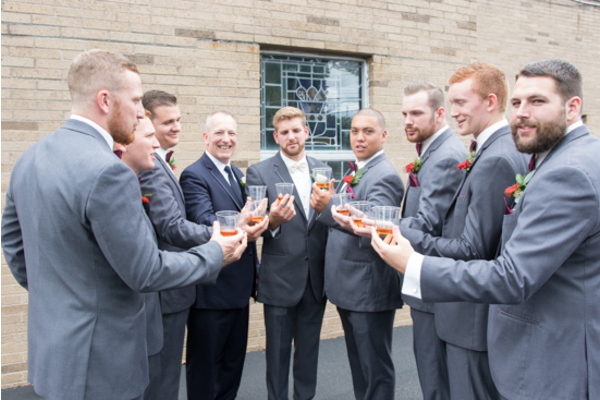 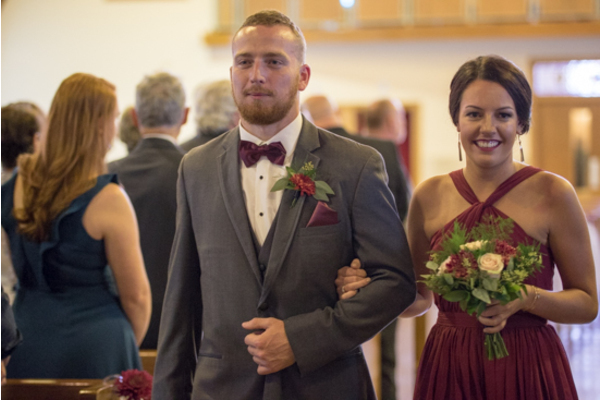 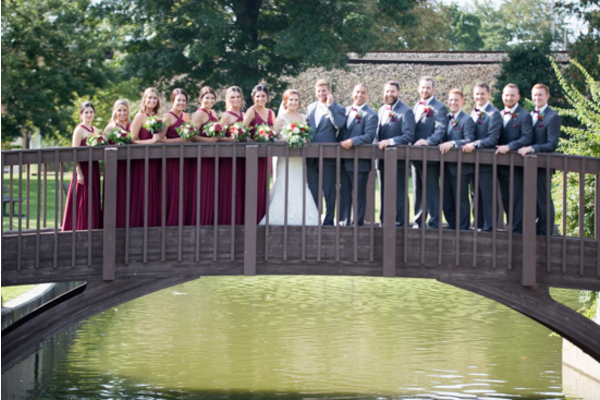 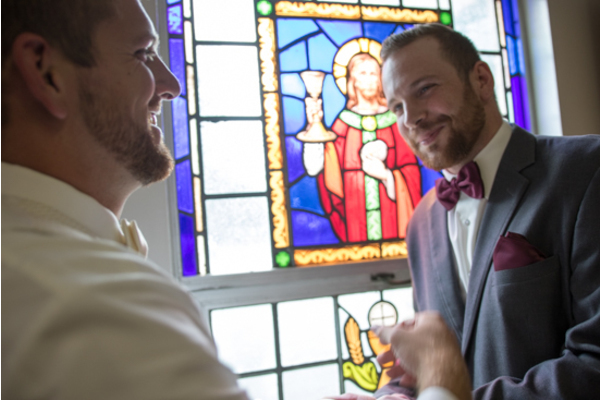 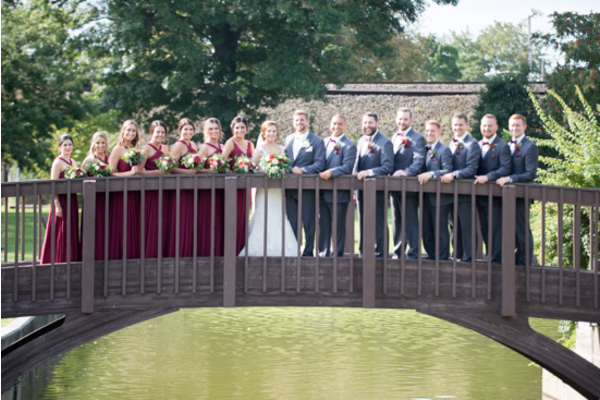 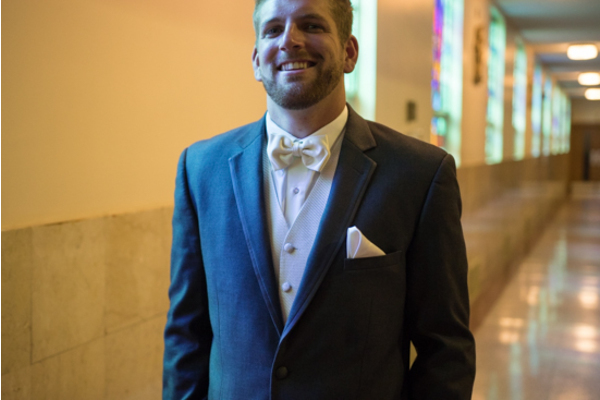 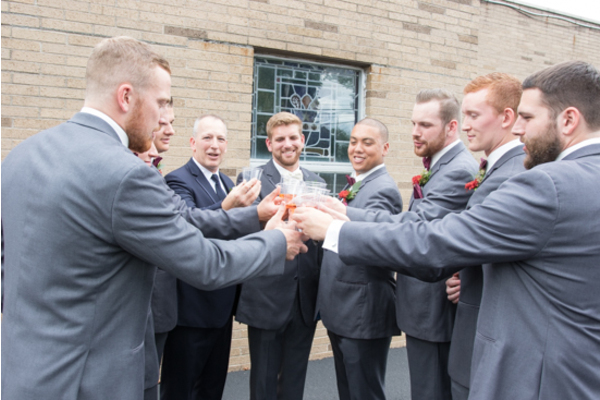 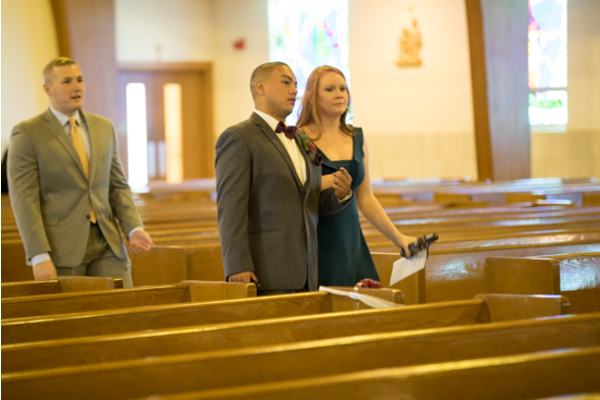 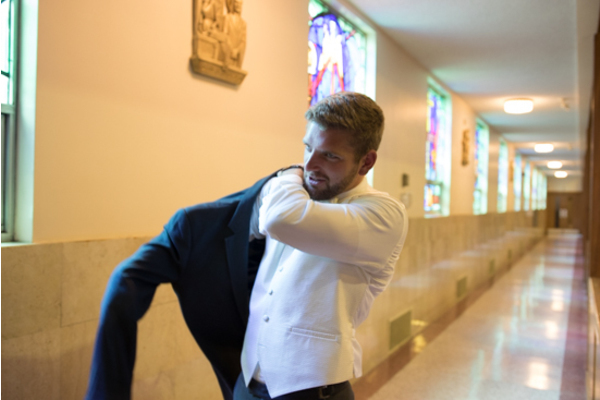 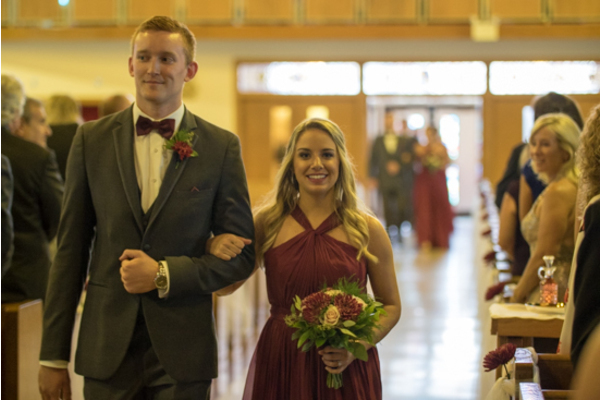 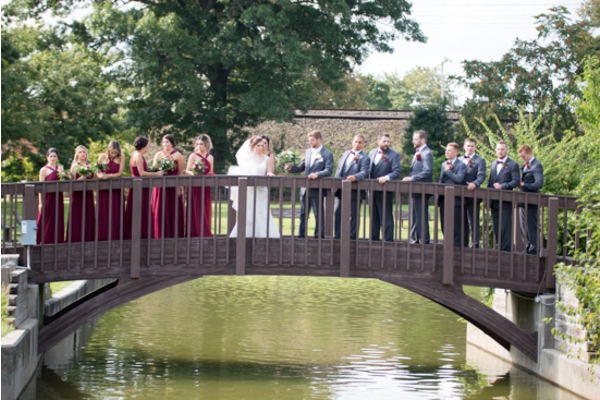 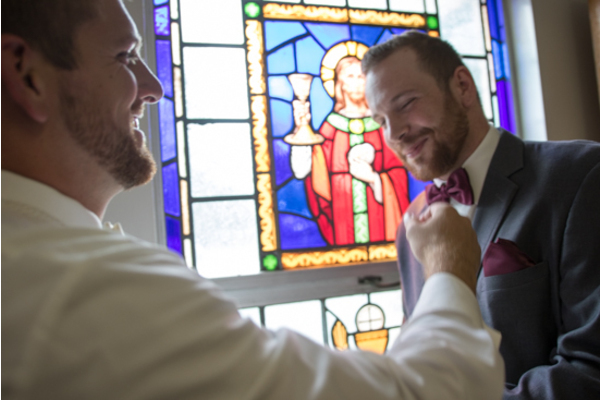 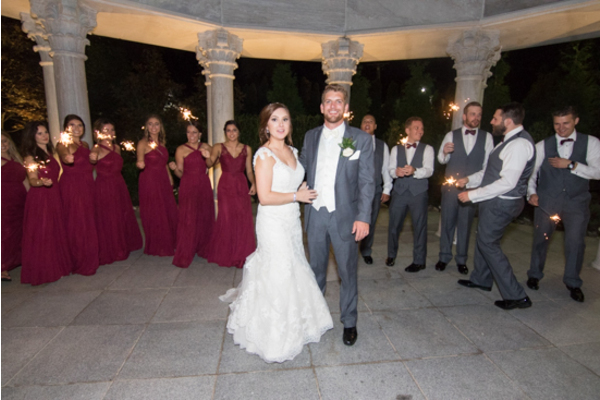 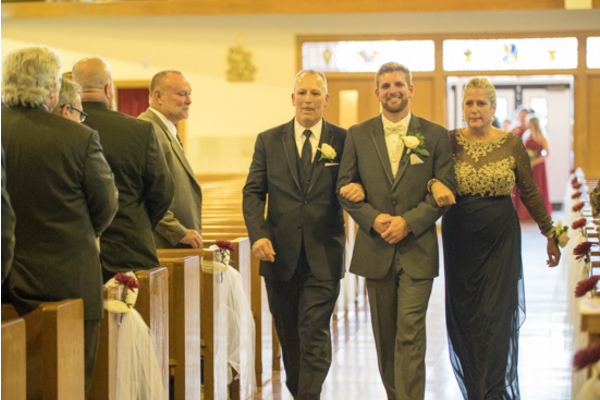 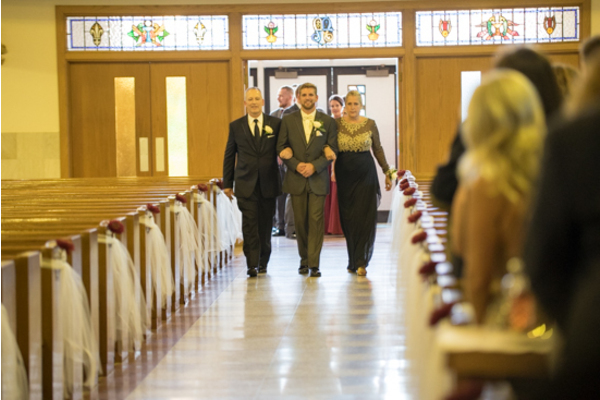 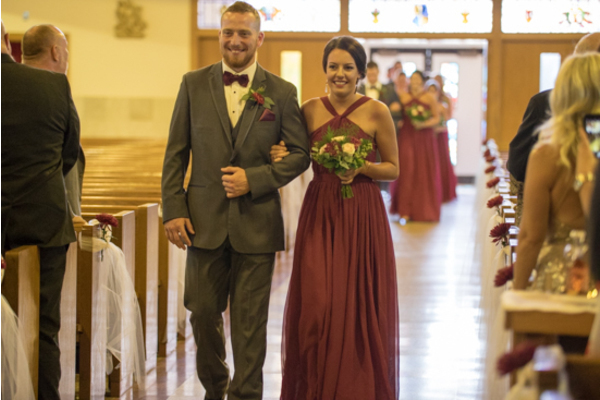 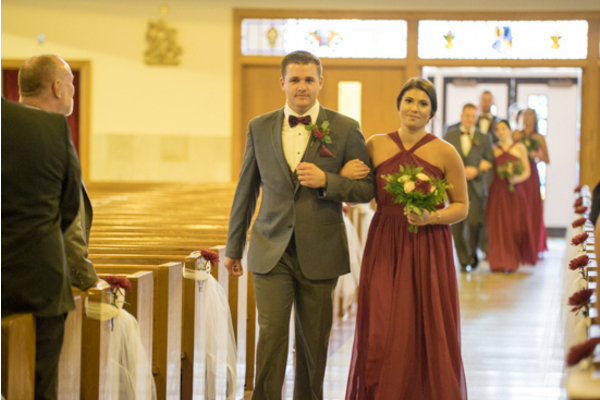 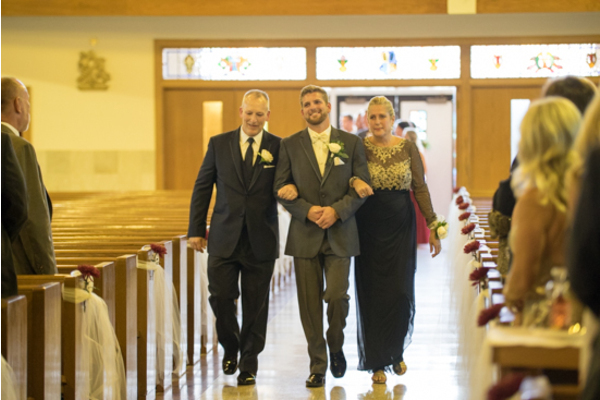 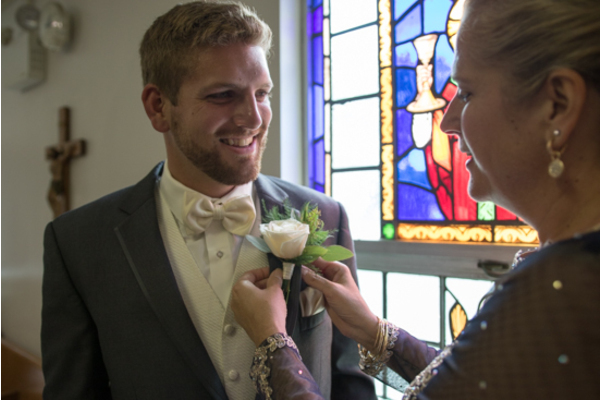 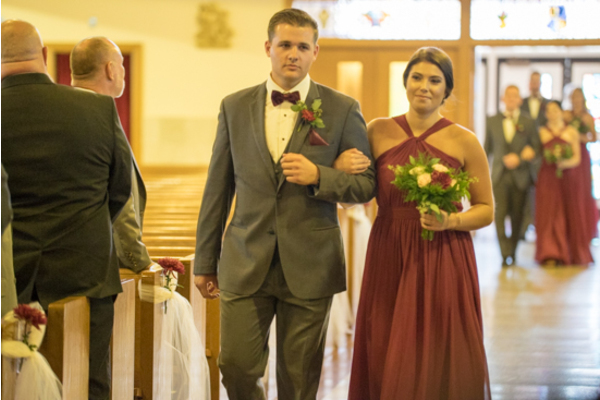 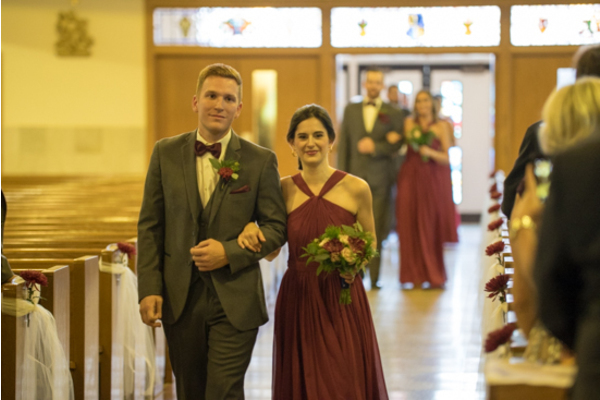 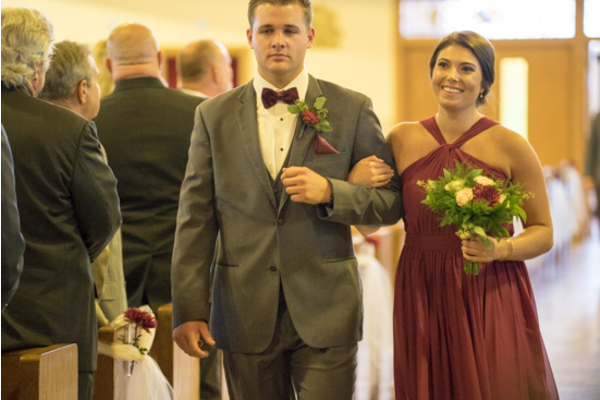 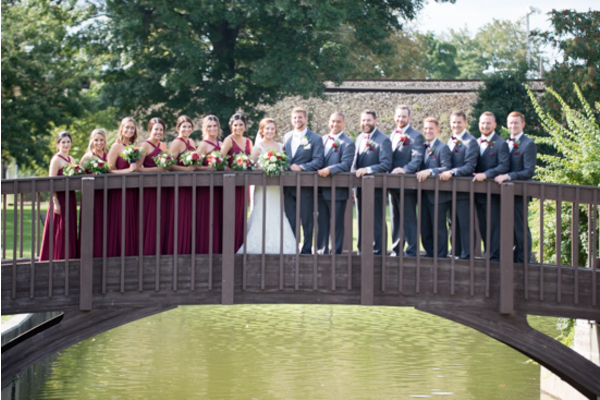 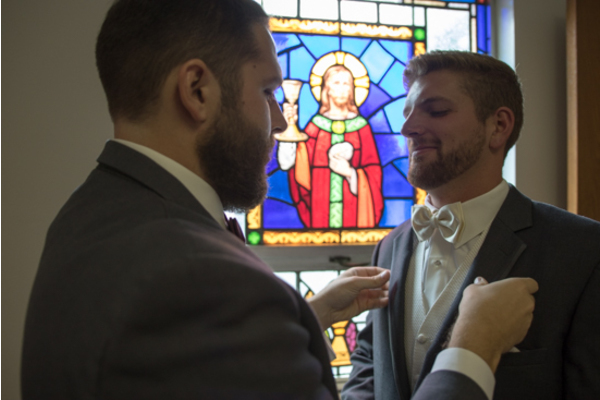 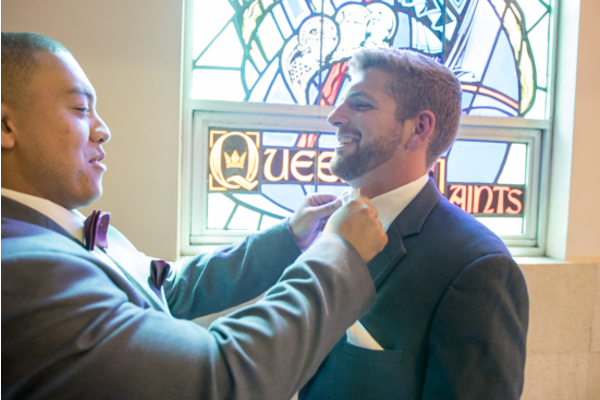 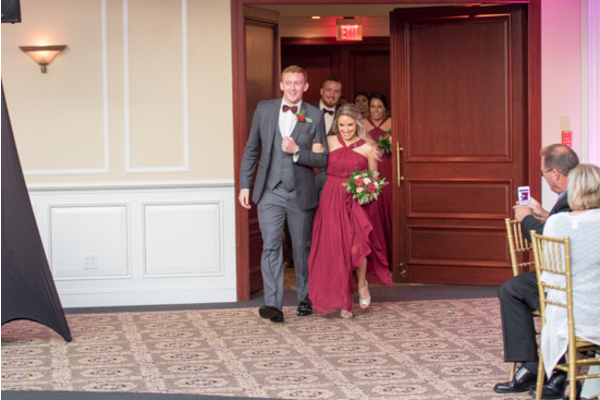 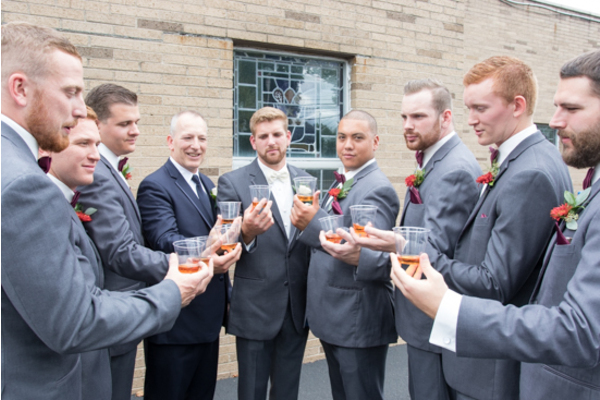 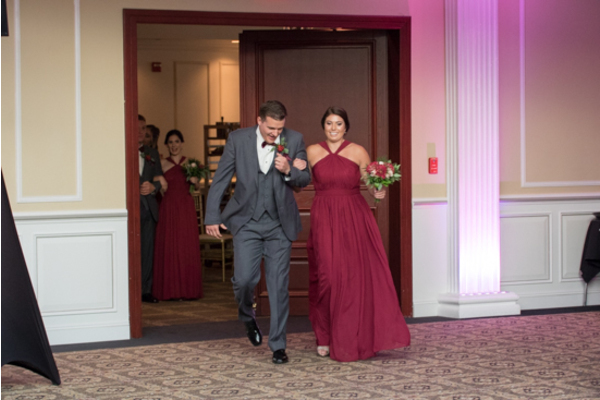 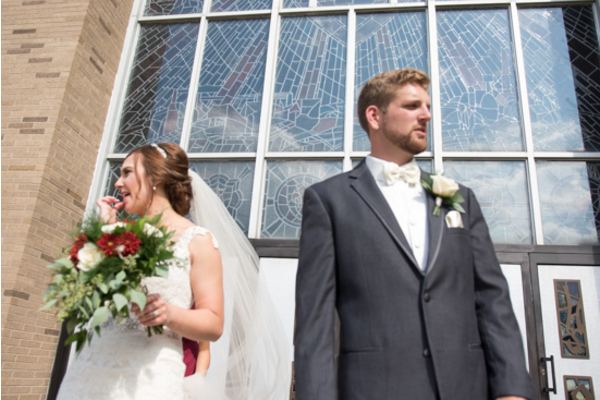 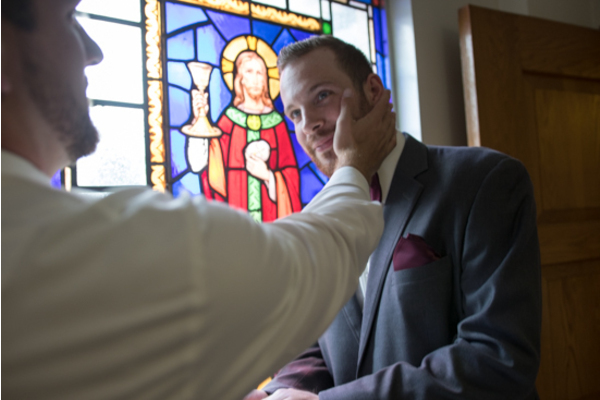 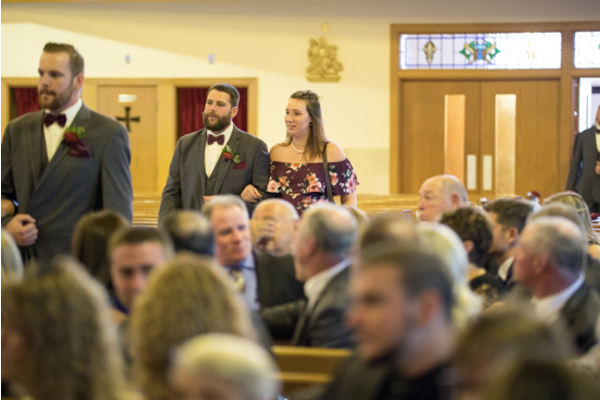 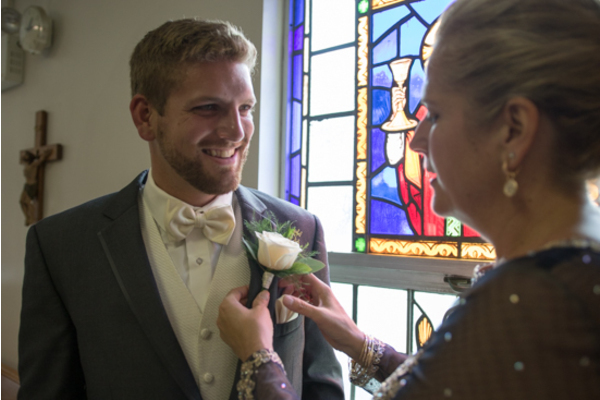 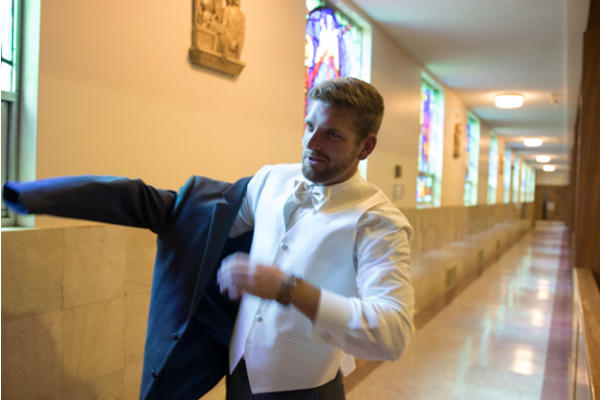 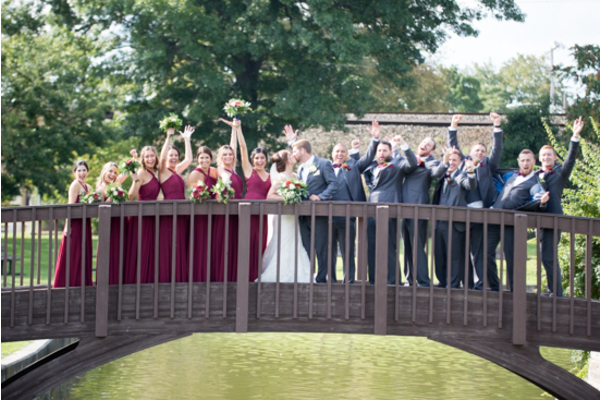 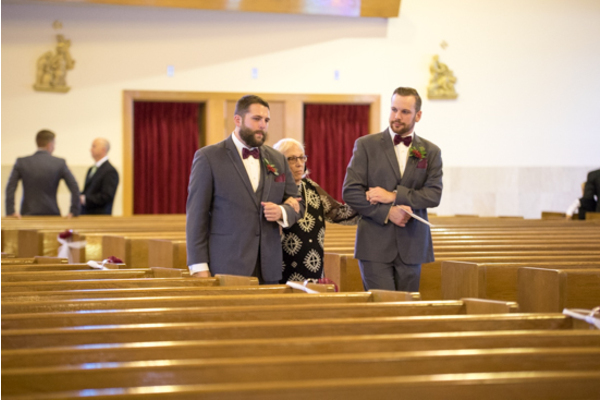 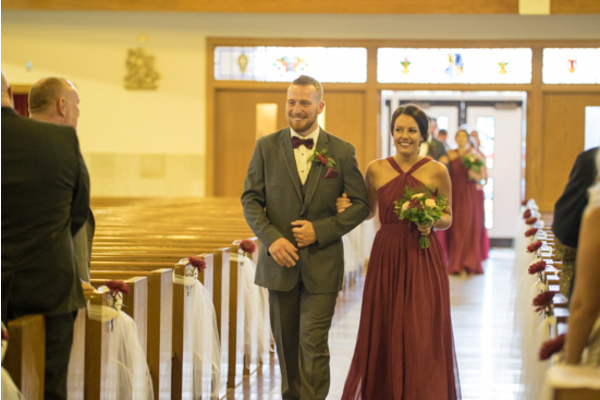 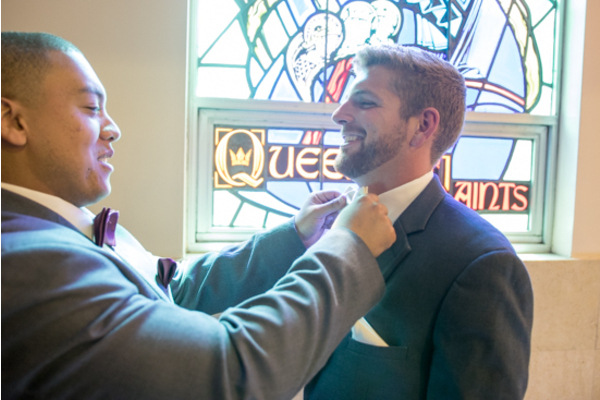 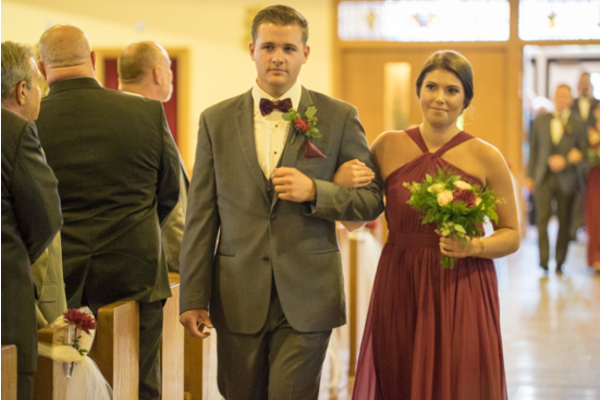 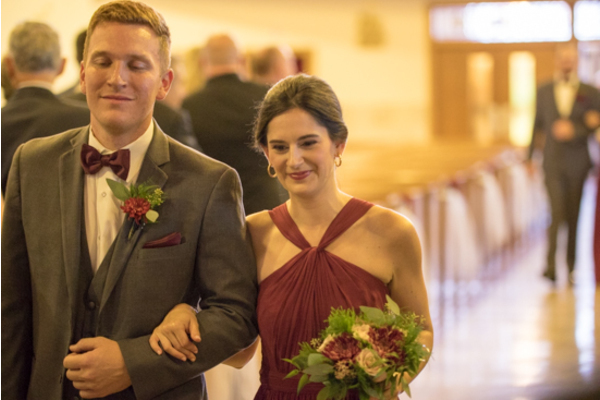 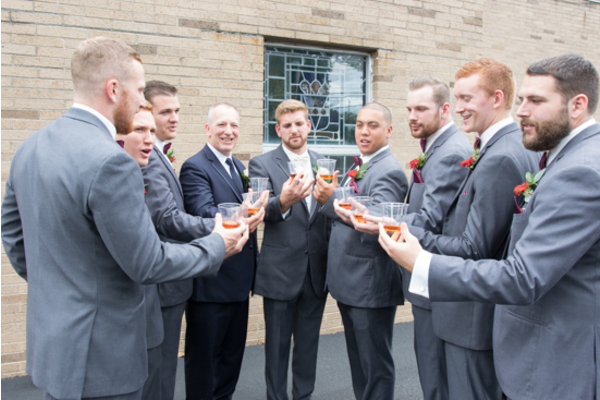 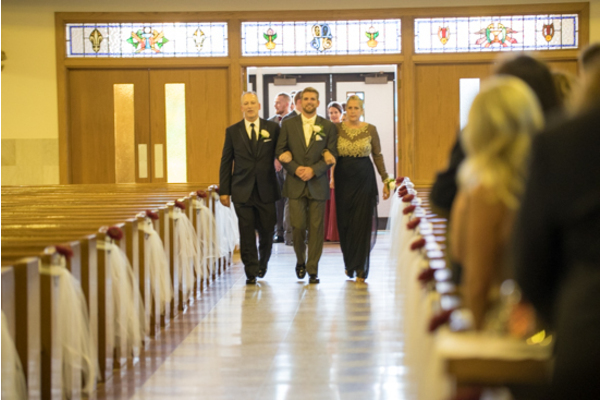 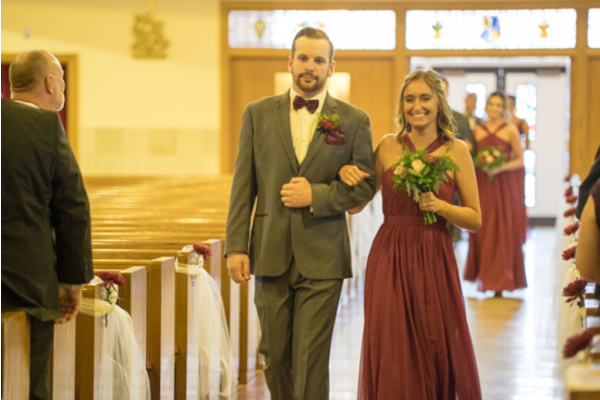 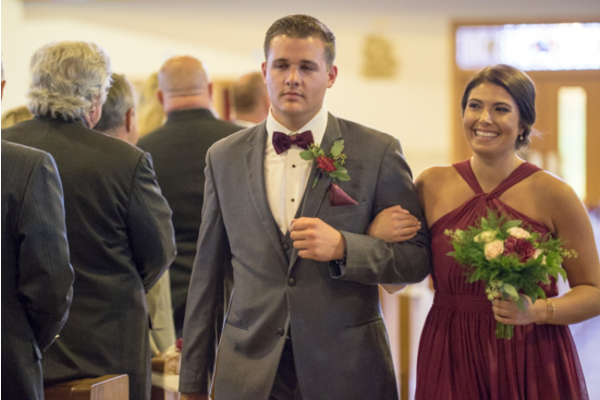 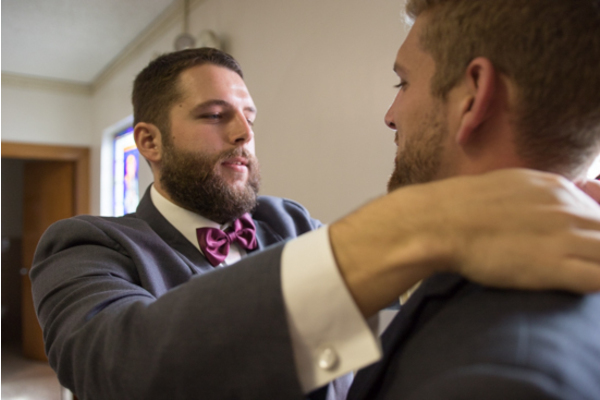 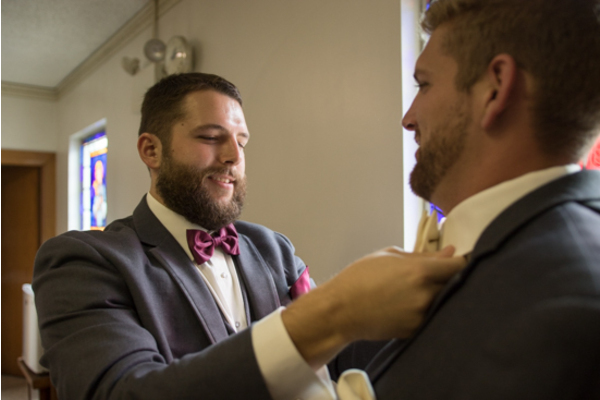 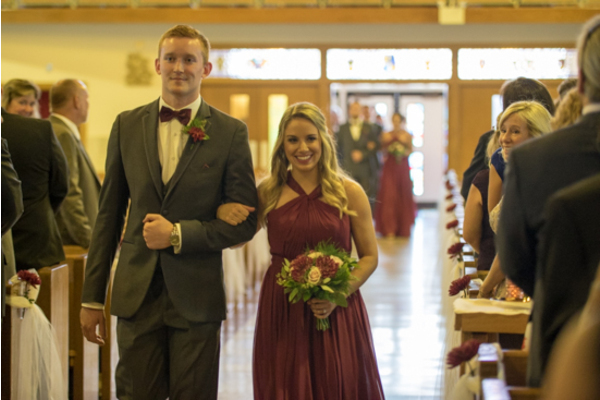 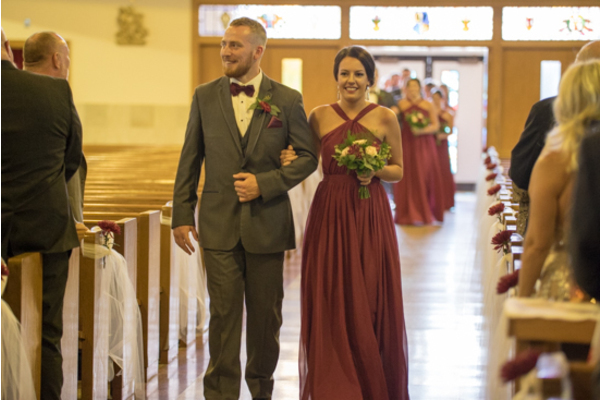 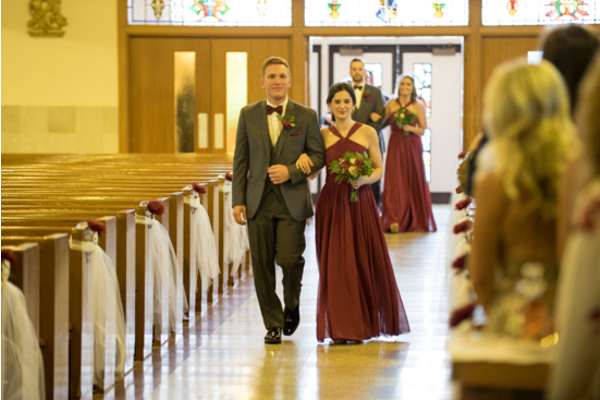 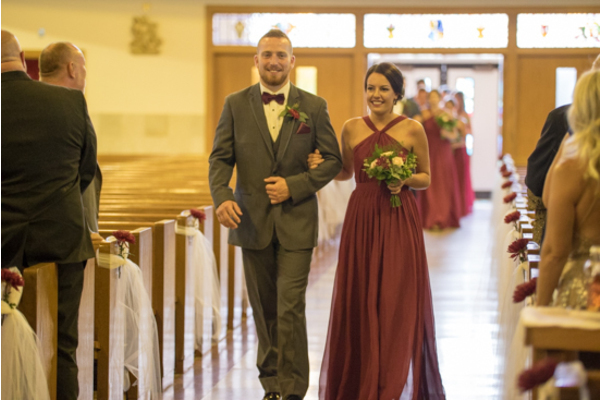 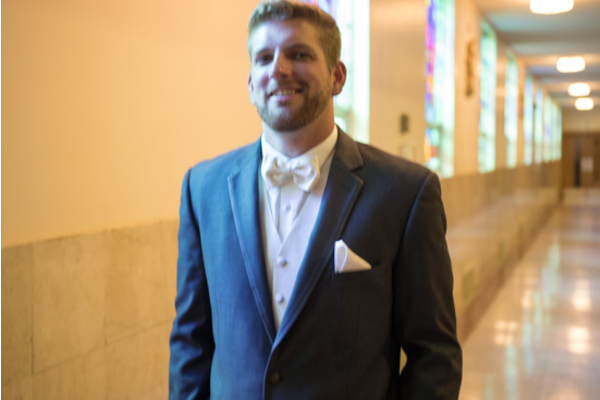 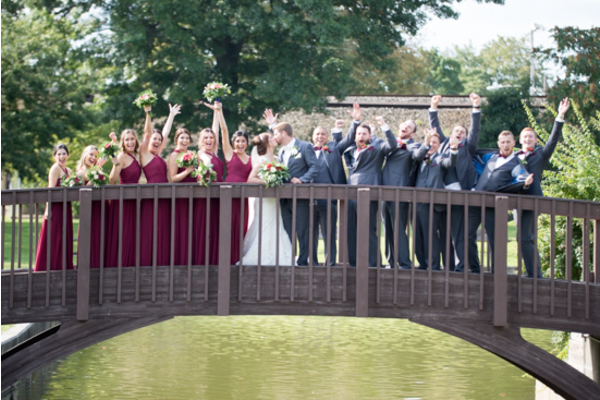 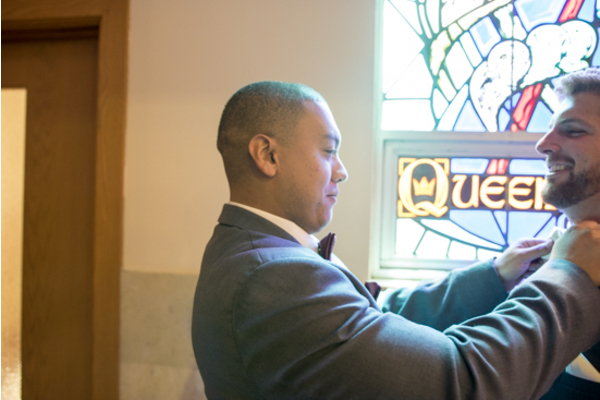 At the church, the bridal party wore red gowns and groomsmen wore their gray suits that complimented each other perfectly! 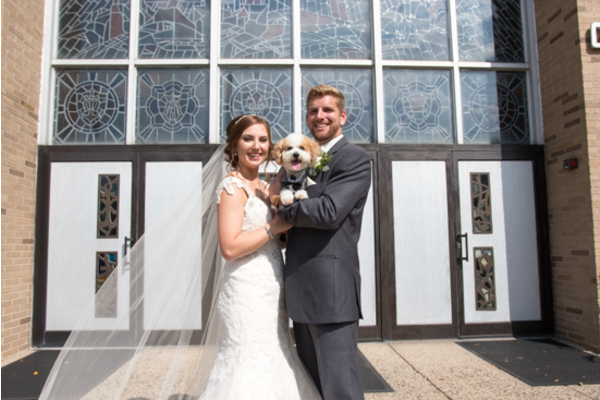 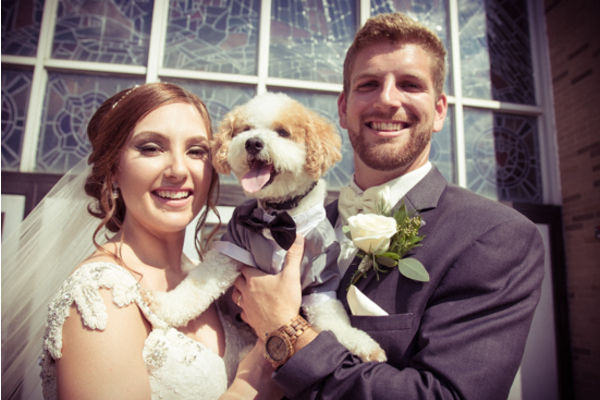 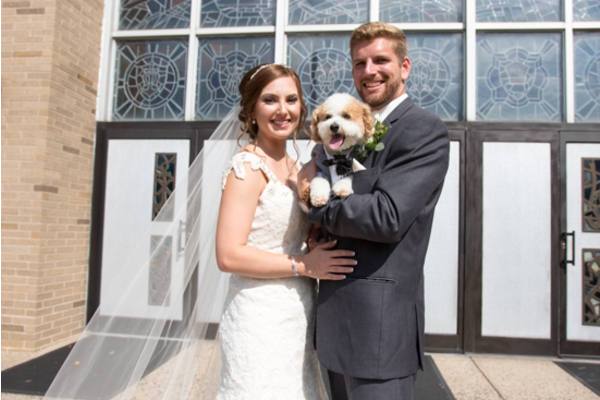 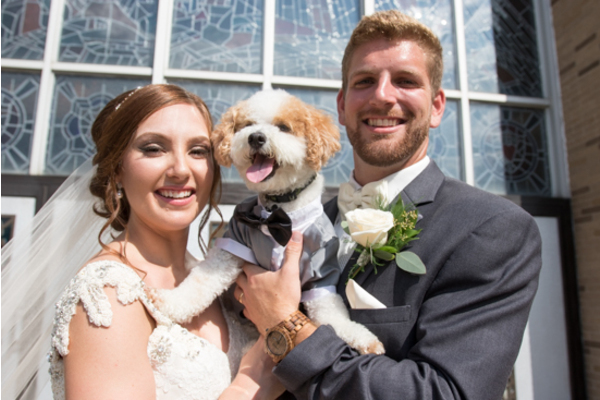 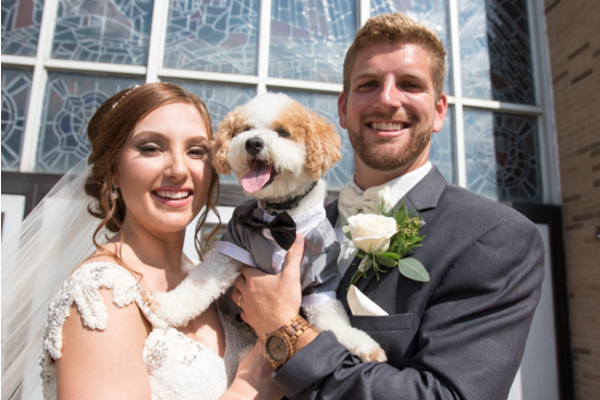 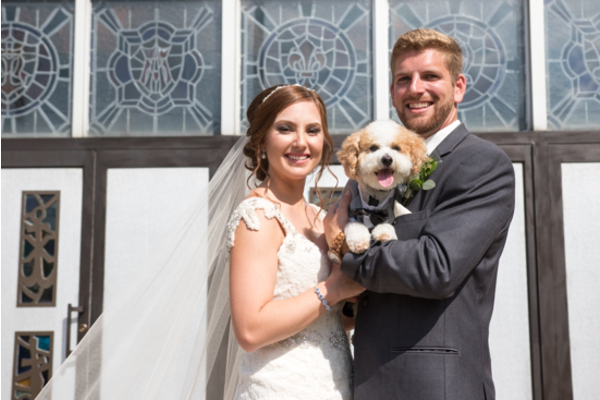 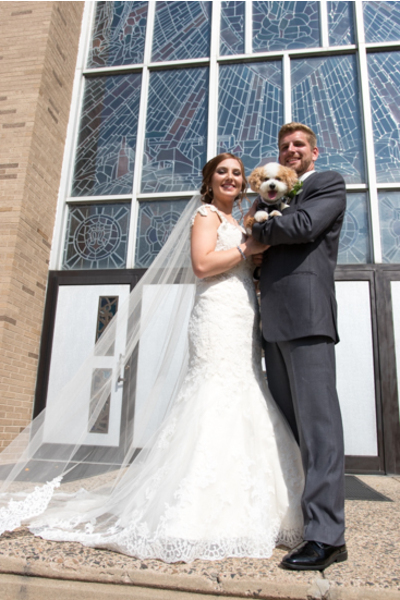 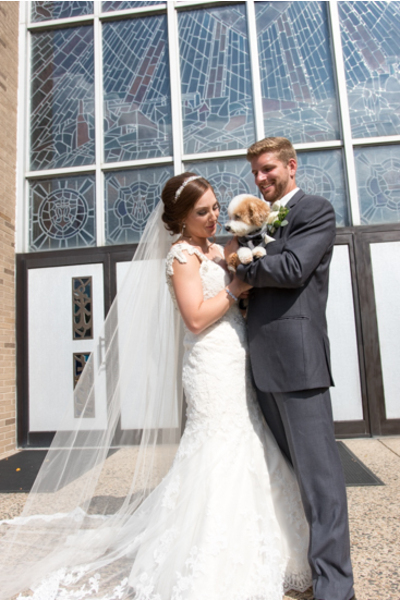 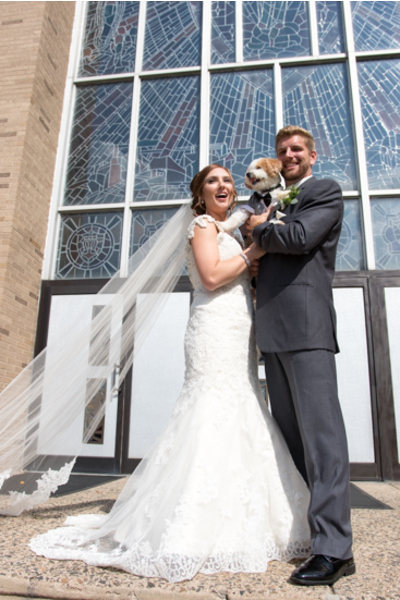 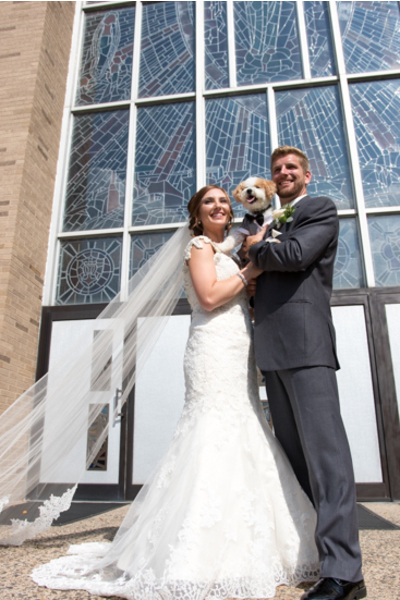 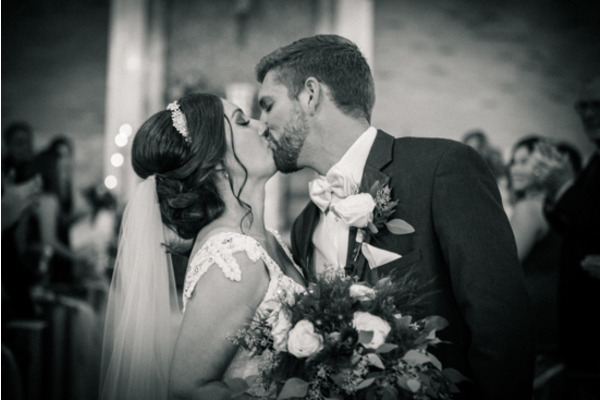 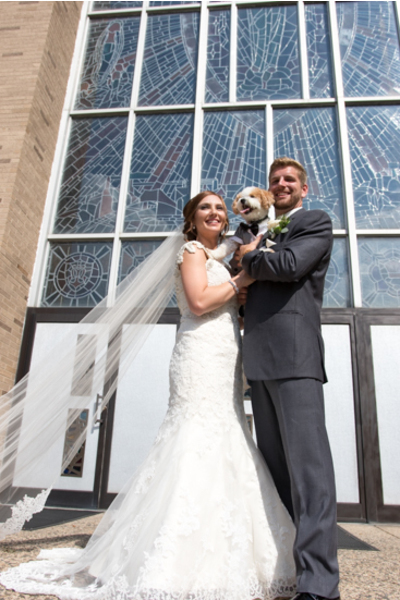 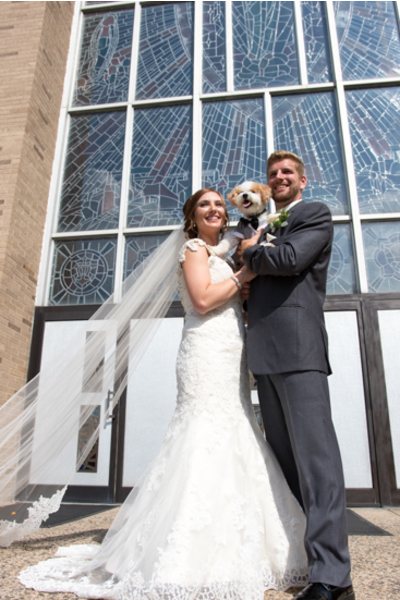 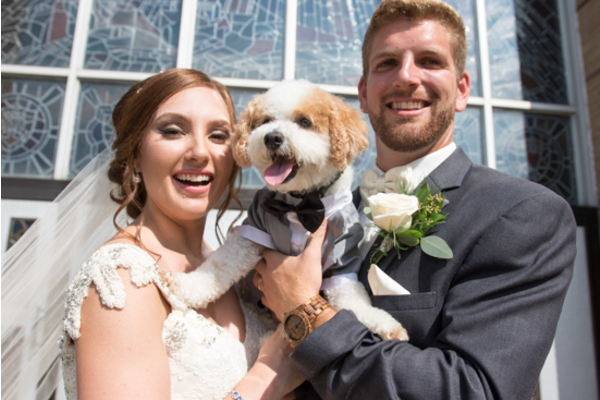 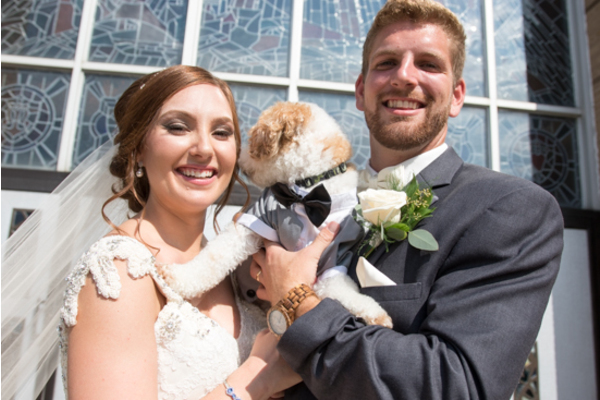 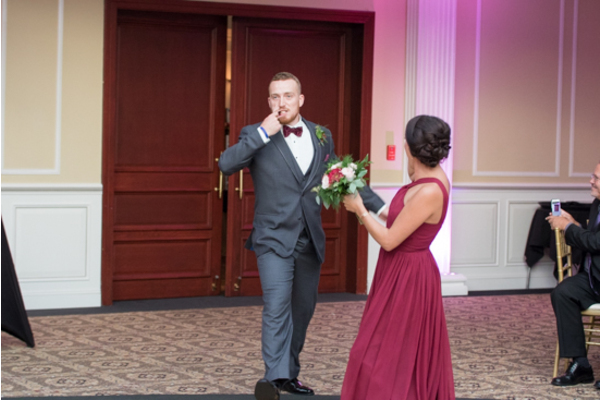 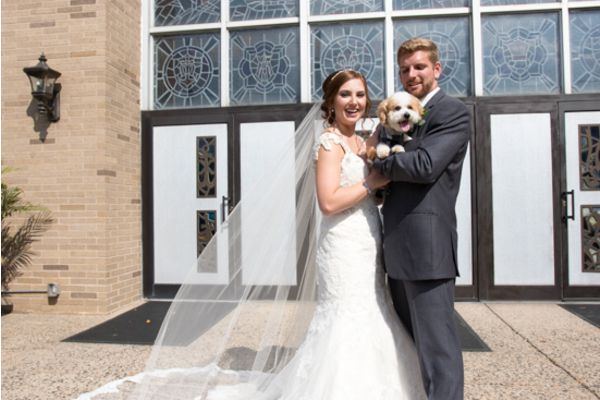 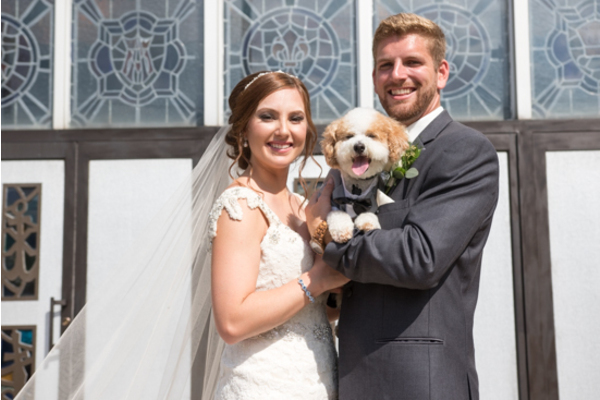 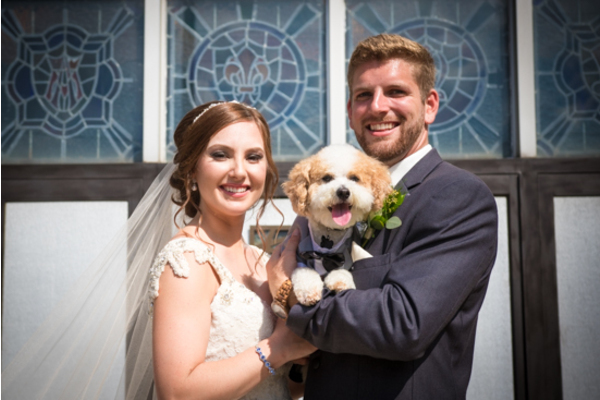 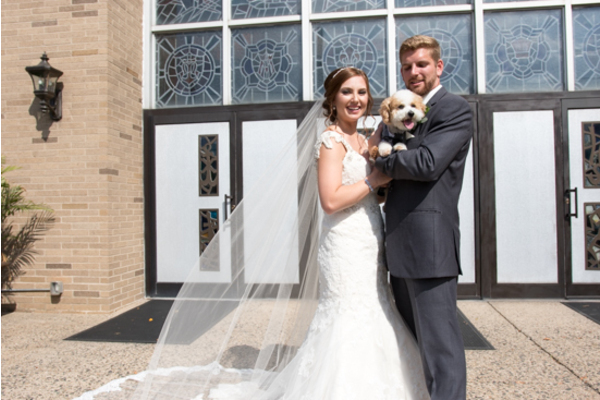 After ending the ceremony with a beautiful kiss, the happy newlyweds headed off for some gorgeous portraits with their adorable dog taken by our NJ Wedding Photographer! 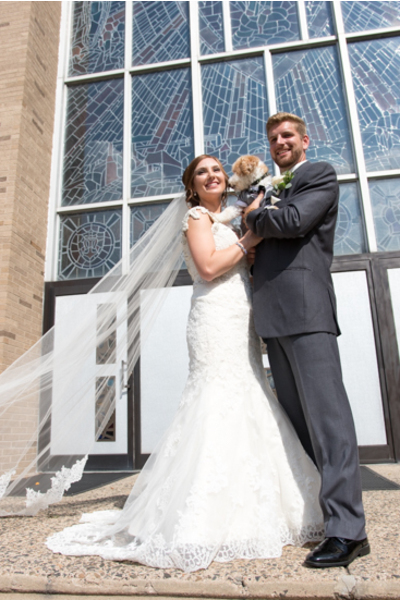 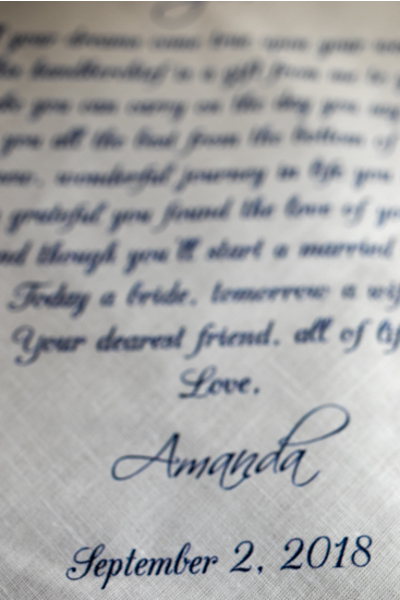 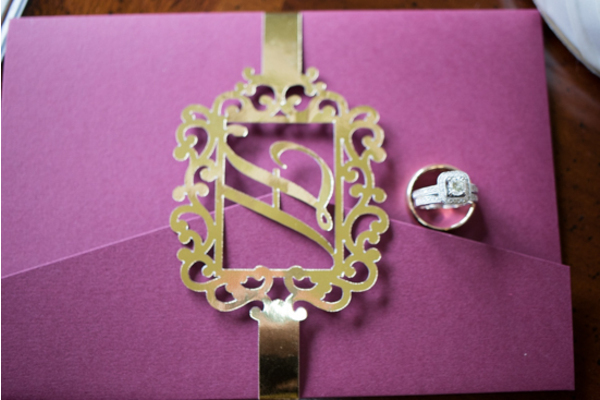 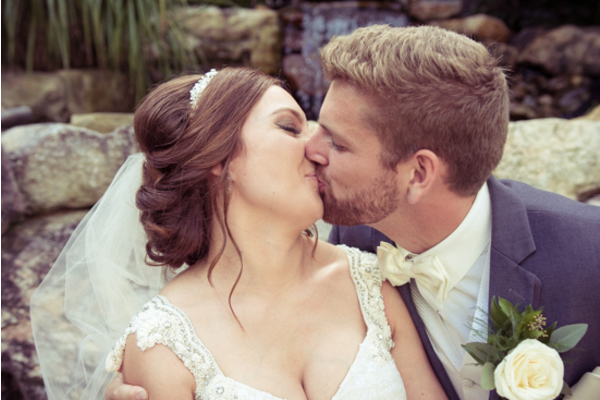 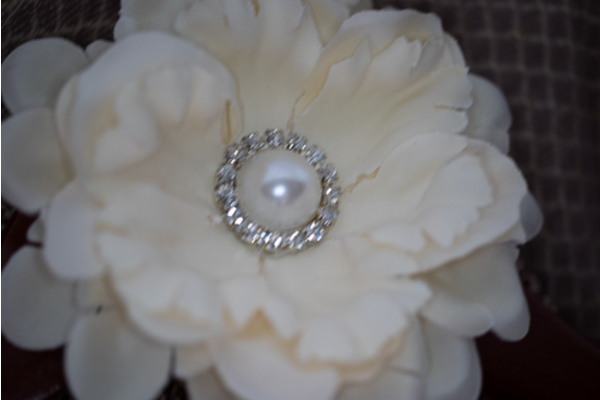 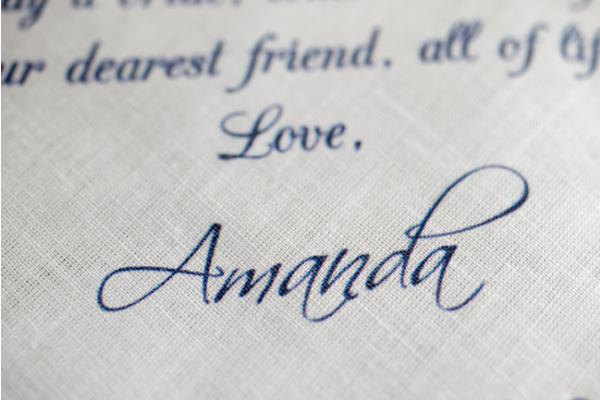 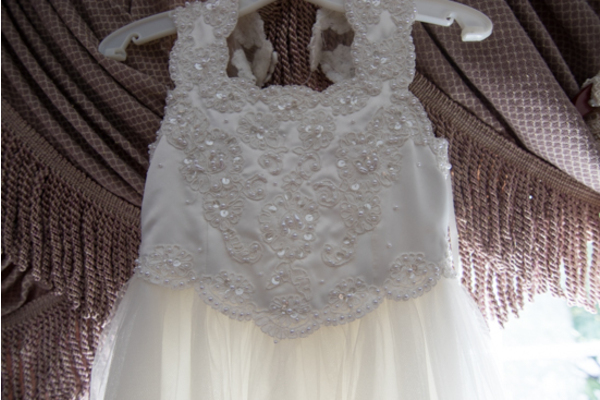 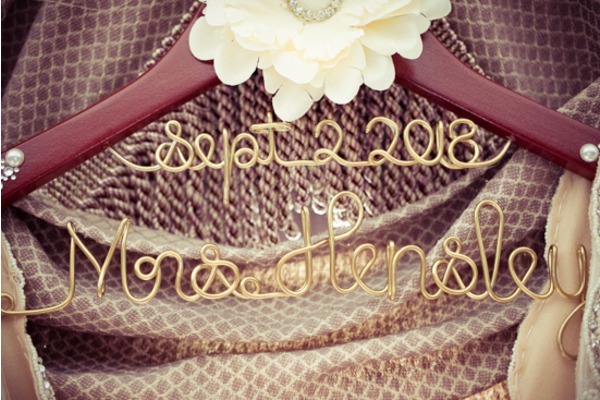 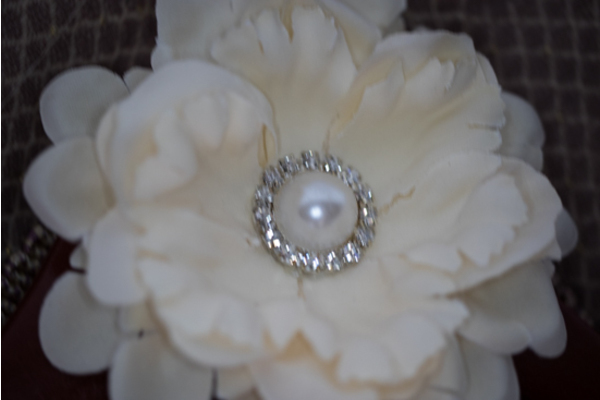 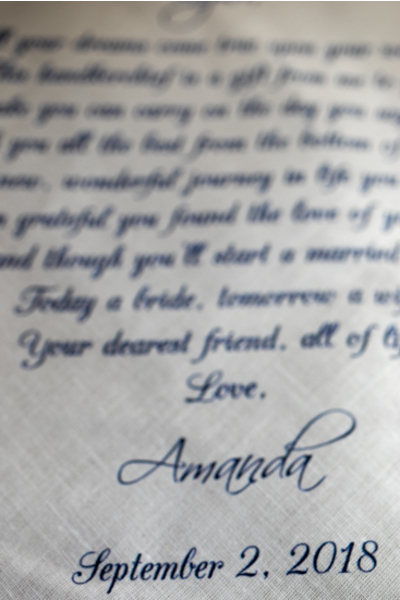 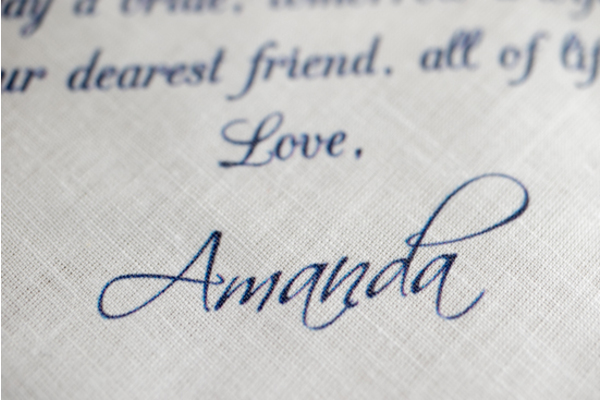 This beautiful, sunny afternoon was just the perfect way to celebrate this memorable day. 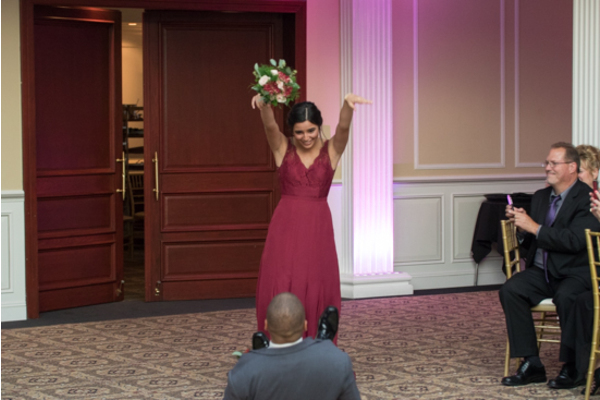 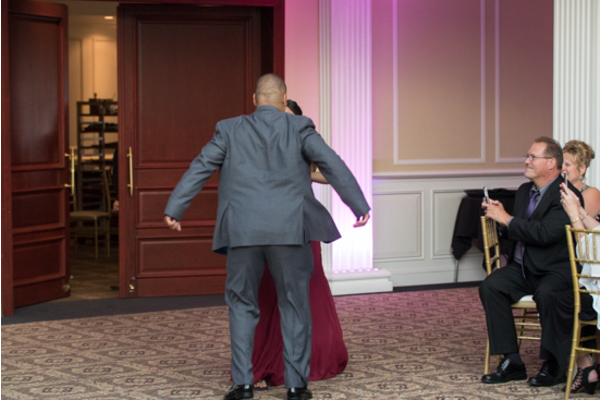 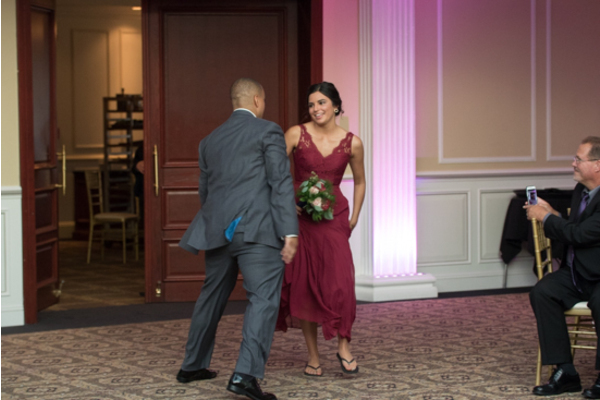 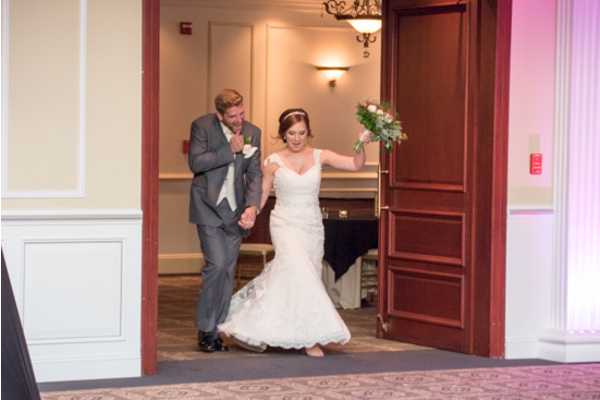 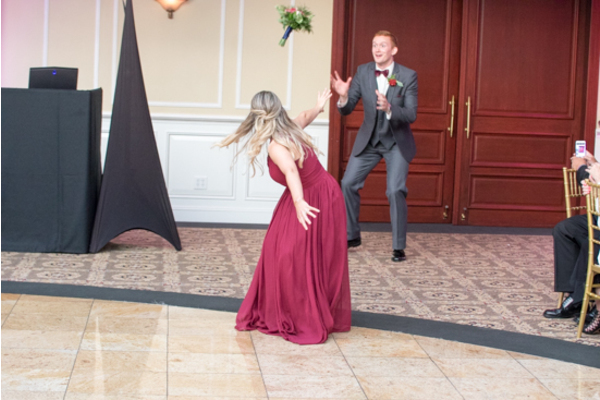 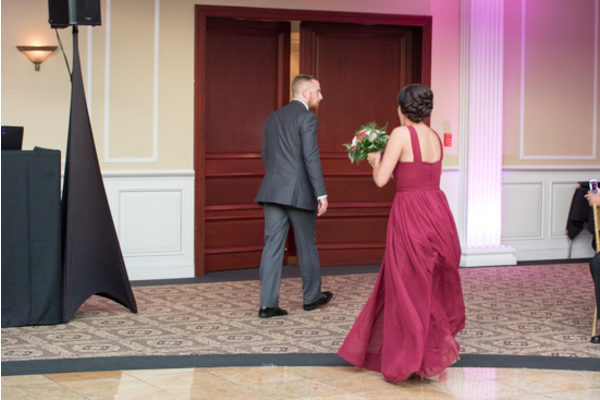 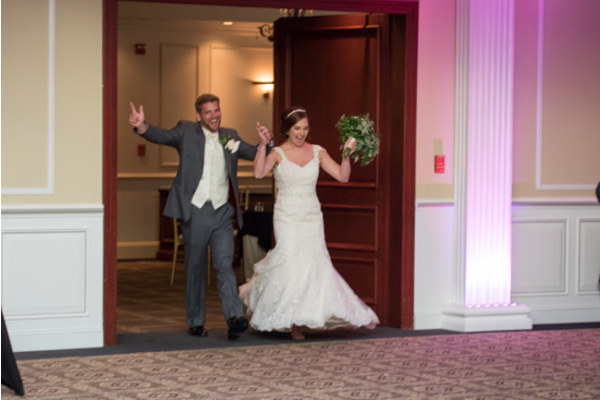 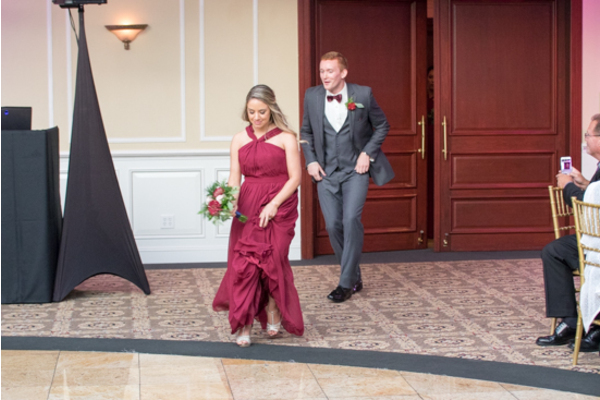 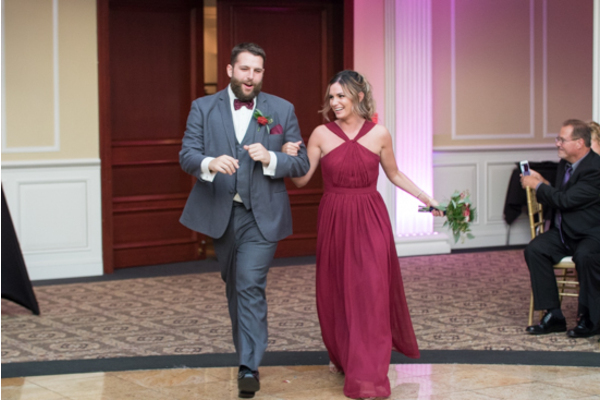 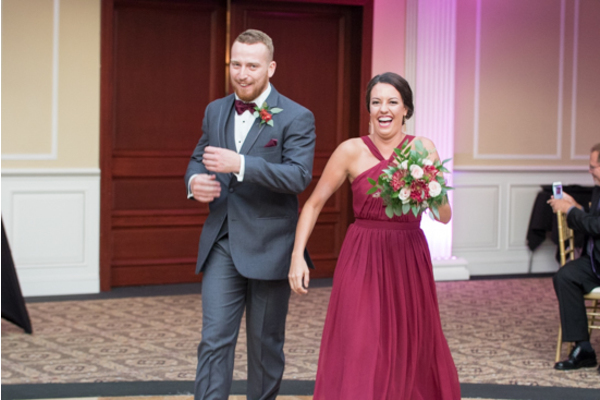 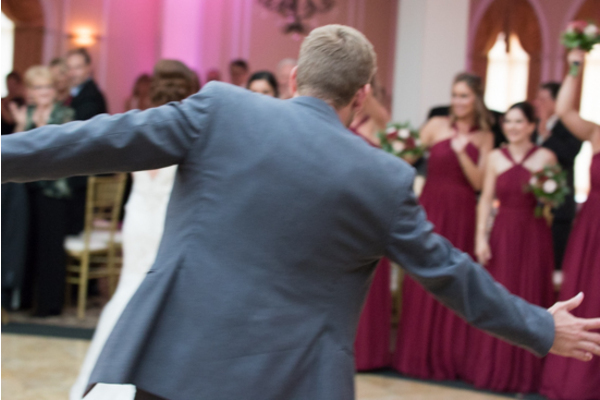 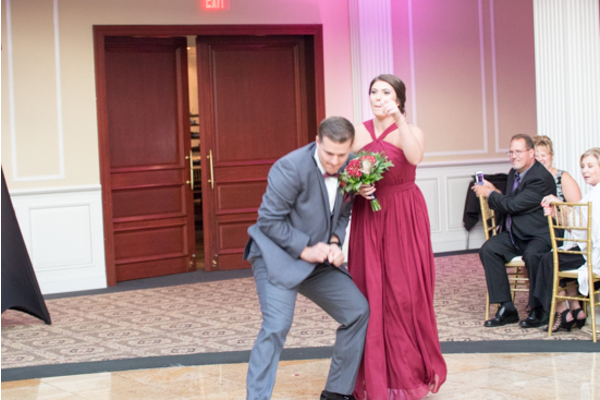 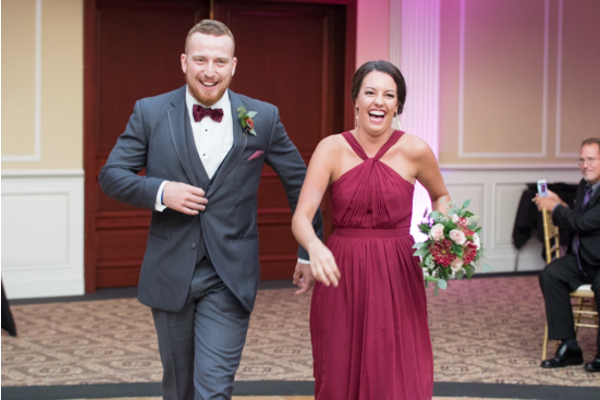 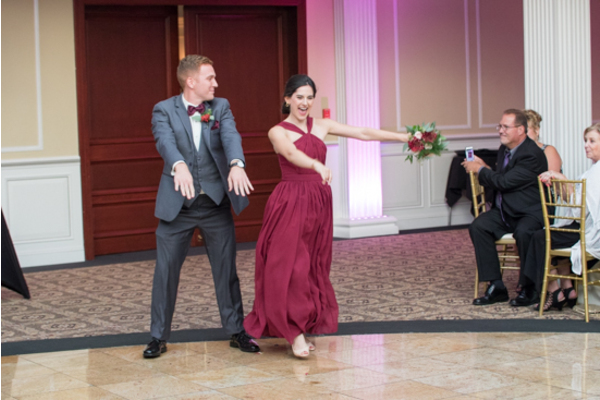 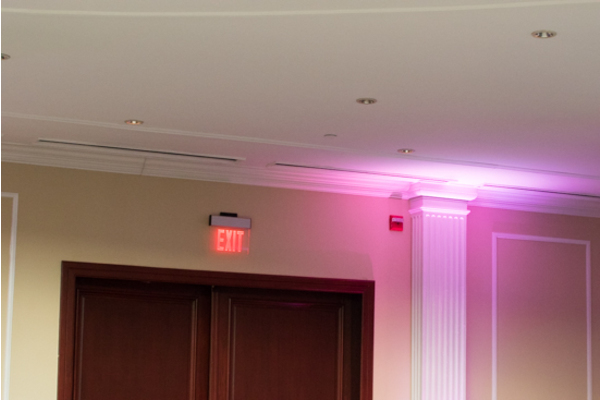 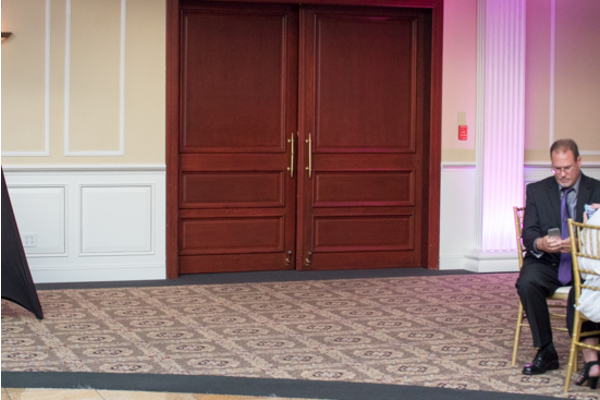 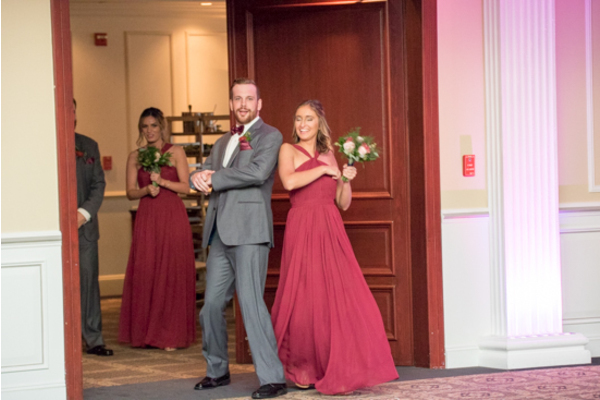 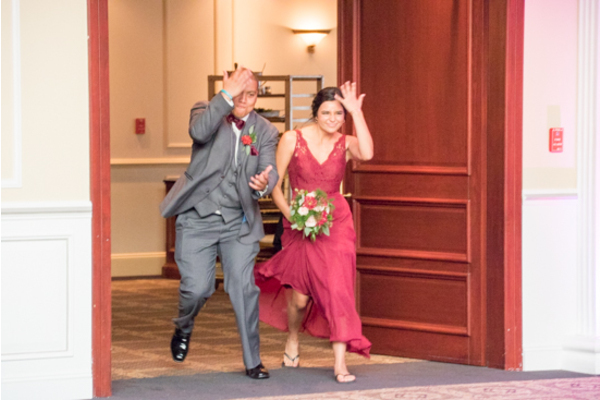 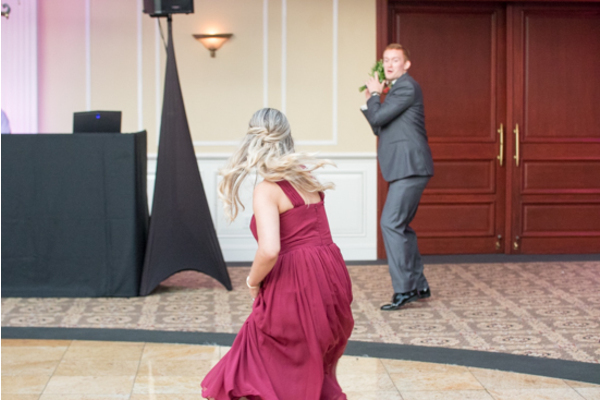 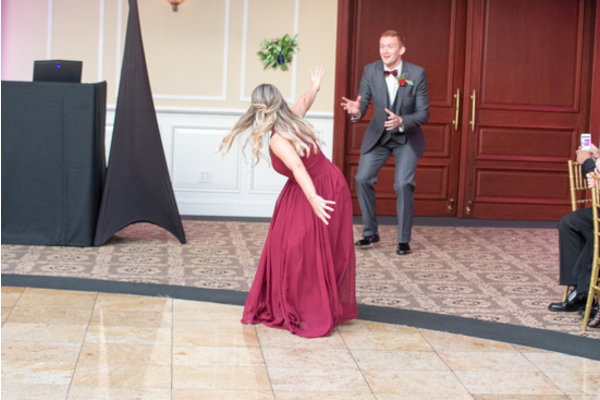 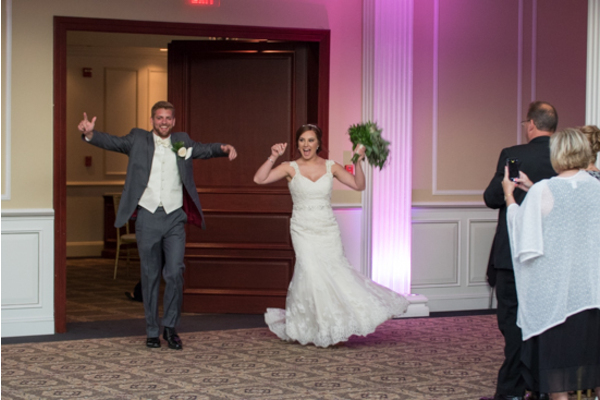 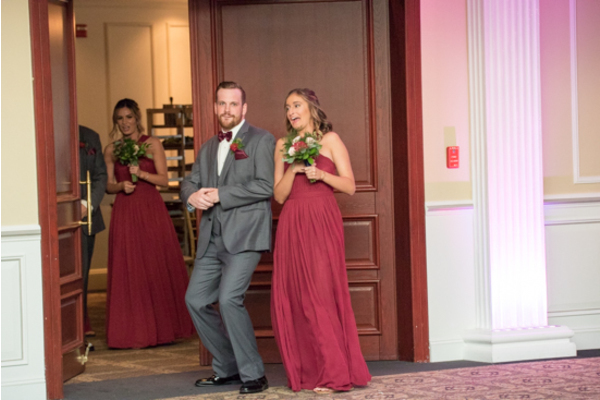 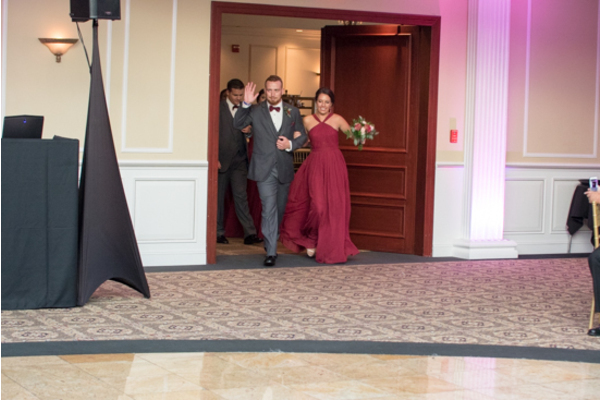 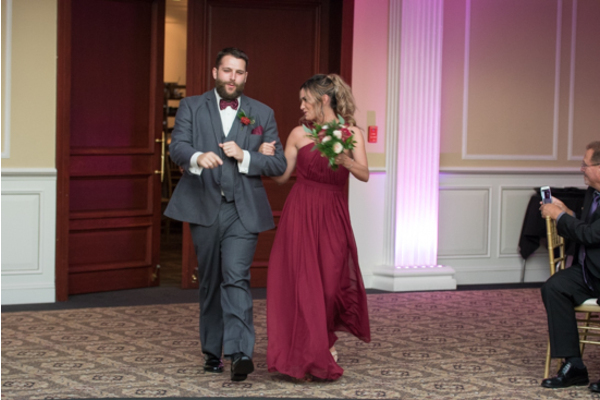 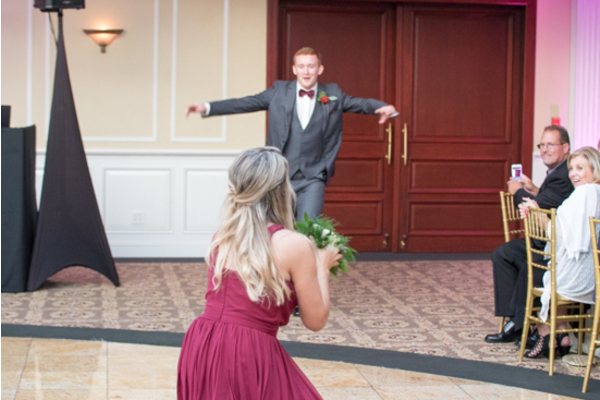 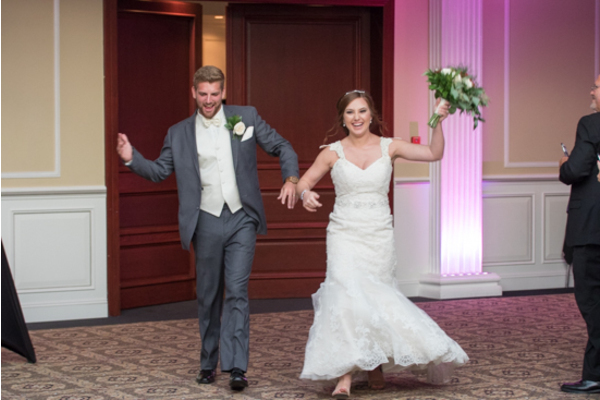 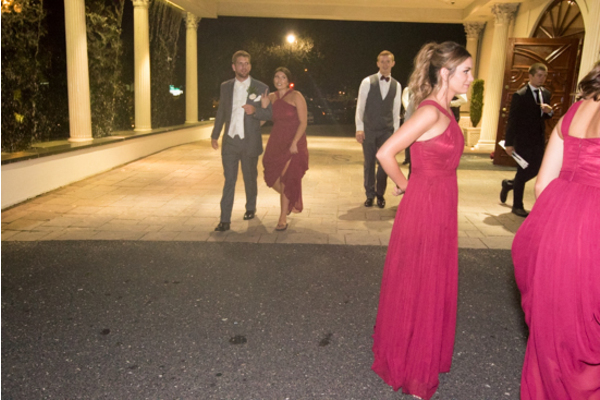 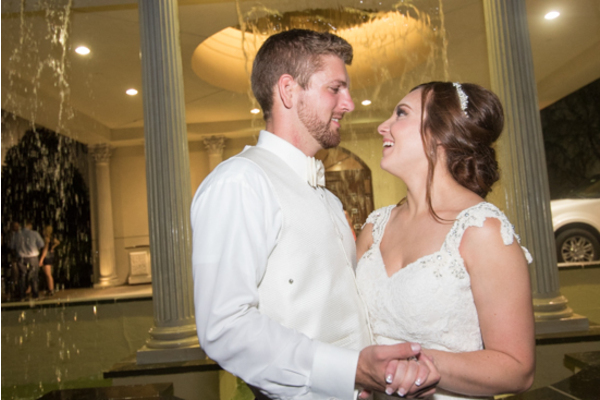 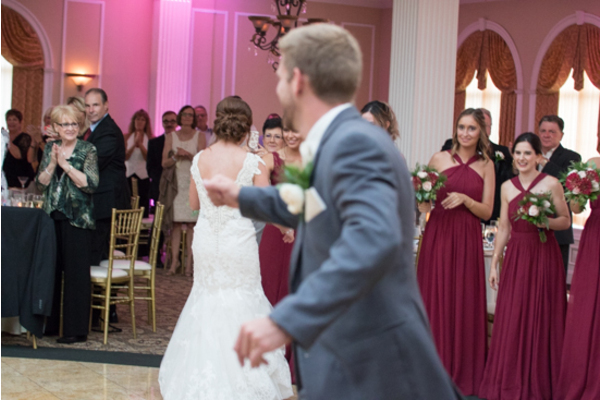 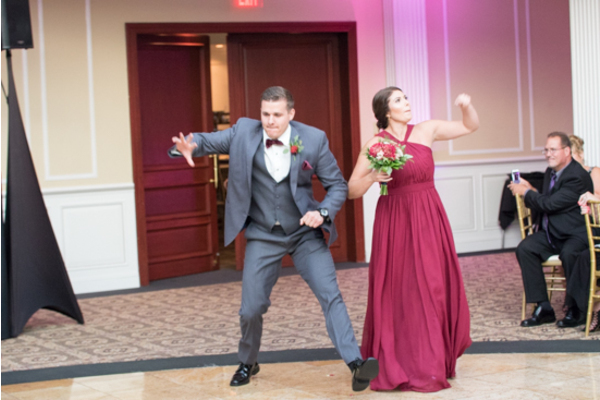 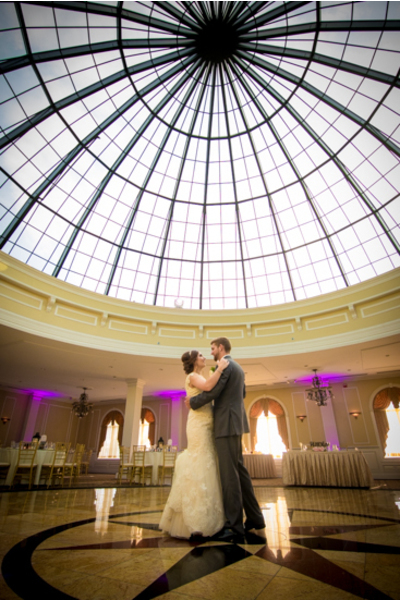 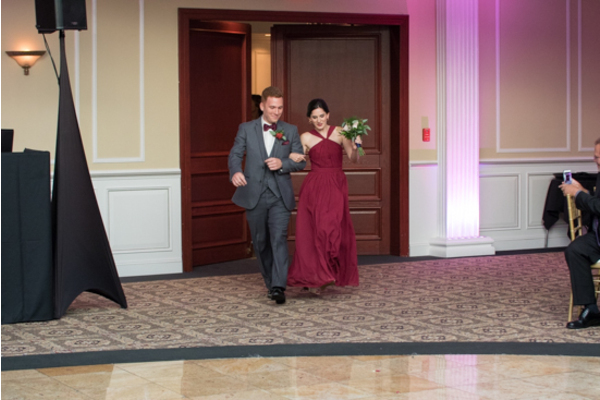 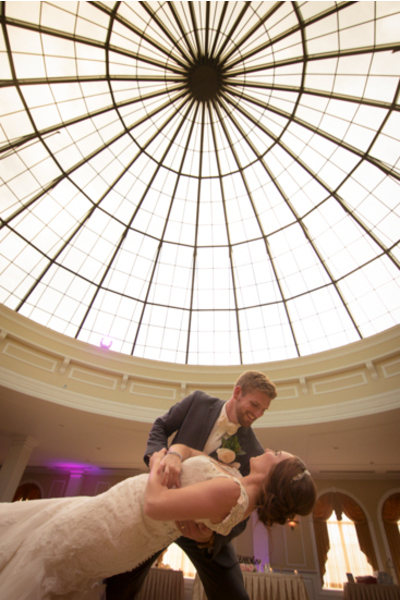 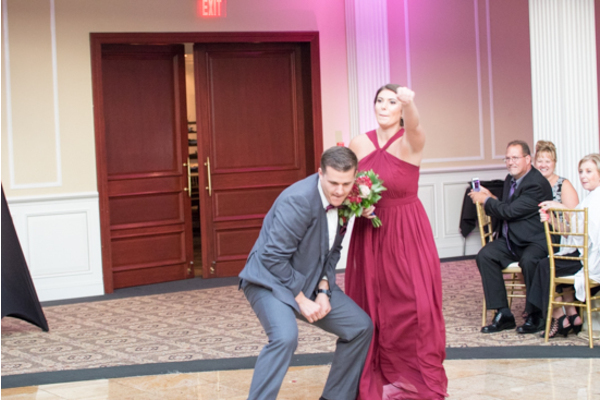 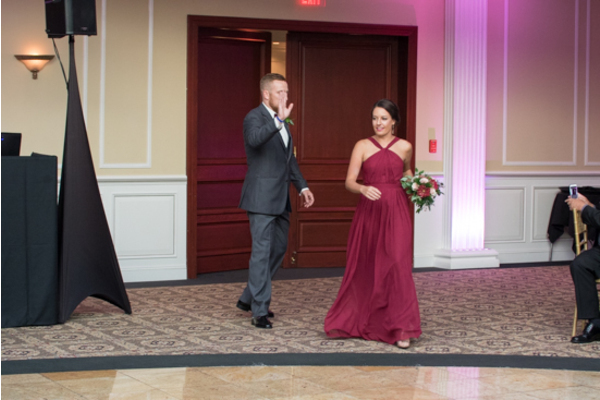 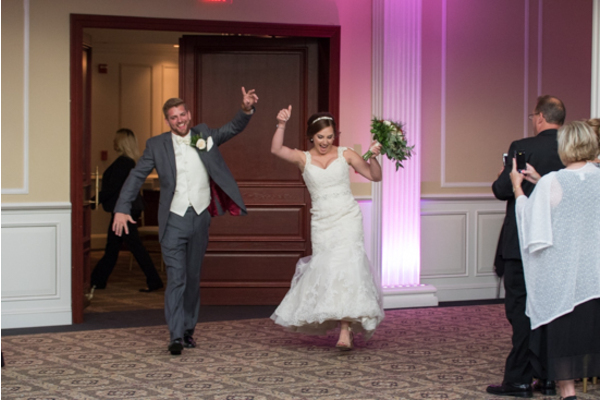 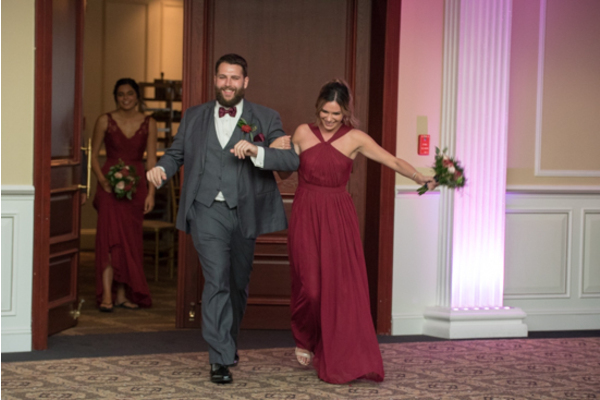 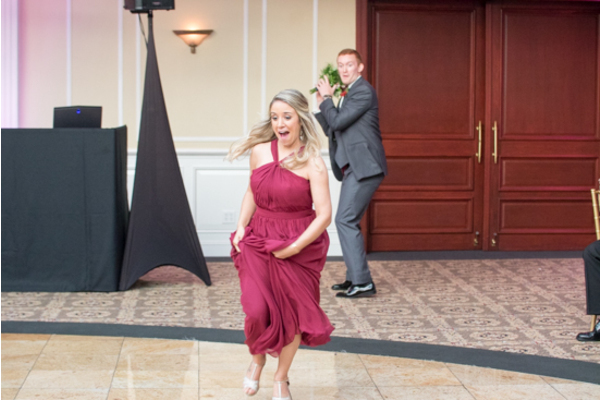 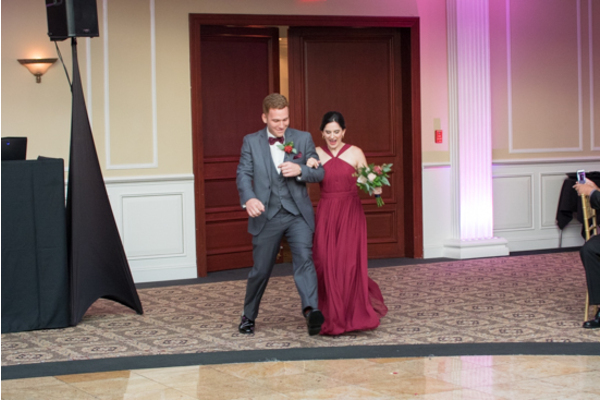 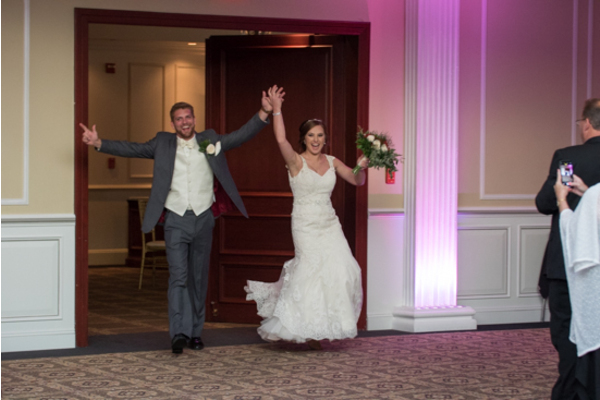 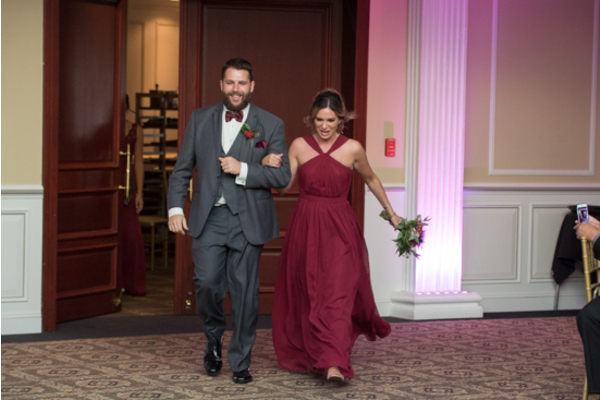 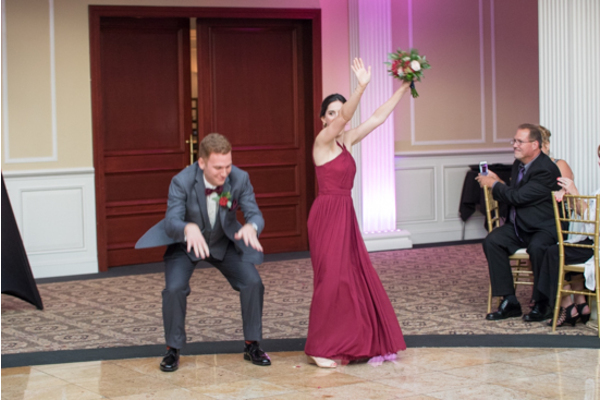 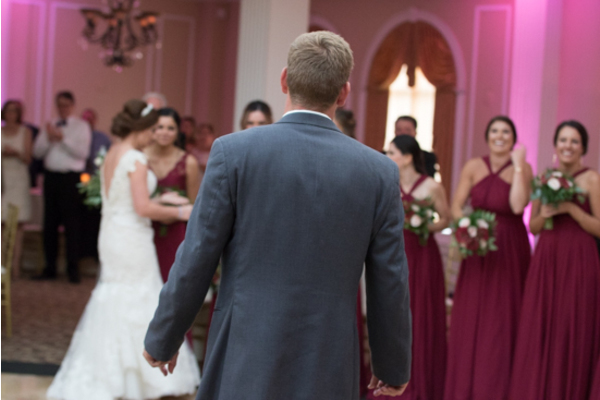 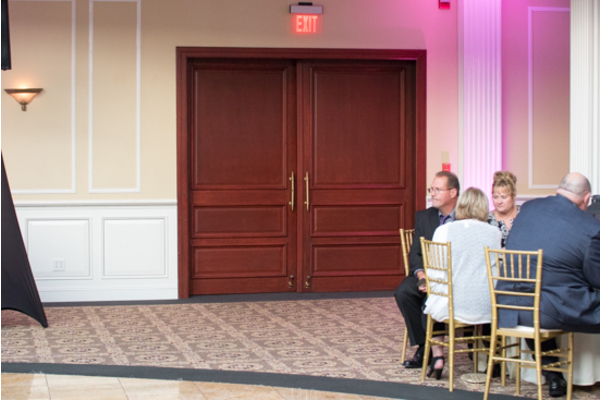 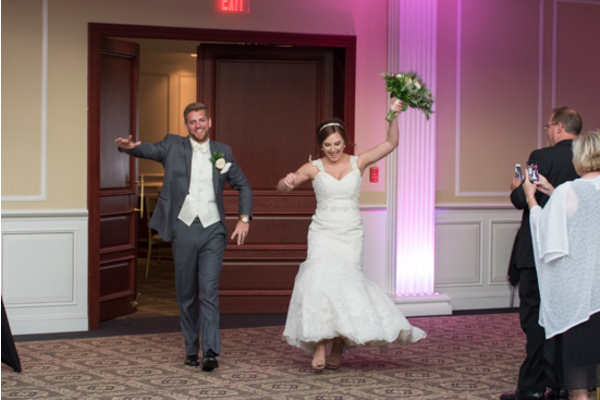 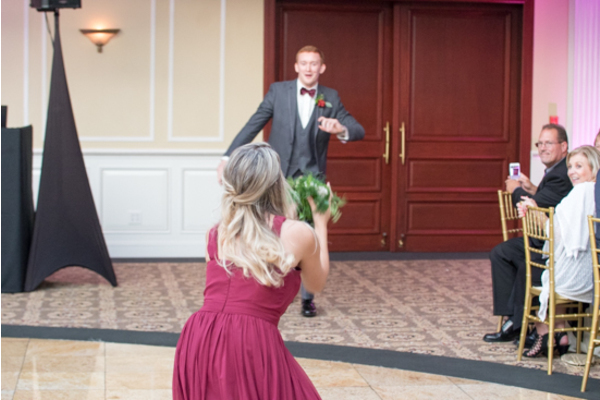 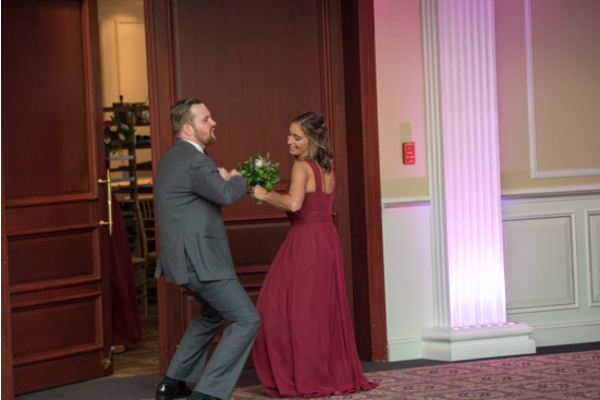 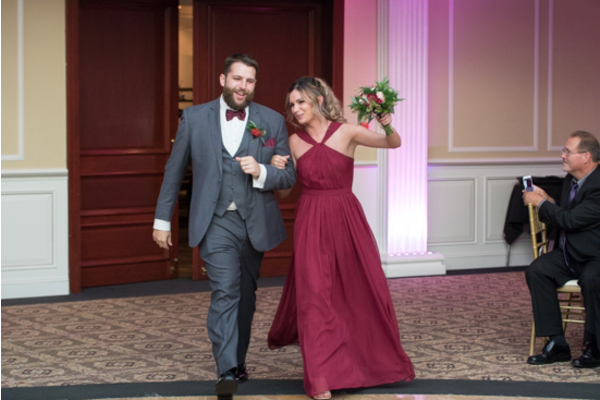 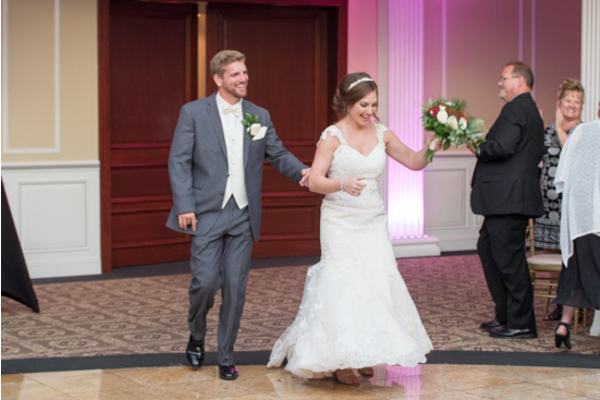 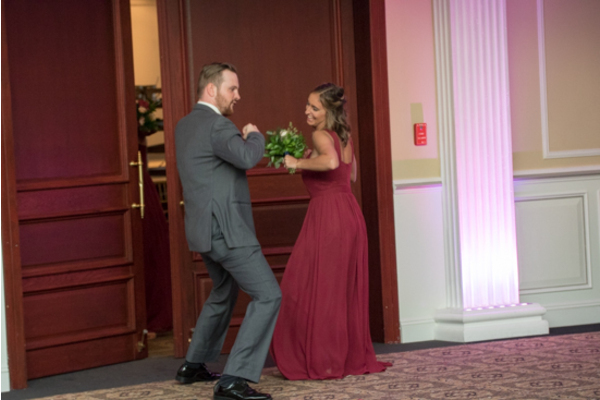 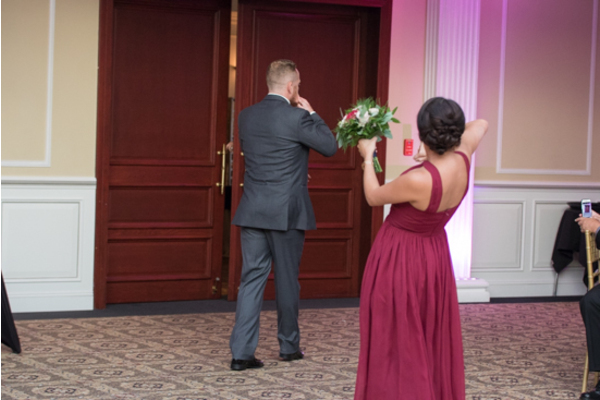 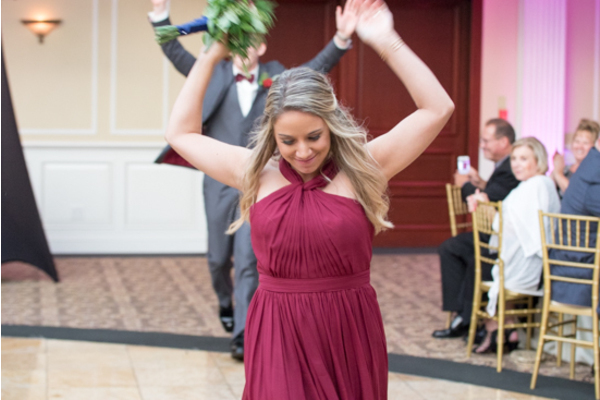 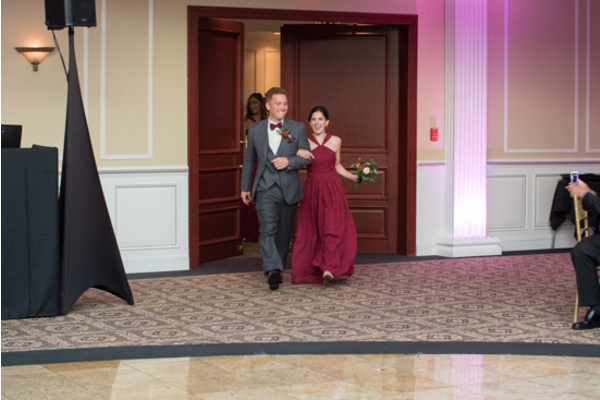 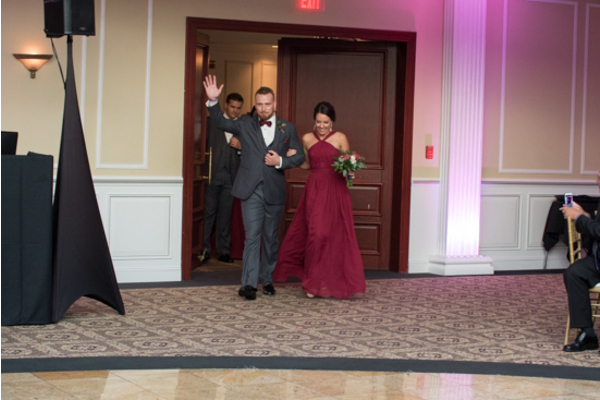 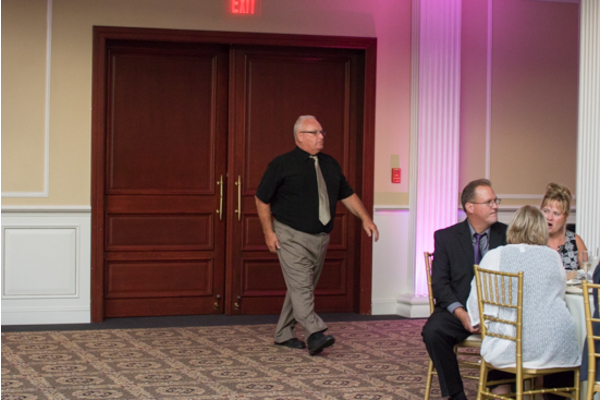 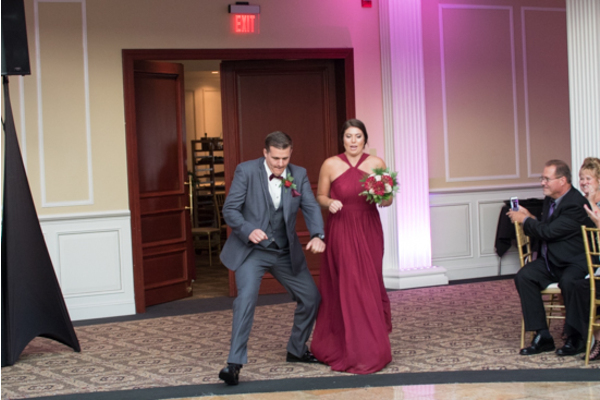 As they arrived at the reception, our NJ Wedding Photographer took incredible photos of the couple twirling around in a gorgeous ballroom. 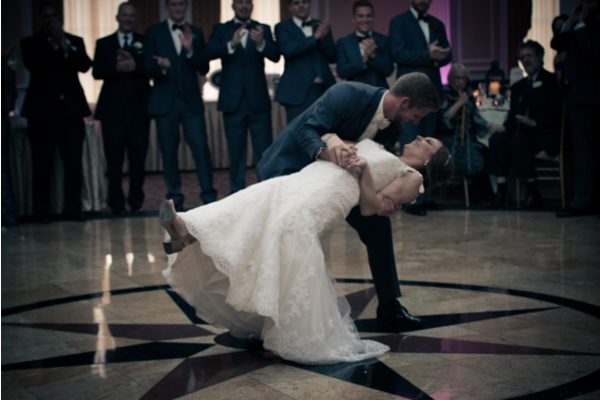 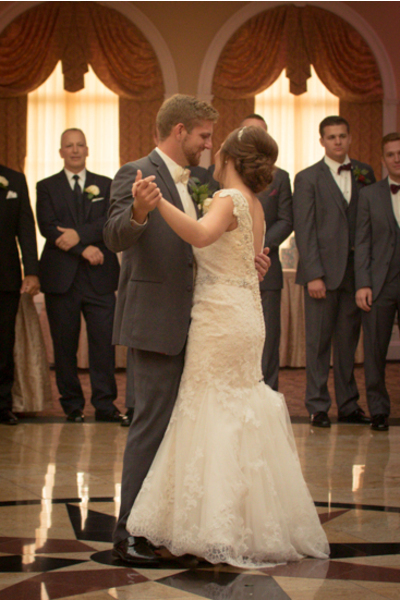 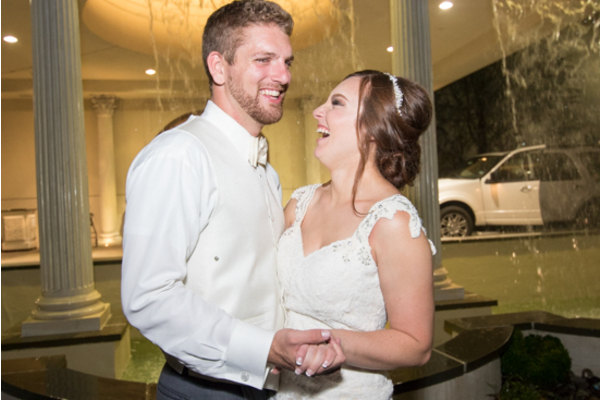 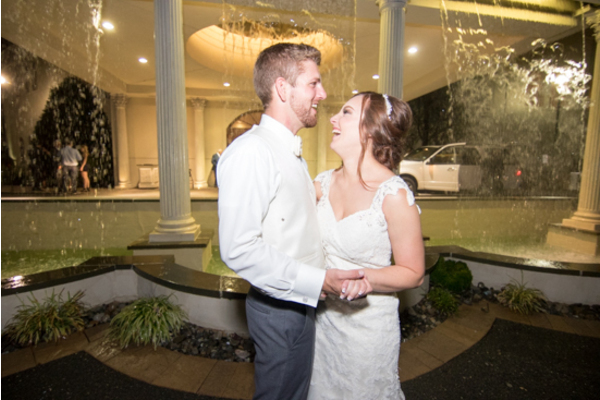 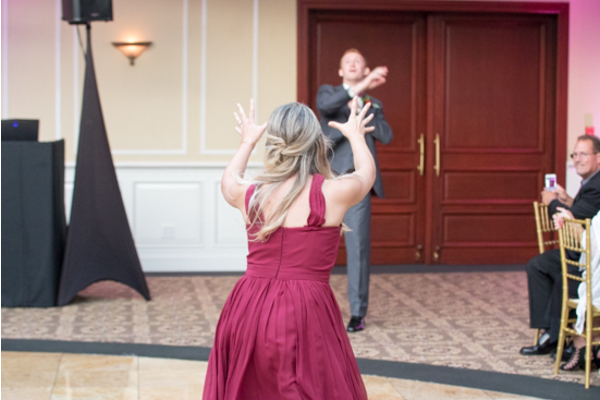 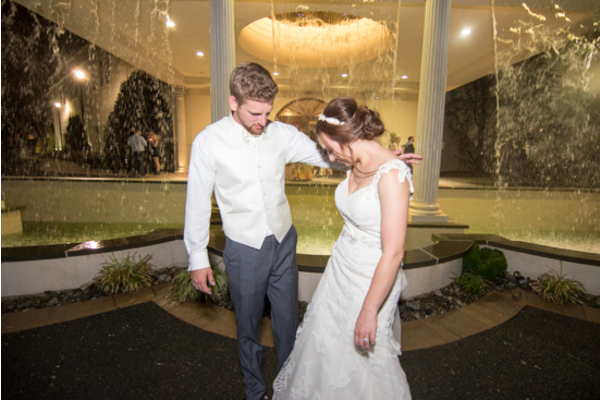 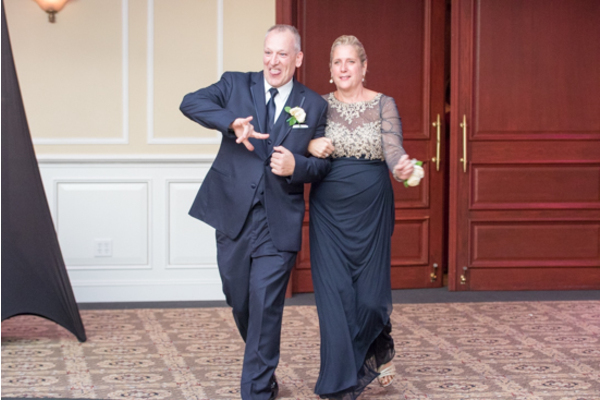 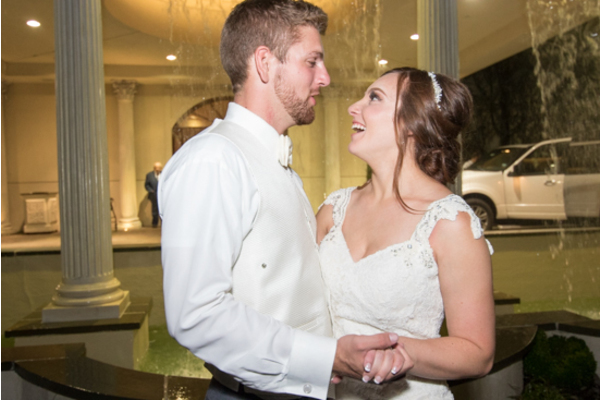 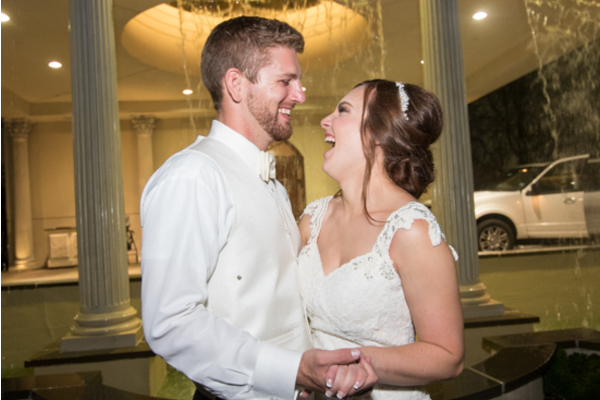 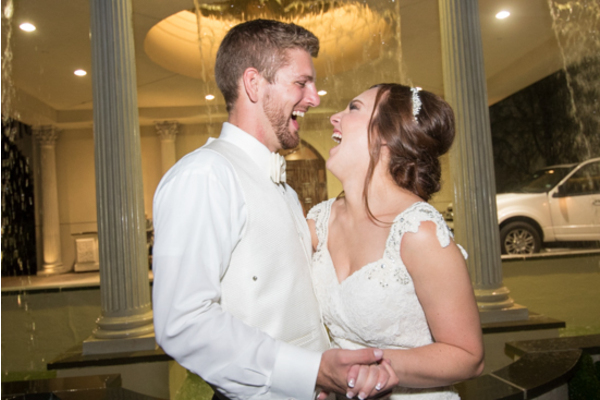 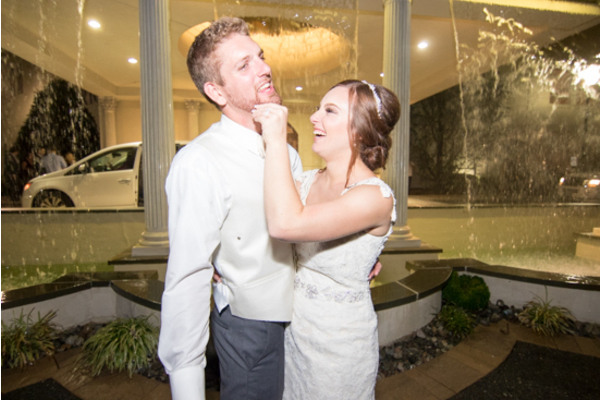 The rest of the evening was enjoyed with lots of dancing, laughter and love that will last a lifetime! 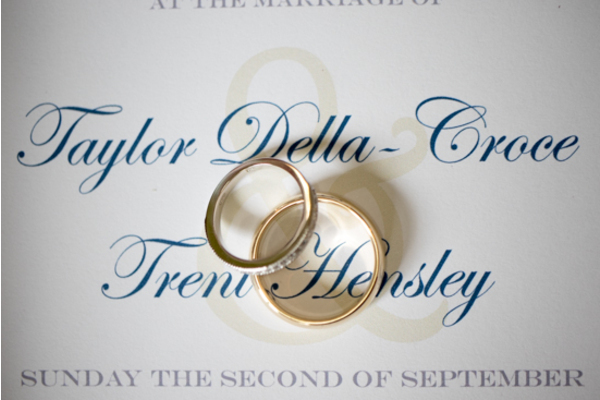 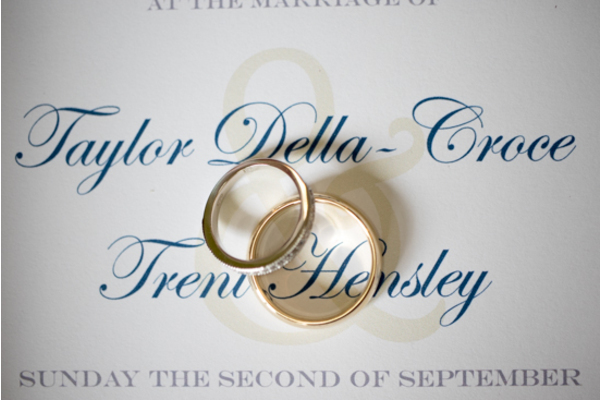 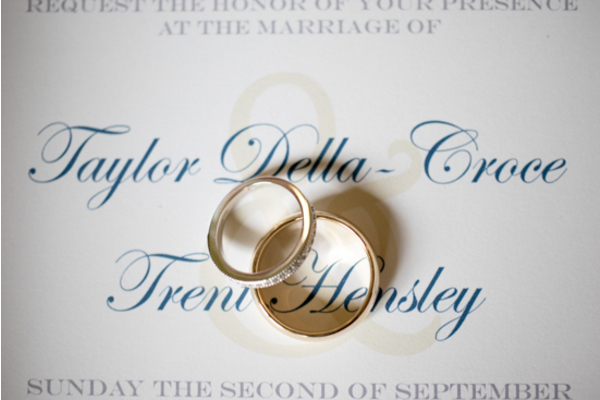 Congratulations again to Taylor and Trent! 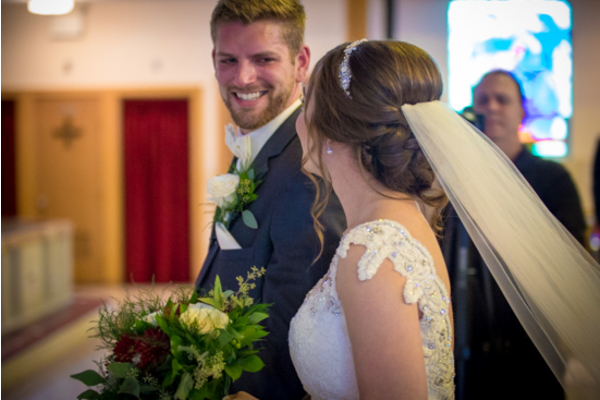 We wish you a lifetime of happiness, health and love!